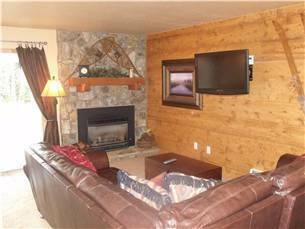 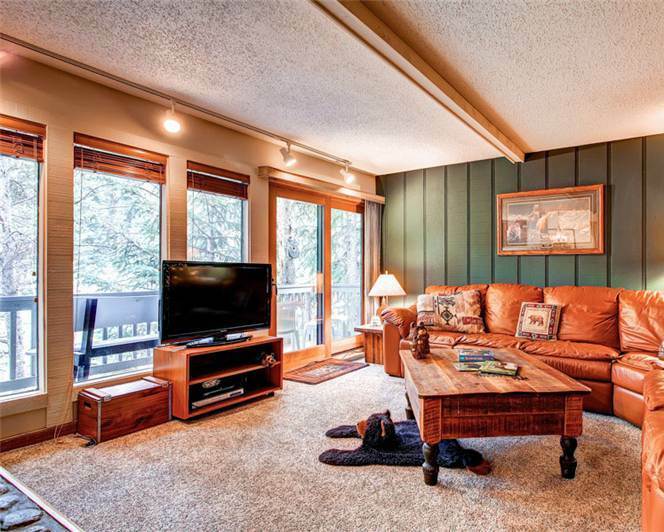 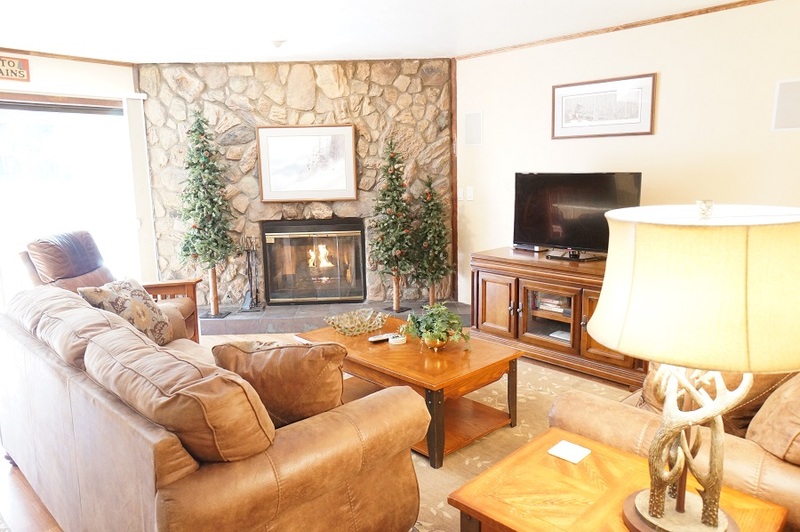 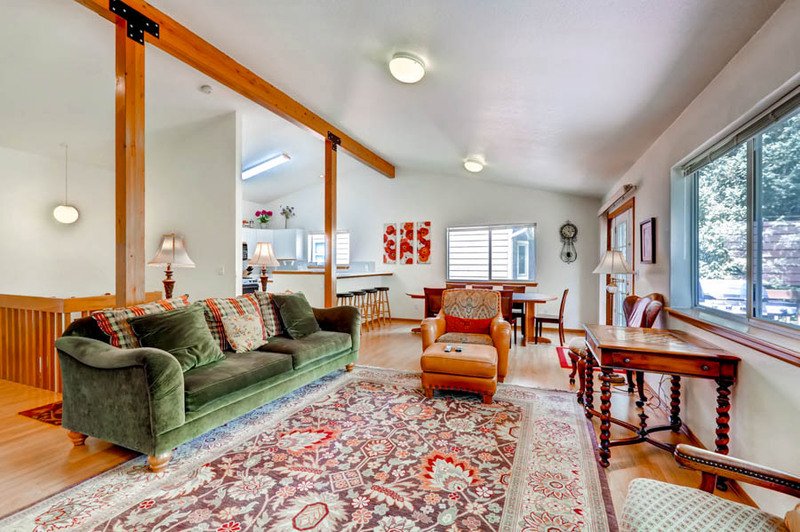 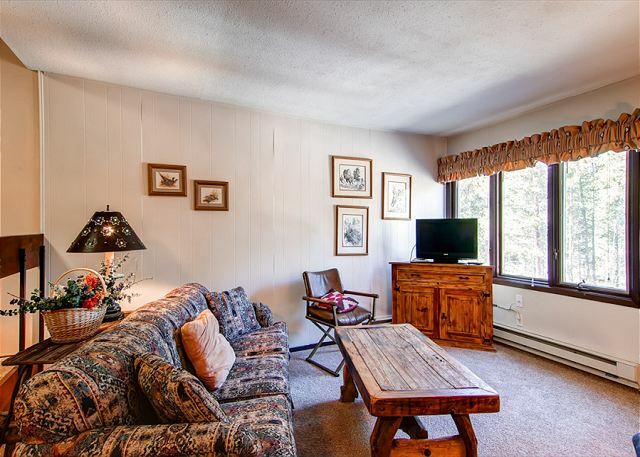 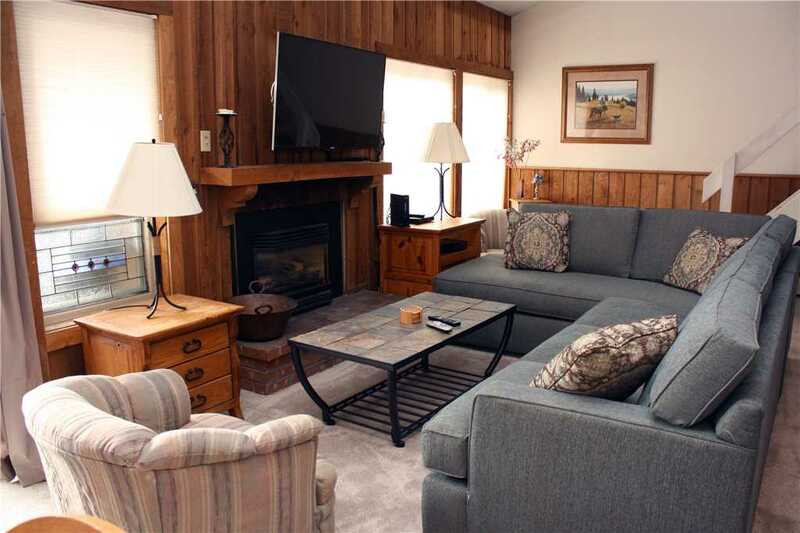 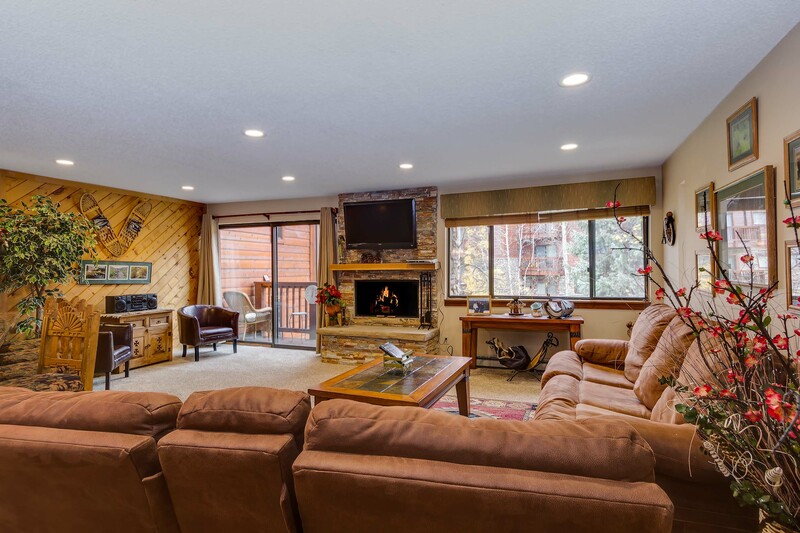 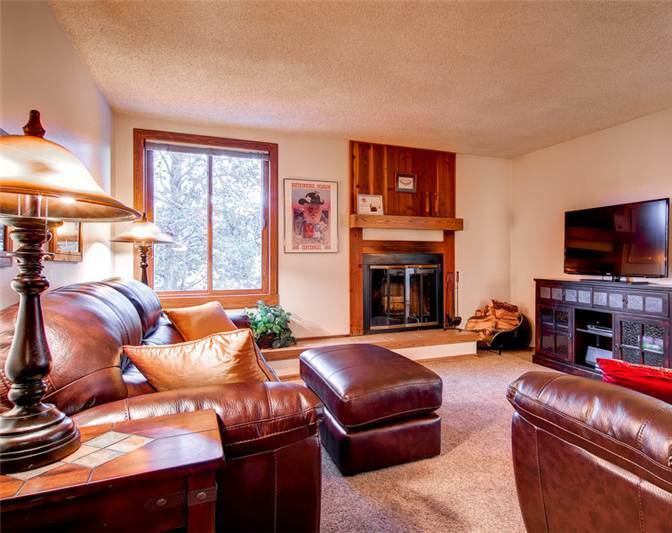 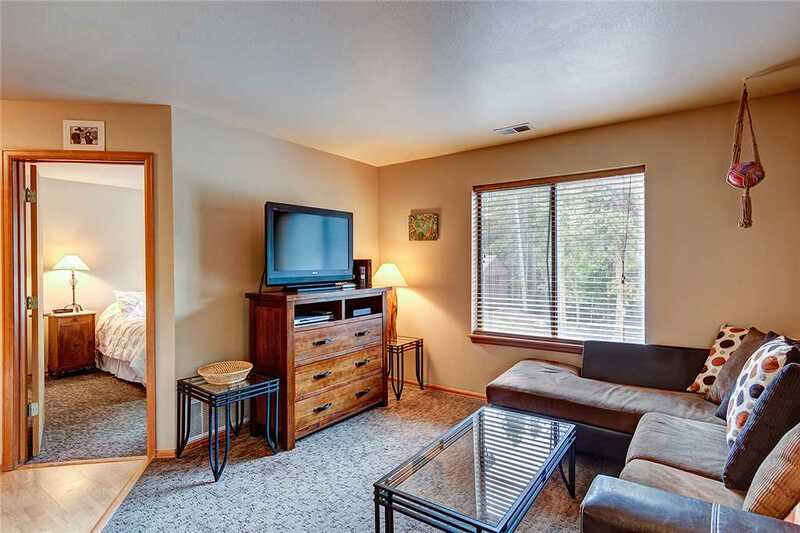 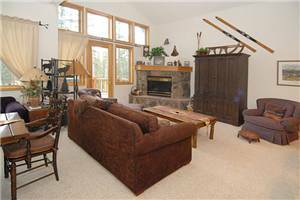 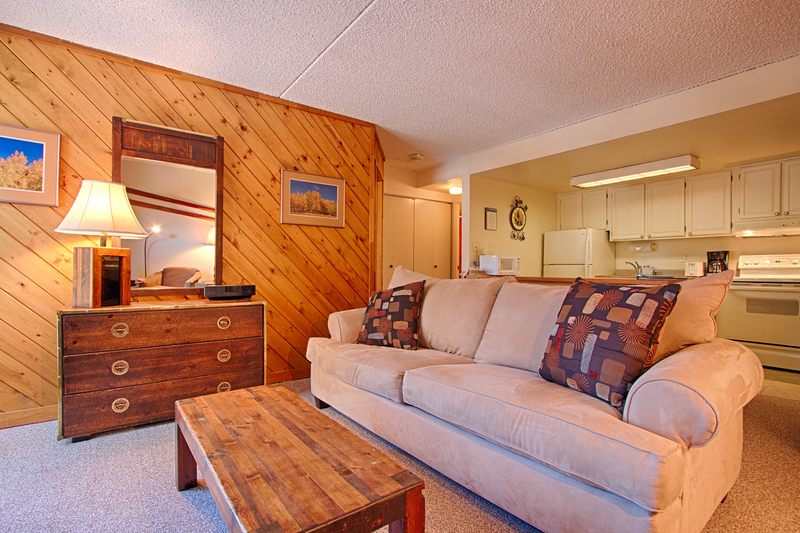 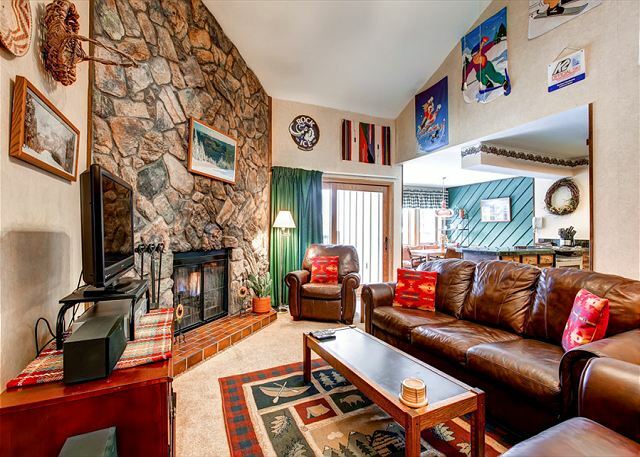 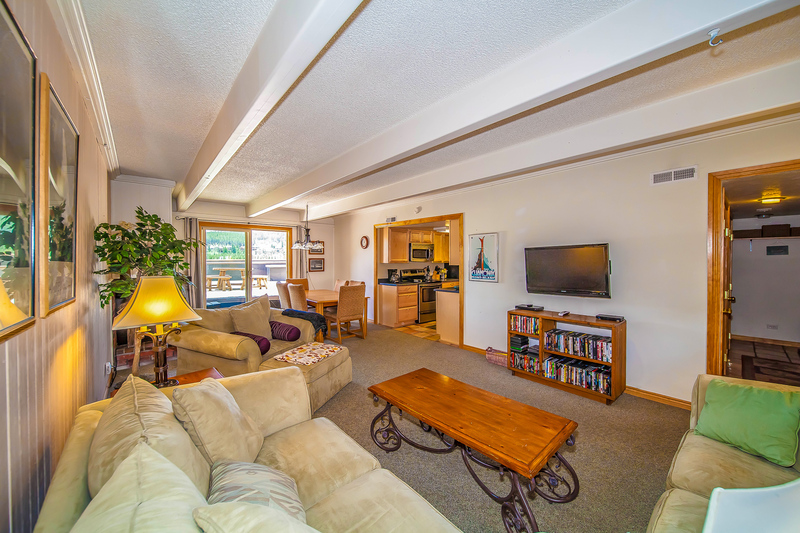 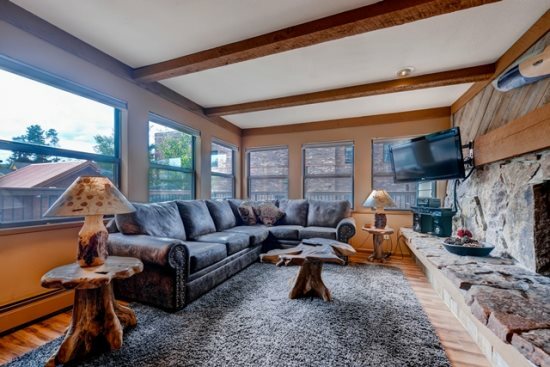 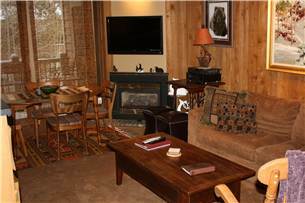 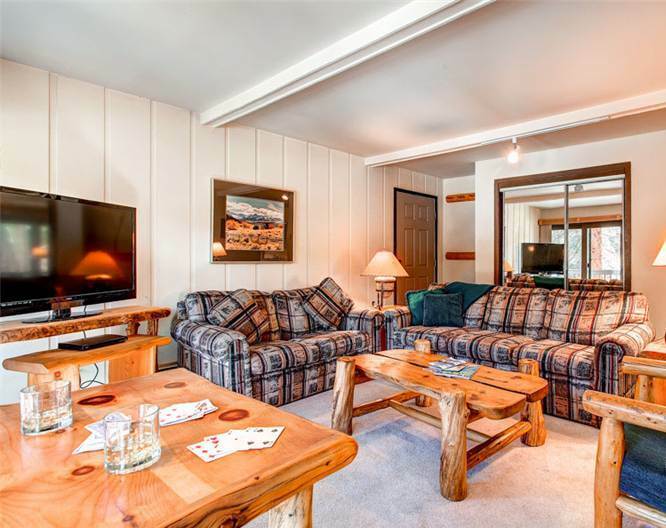 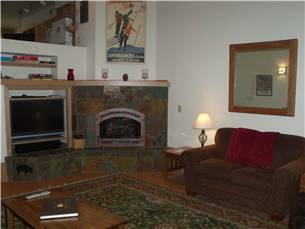 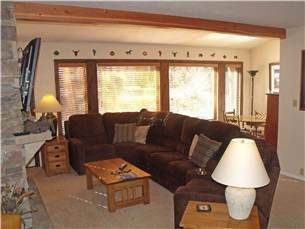 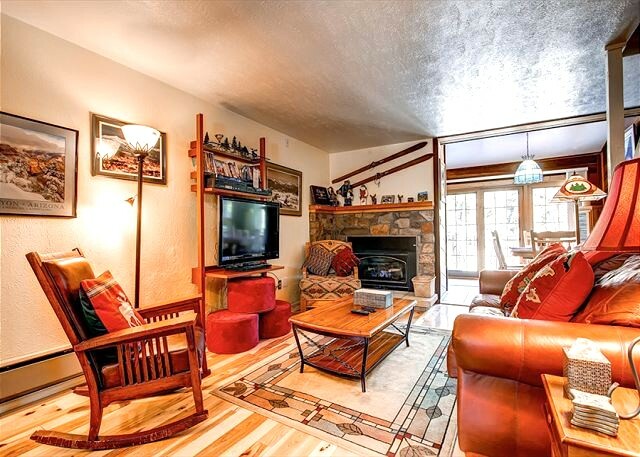 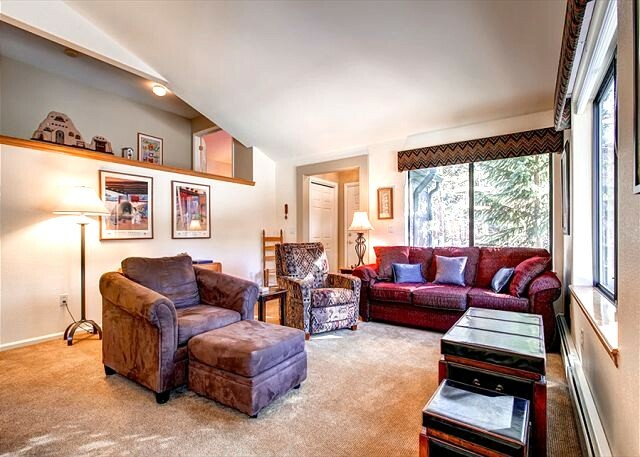 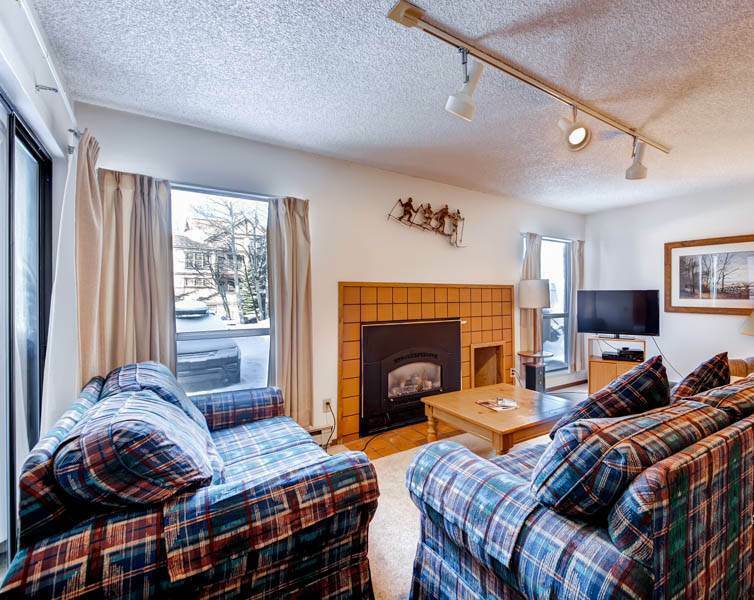 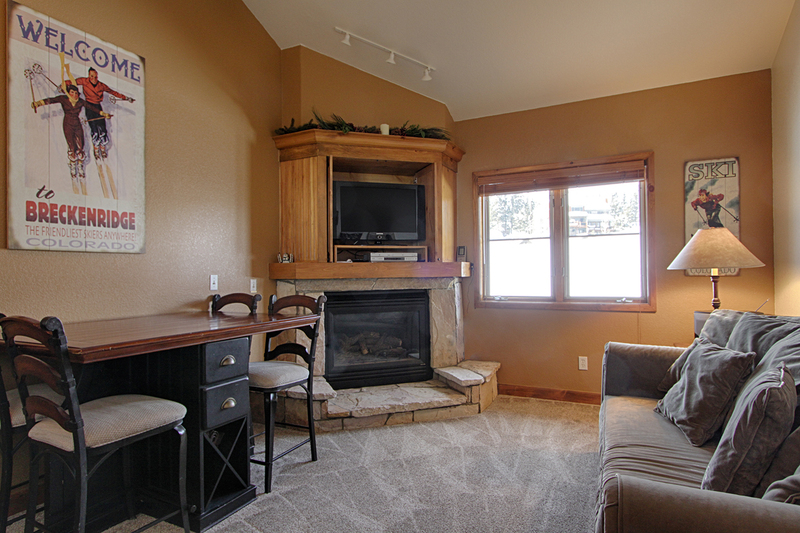 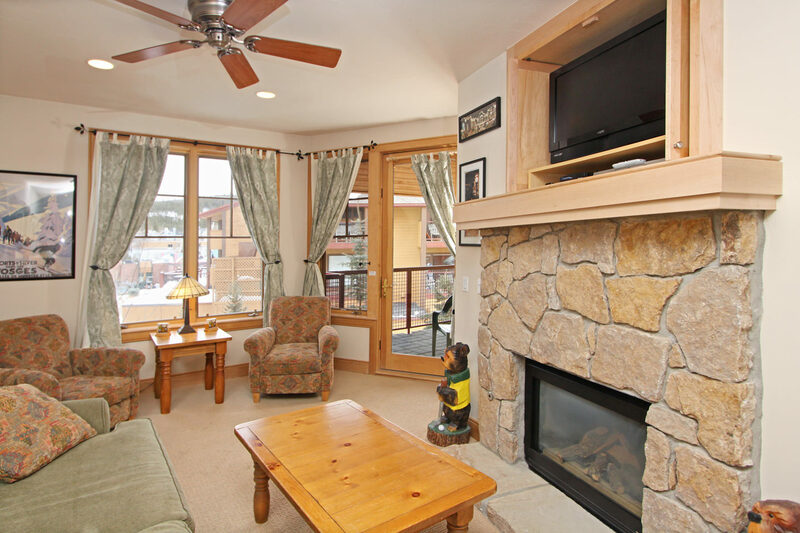 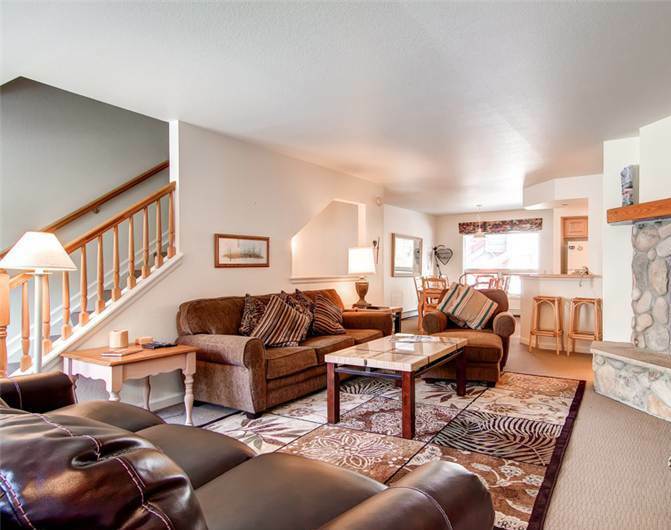 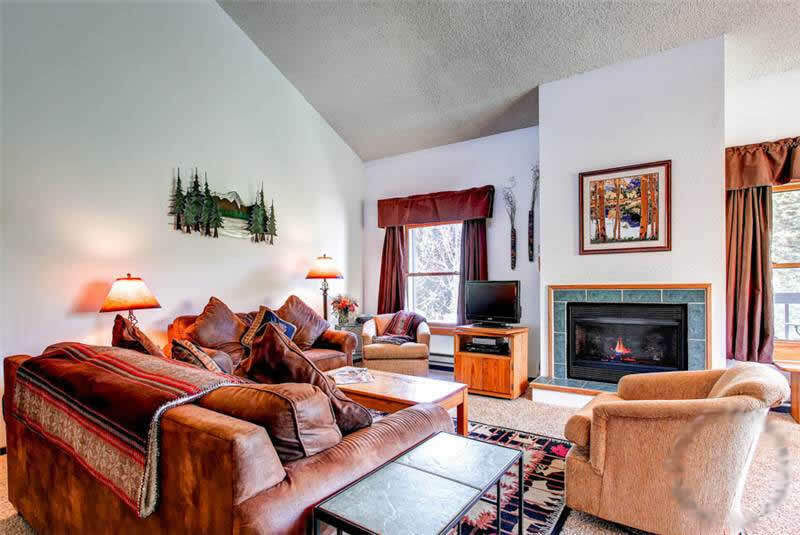 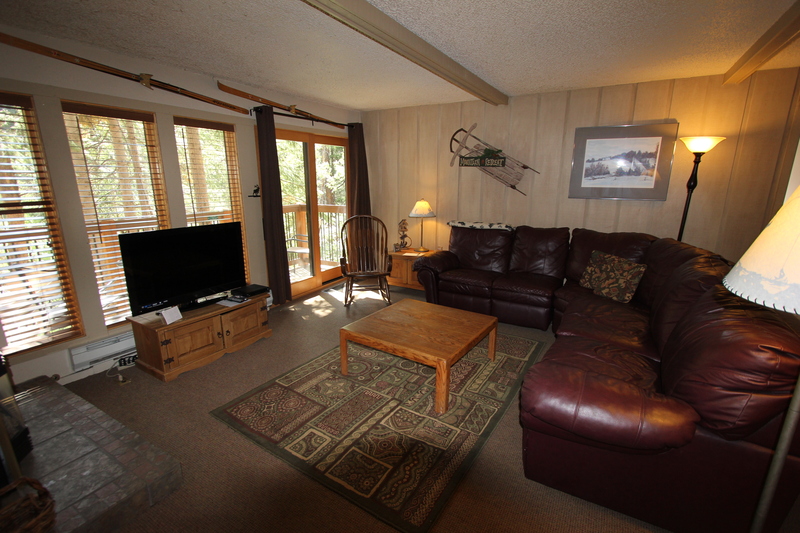 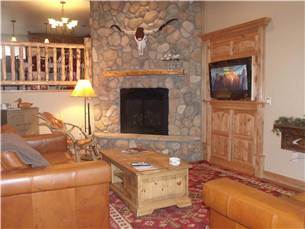 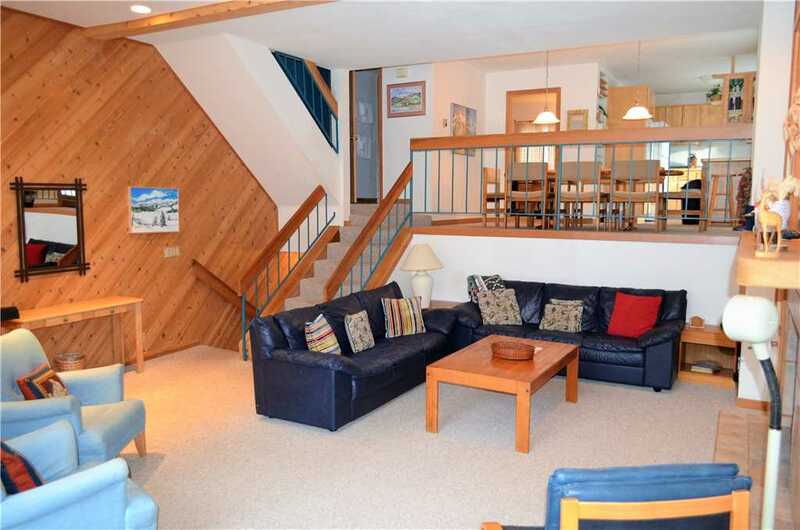 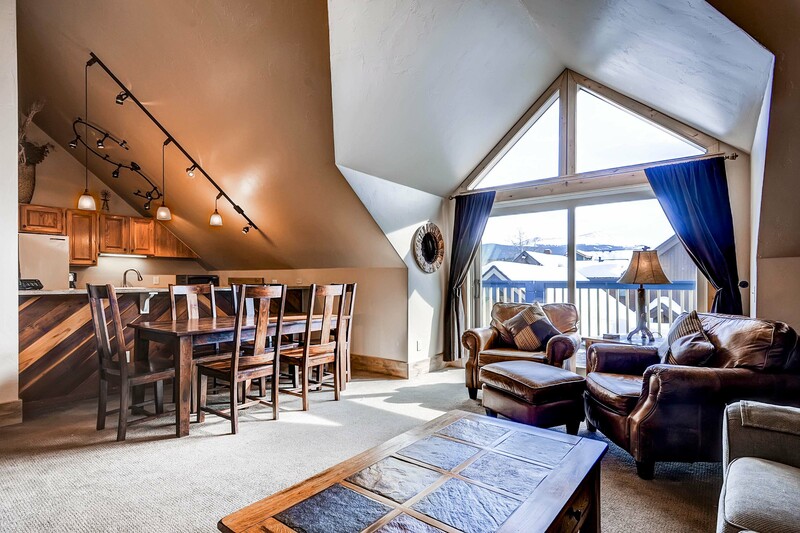 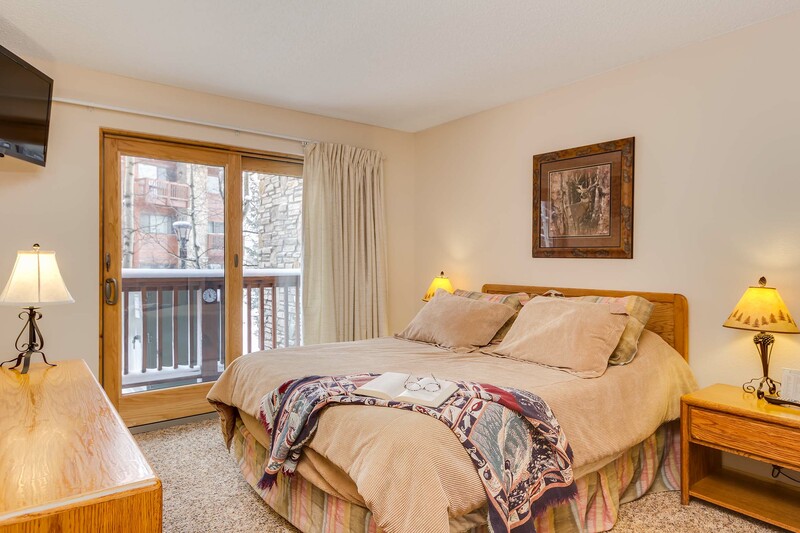 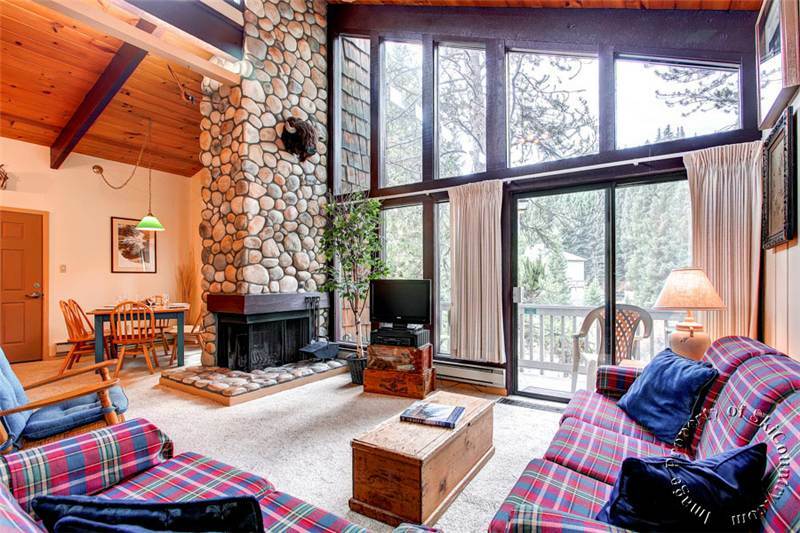 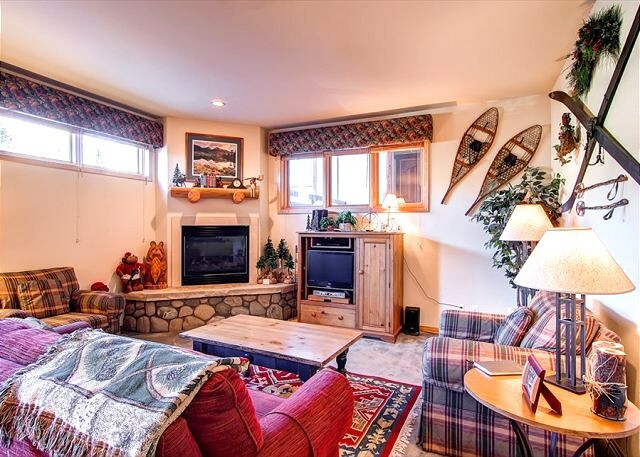 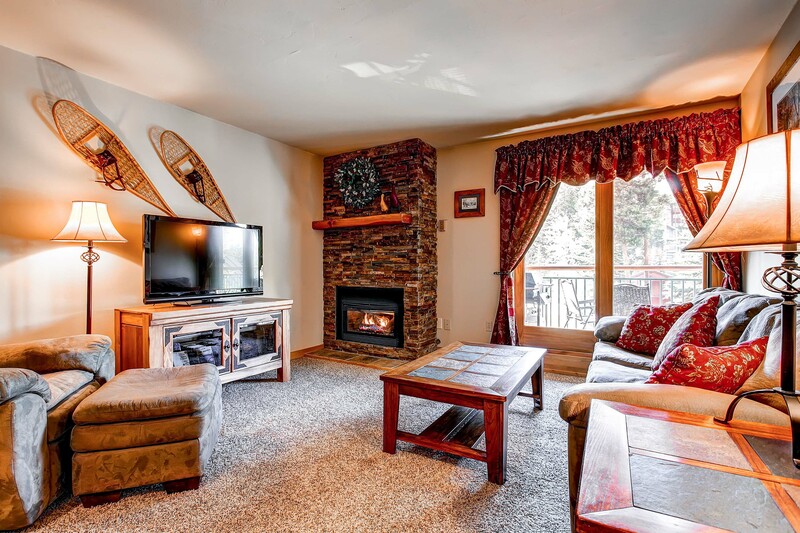 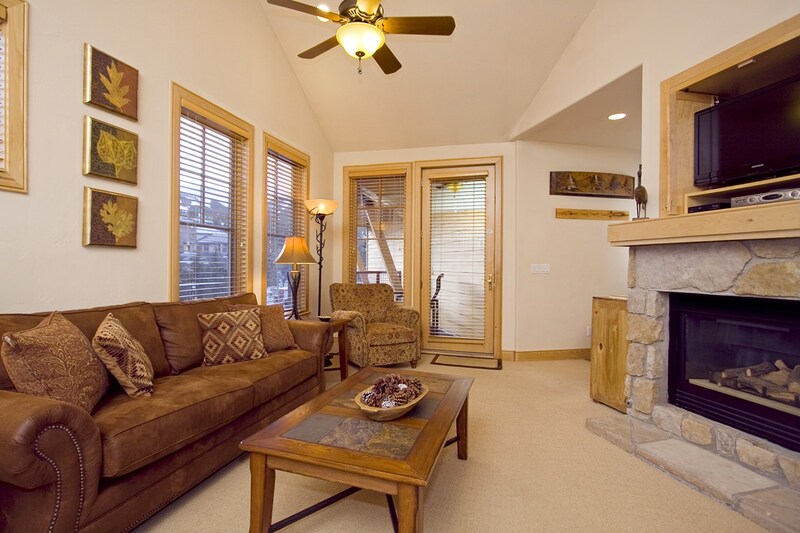 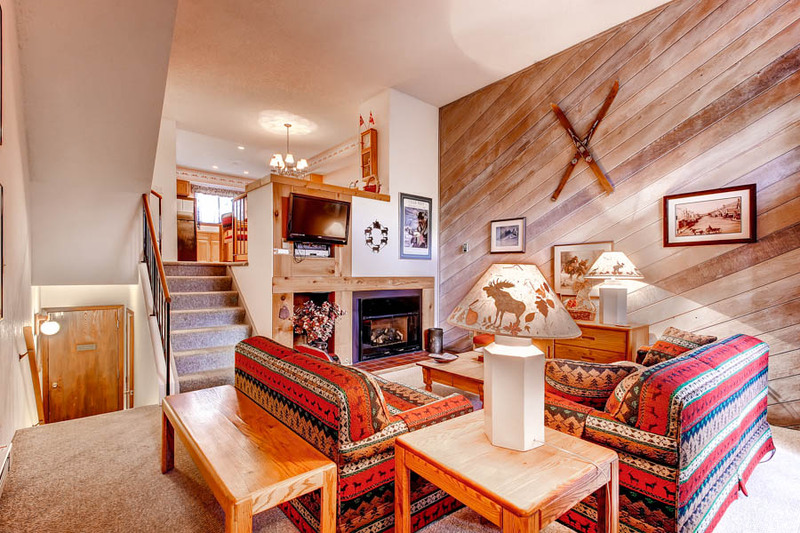 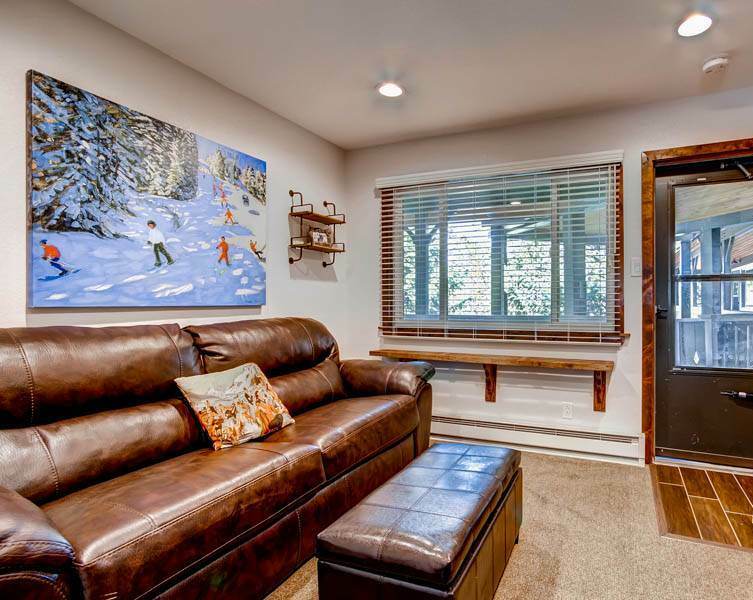 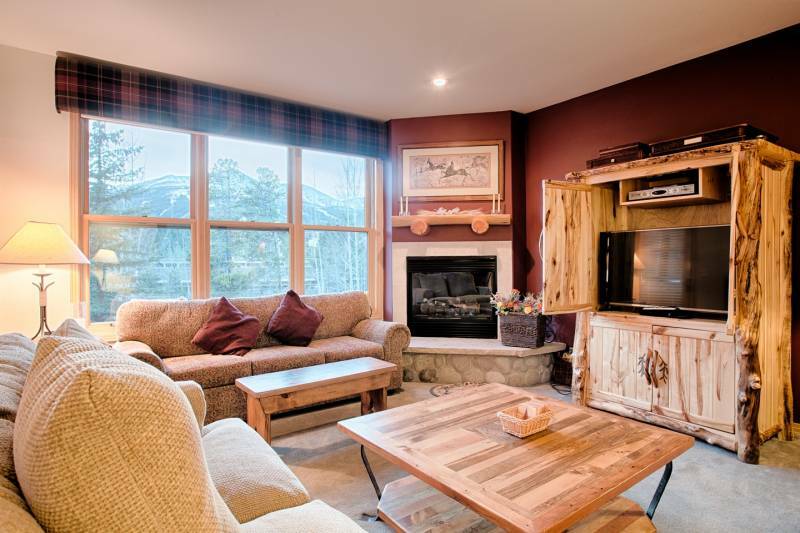 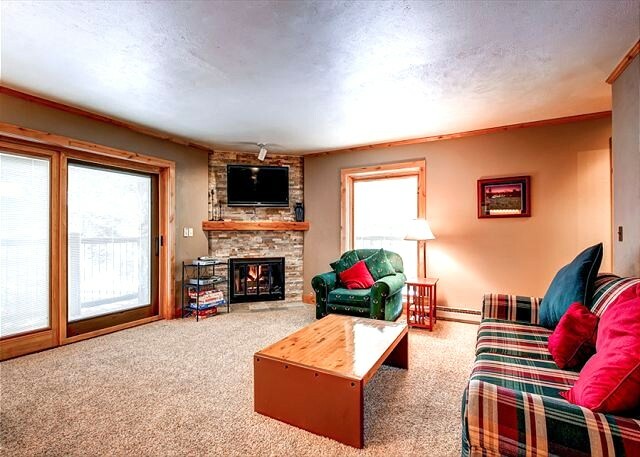 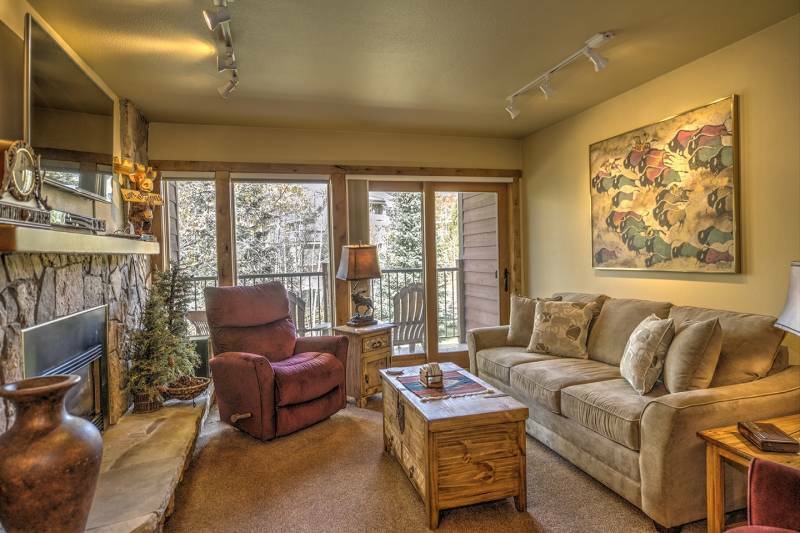 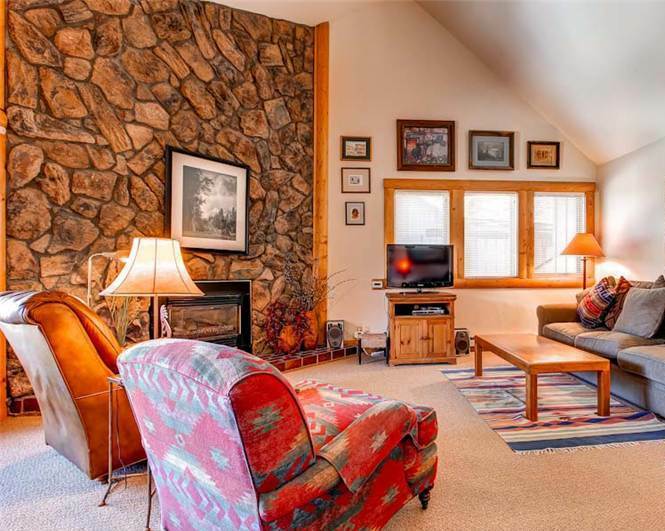 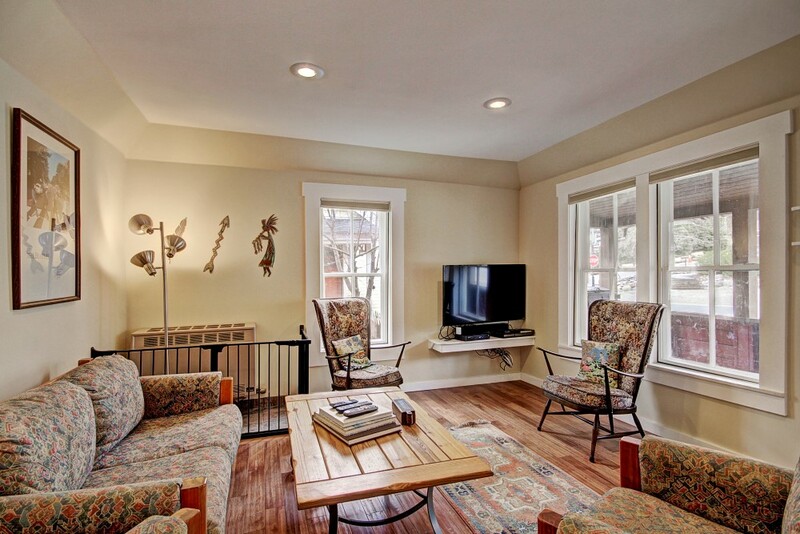 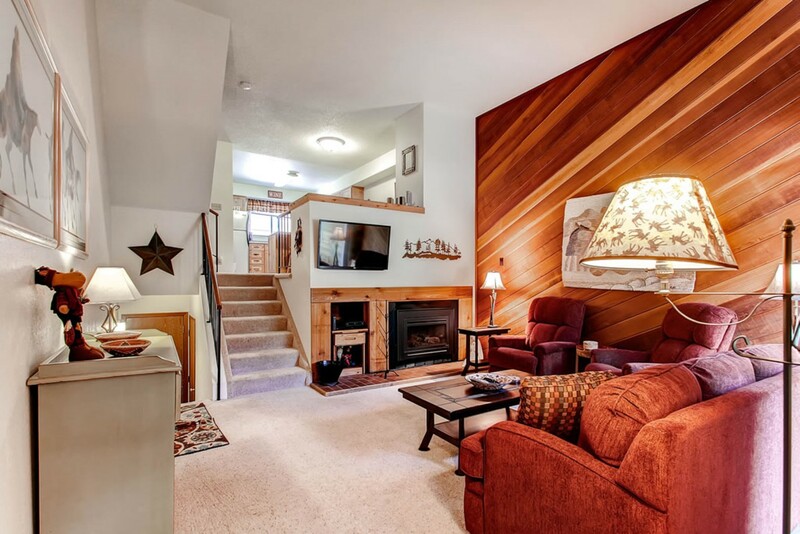 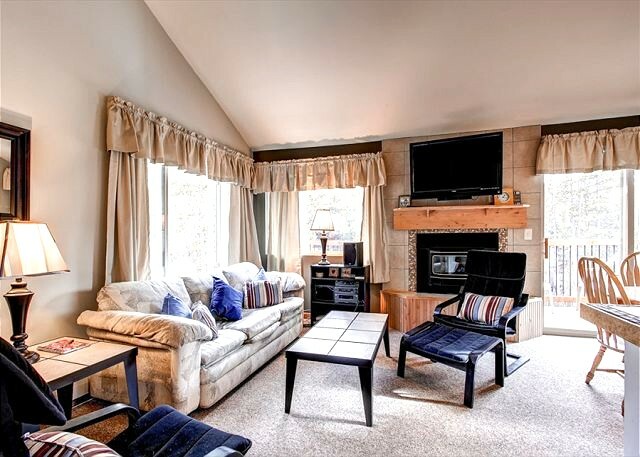 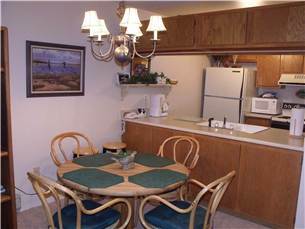 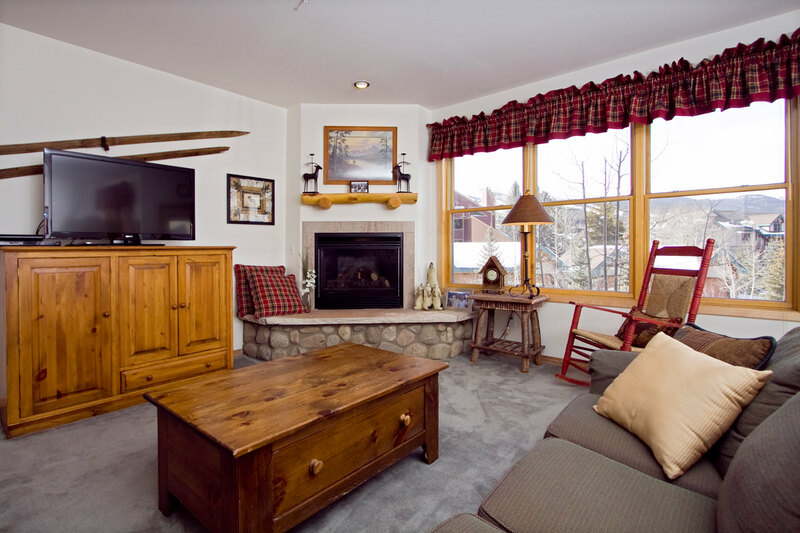 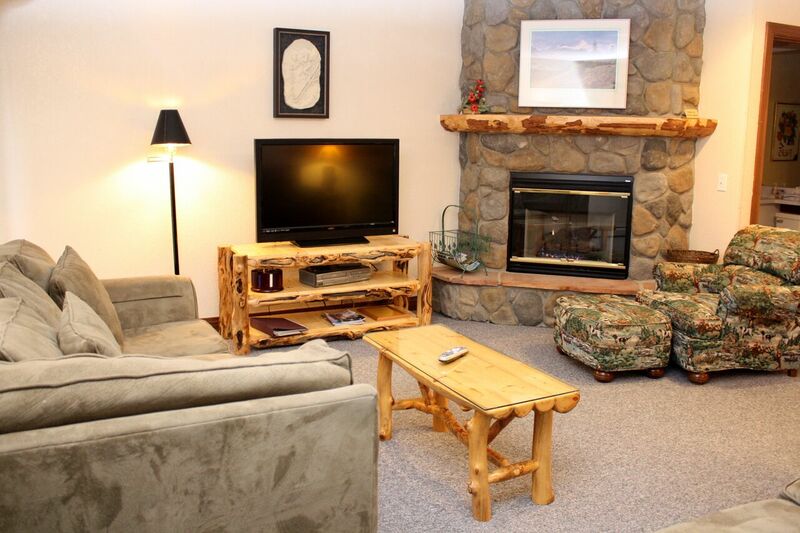 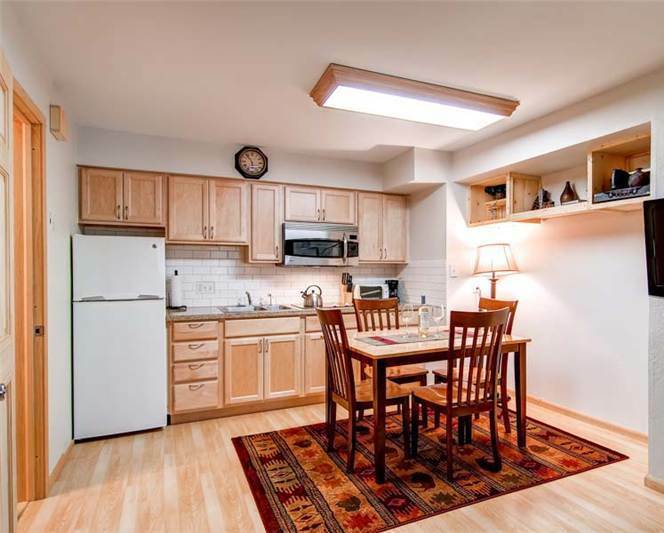 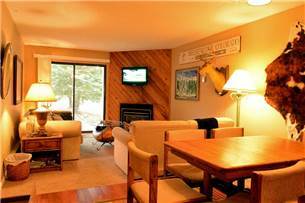 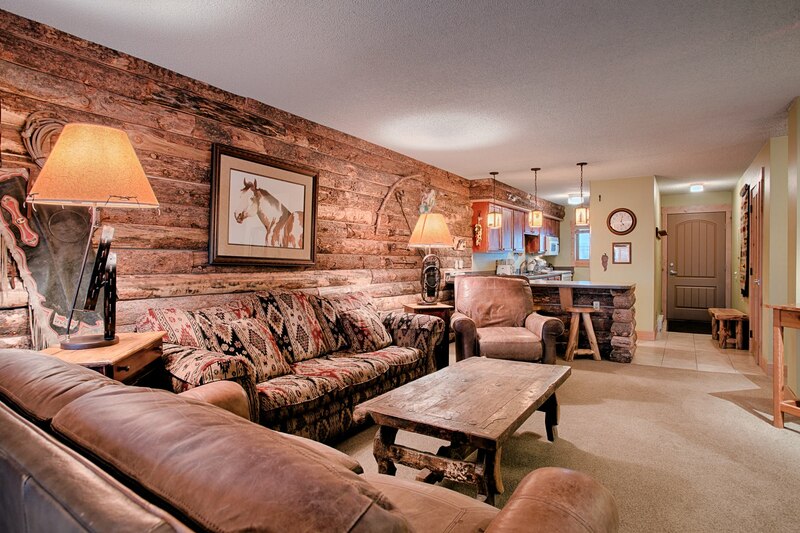 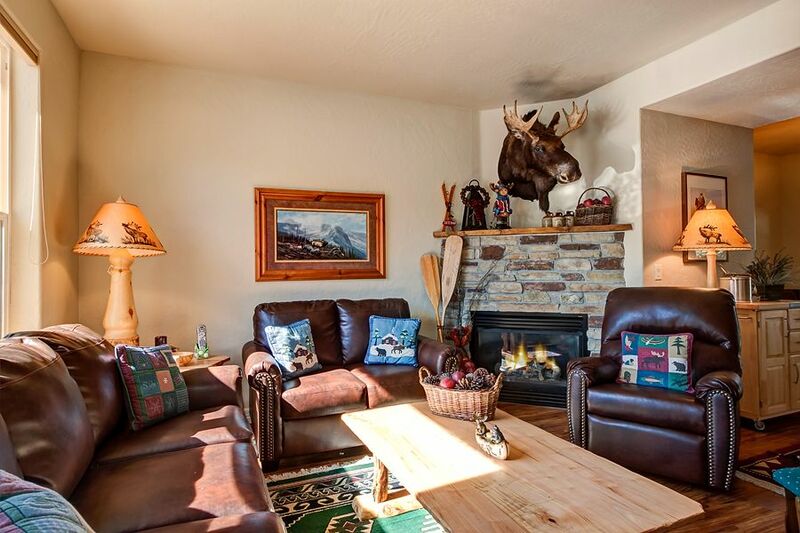 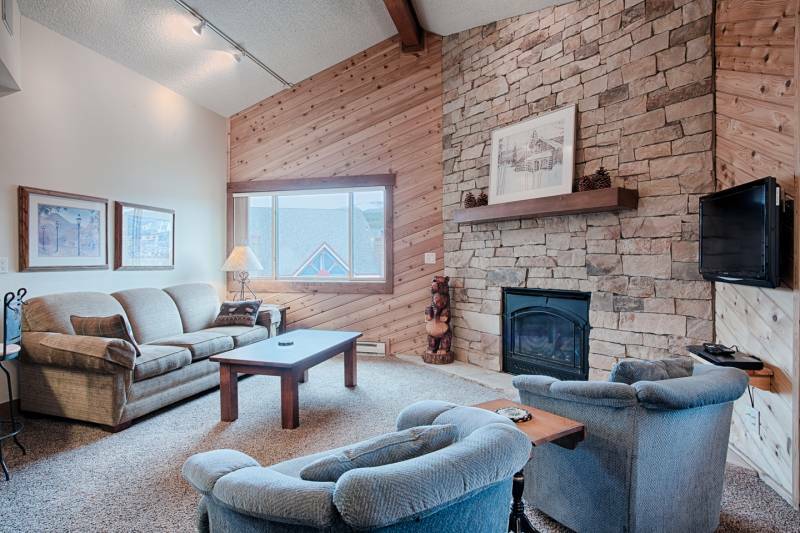 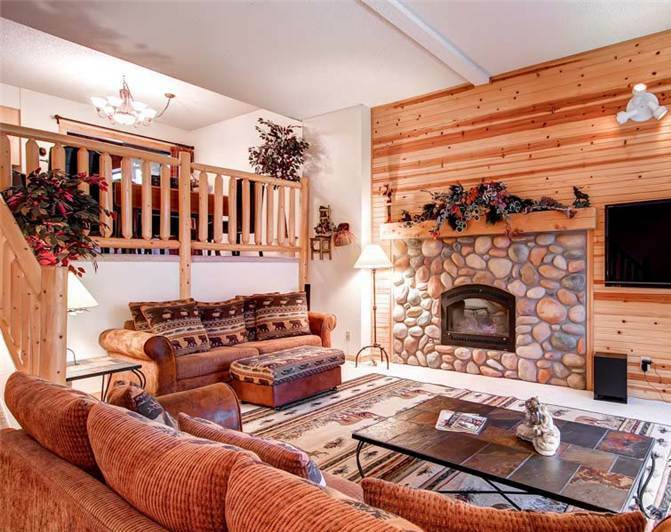 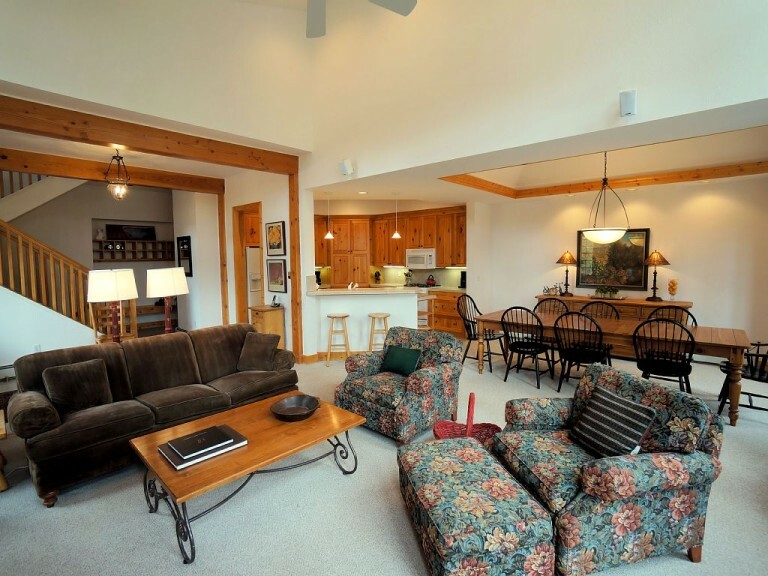 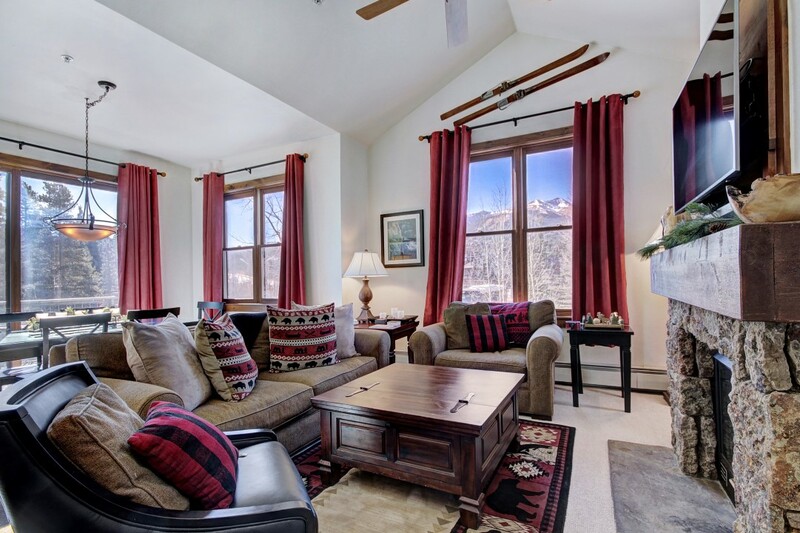 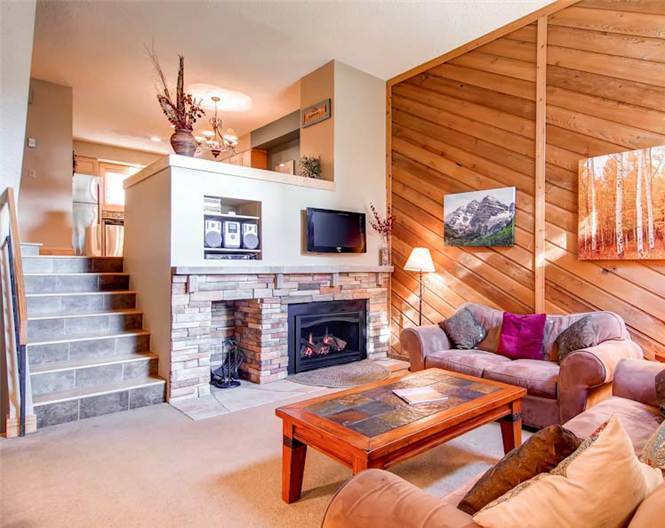 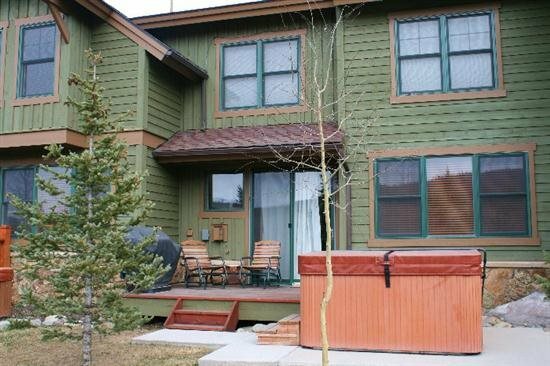 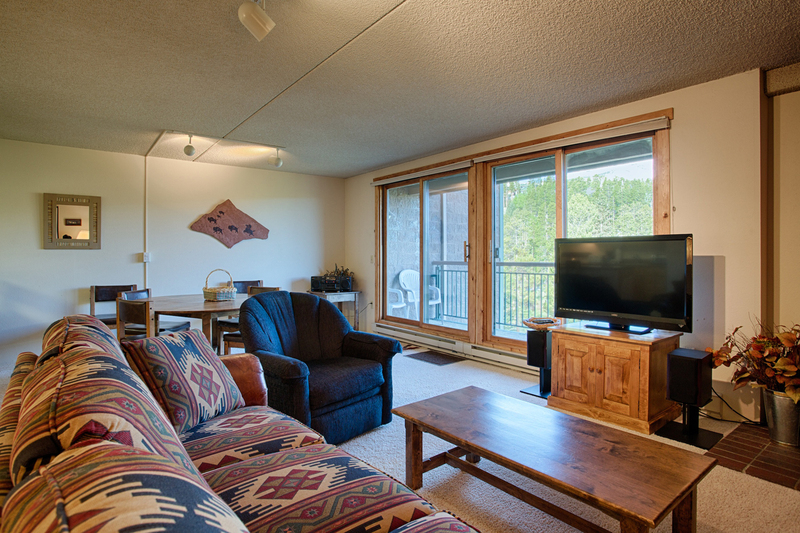 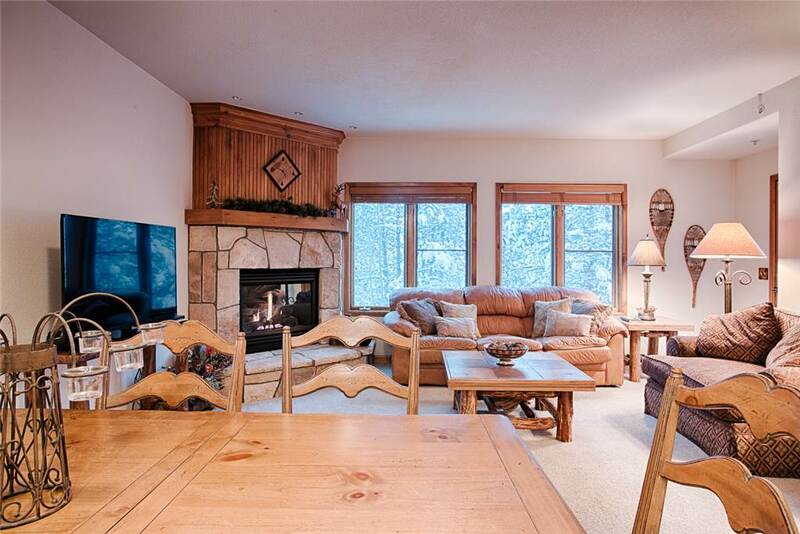 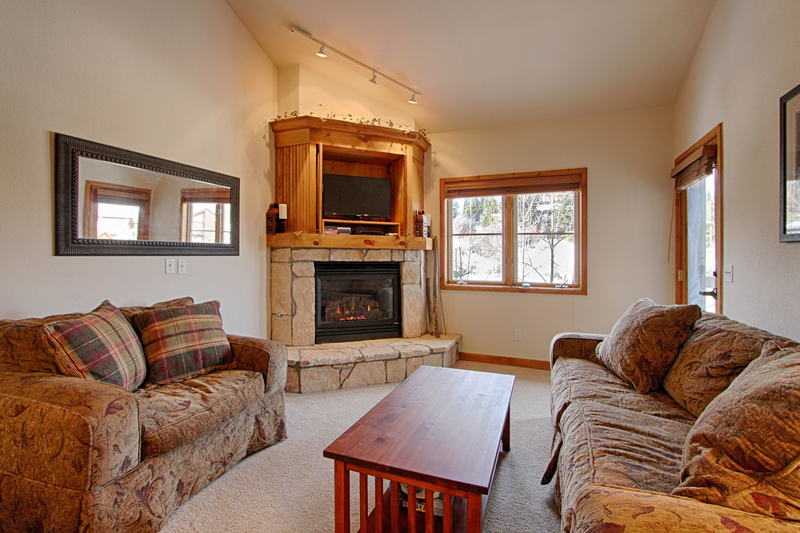 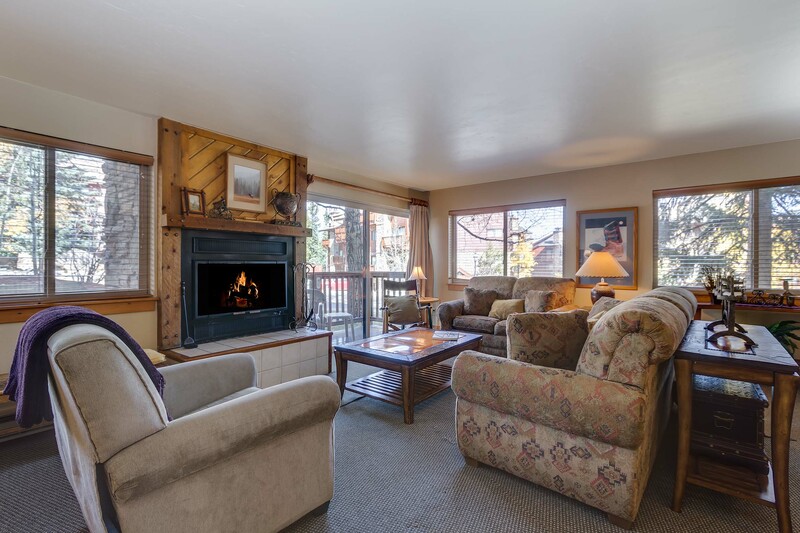 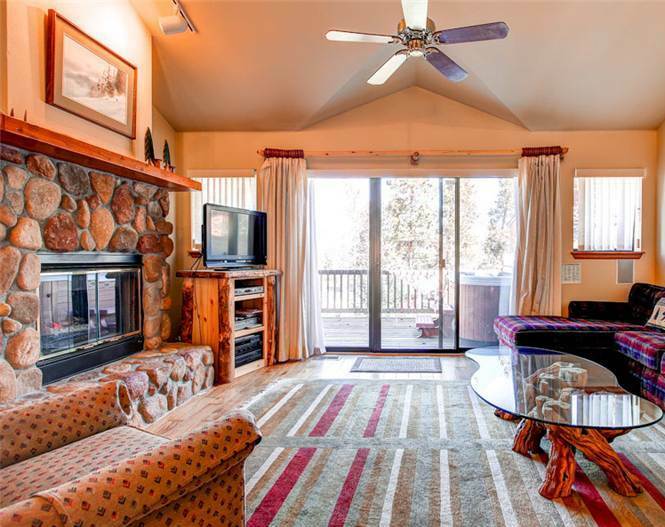 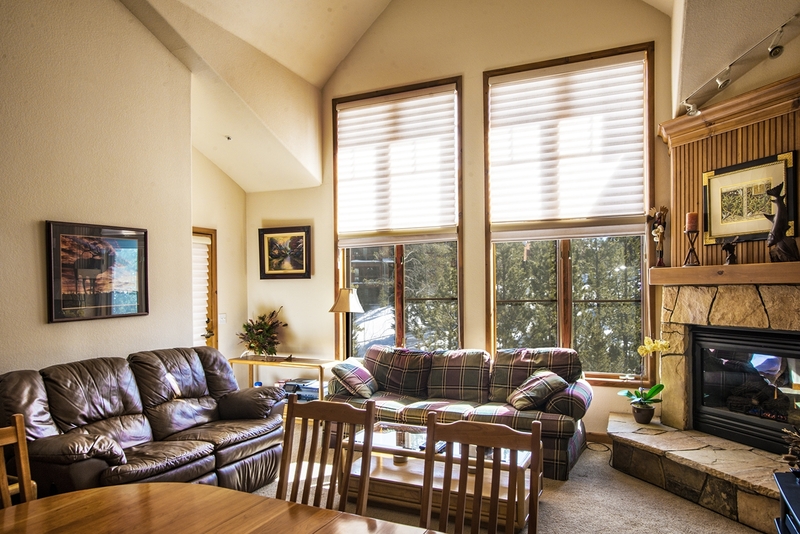 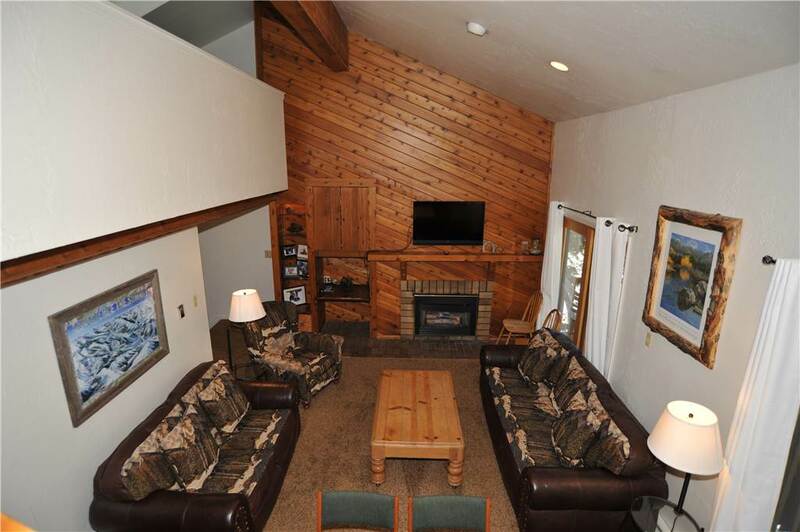 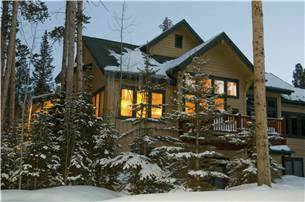 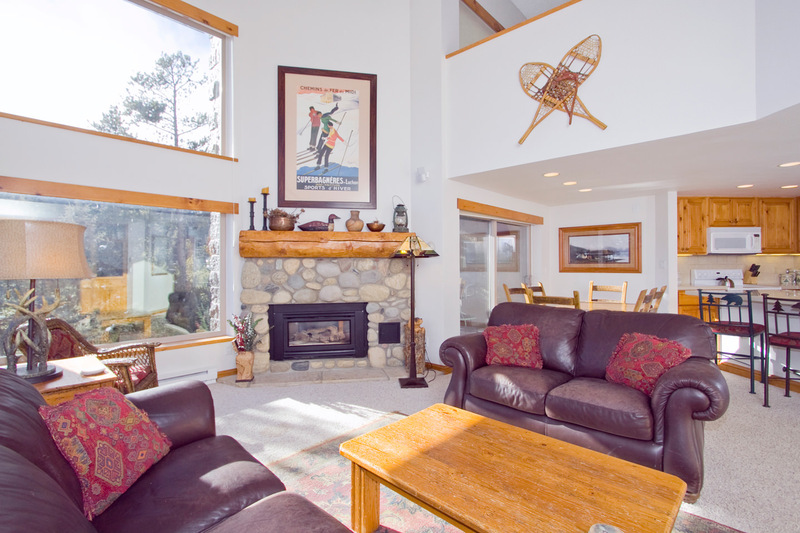 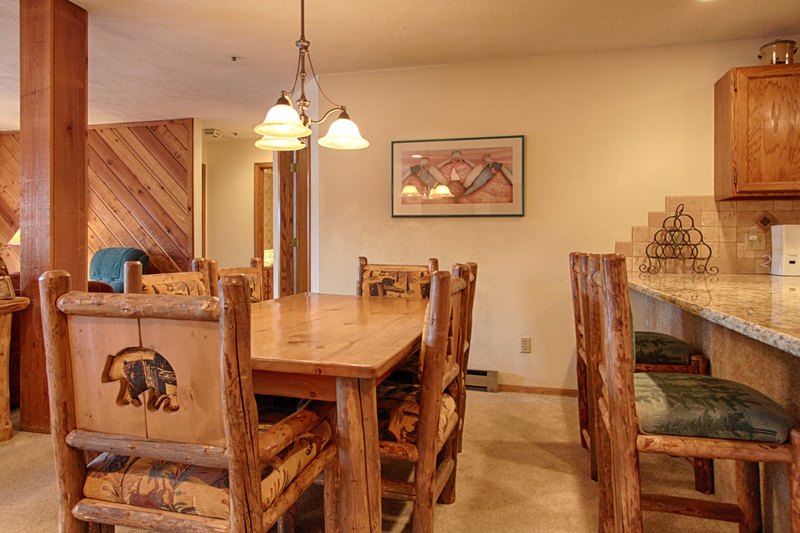 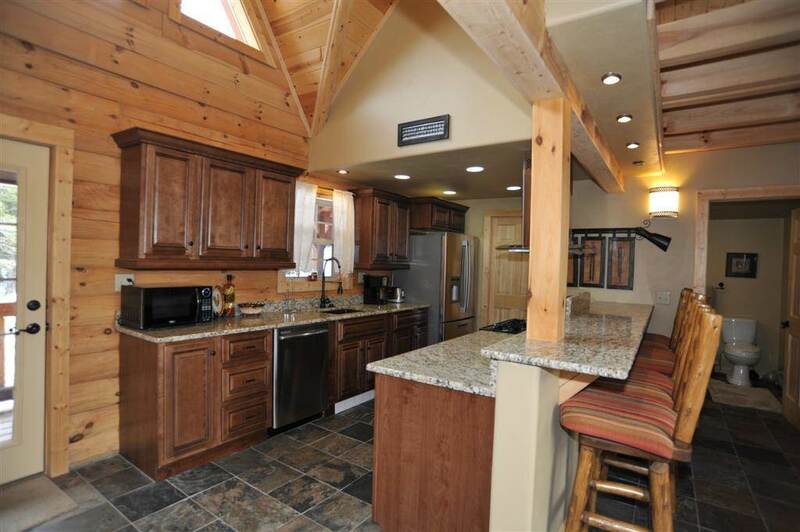 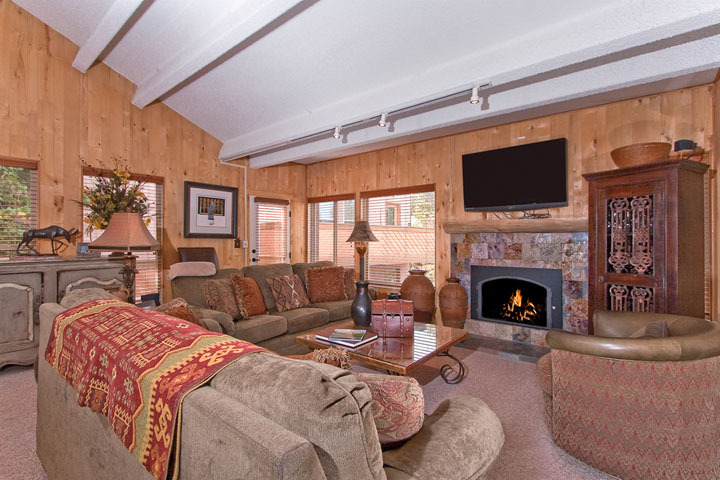 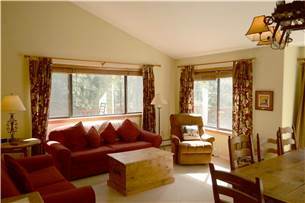 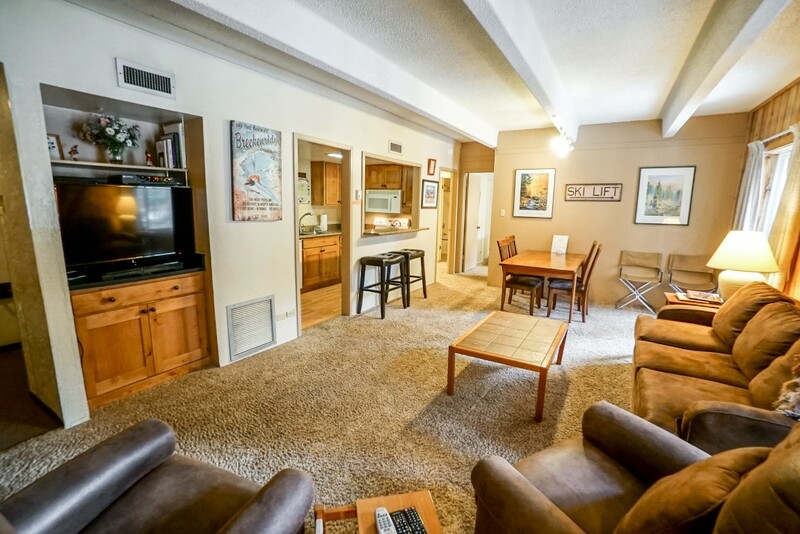 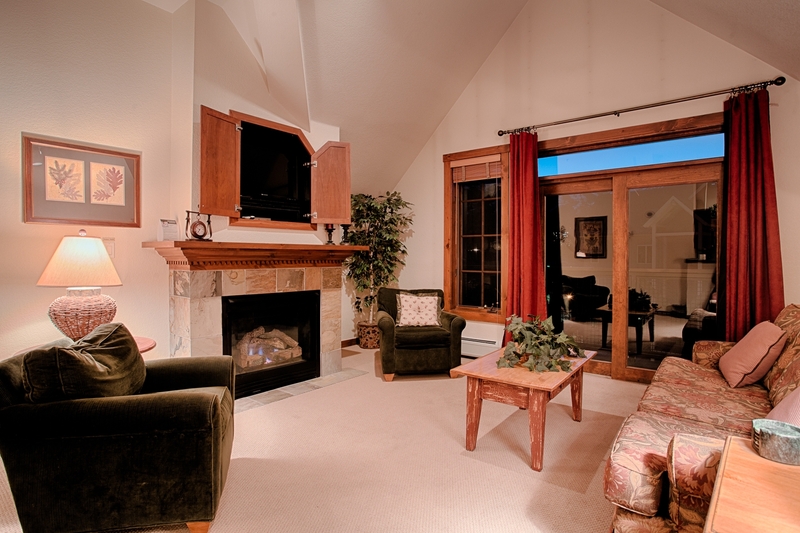 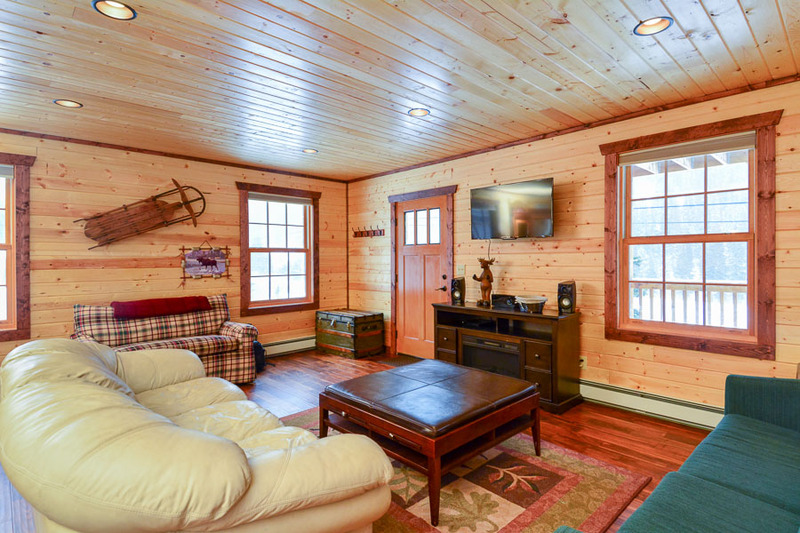 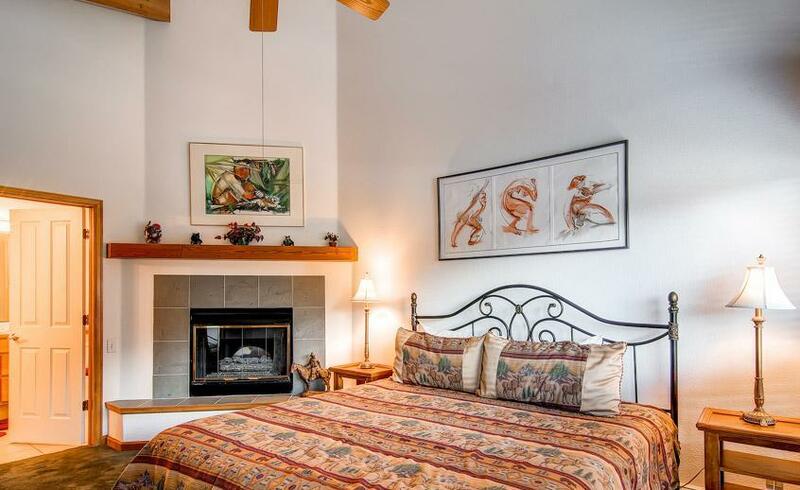 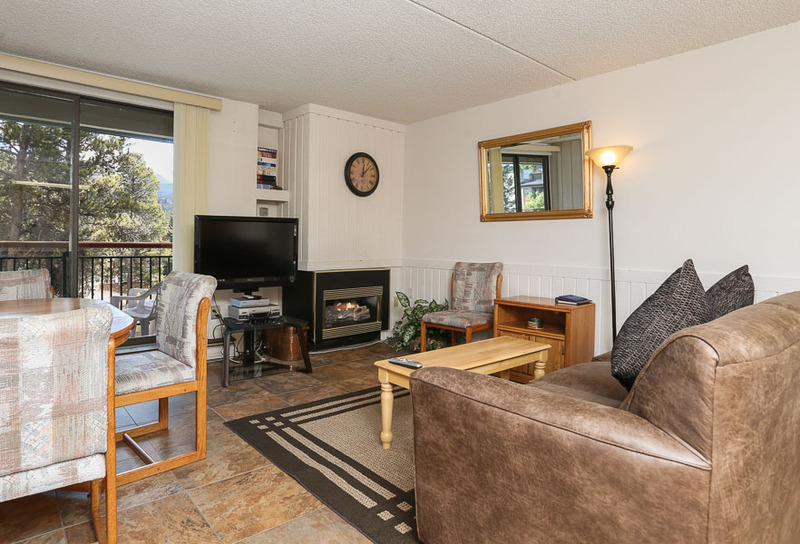 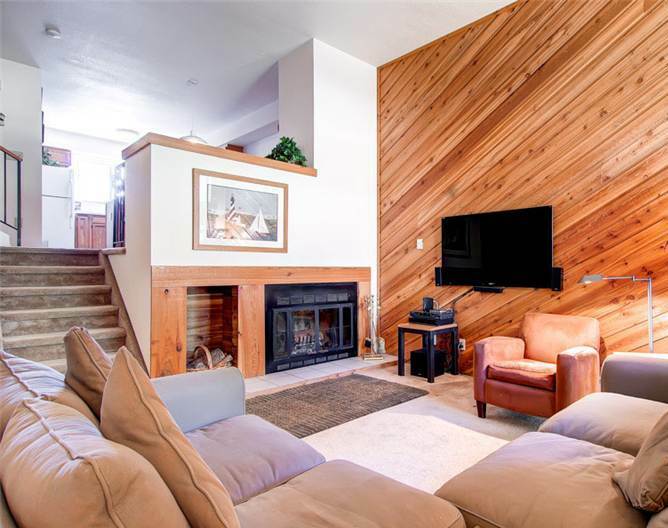 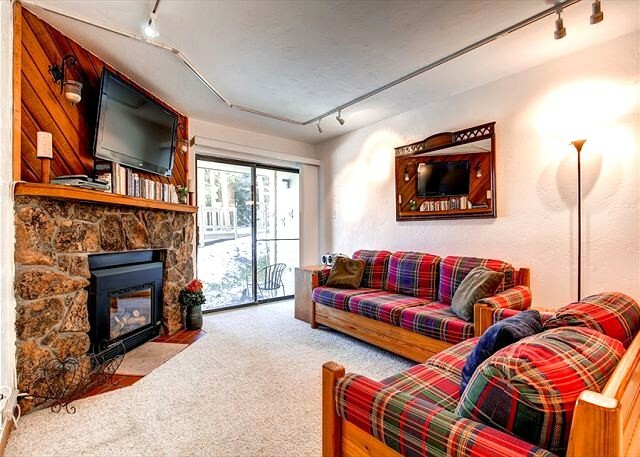 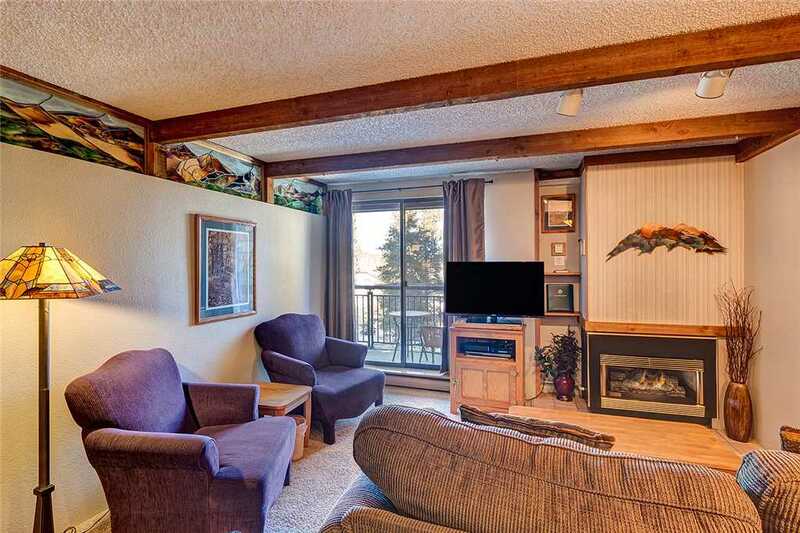 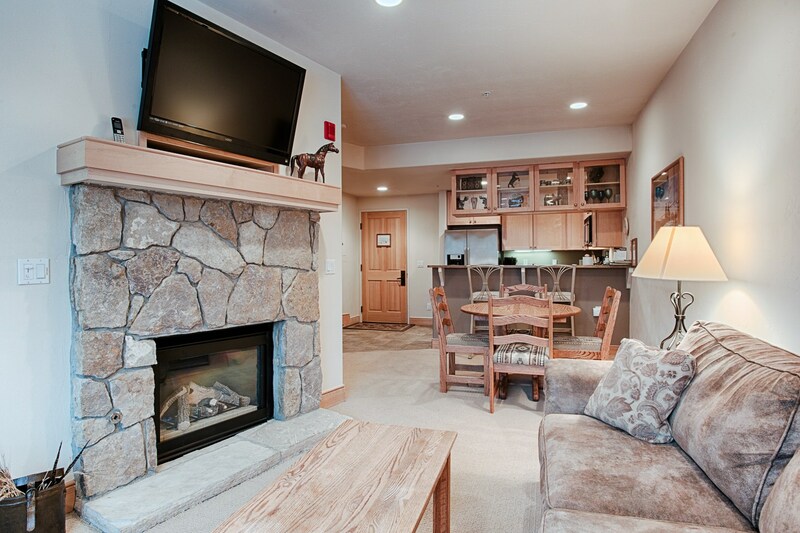 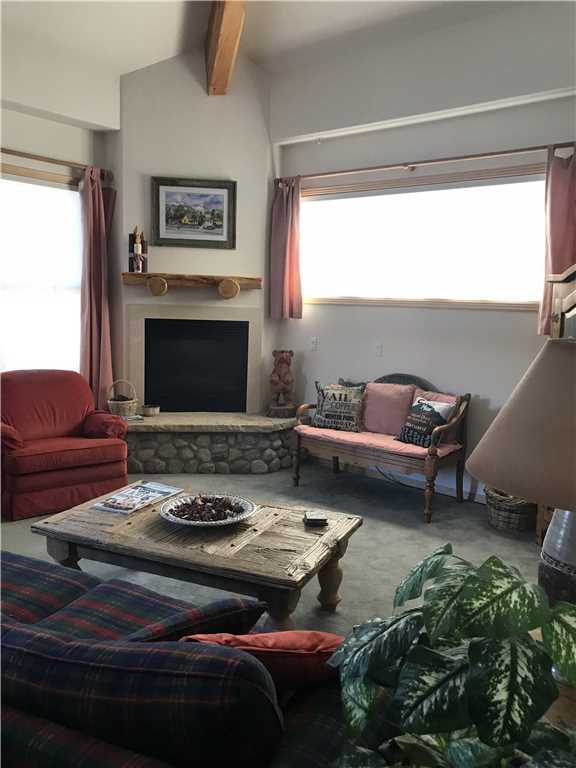 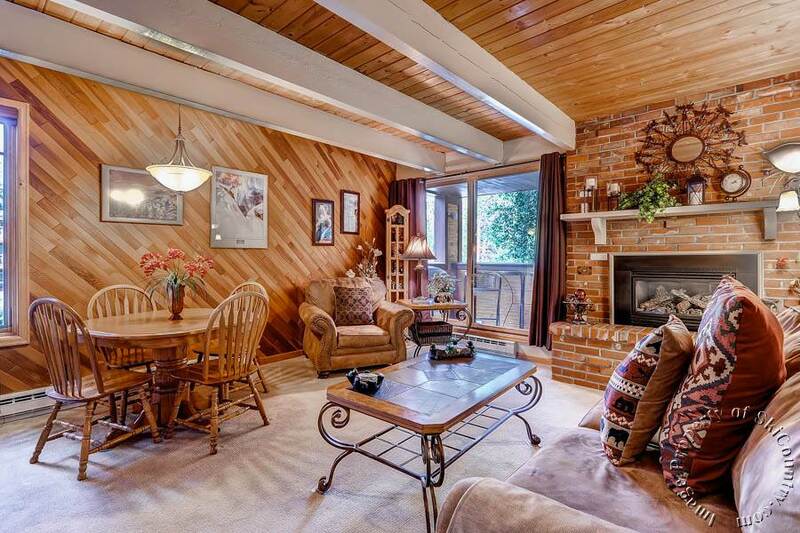 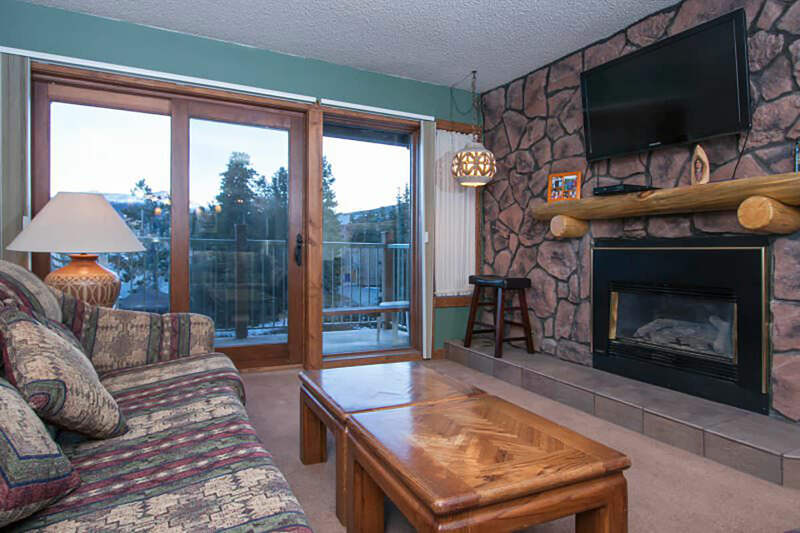 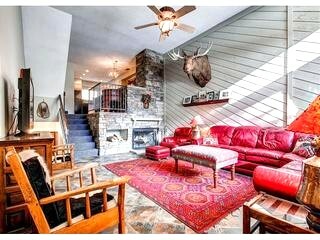 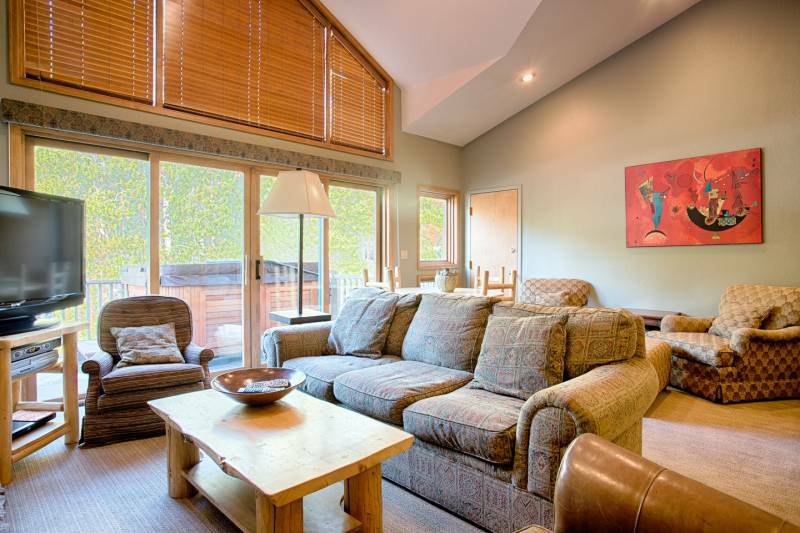 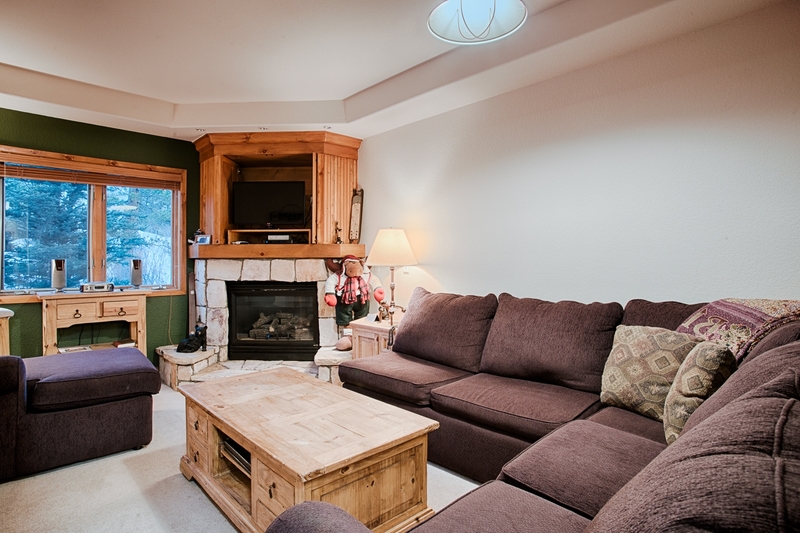 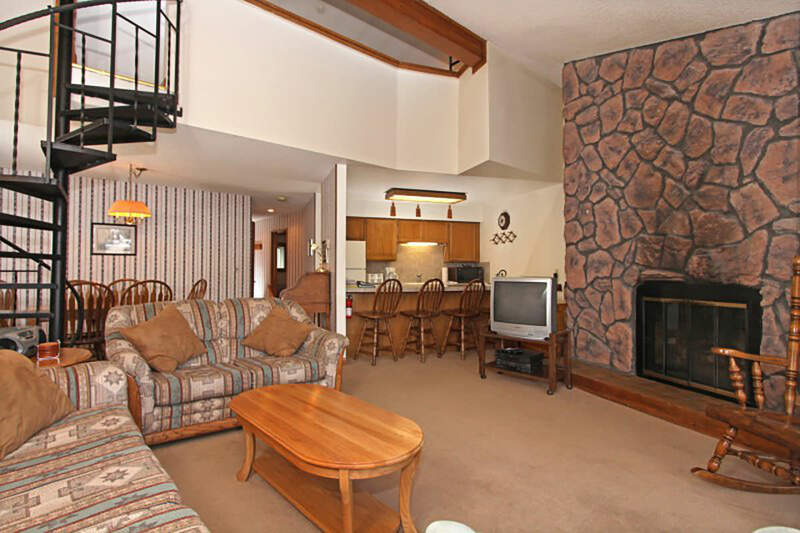 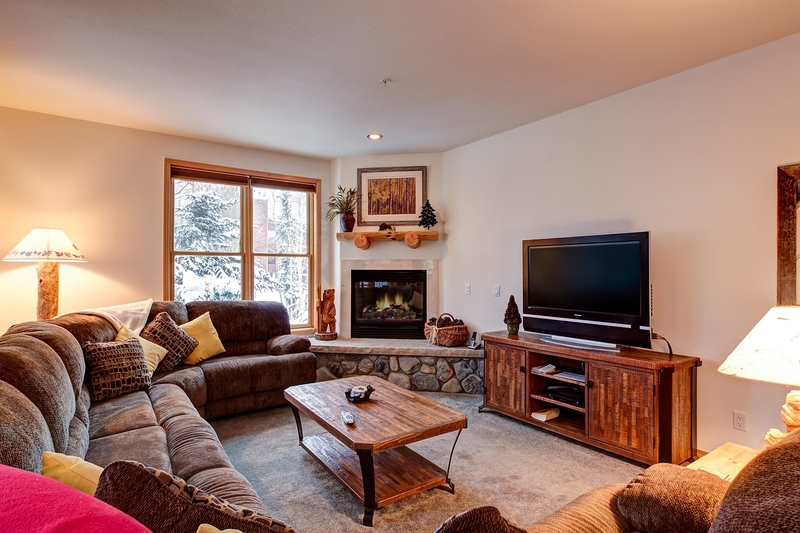 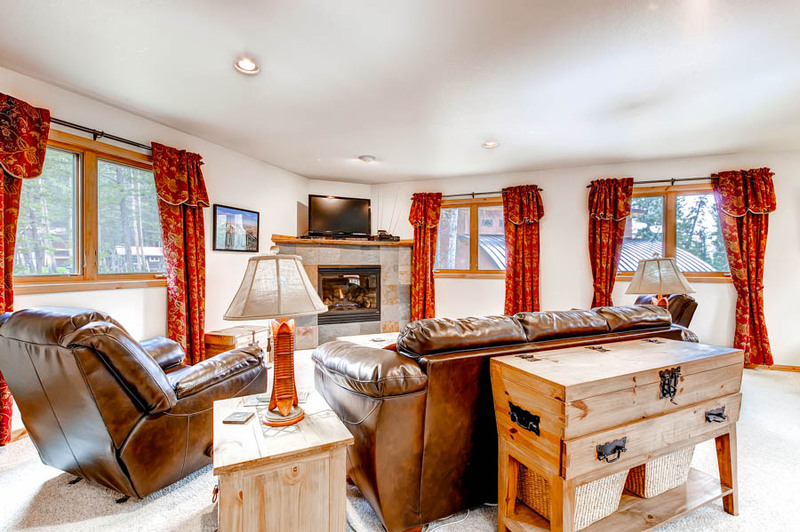 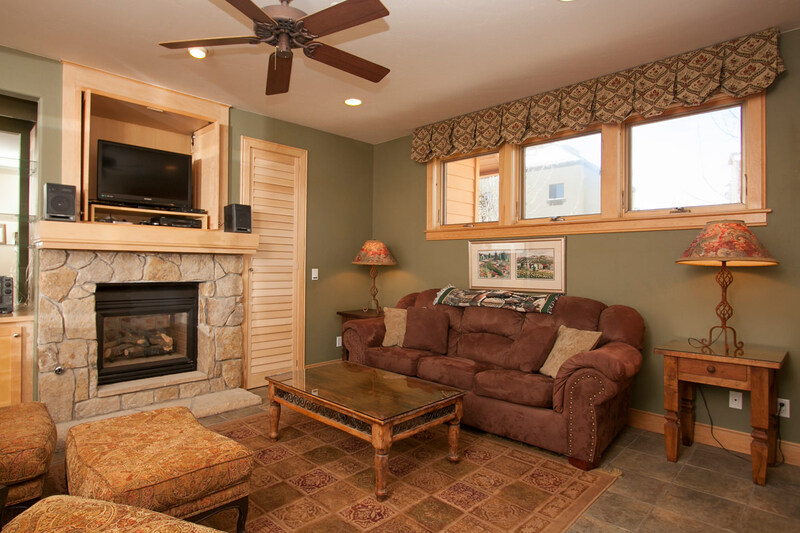 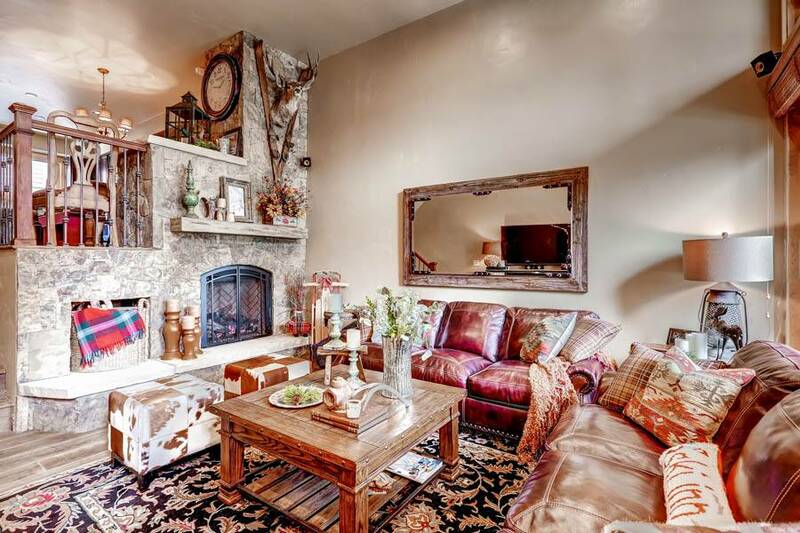 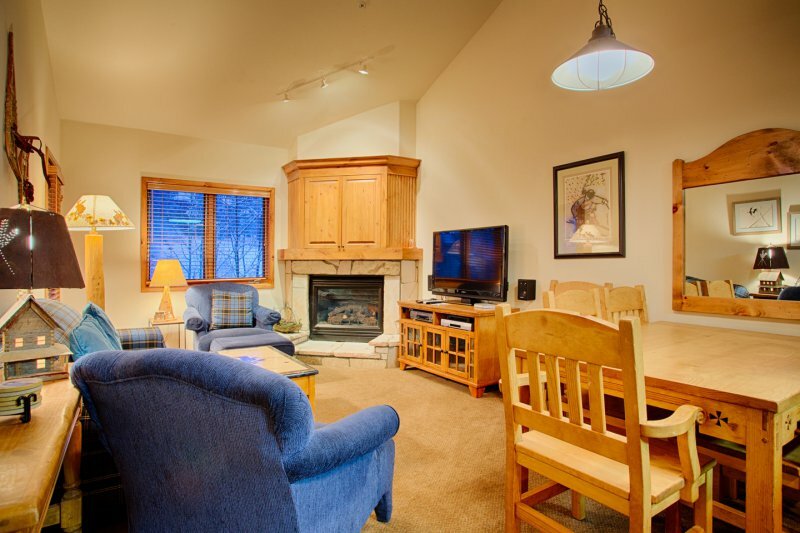 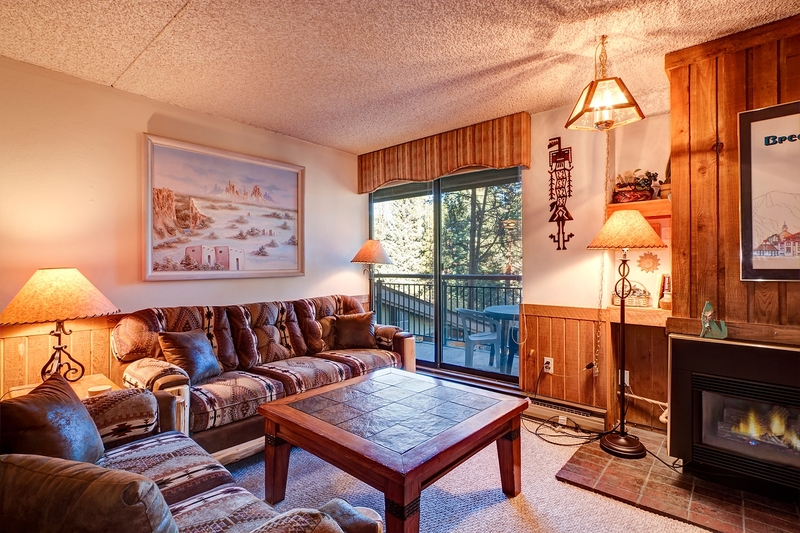 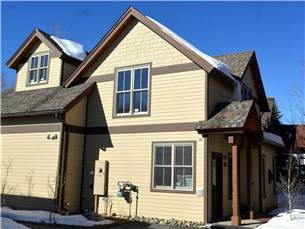 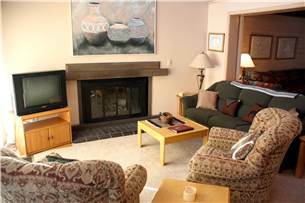 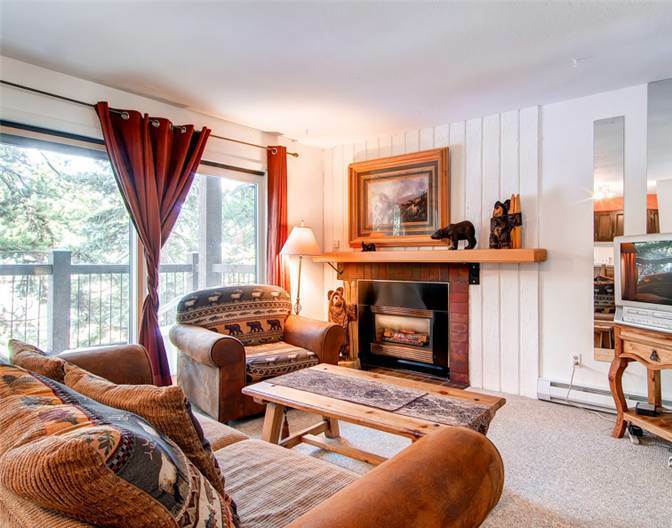 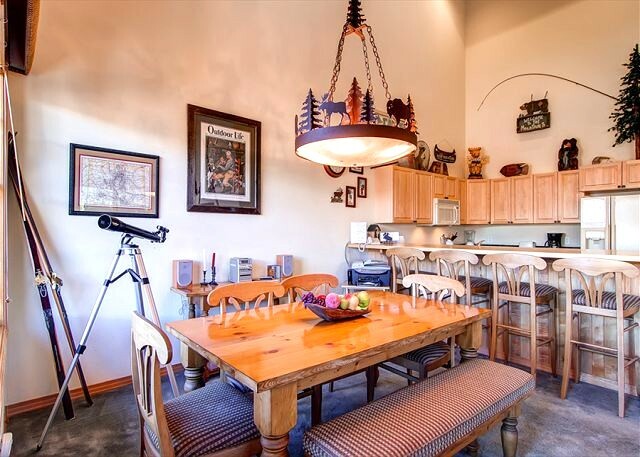 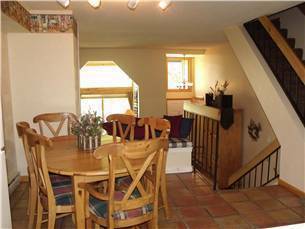 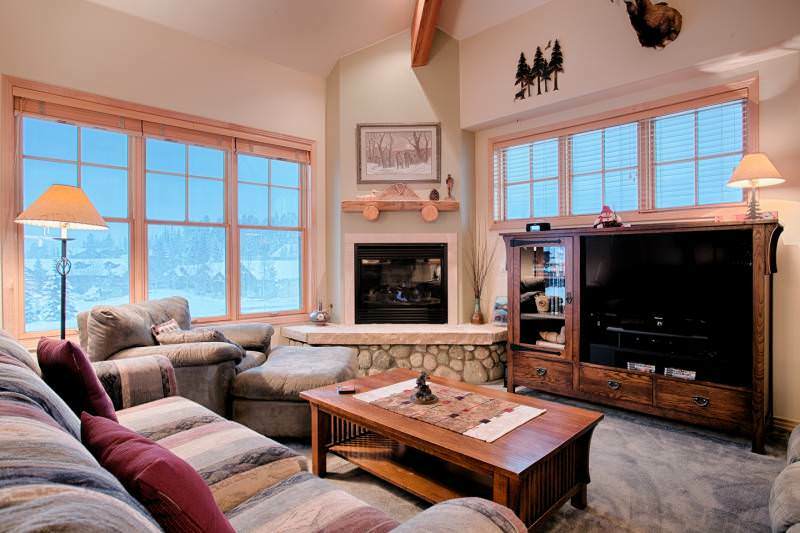 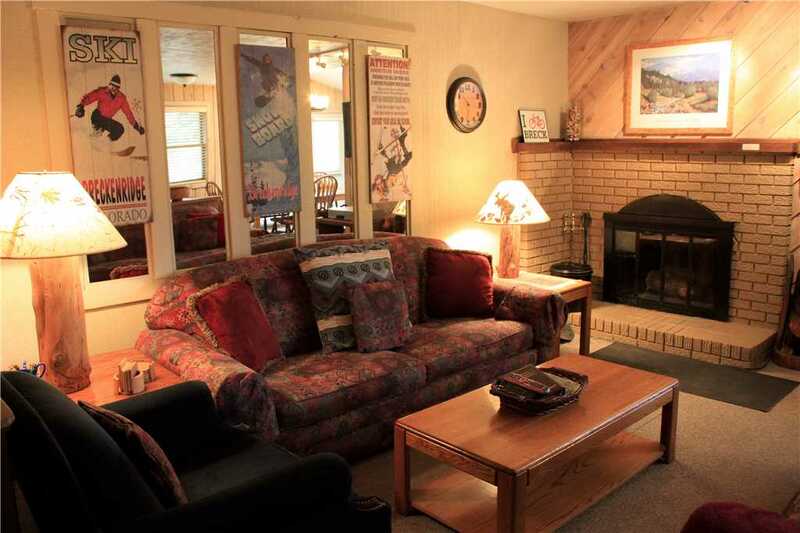 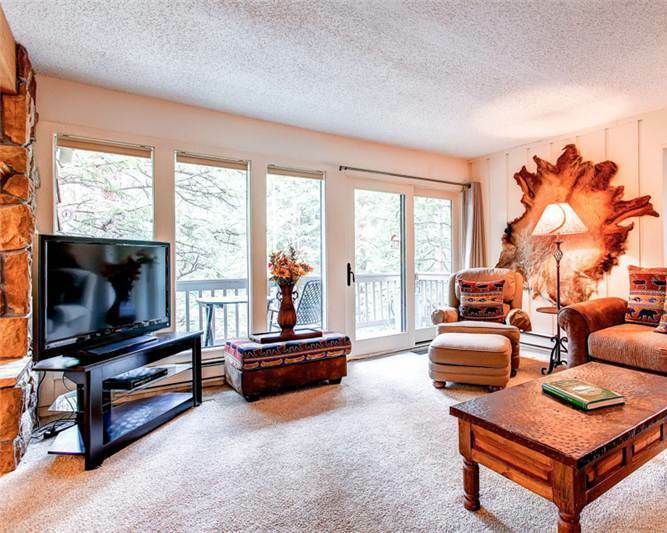 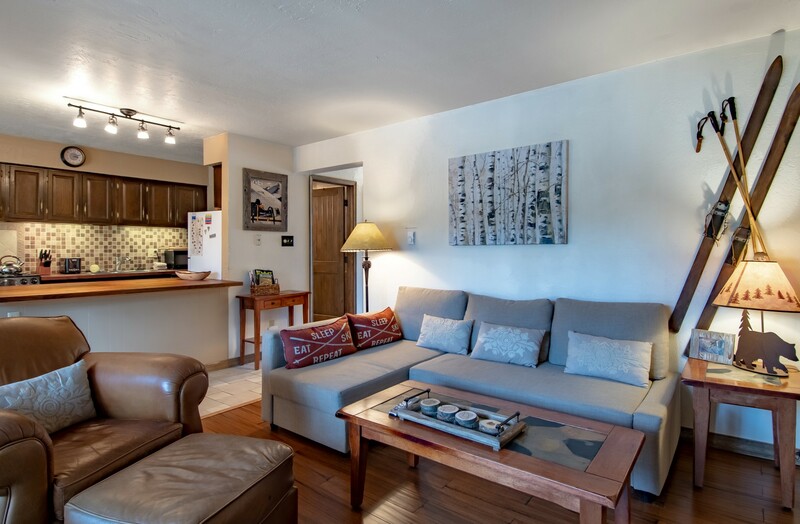 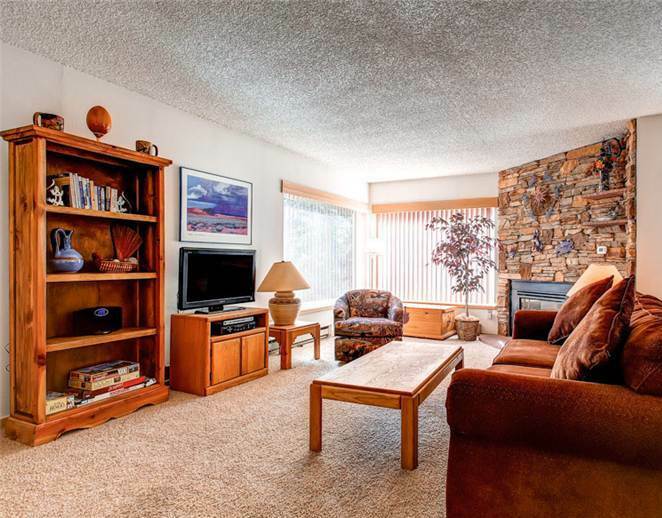 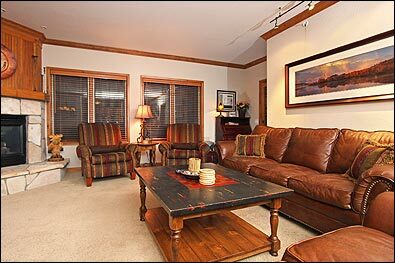 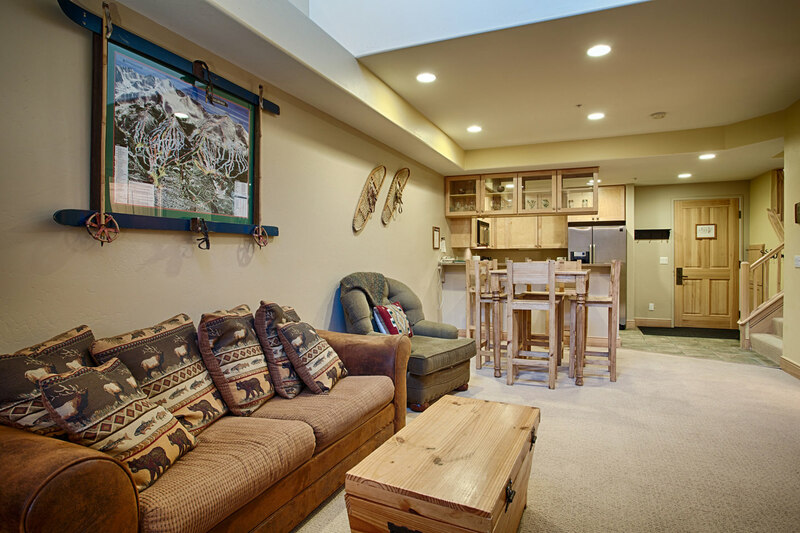 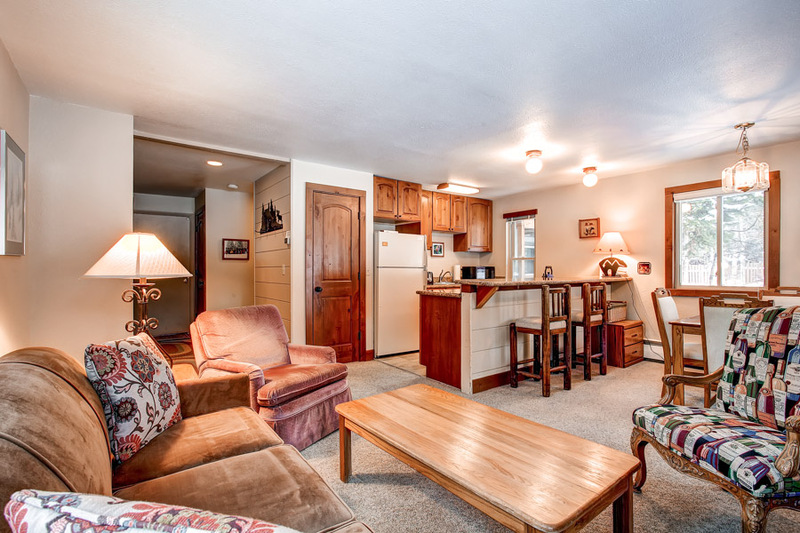 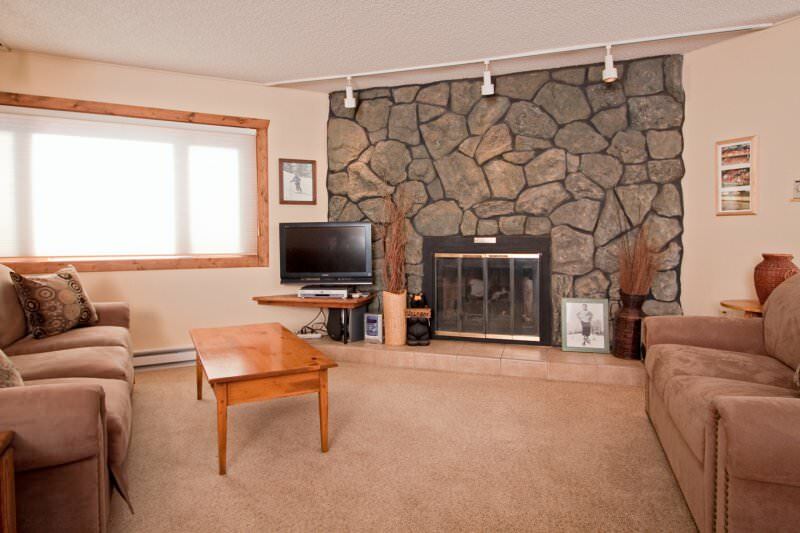 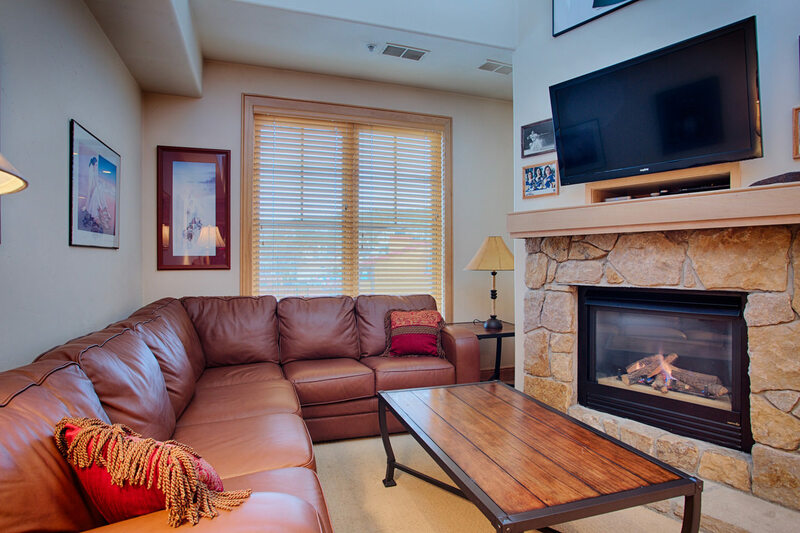 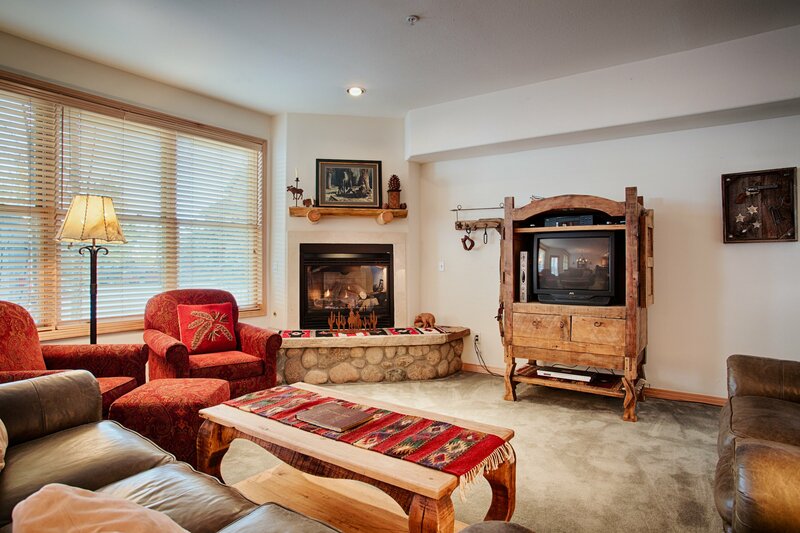 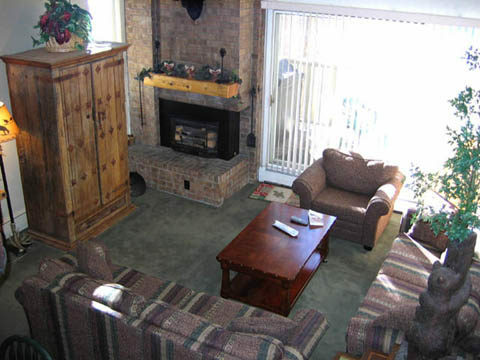 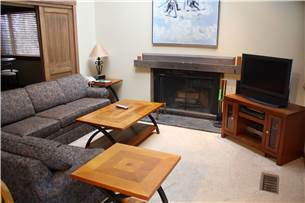 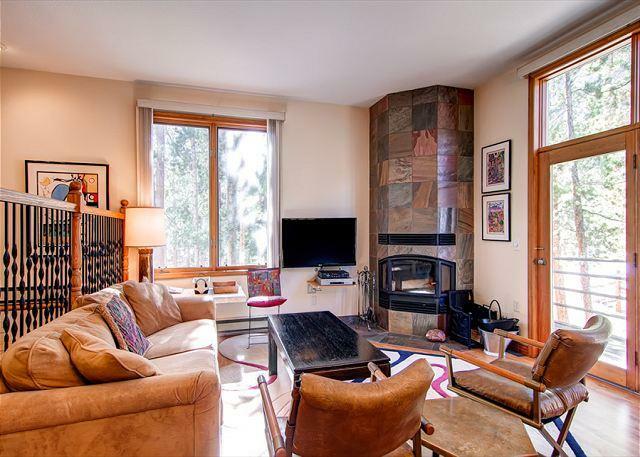 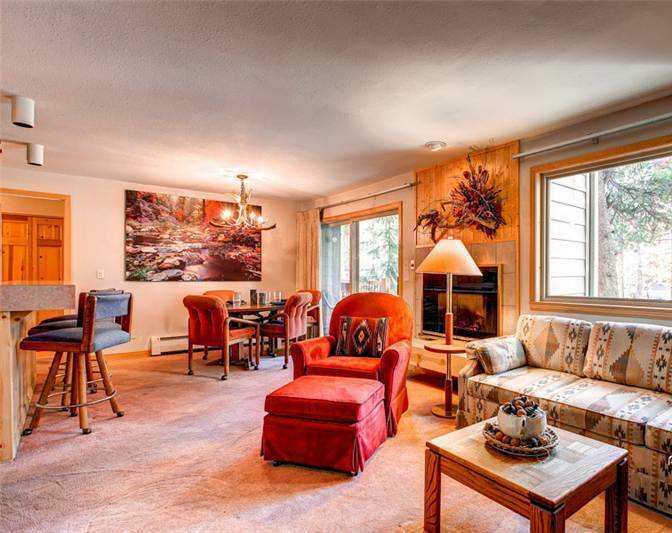 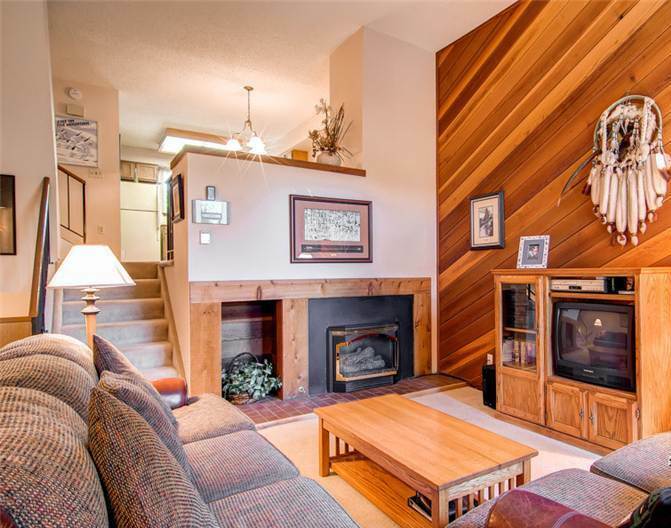 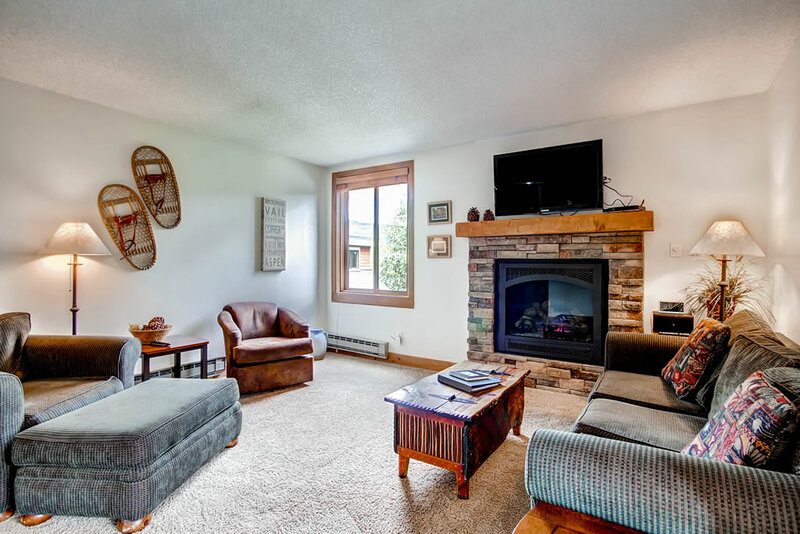 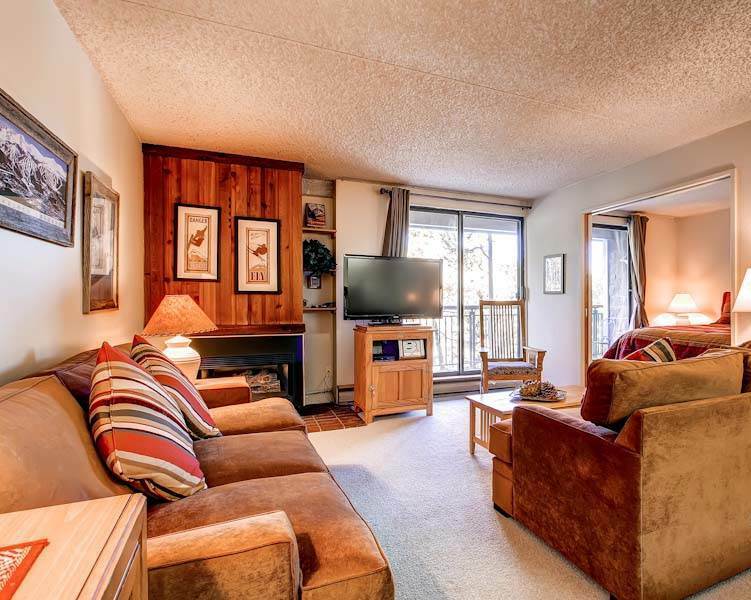 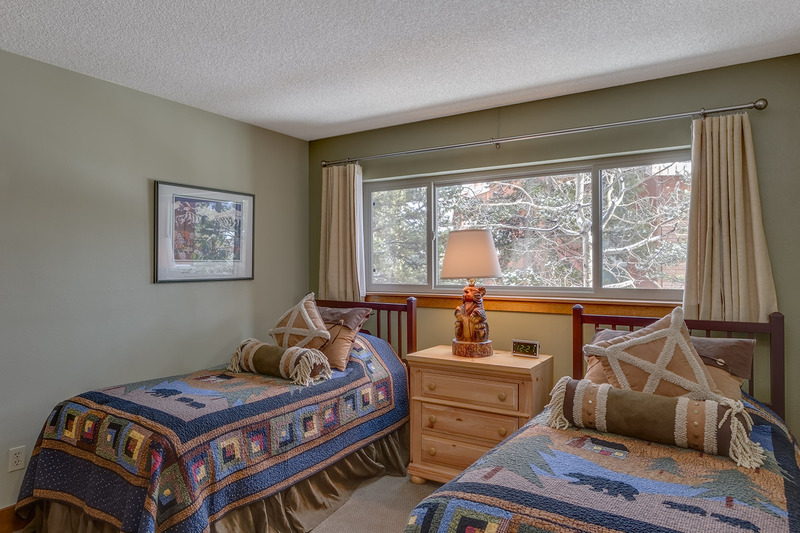 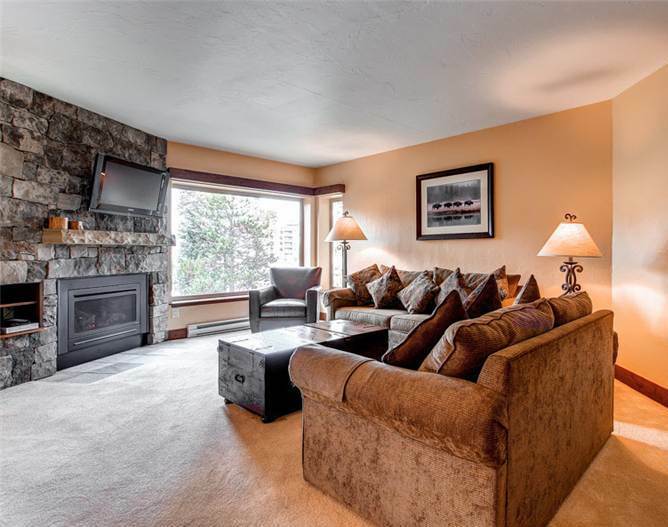 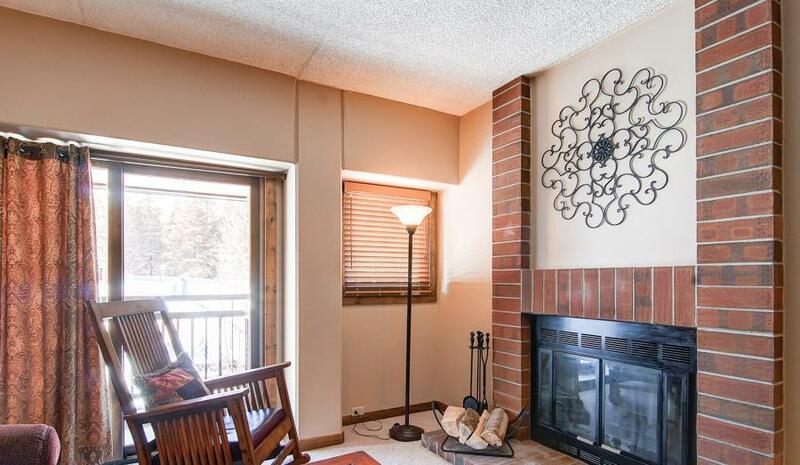 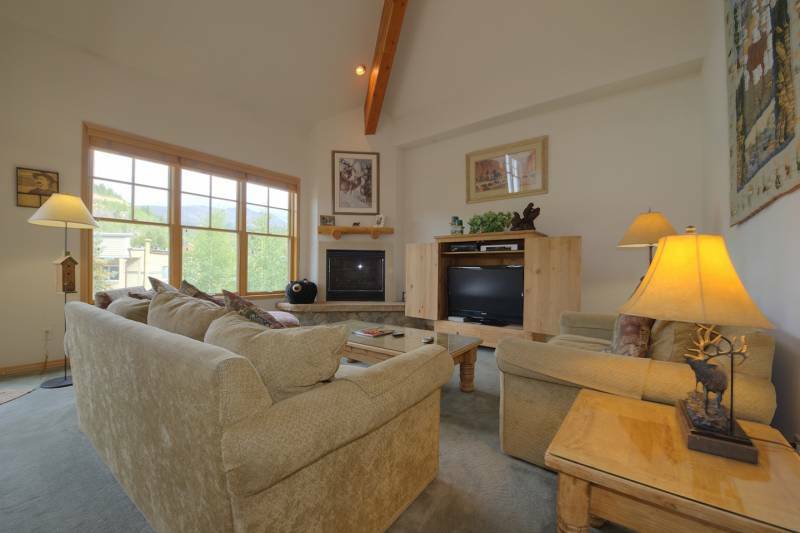 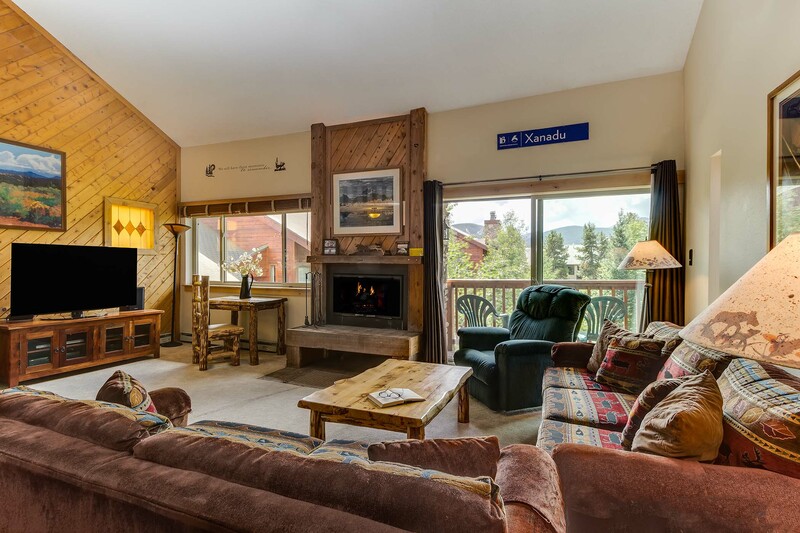 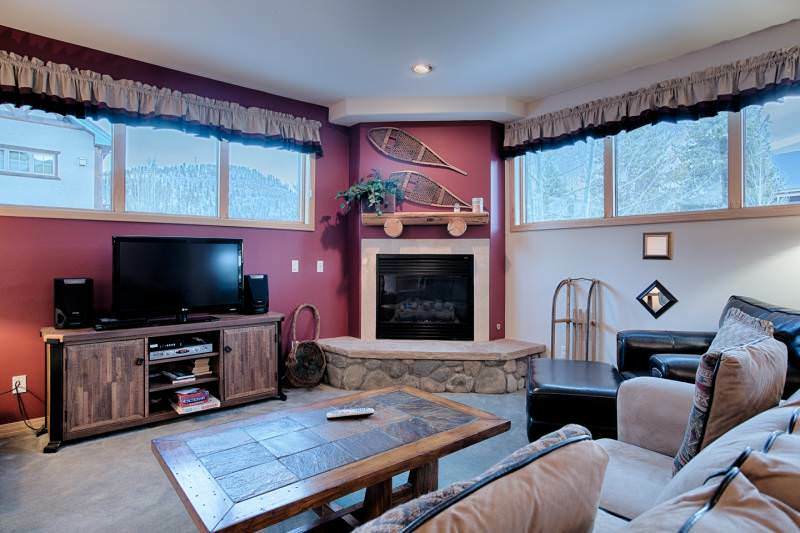 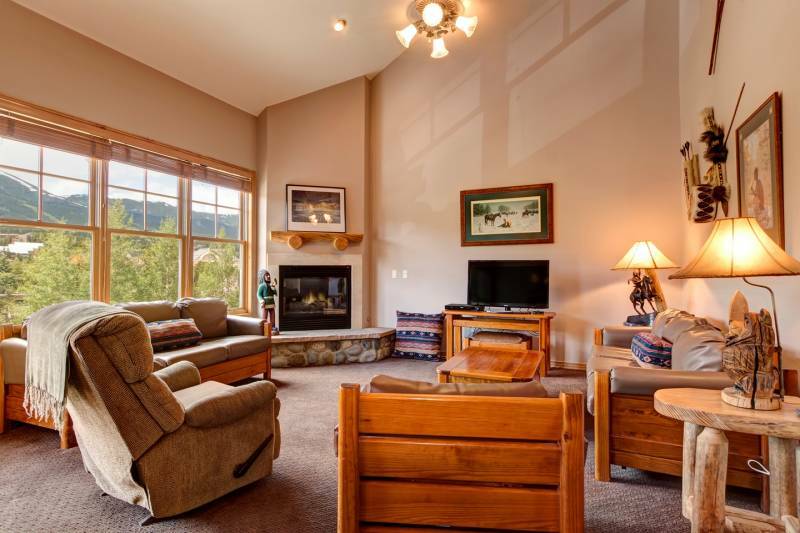 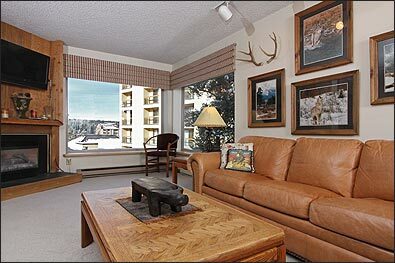 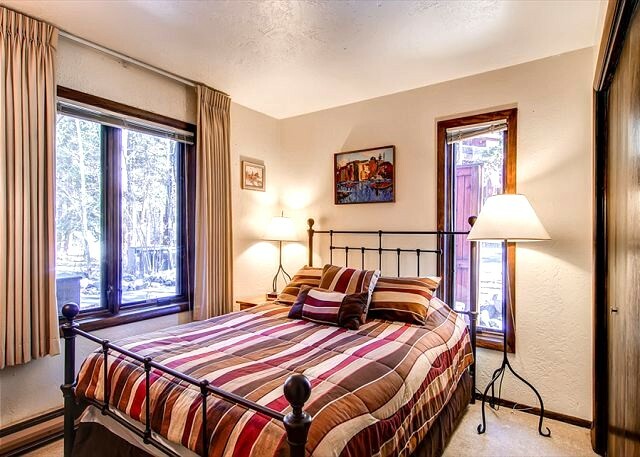 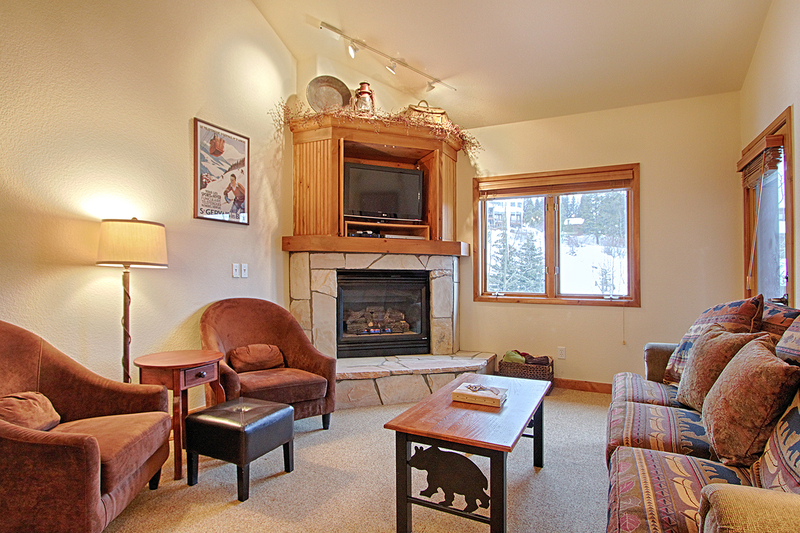 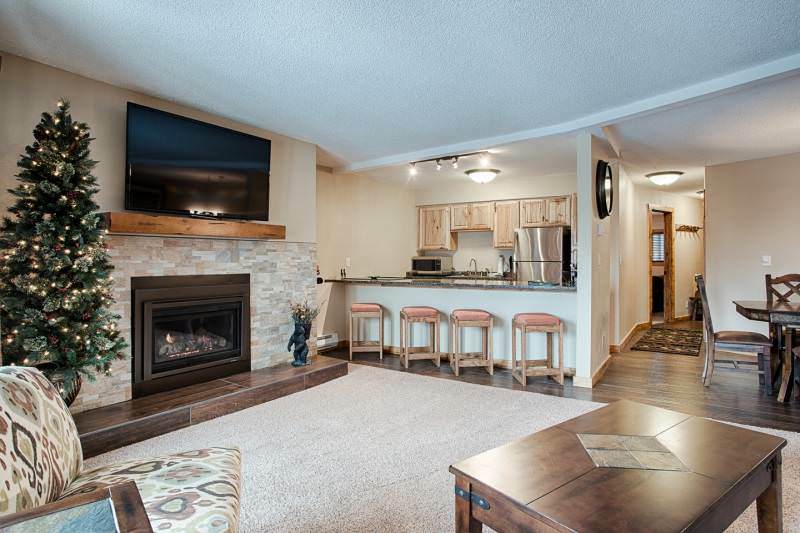 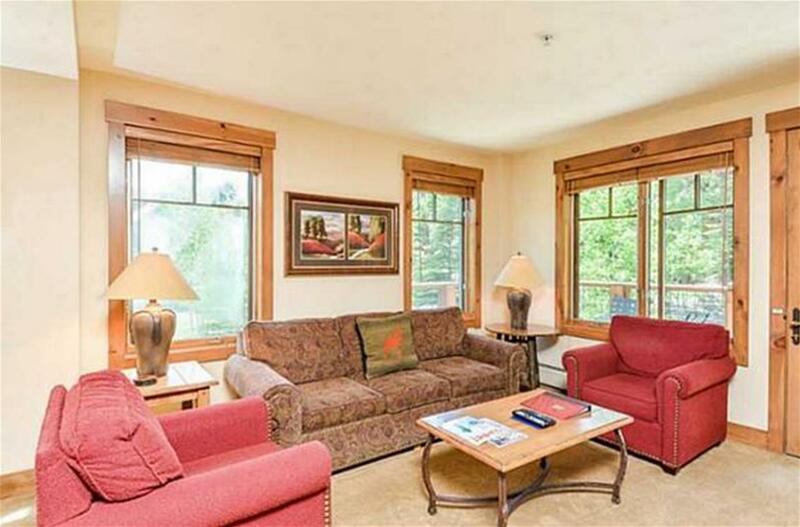 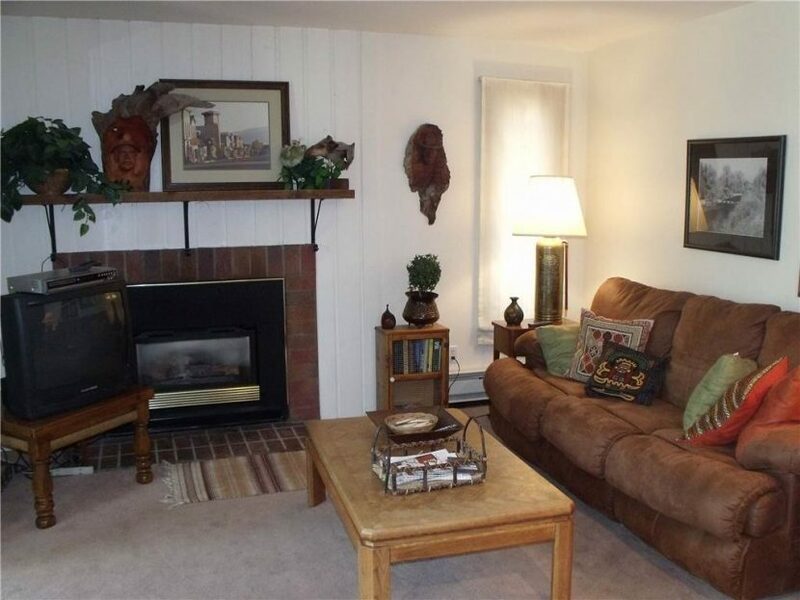 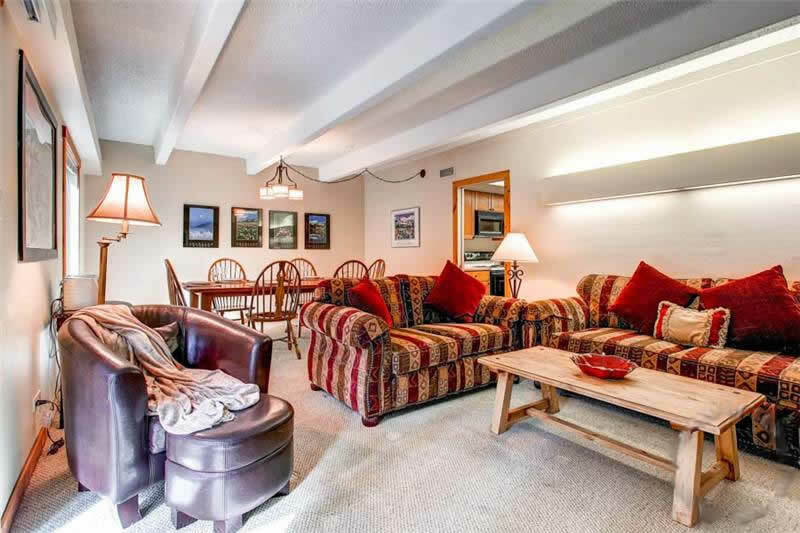 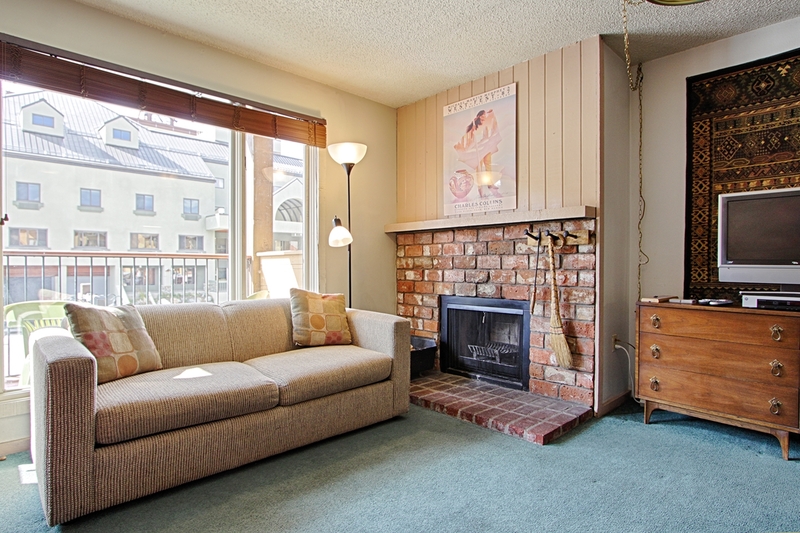 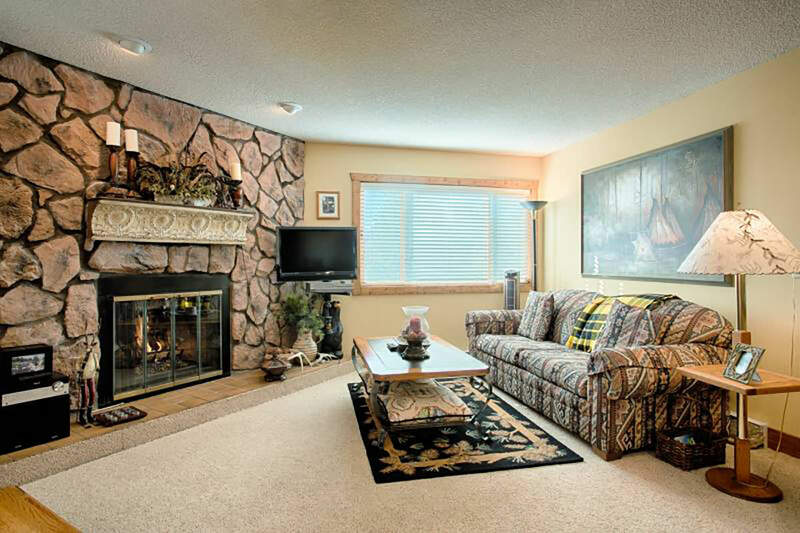 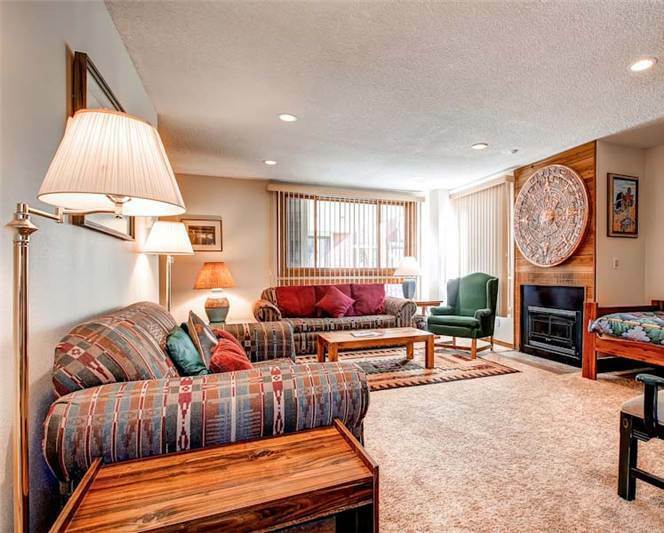 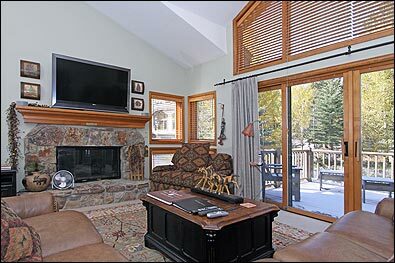 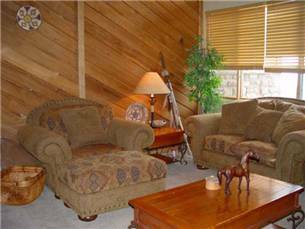 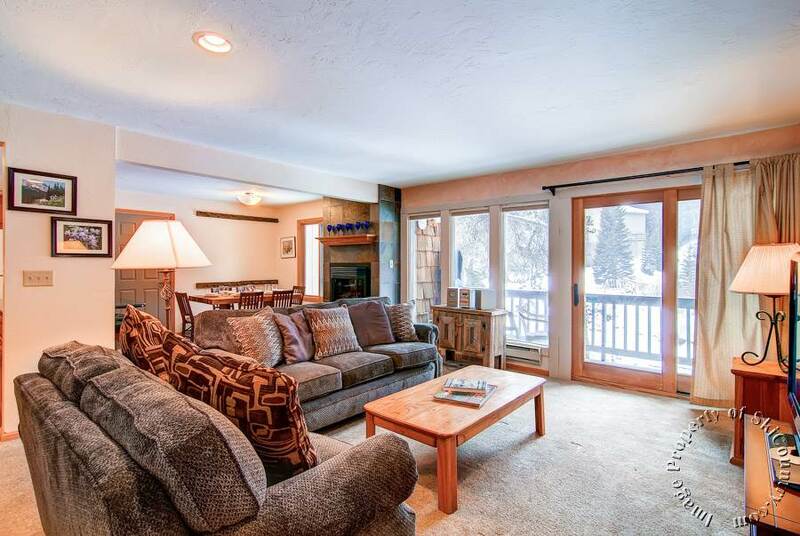 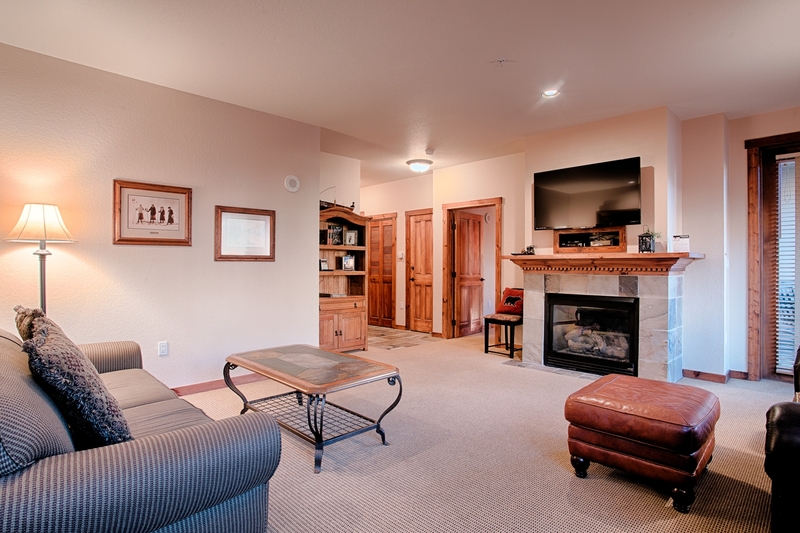 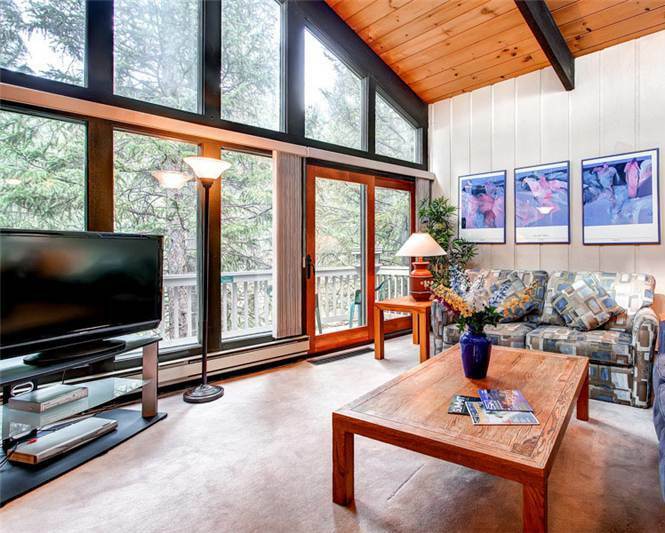 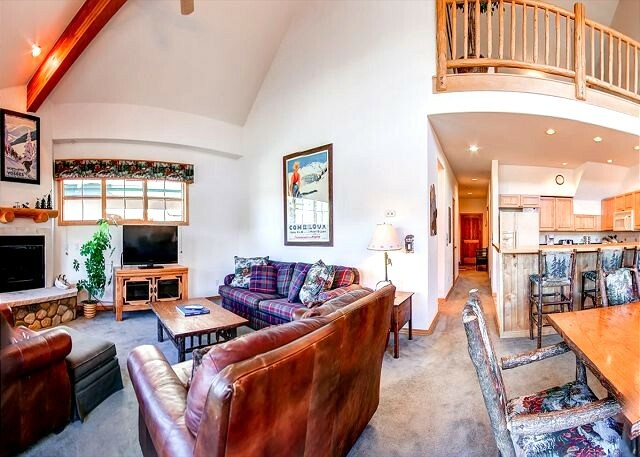 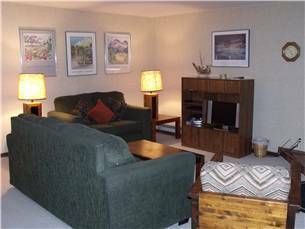 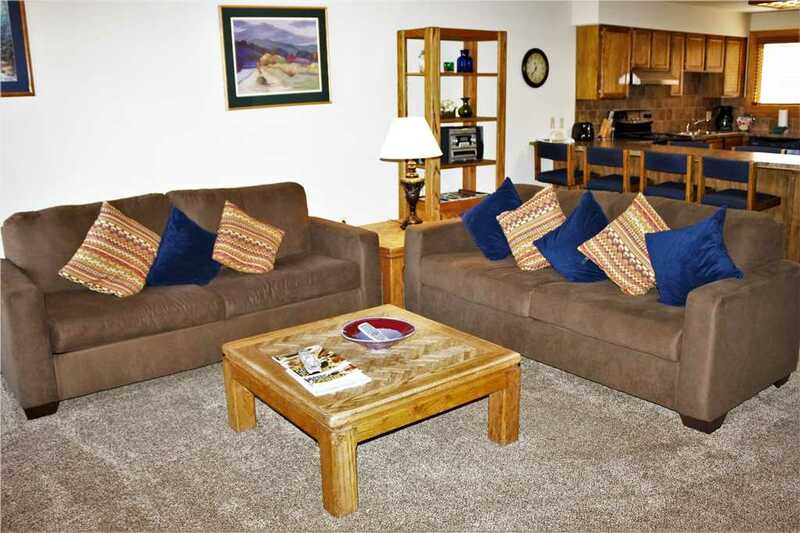 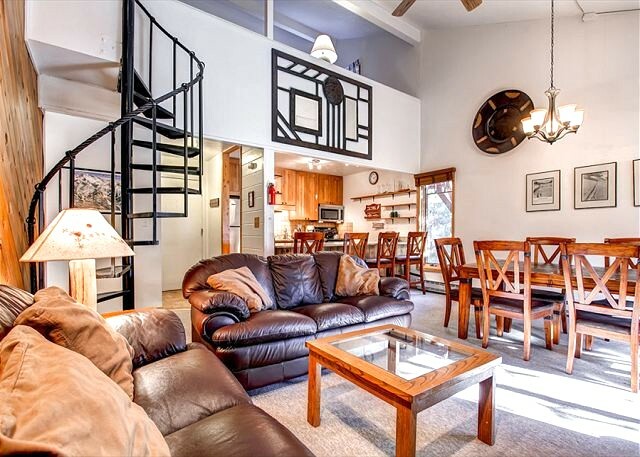 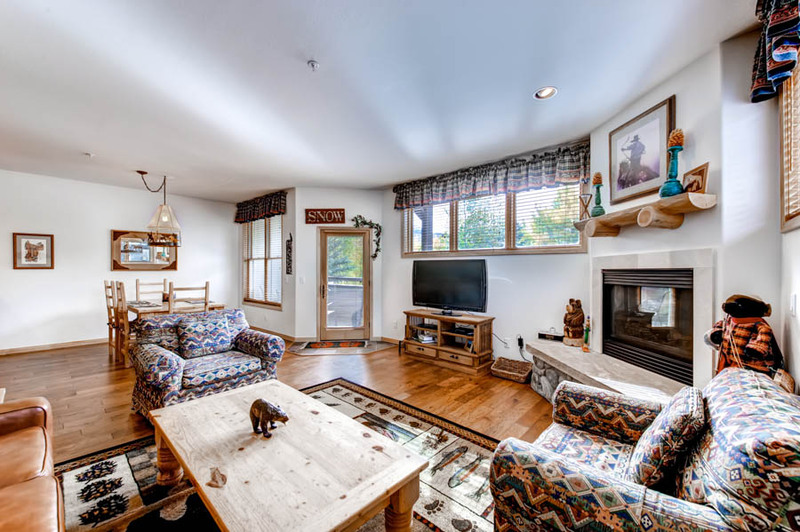 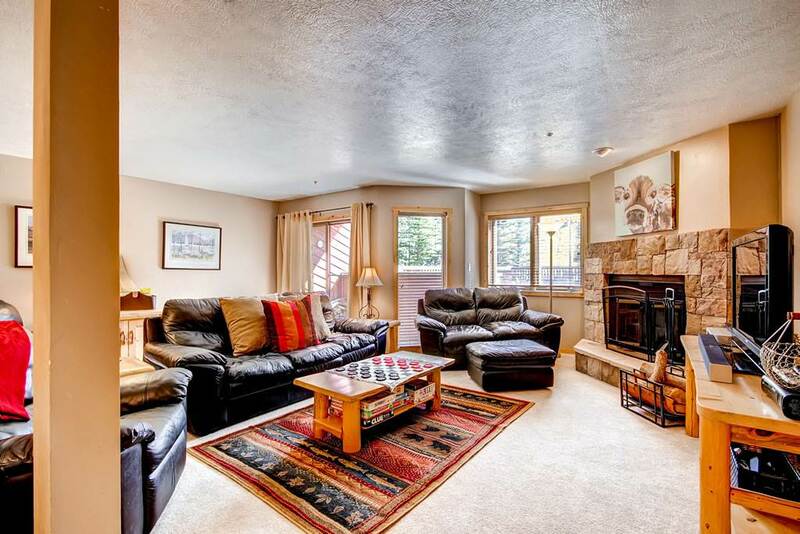 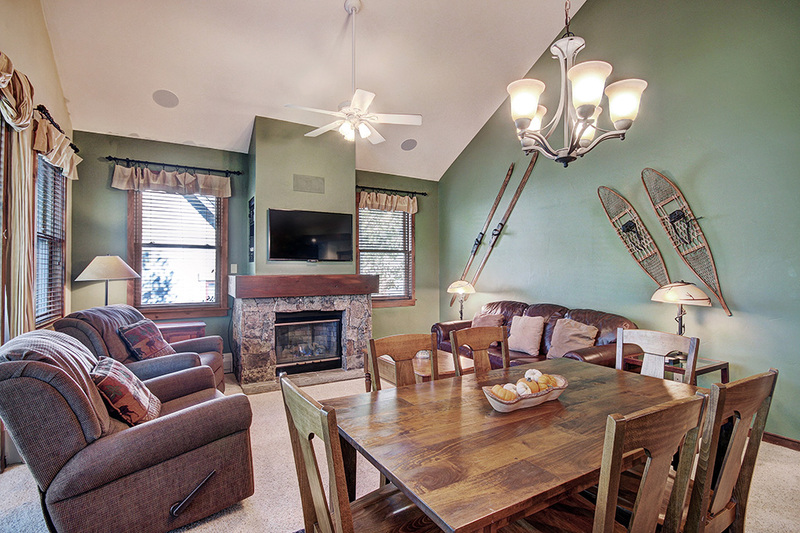 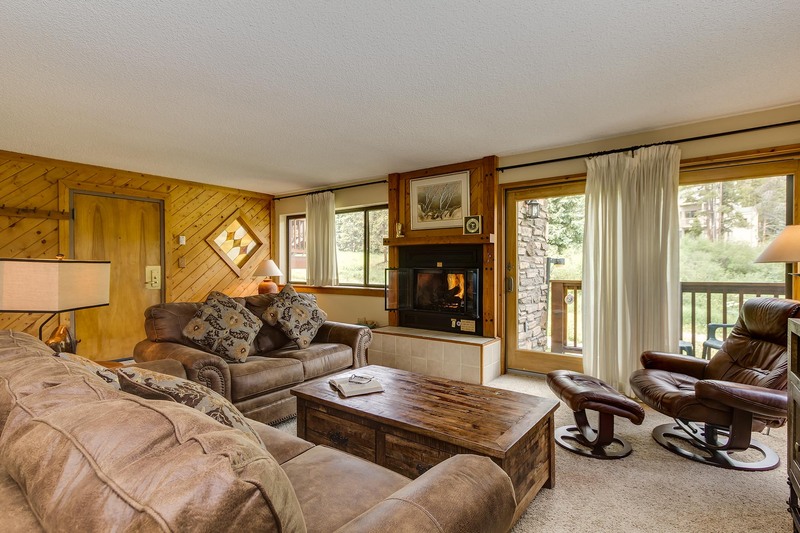 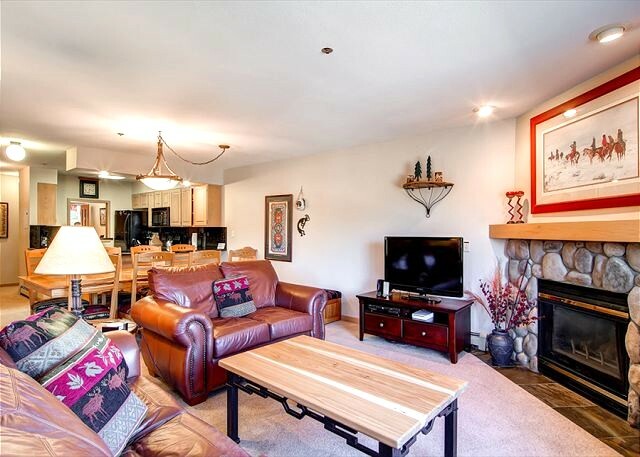 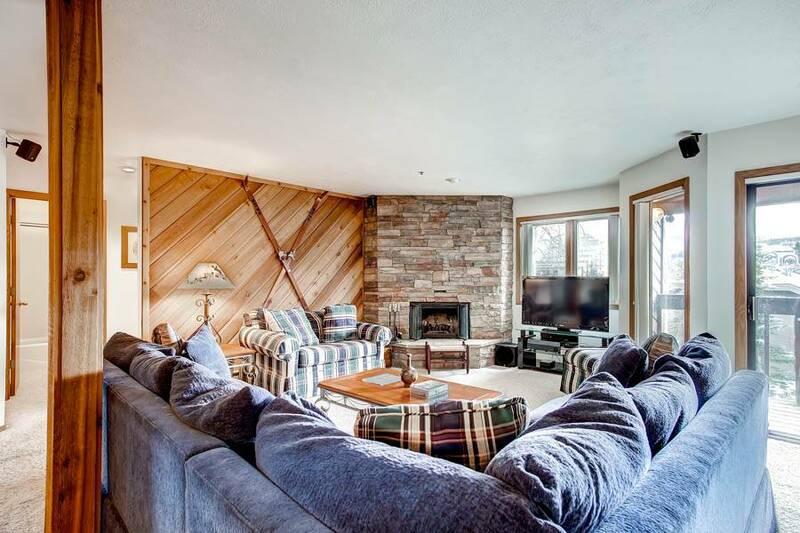 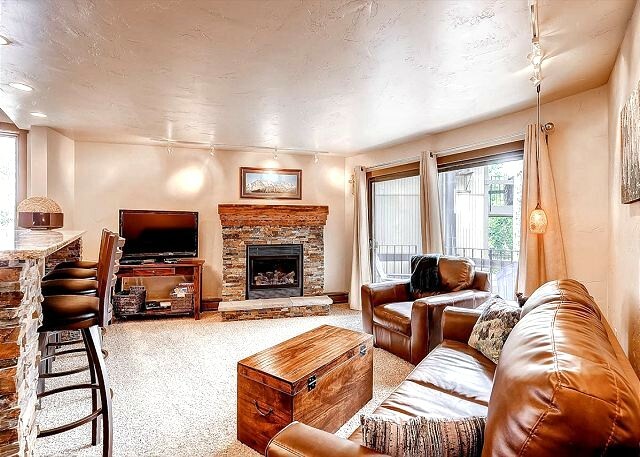 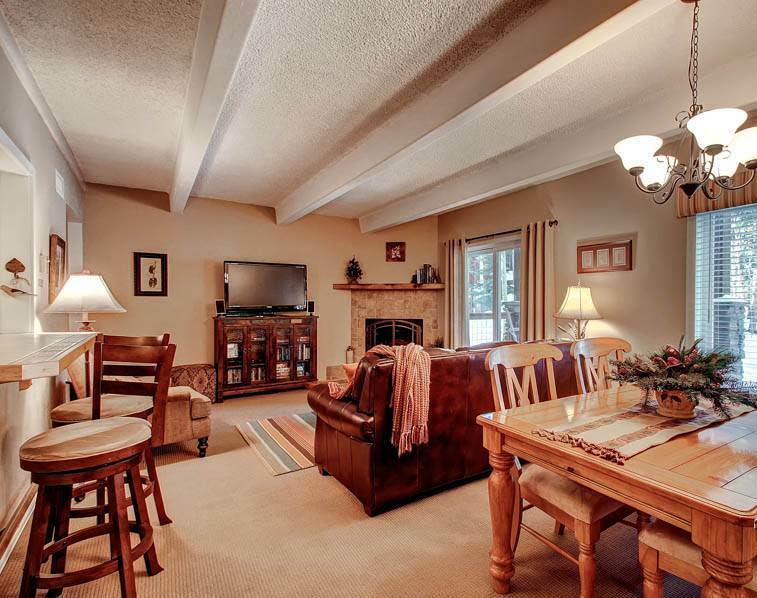 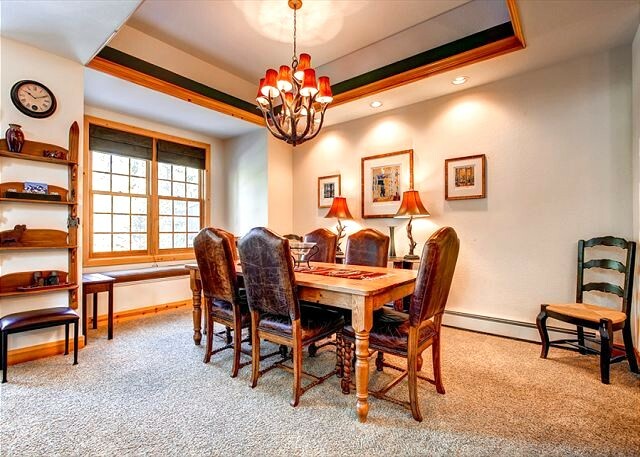 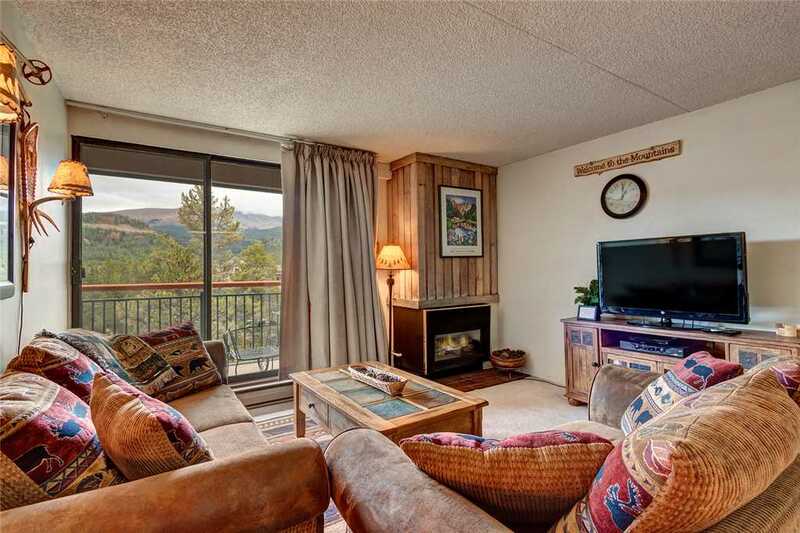 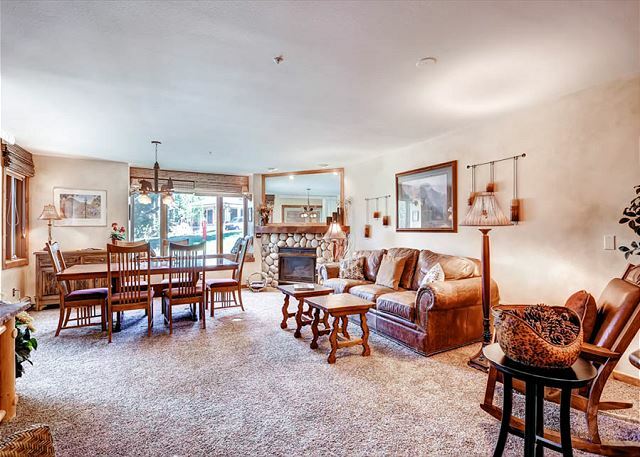 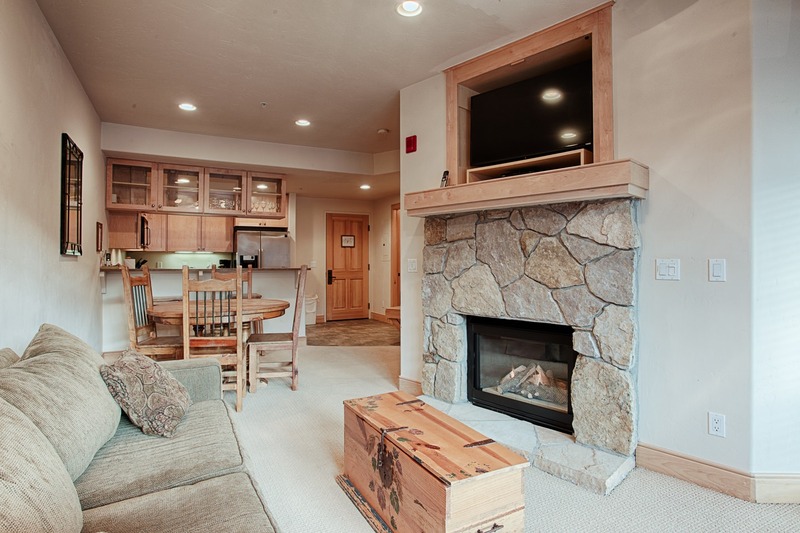 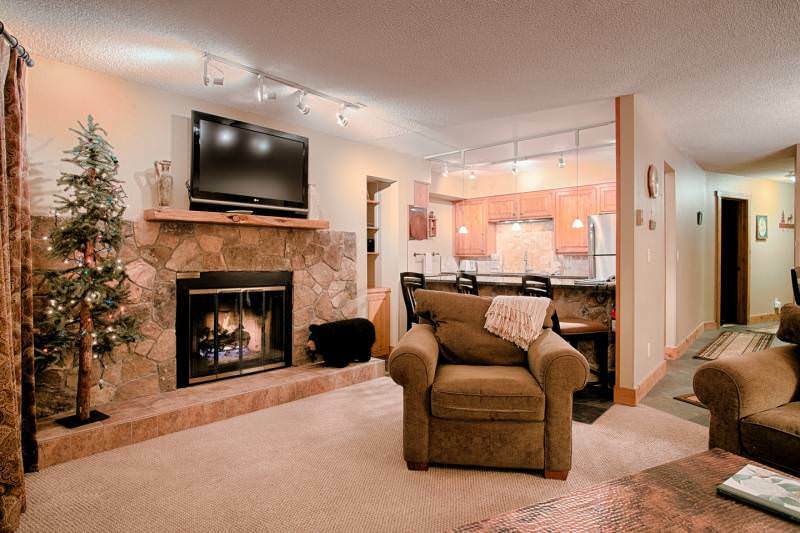 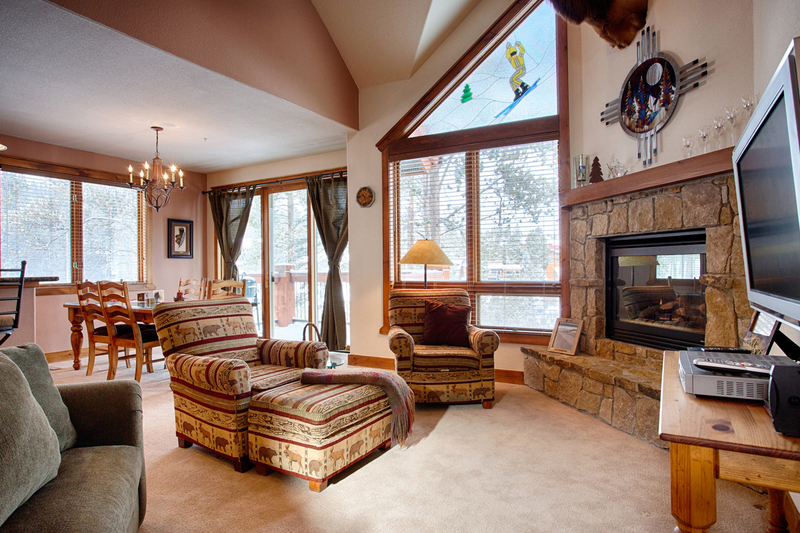 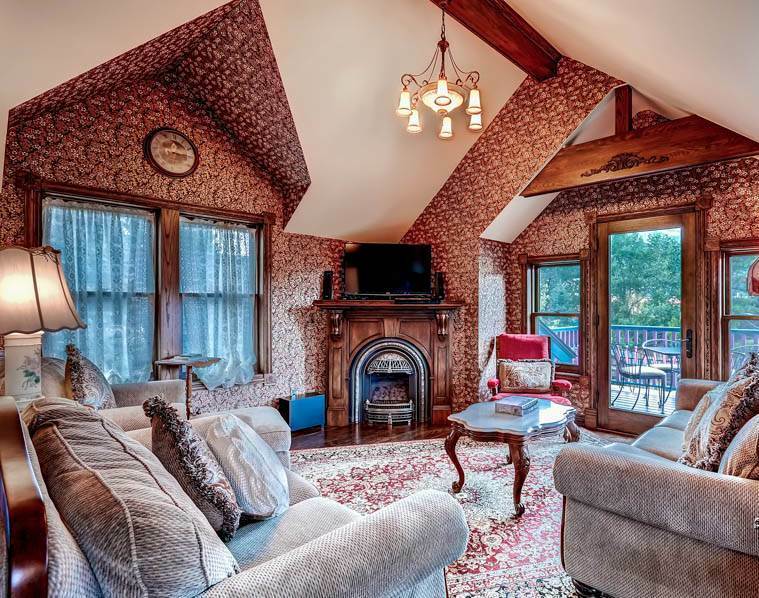 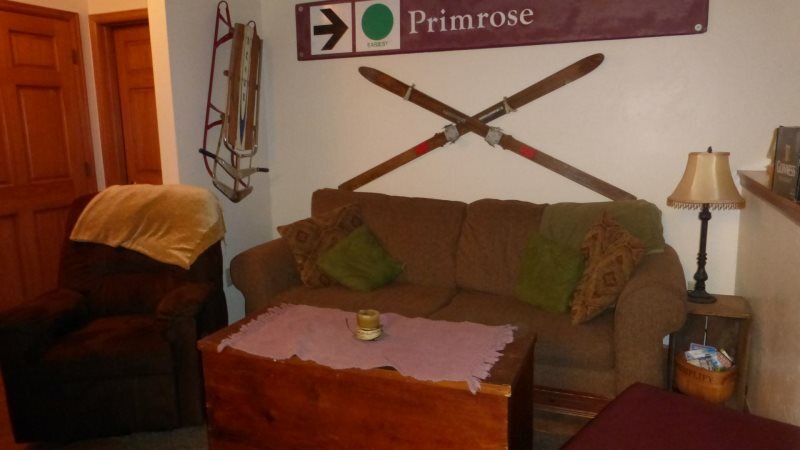 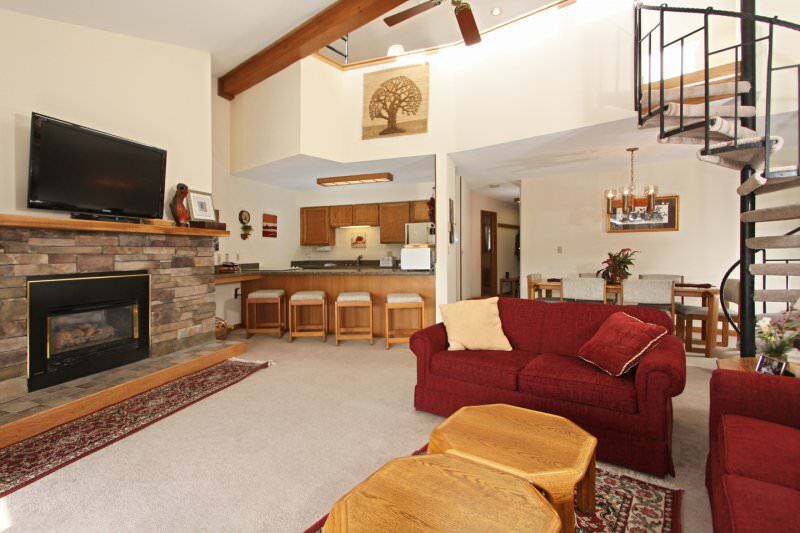 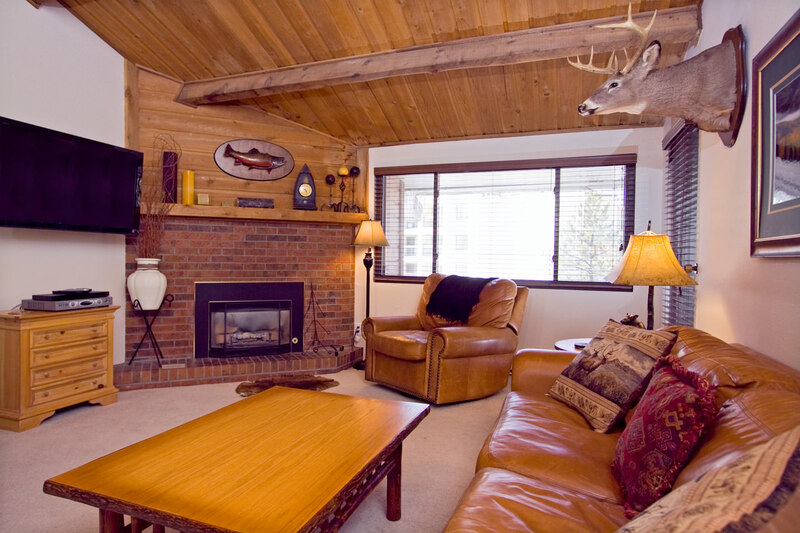 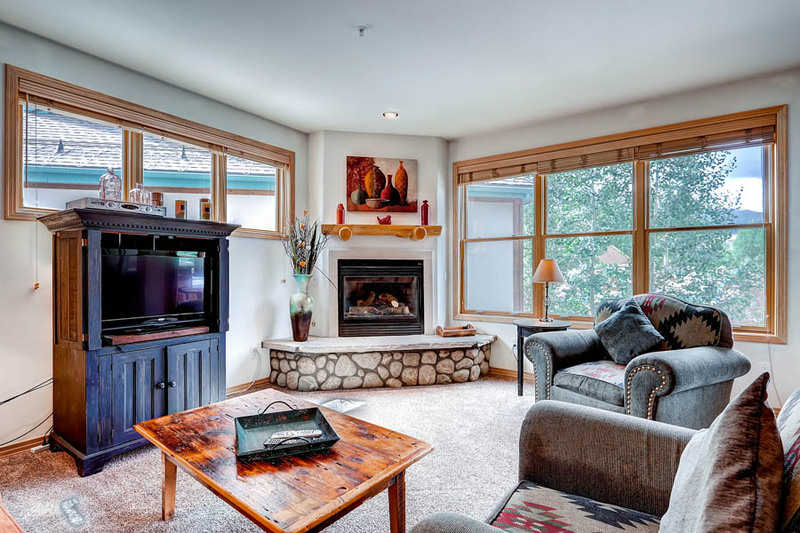 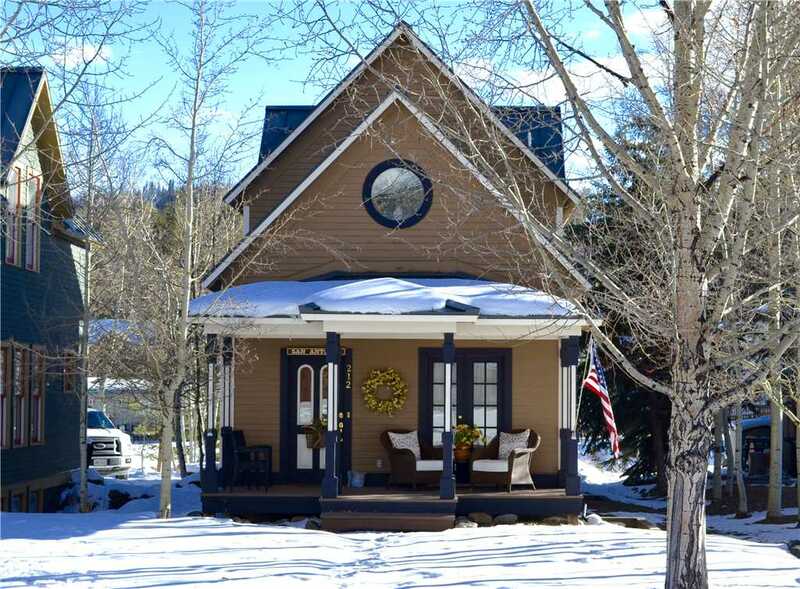 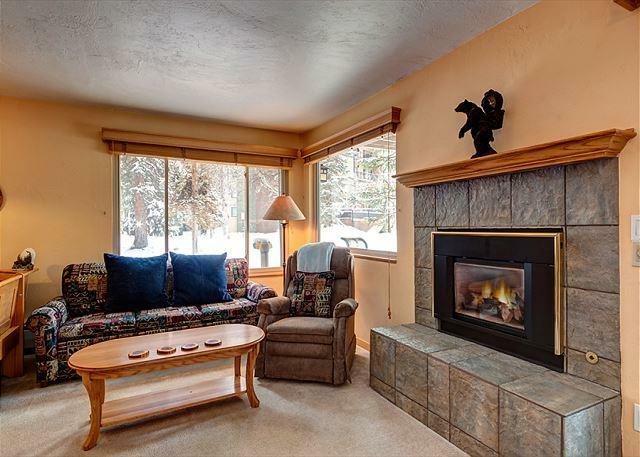 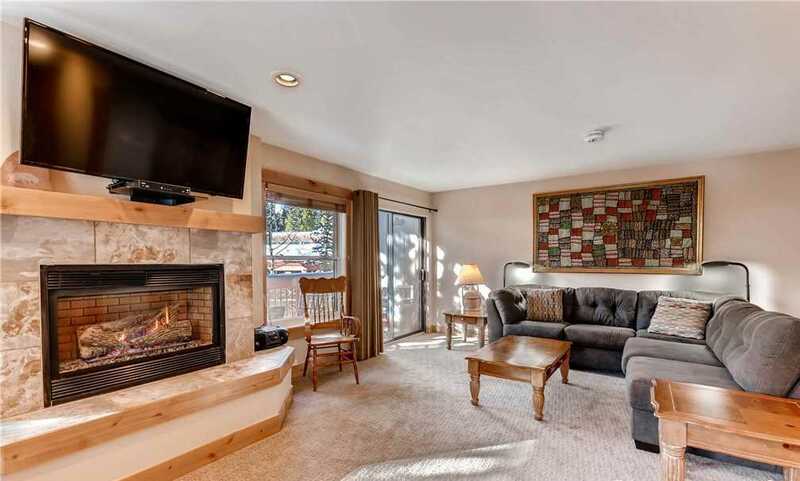 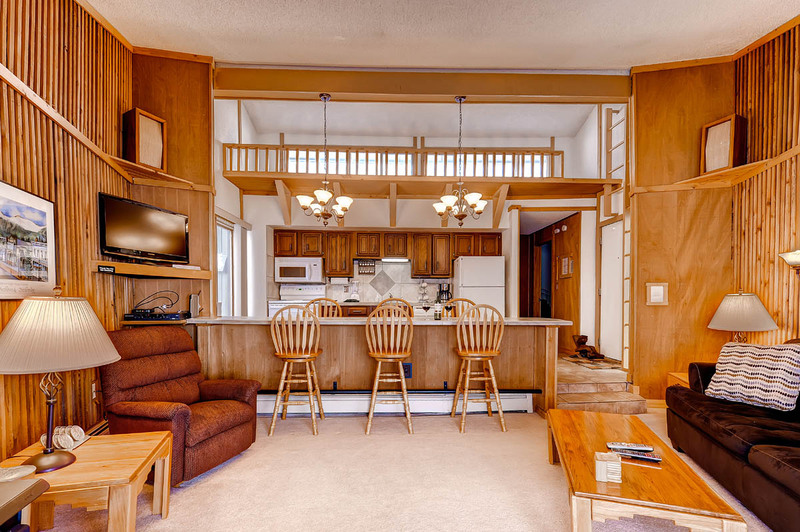 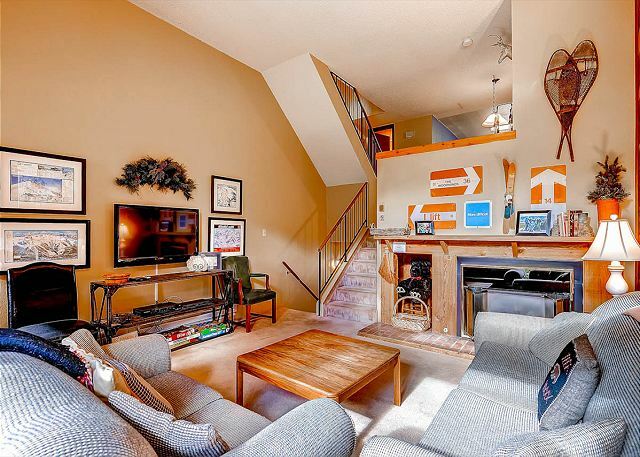 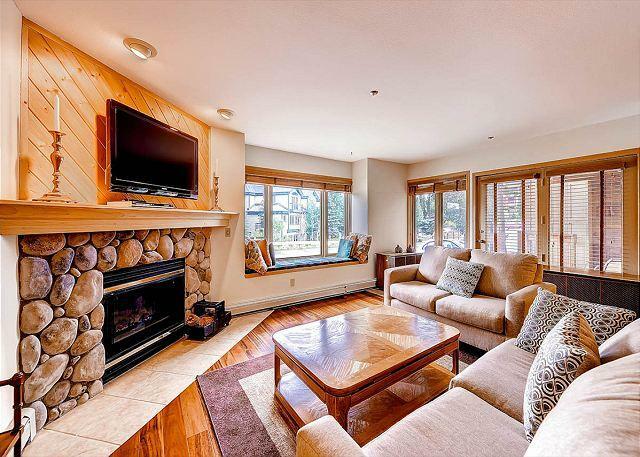 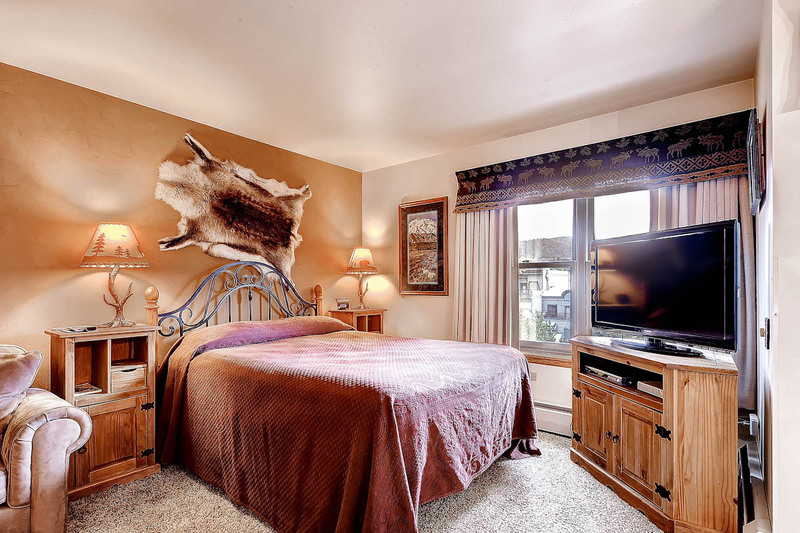 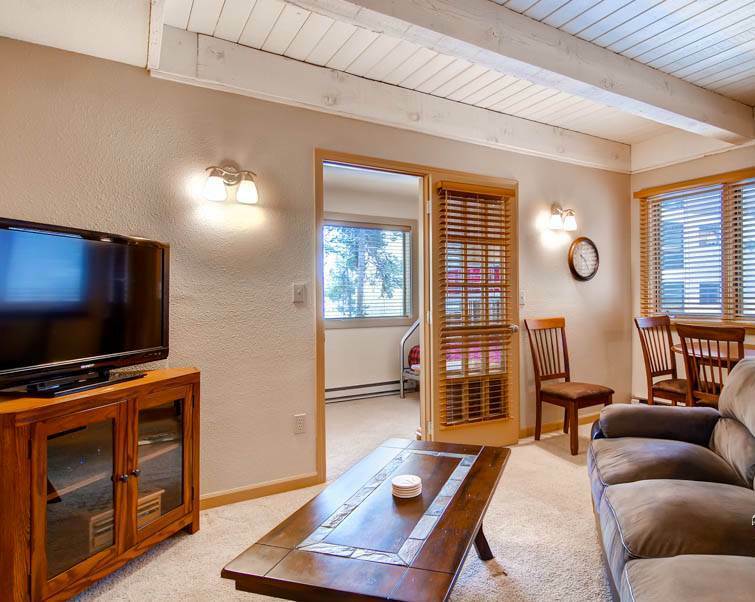 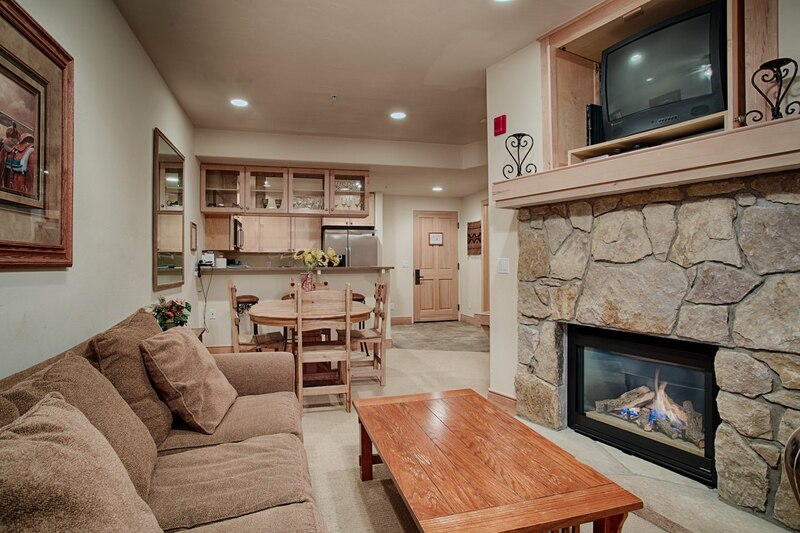 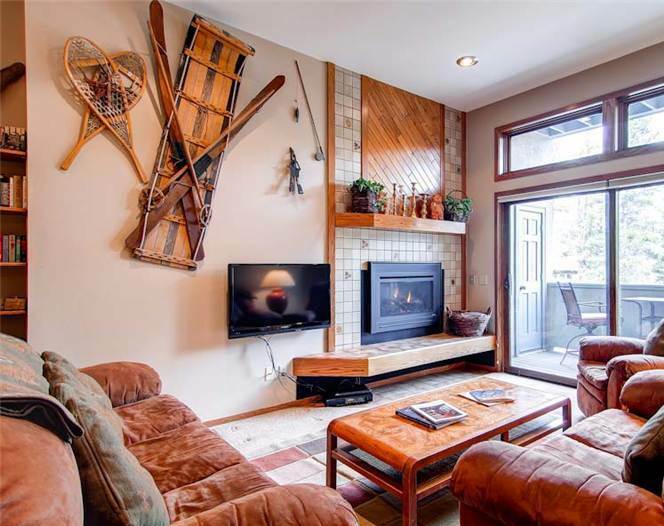 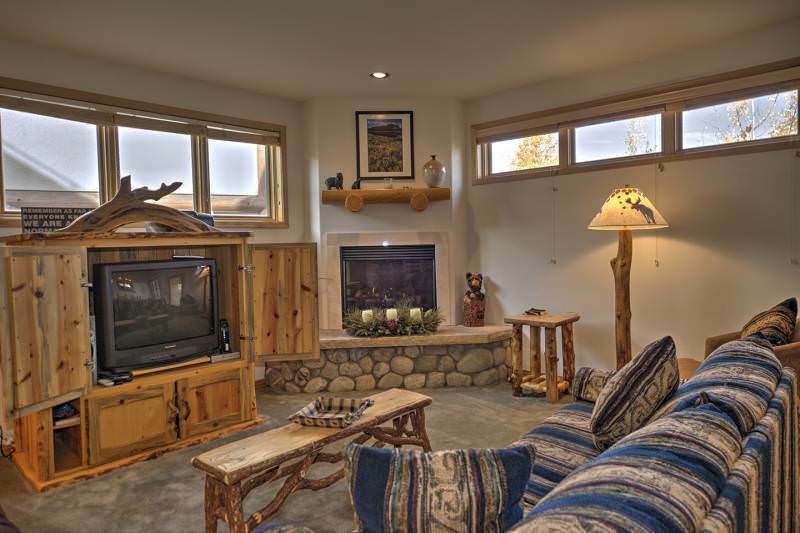 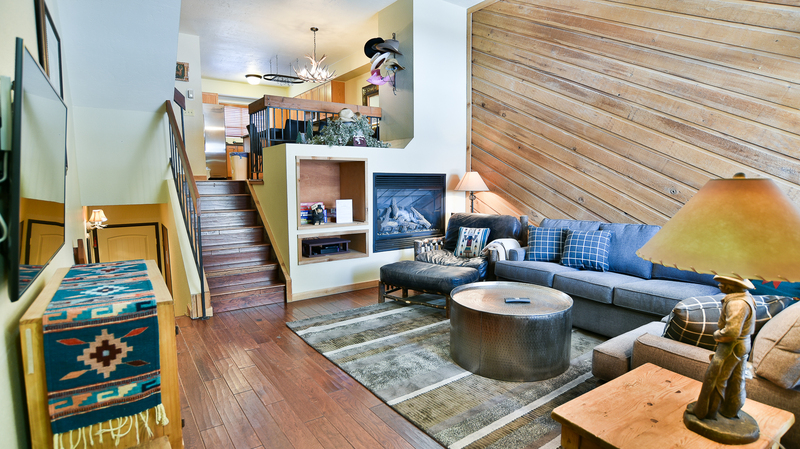 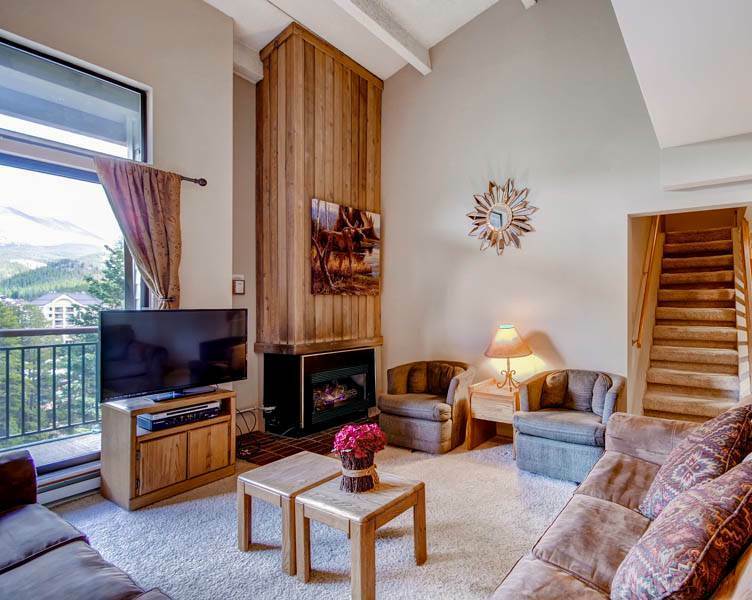 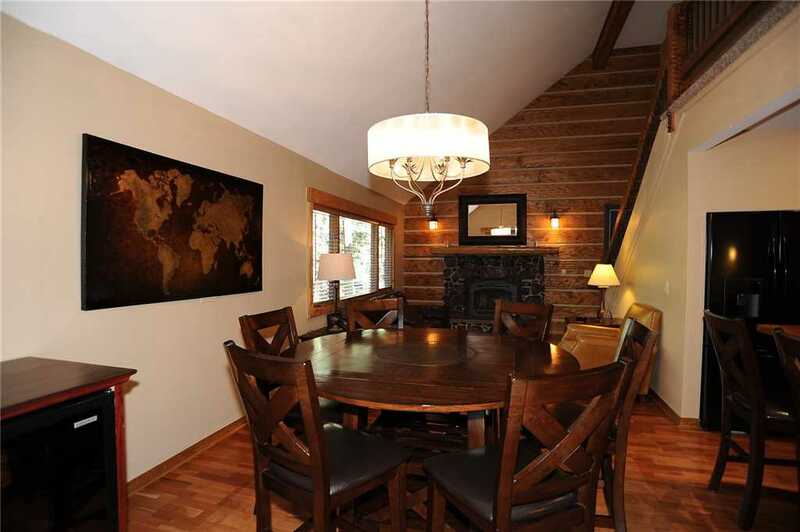 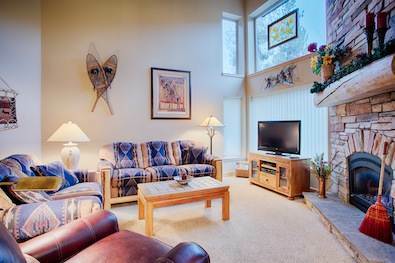 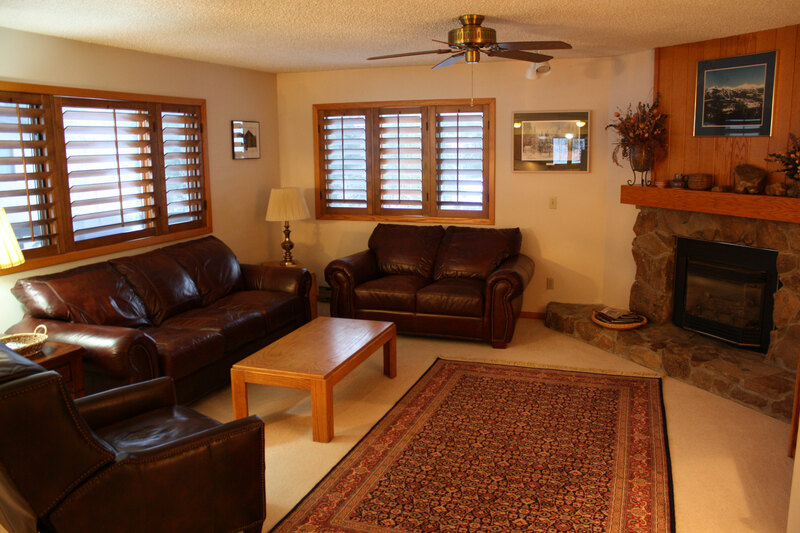 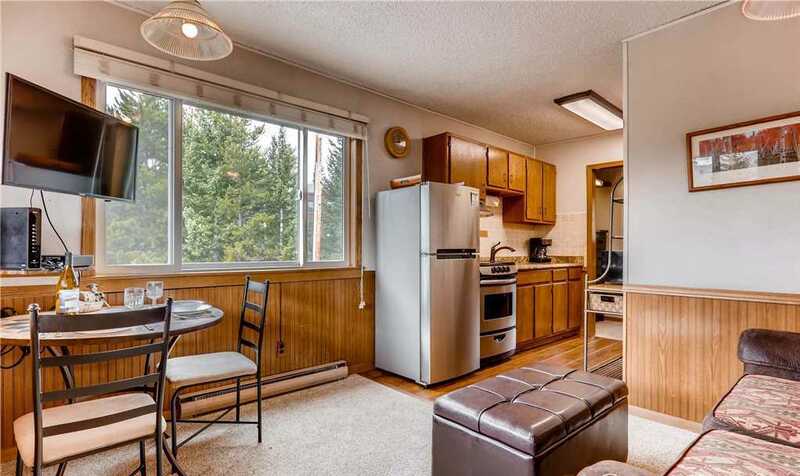 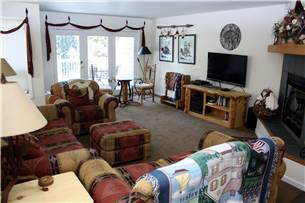 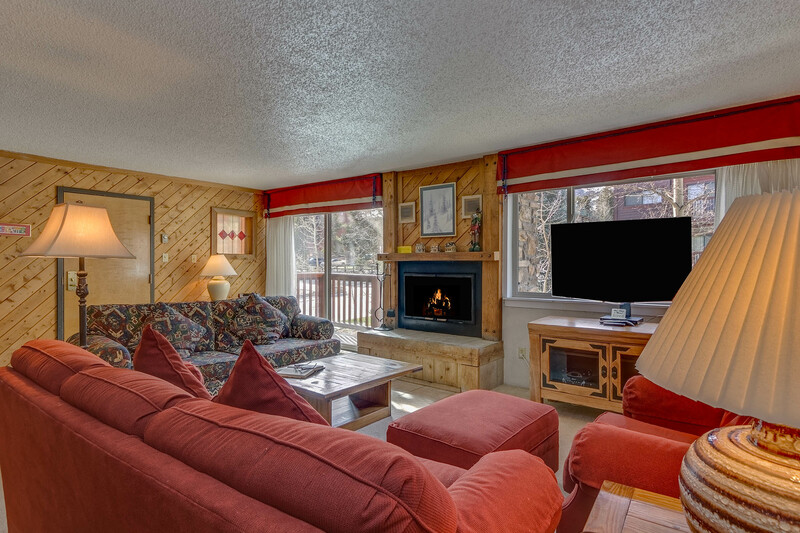 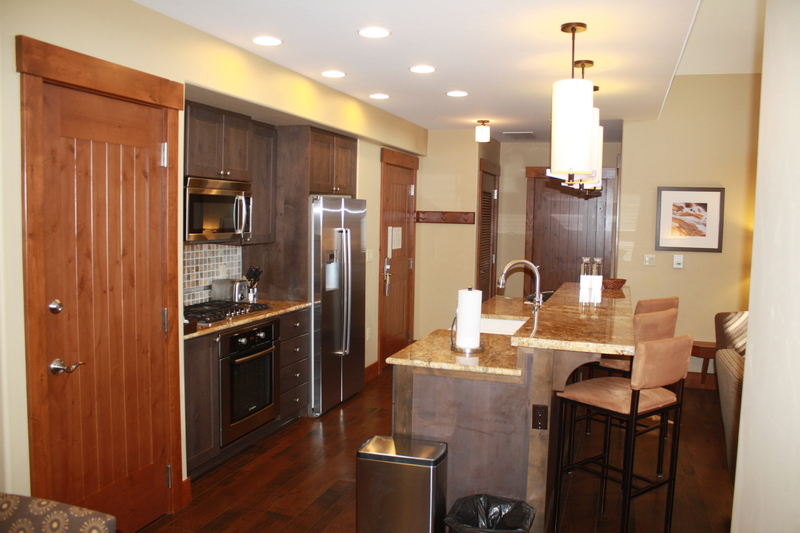 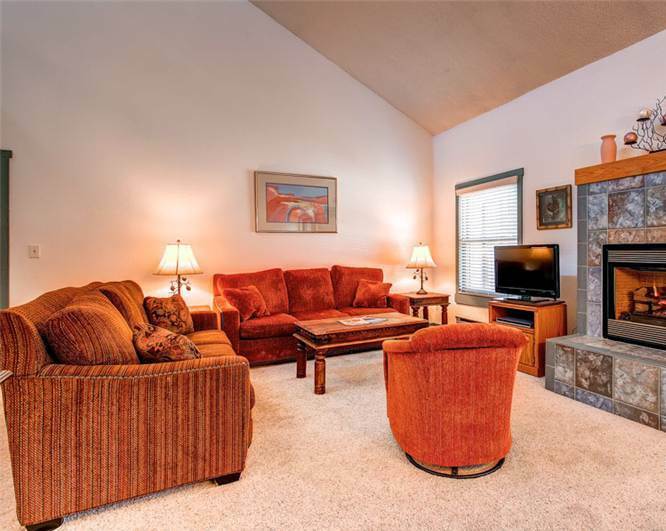 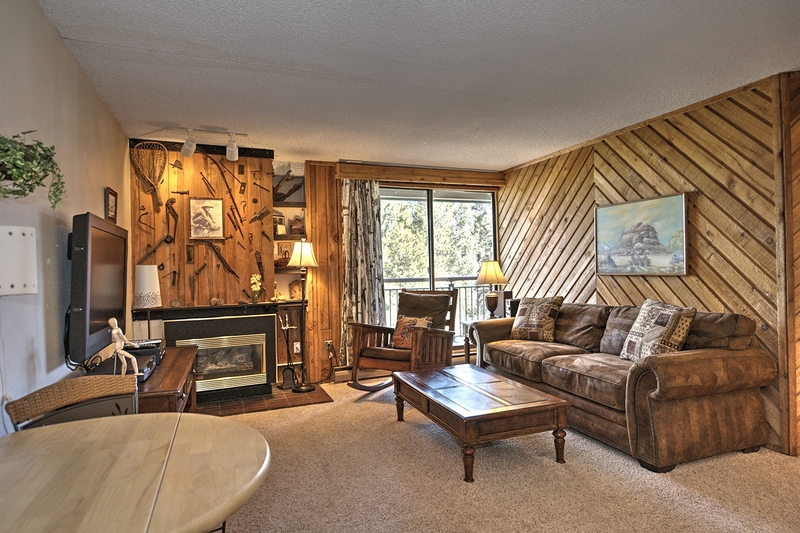 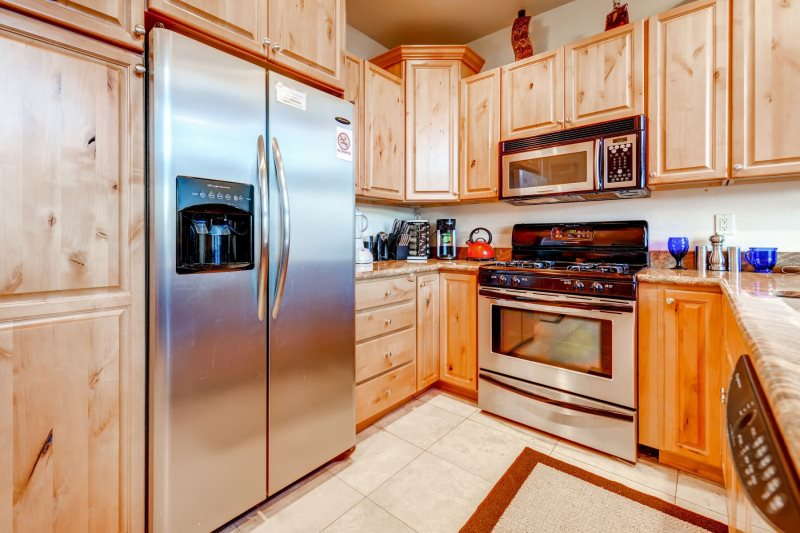 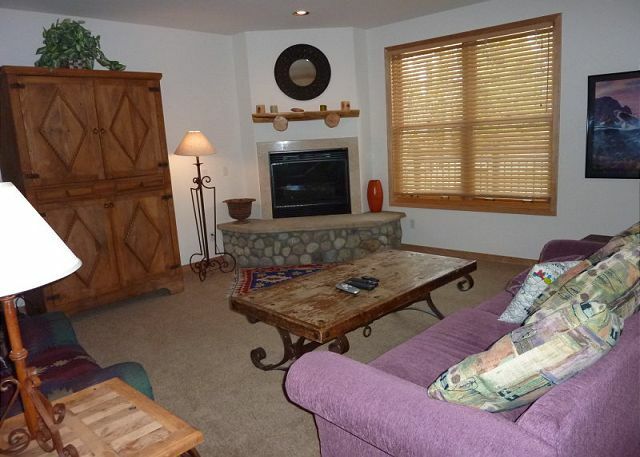 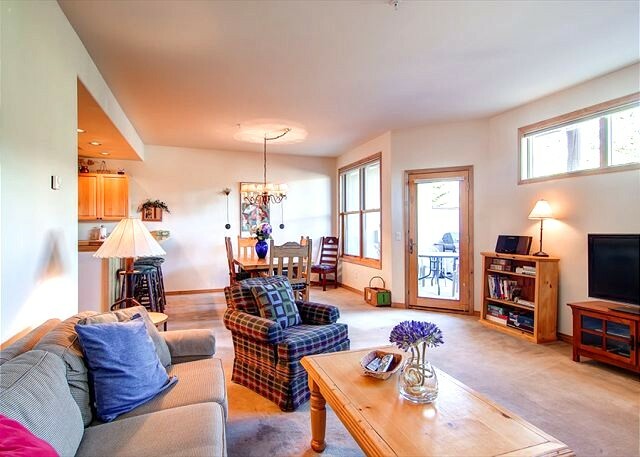 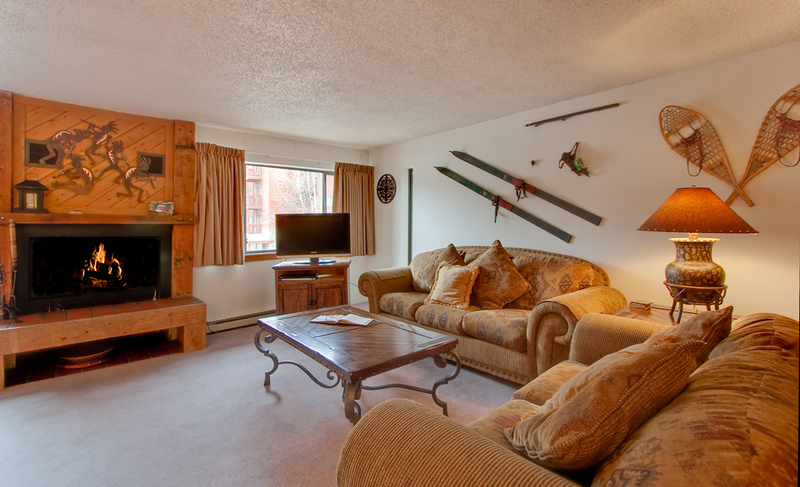 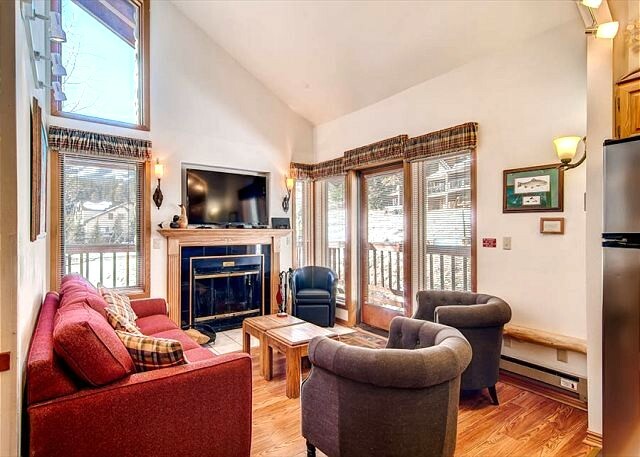 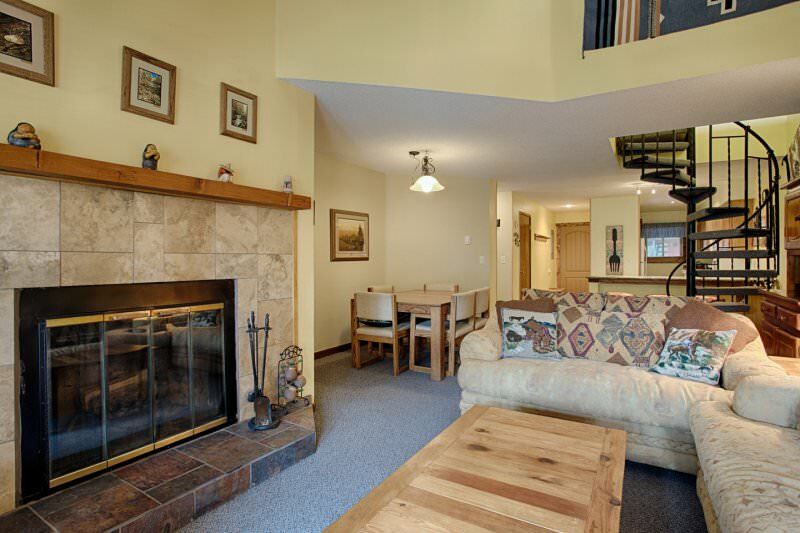 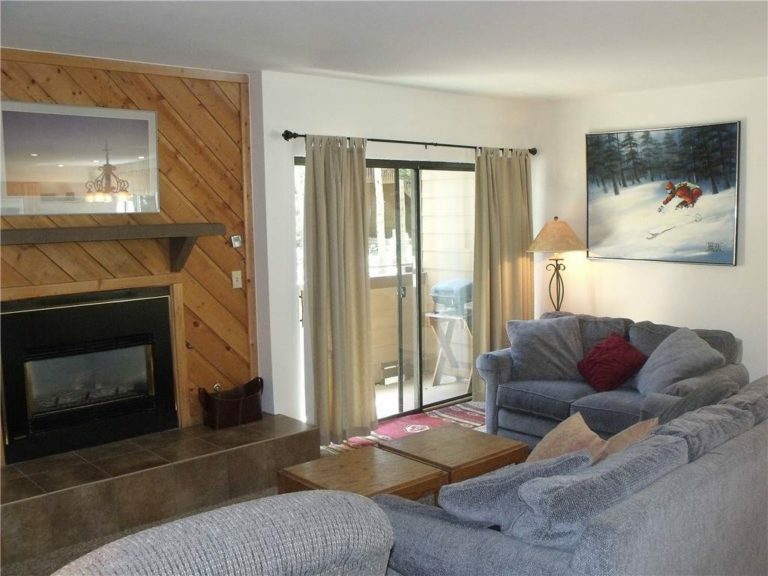 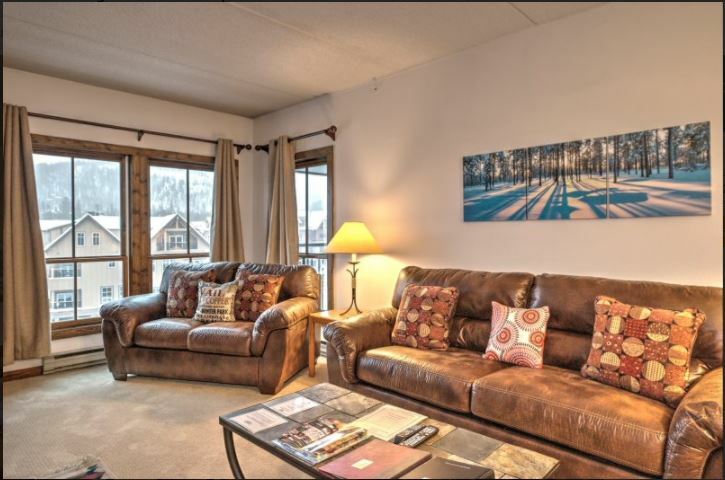 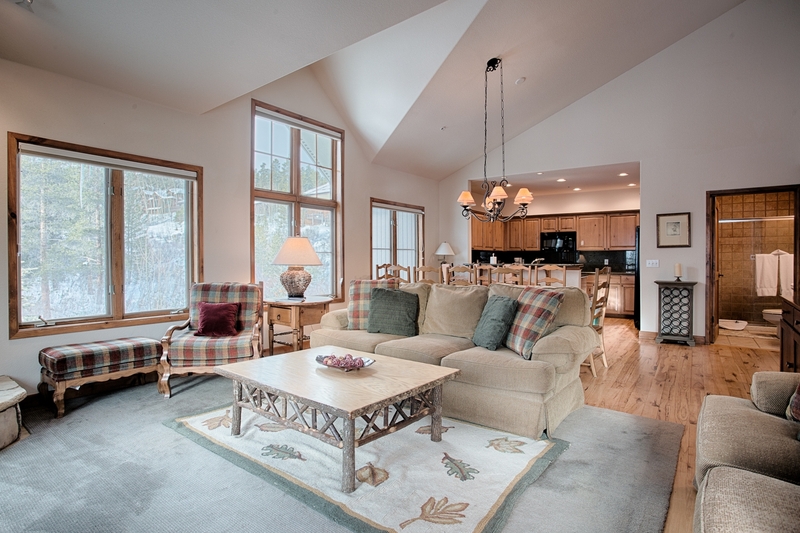 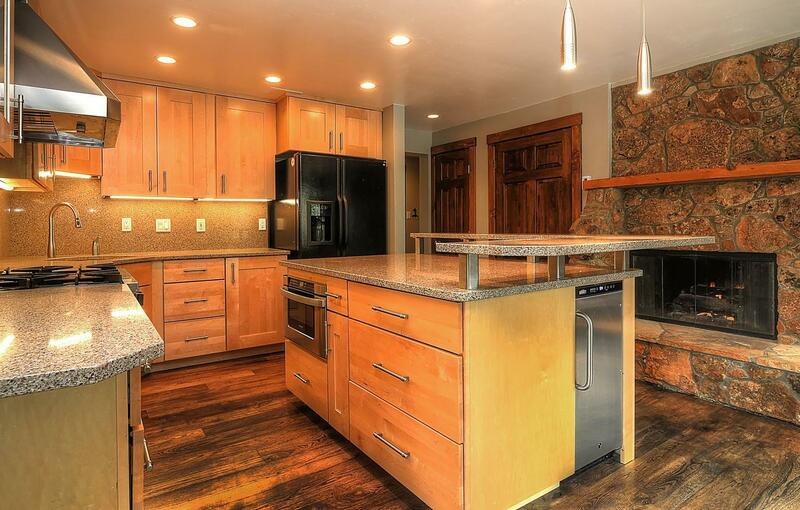 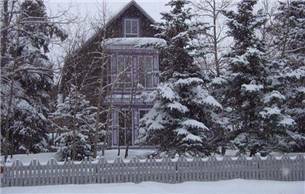 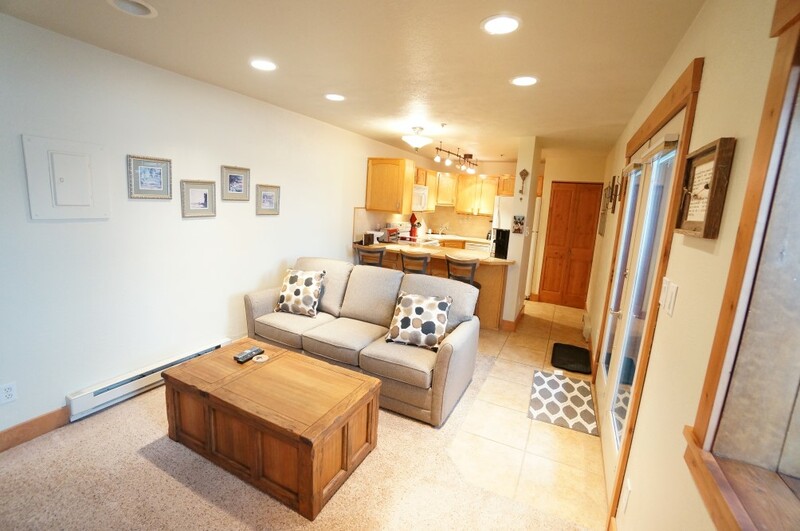 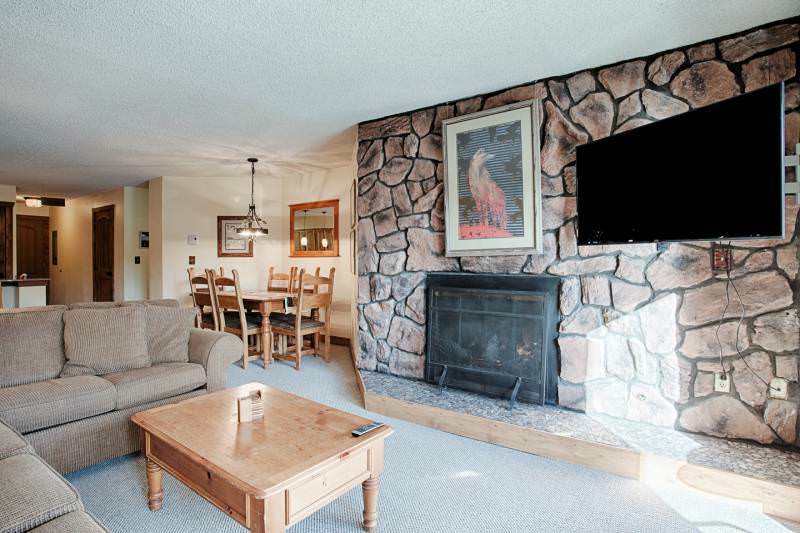 You will enjoy all the comforts of home in this first floor, one bedroom, 560 square foot unit which features a quaint, ski town feel. 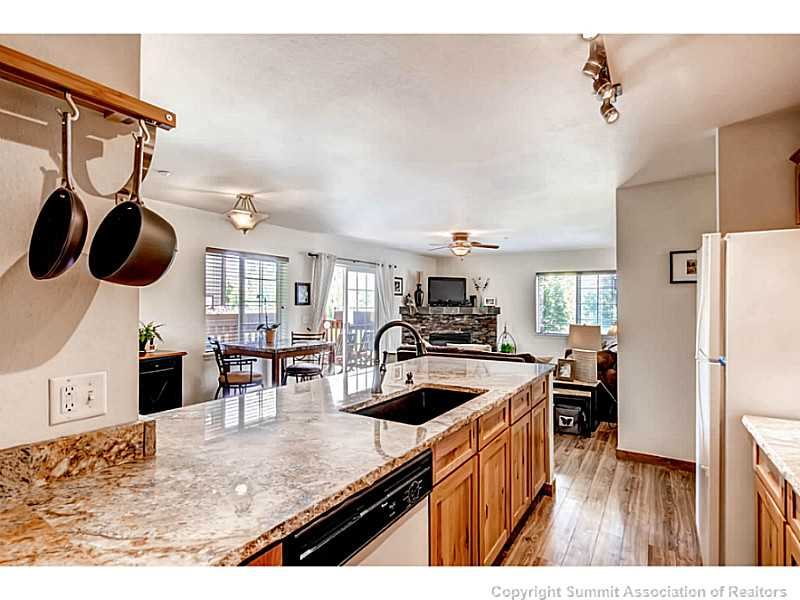 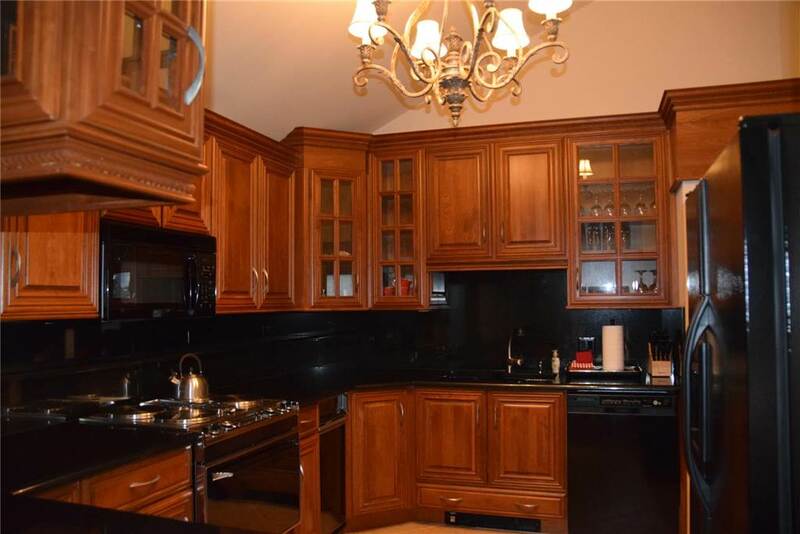 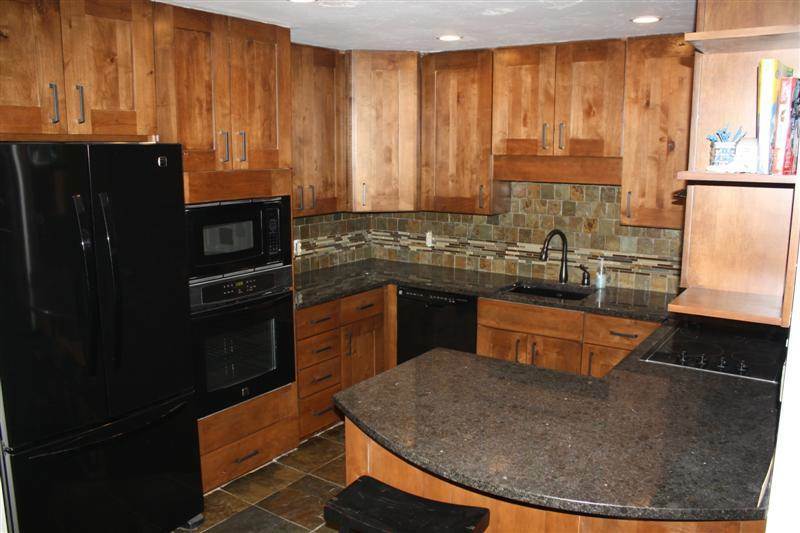 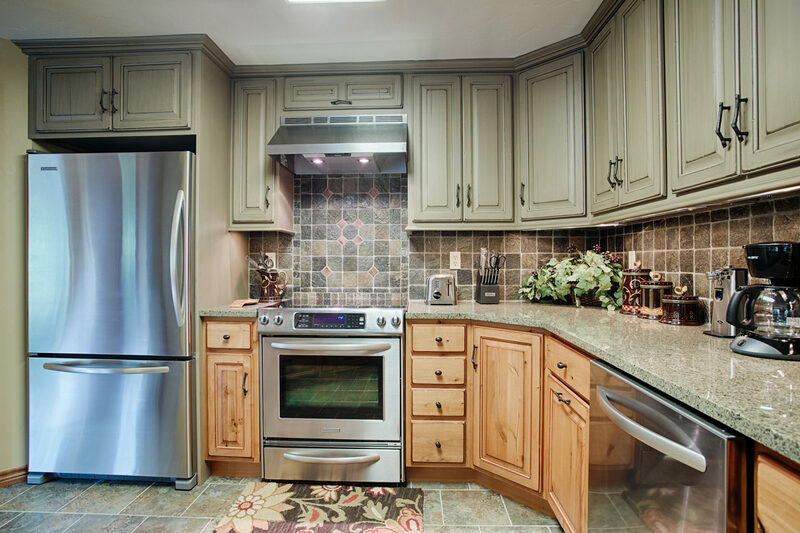 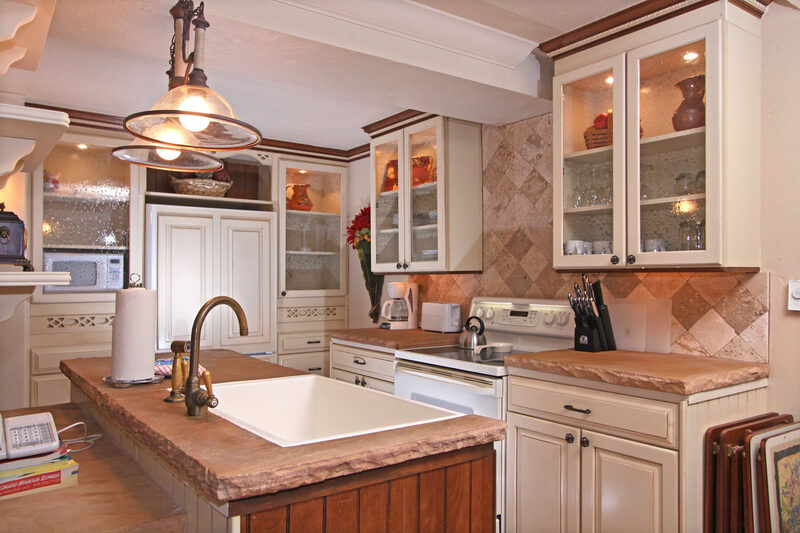 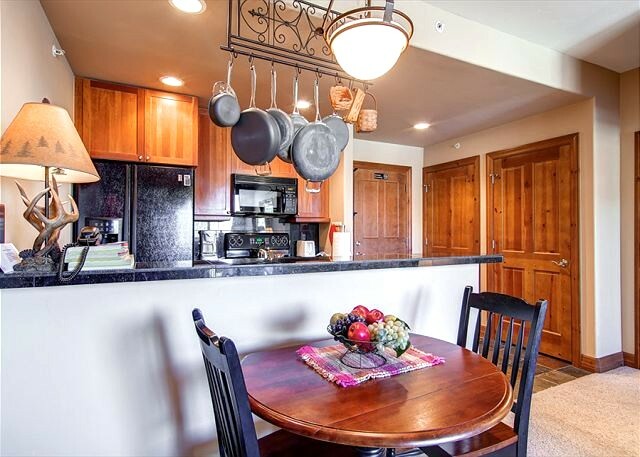 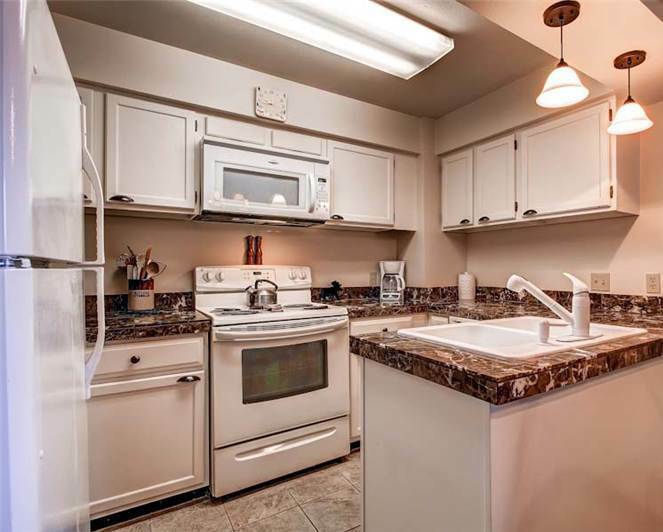 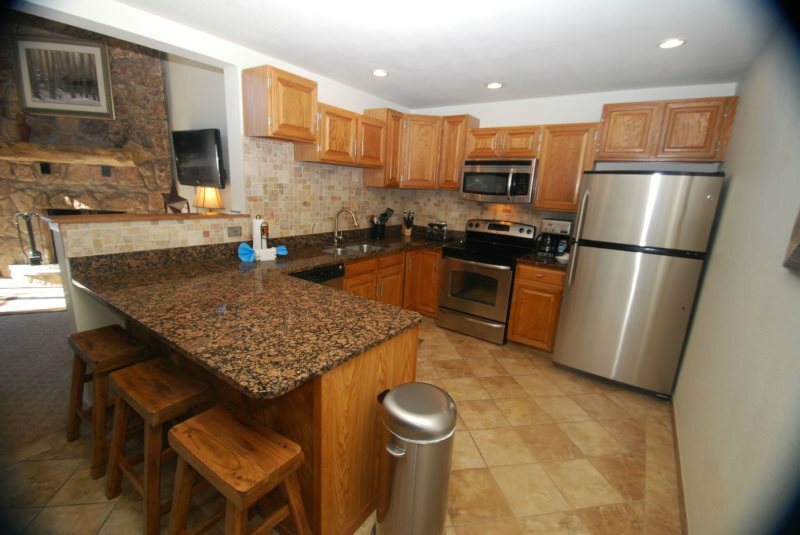 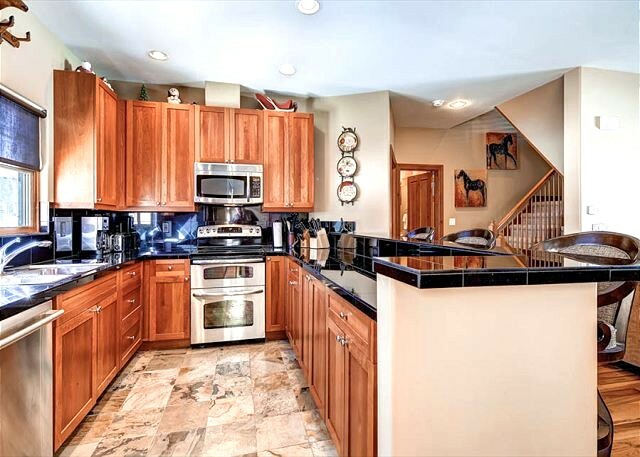 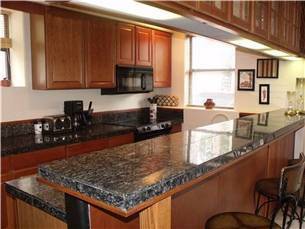 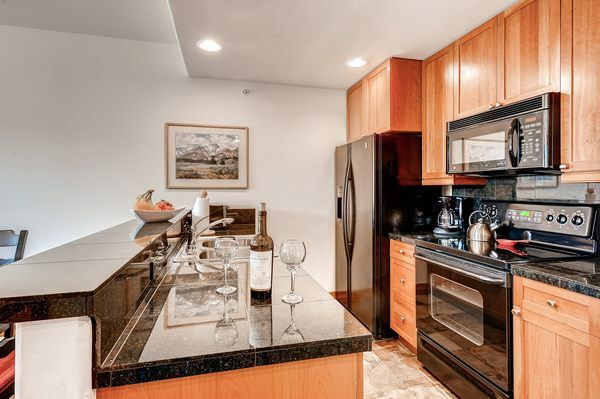 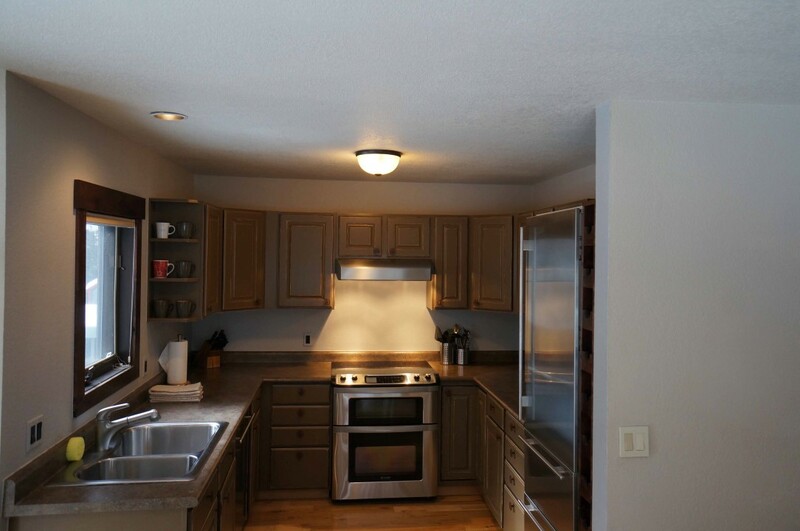 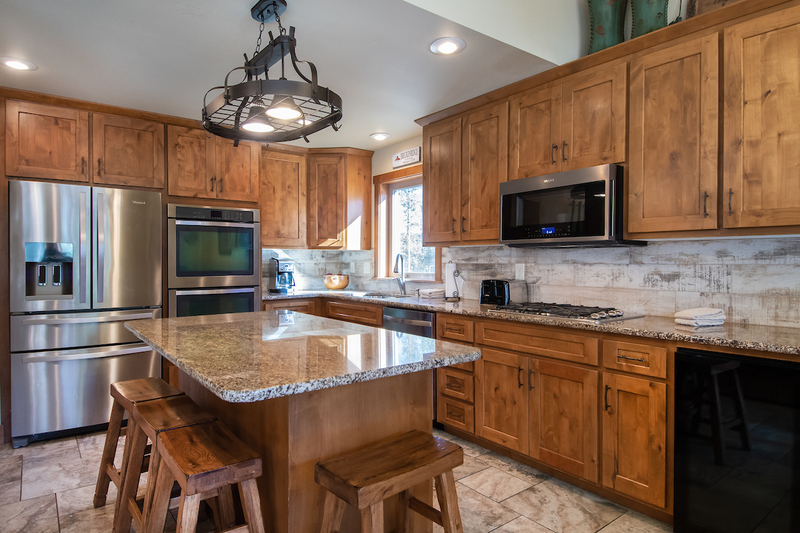 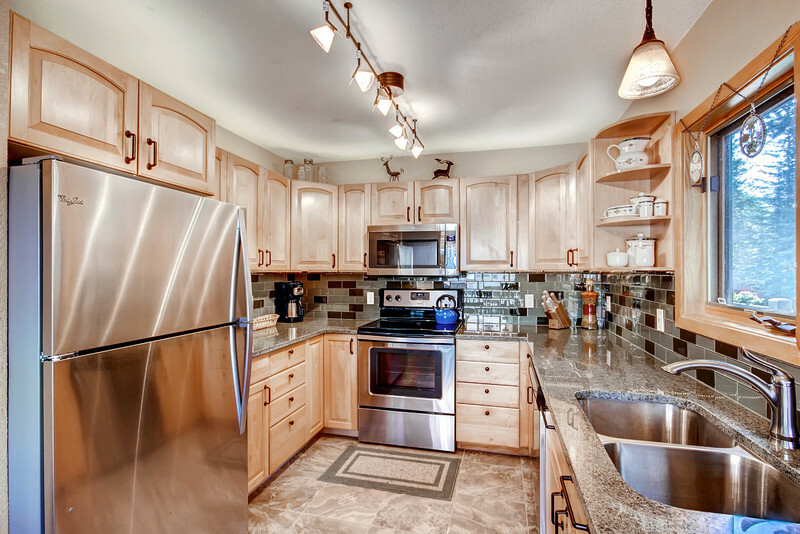 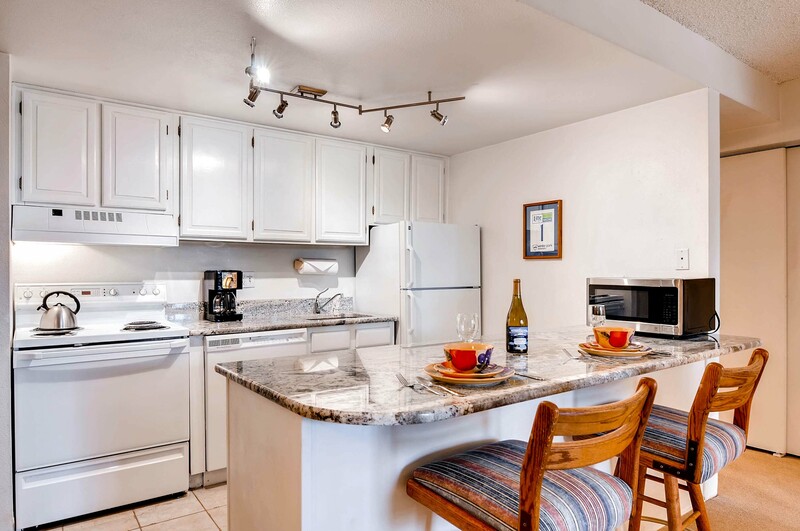 The newly renovated kitchen with granite counter tops is fully equipped with all glassware, dishware and cooking utensils you will need to make, and serve, your favorite home-cooked dish. 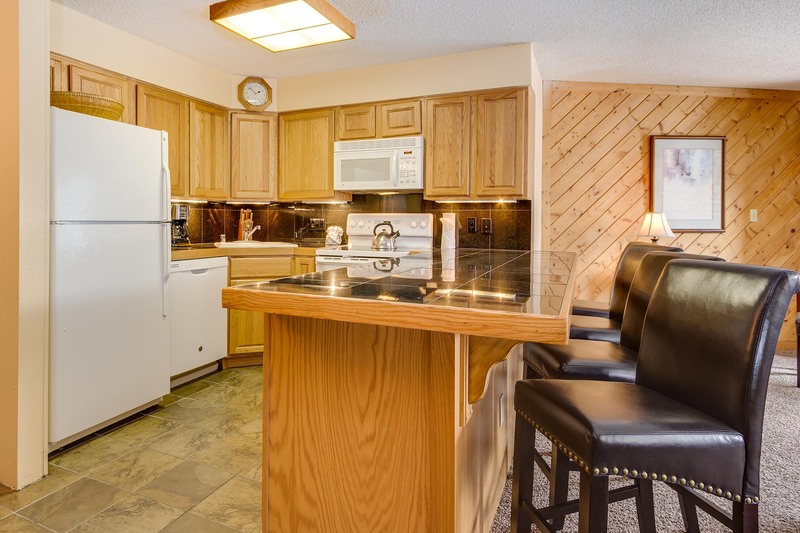 The one bedroom, one bathroom unit offers all the necessary appliances; microwave, stove, oven, dishwasher, refrigerator and coffee maker. 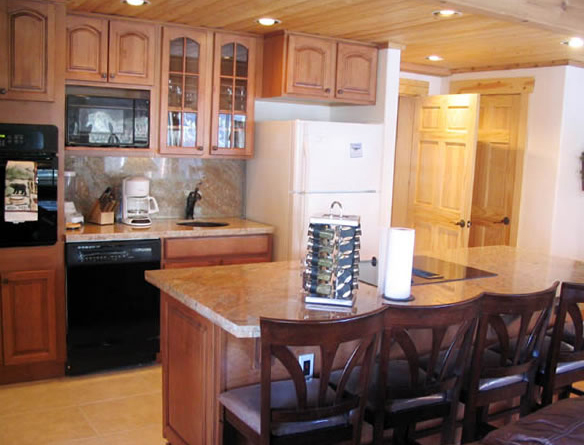 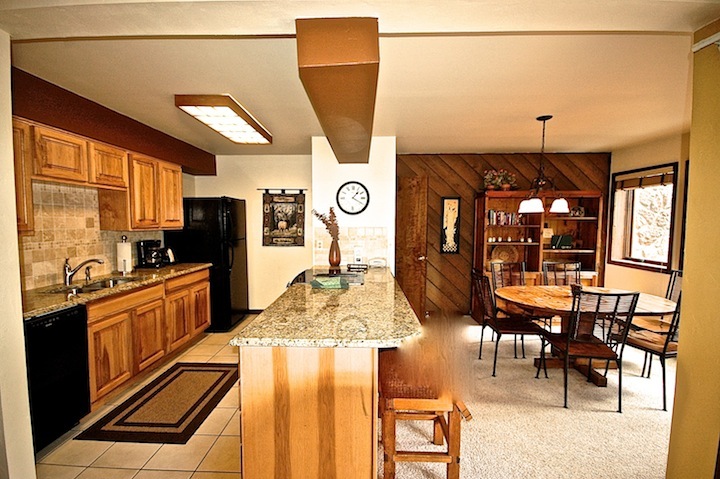 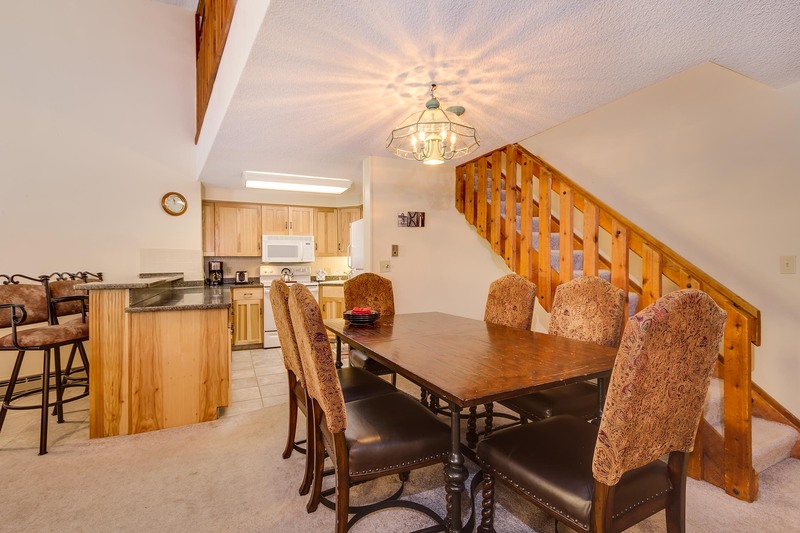 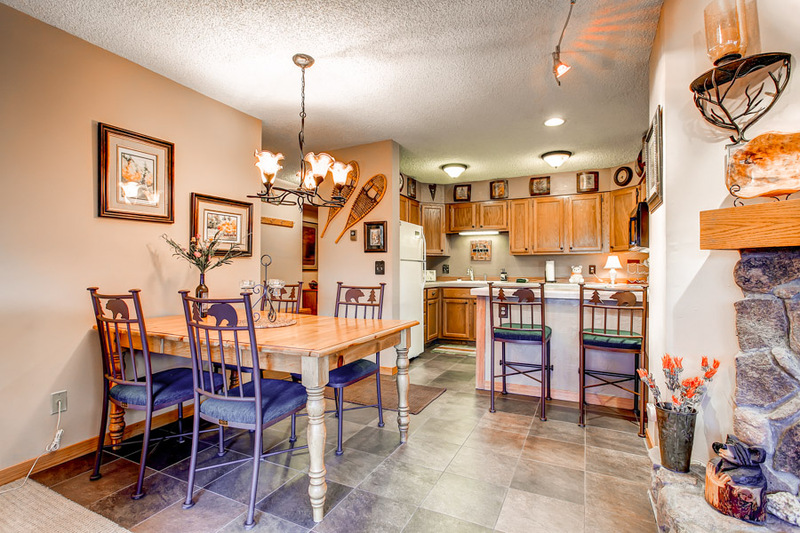 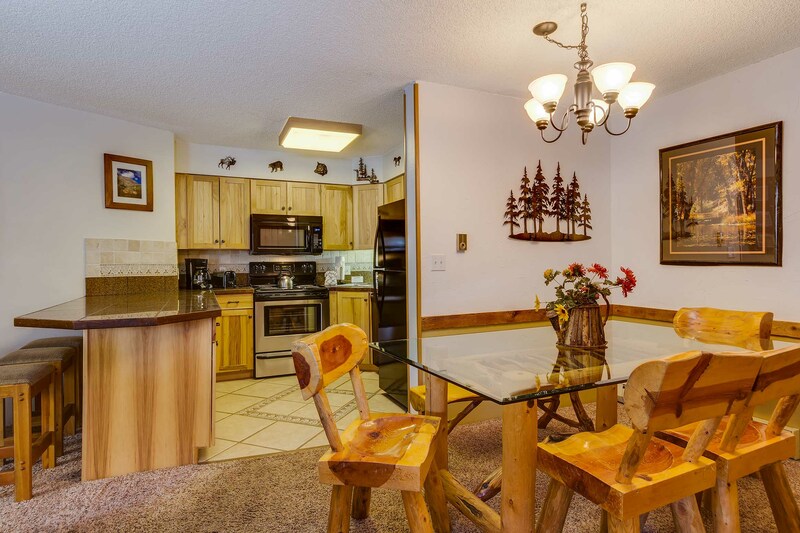 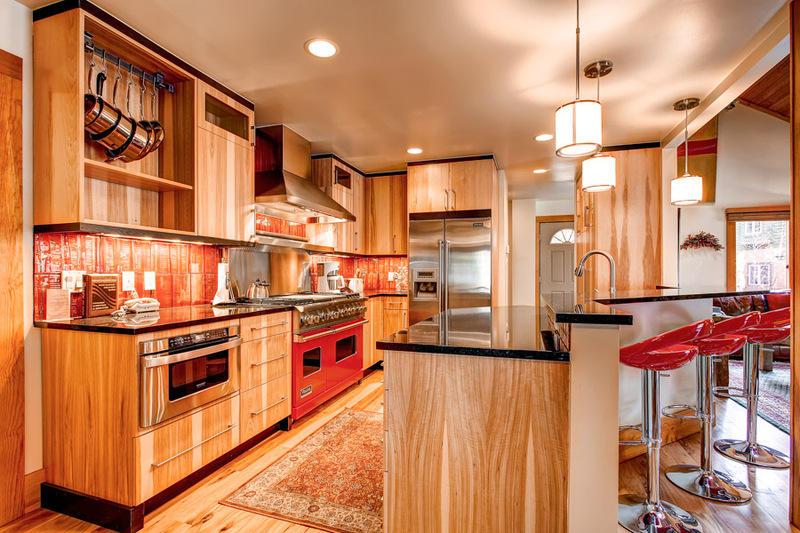 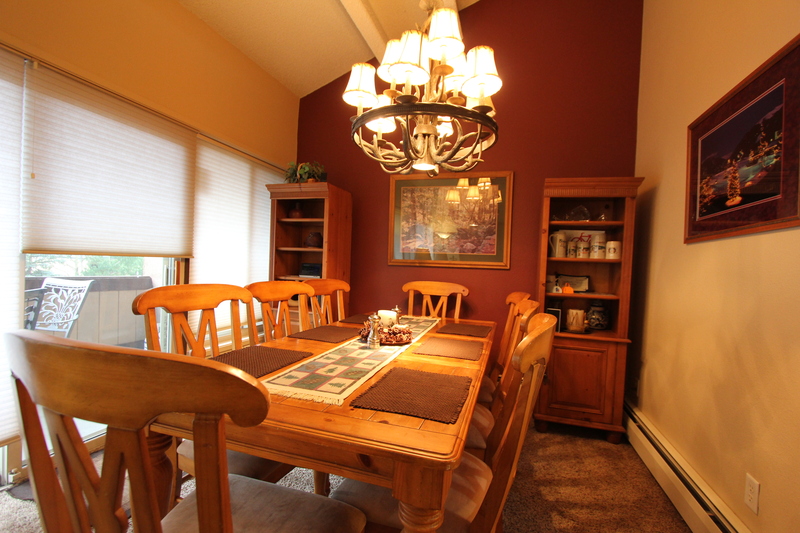 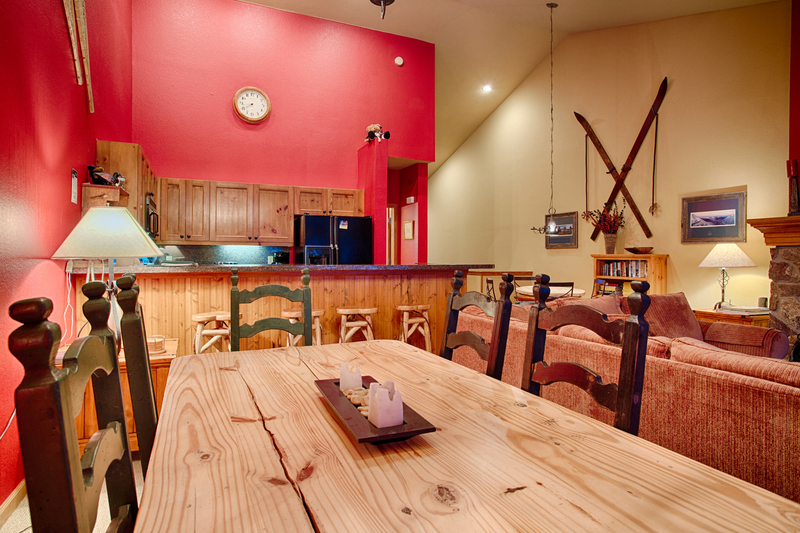 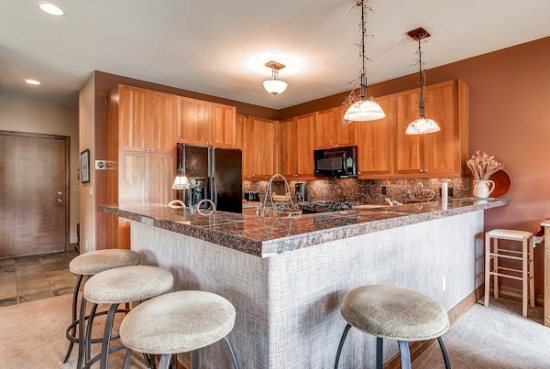 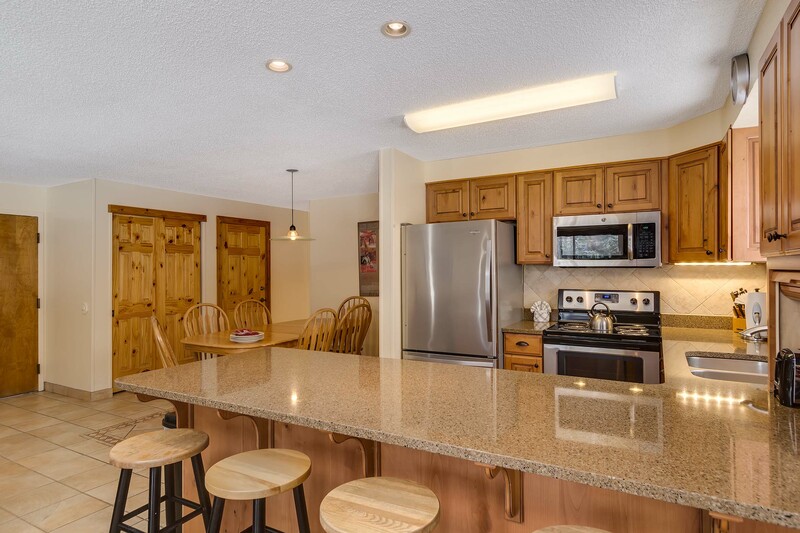 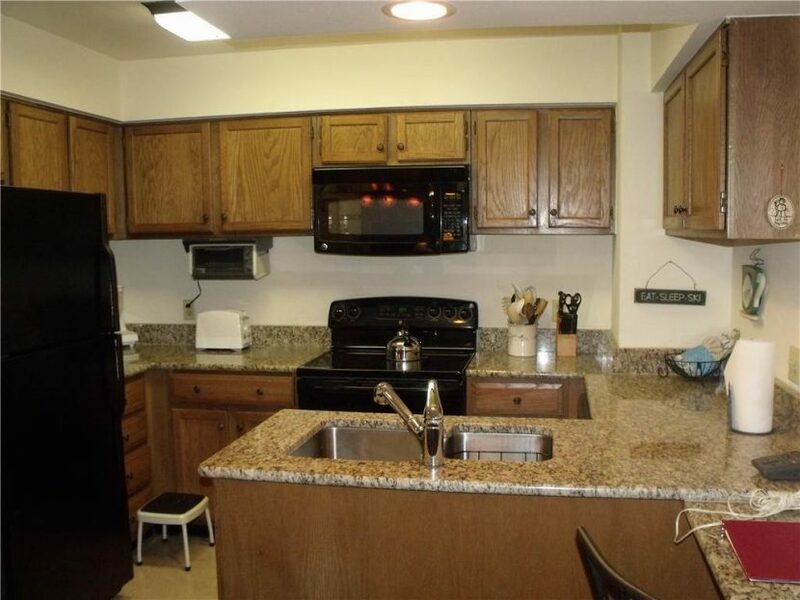 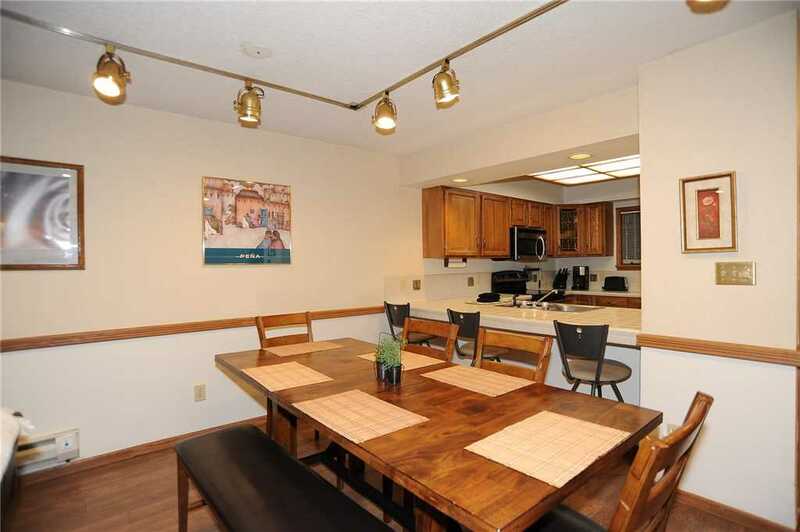 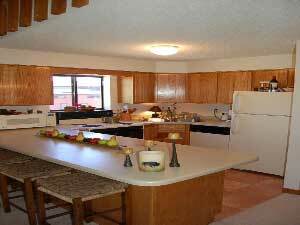 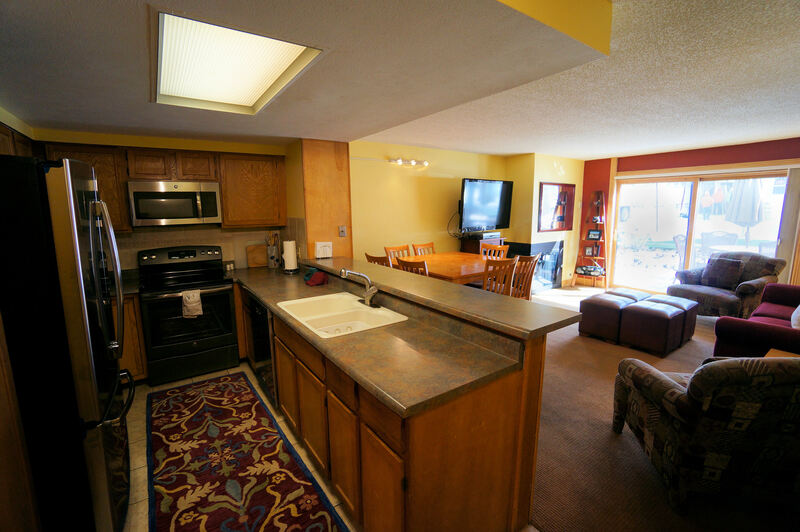 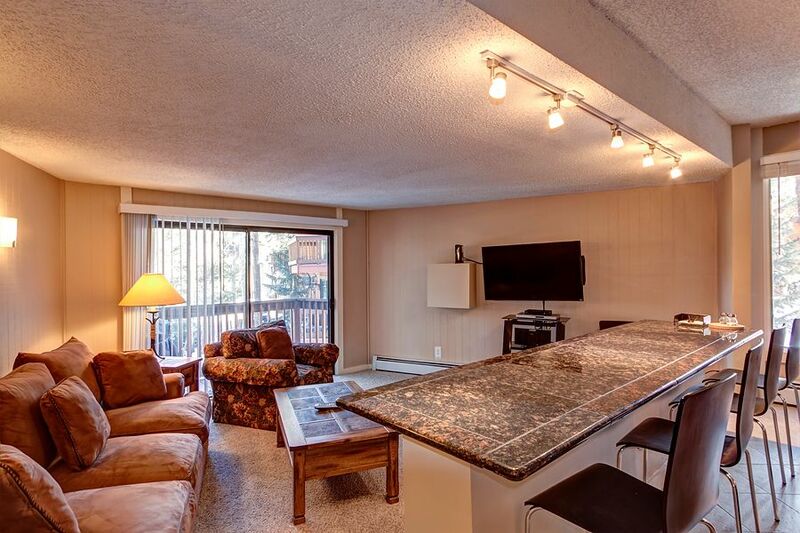 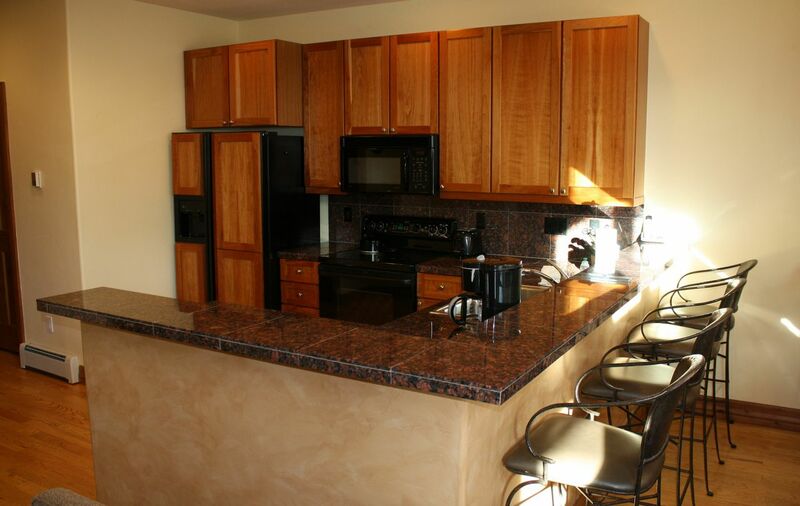 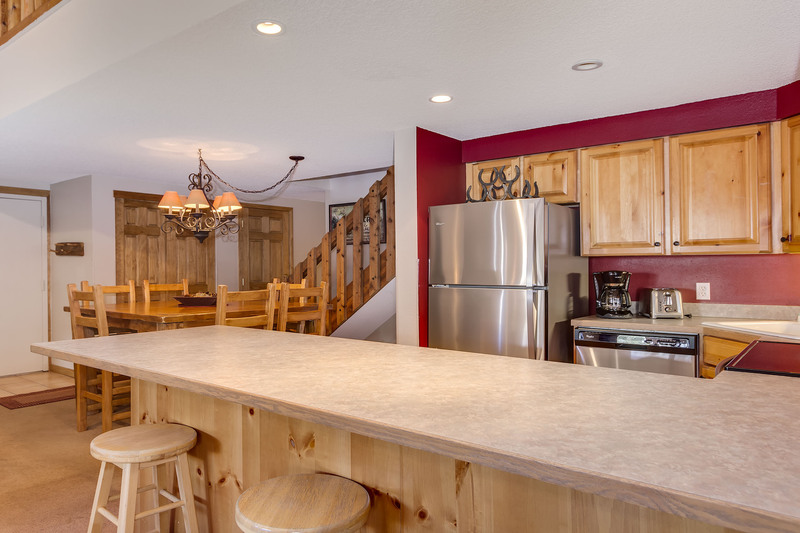 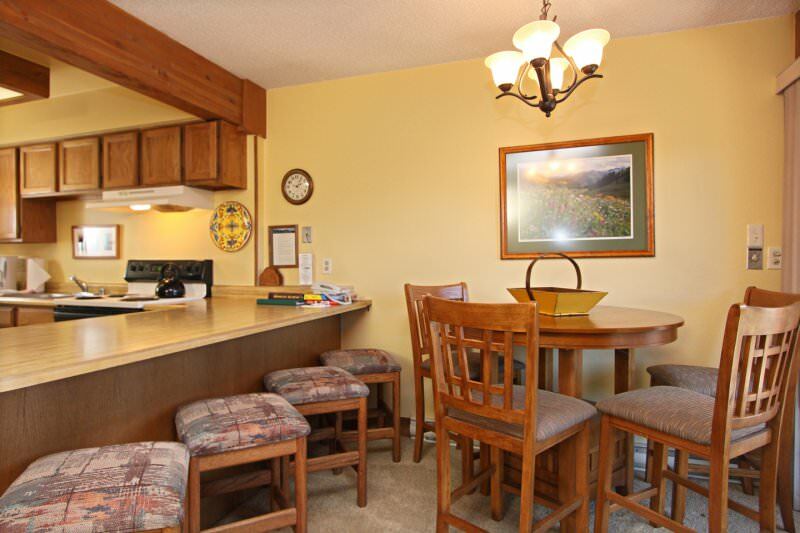 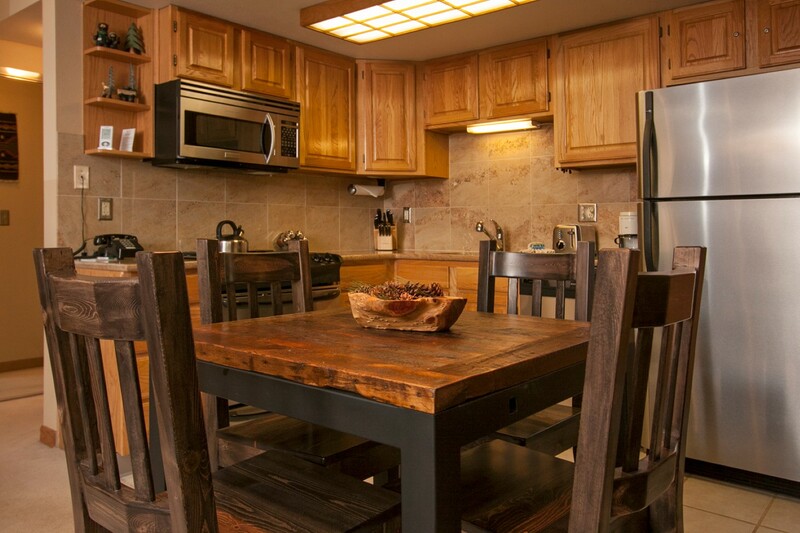 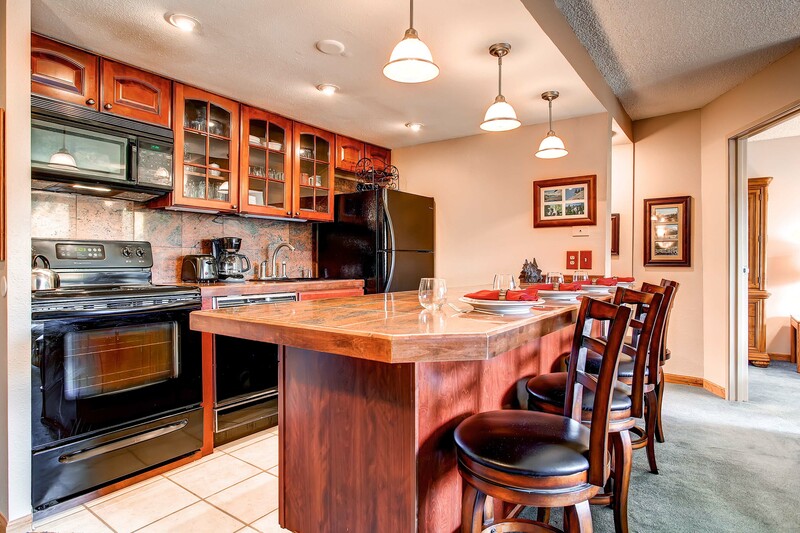 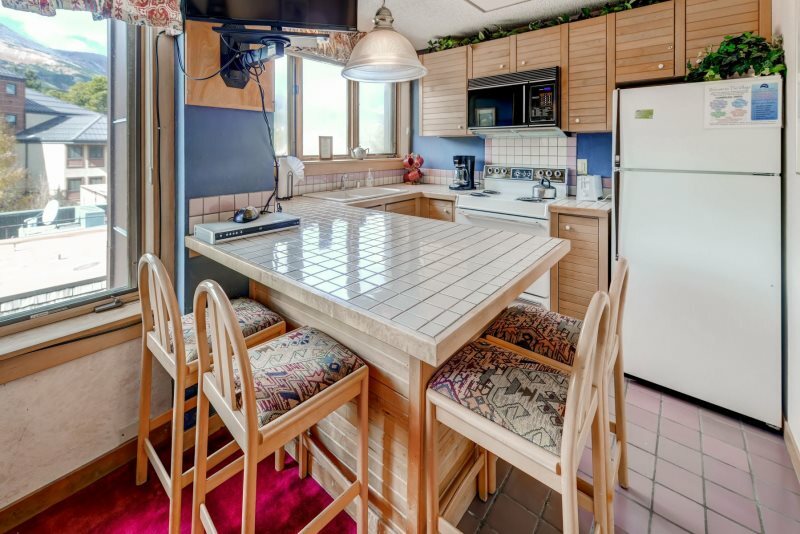 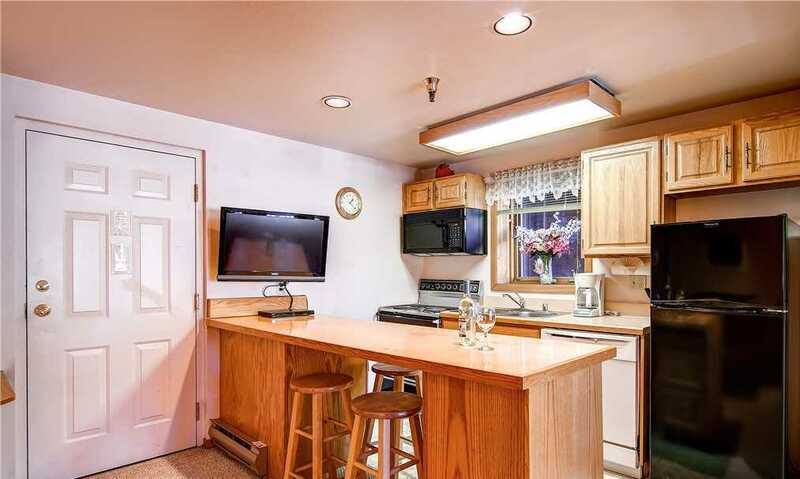 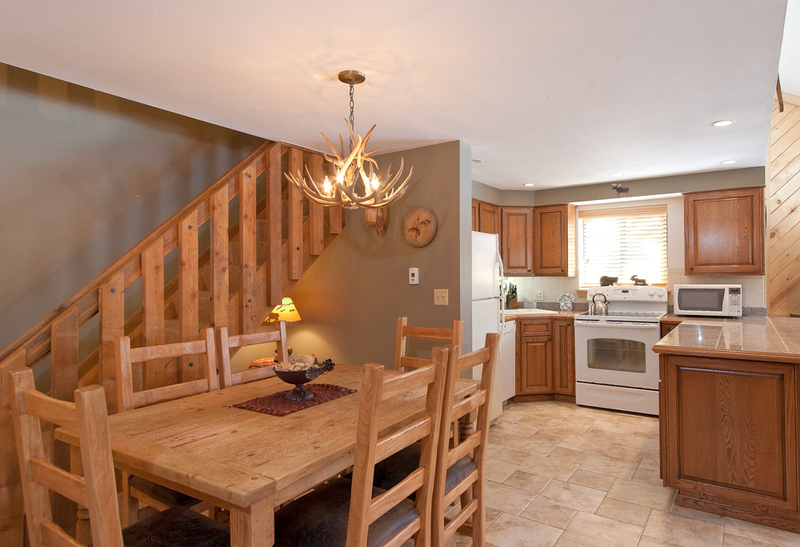 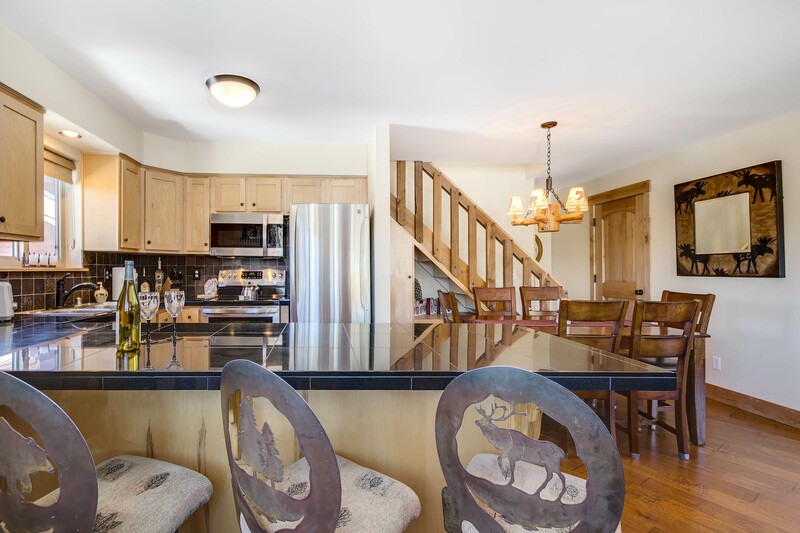 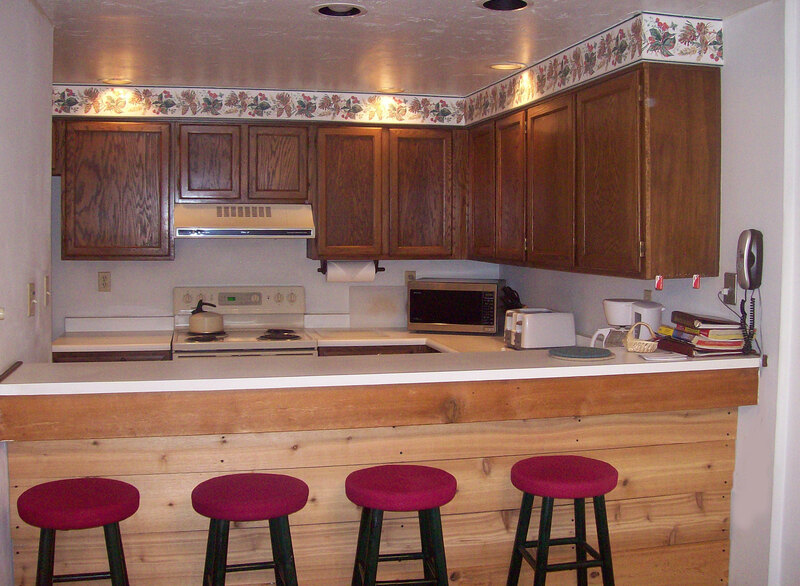 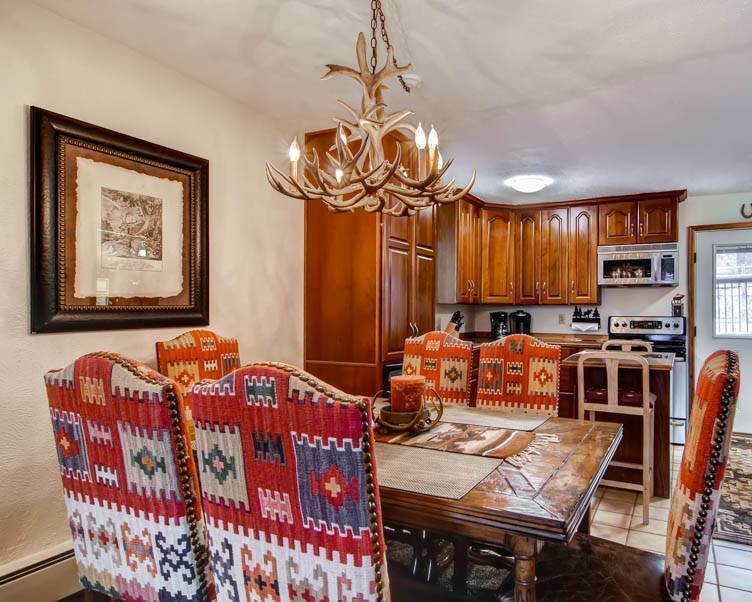 Enjoy your meal in the comfort of your own unit at the countertop bar with seating for two people or the quaint dining table with seating for four people. 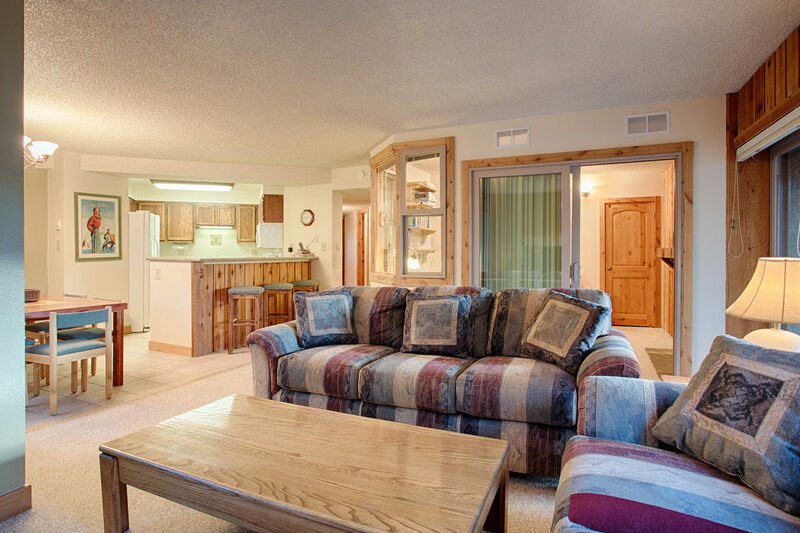 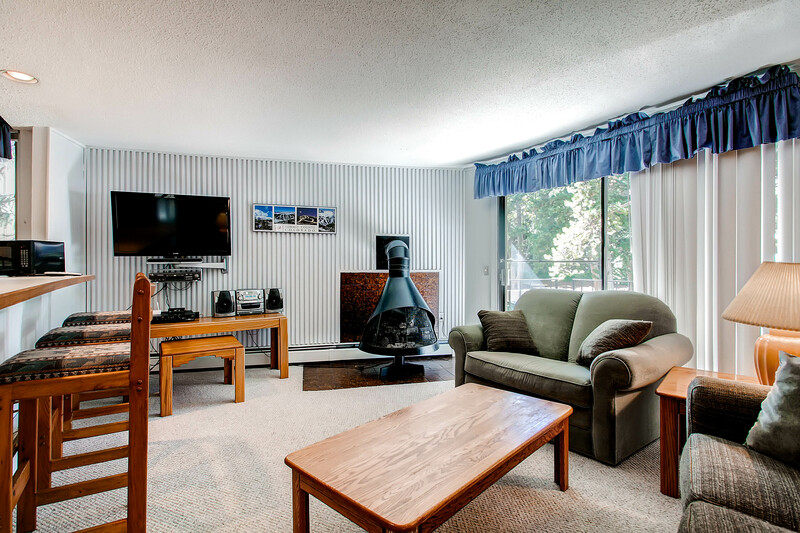 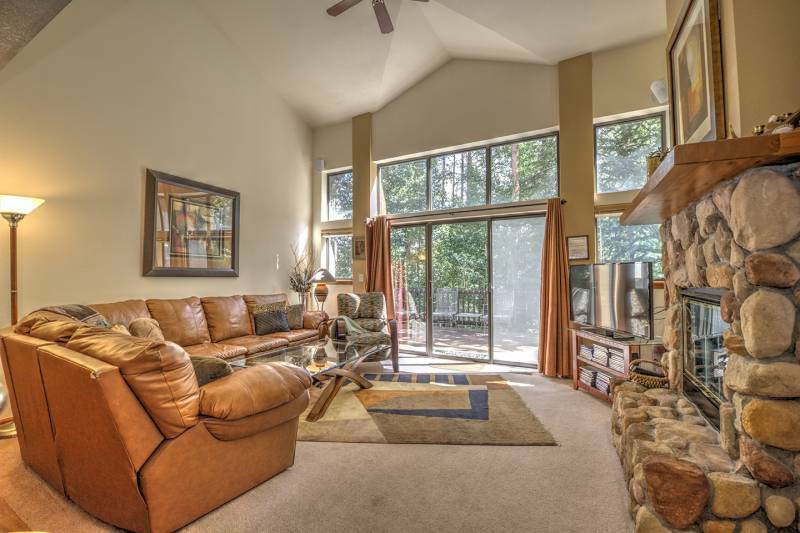 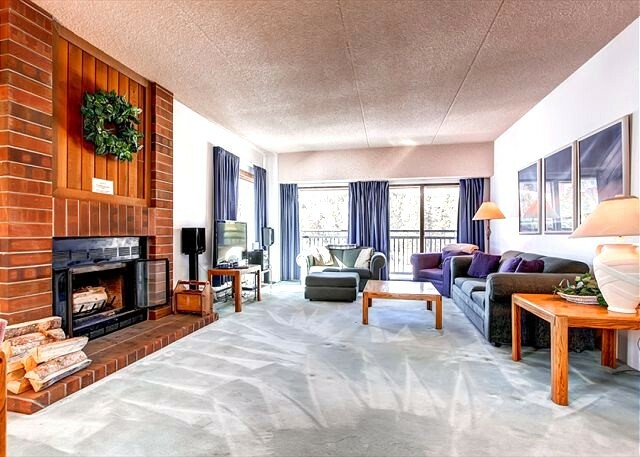 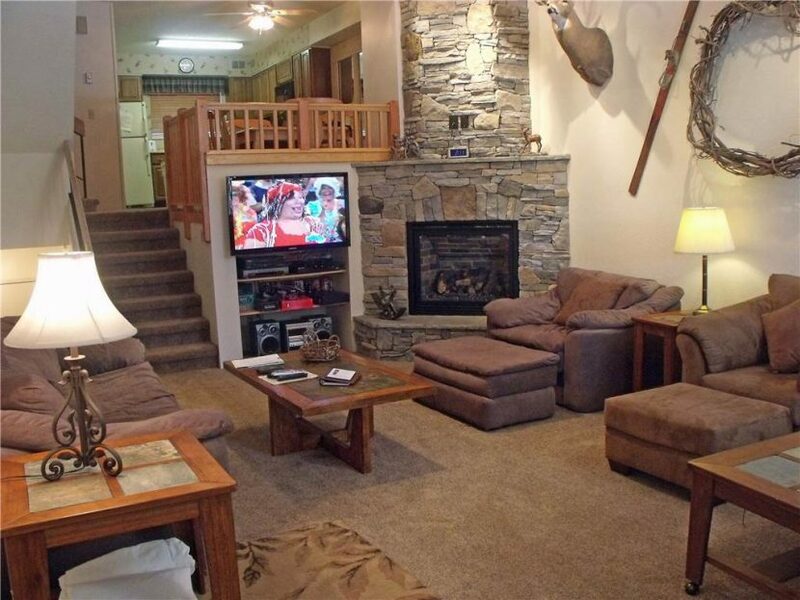 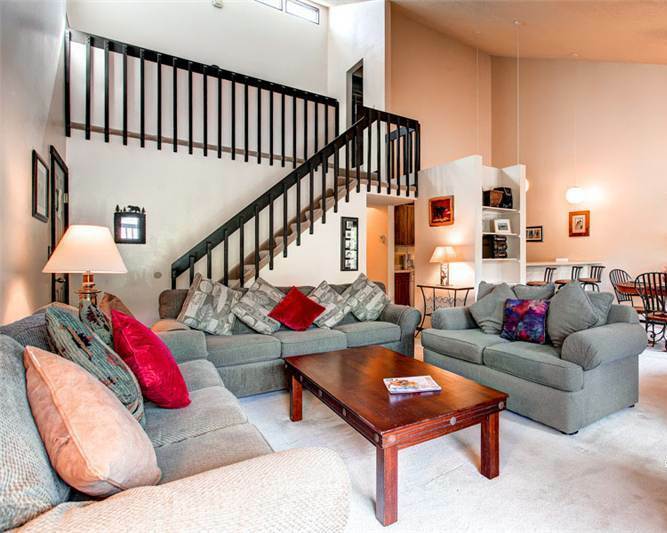 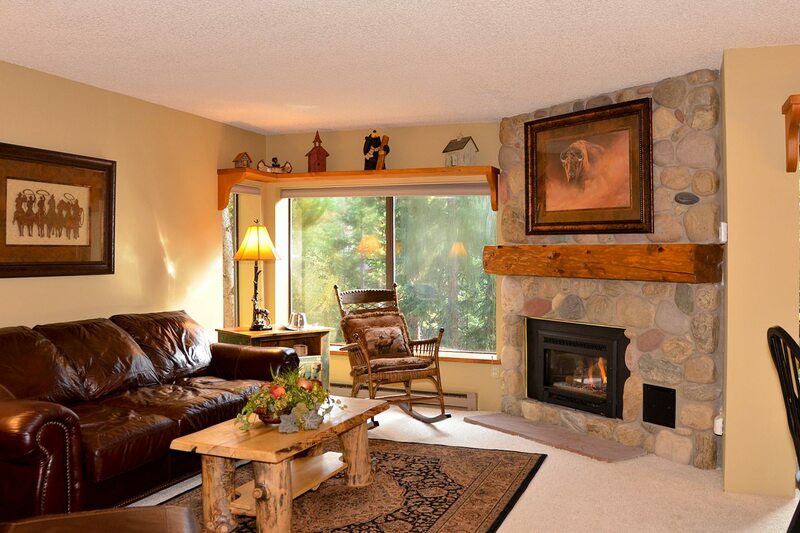 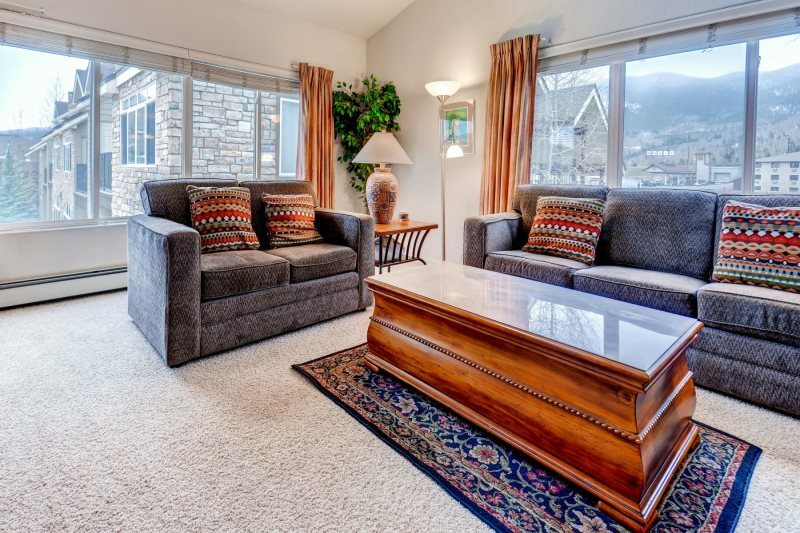 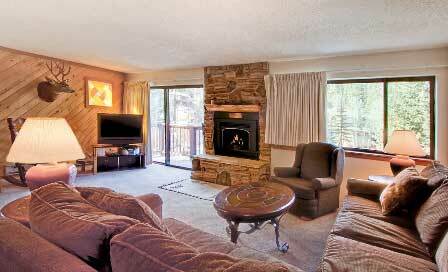 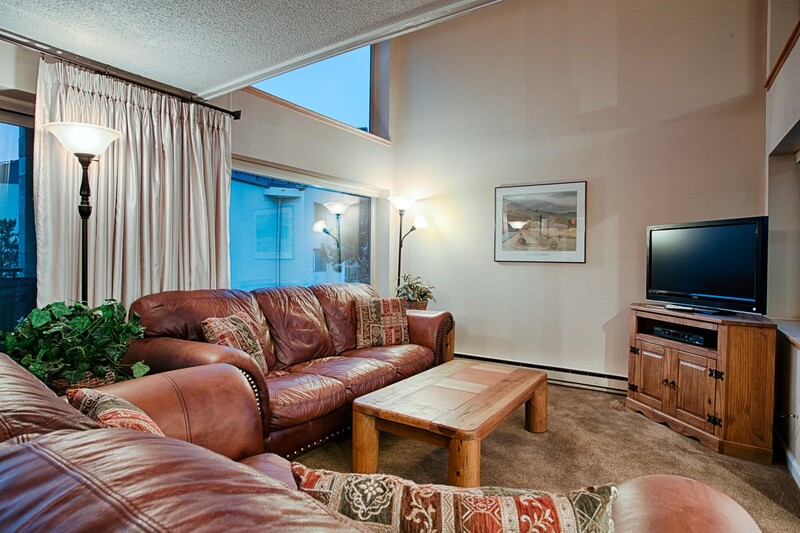 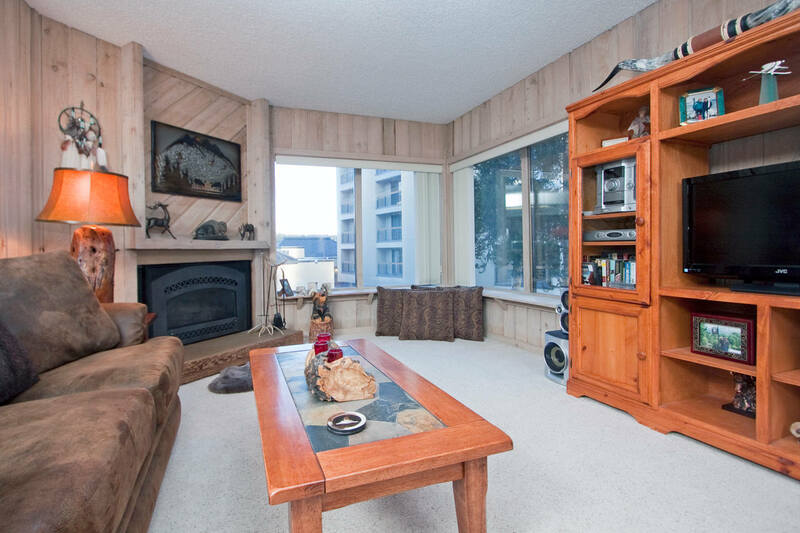 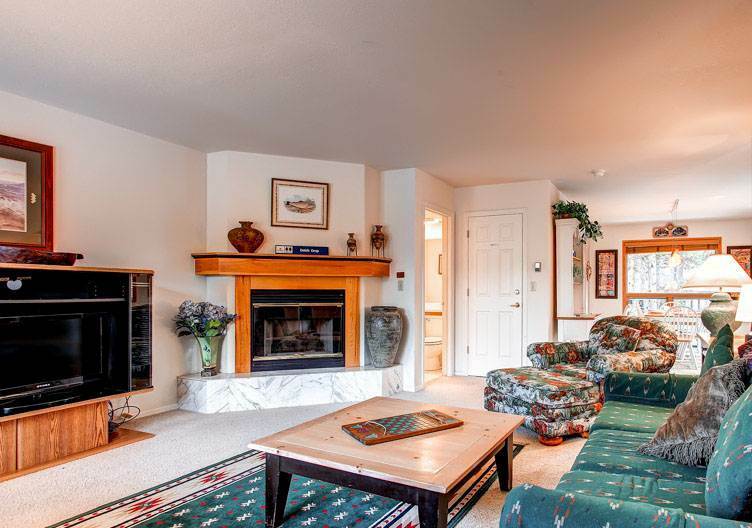 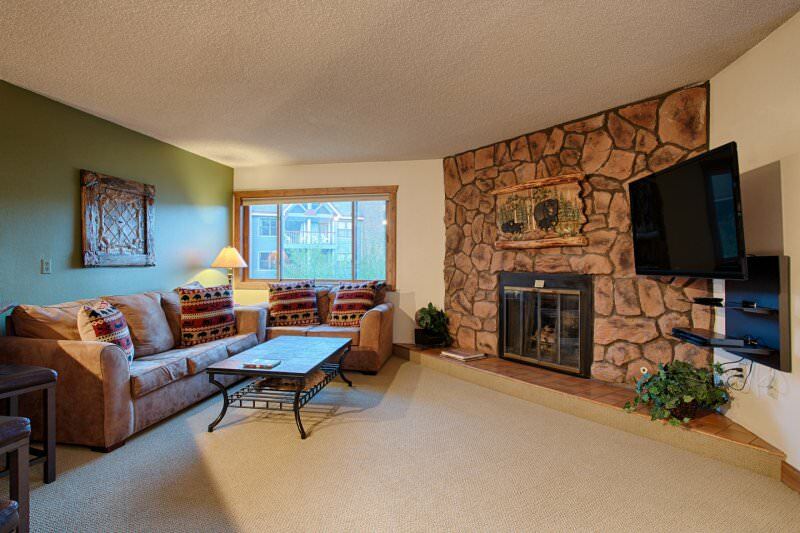 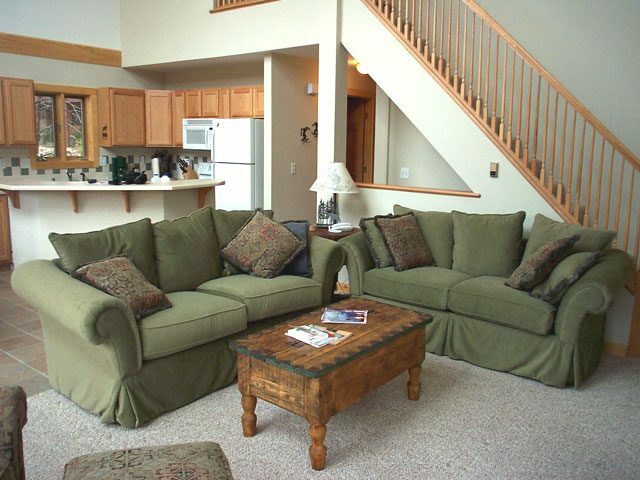 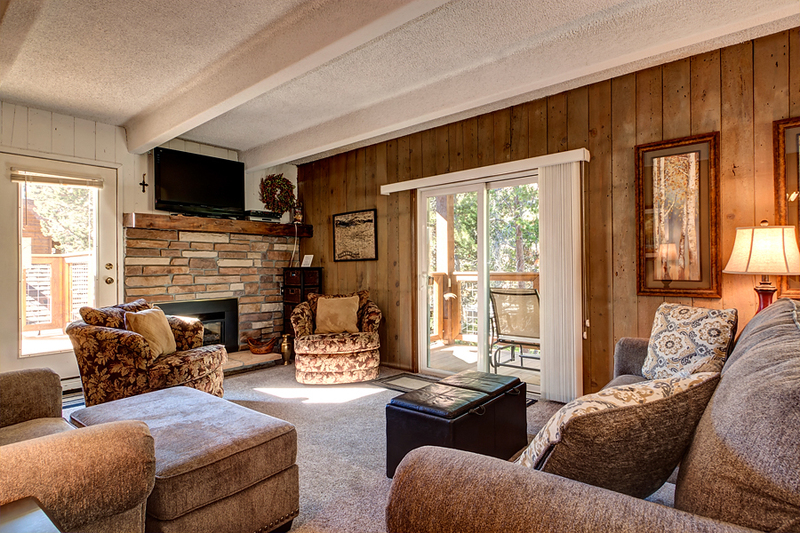 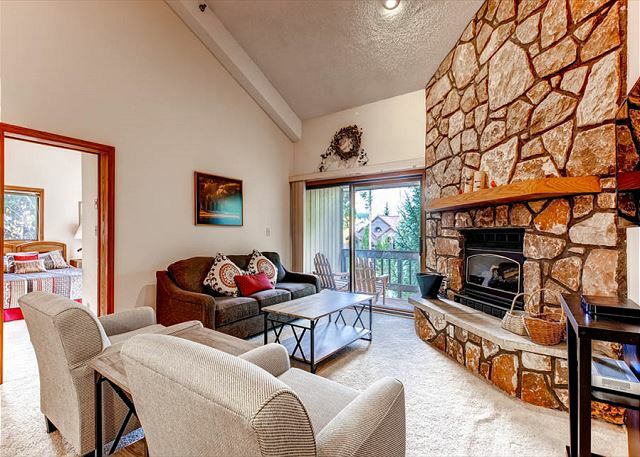 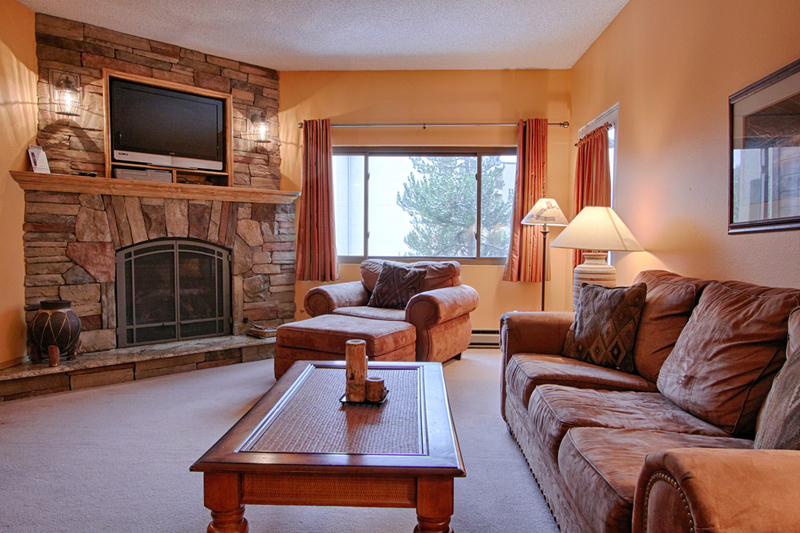 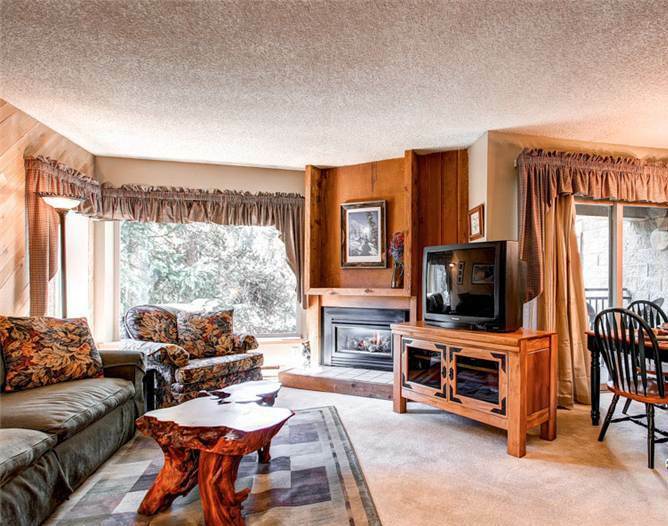 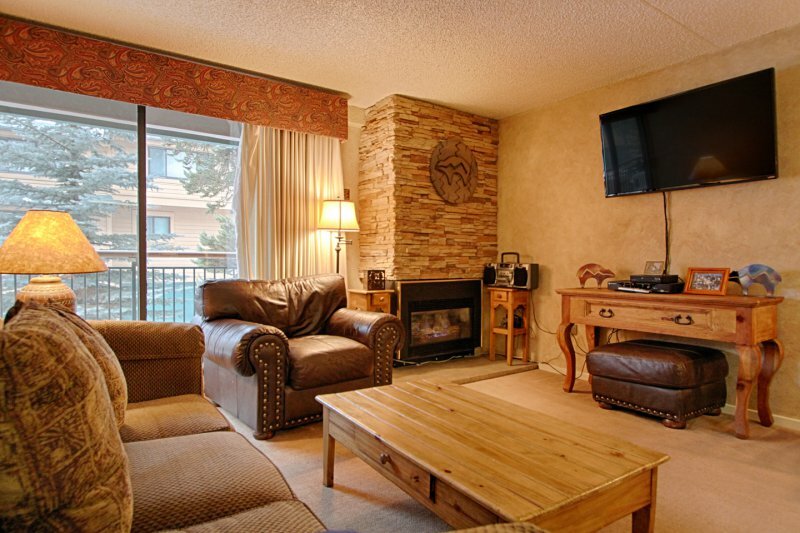 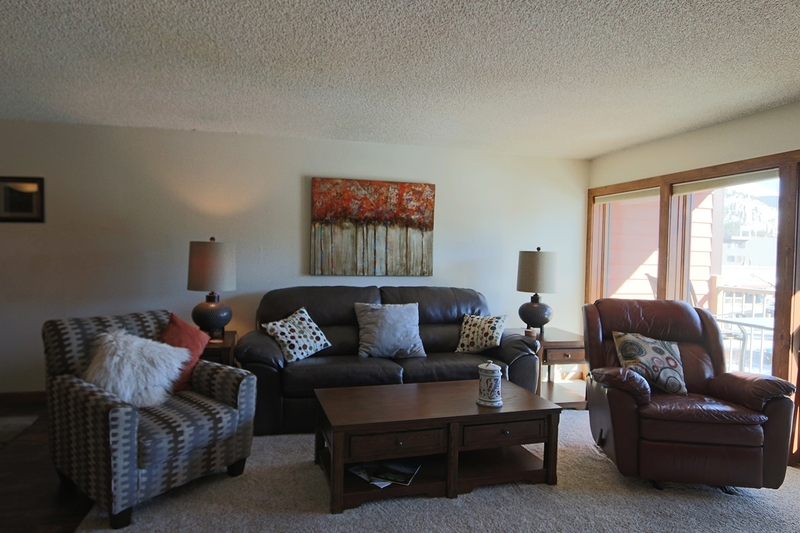 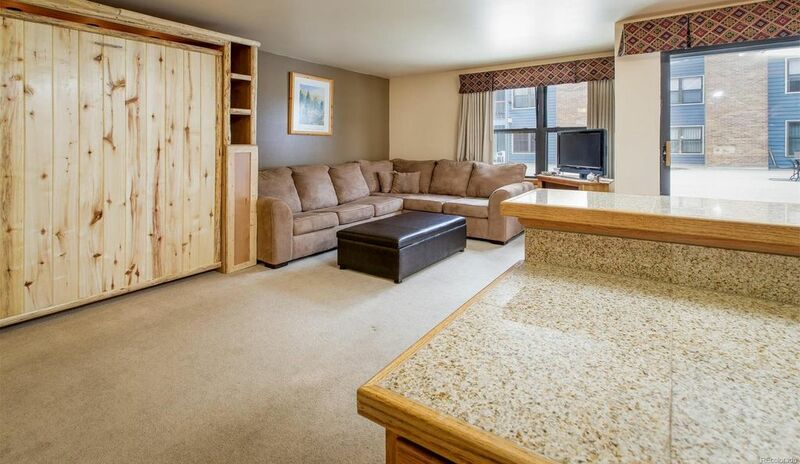 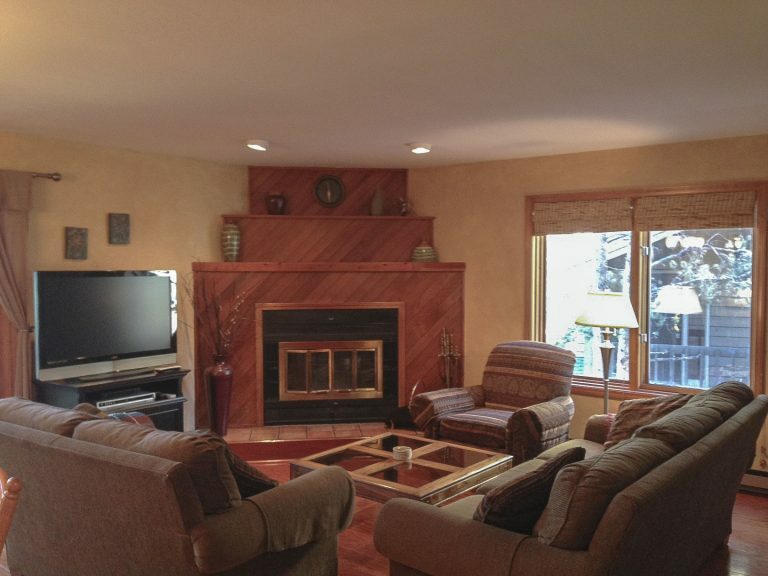 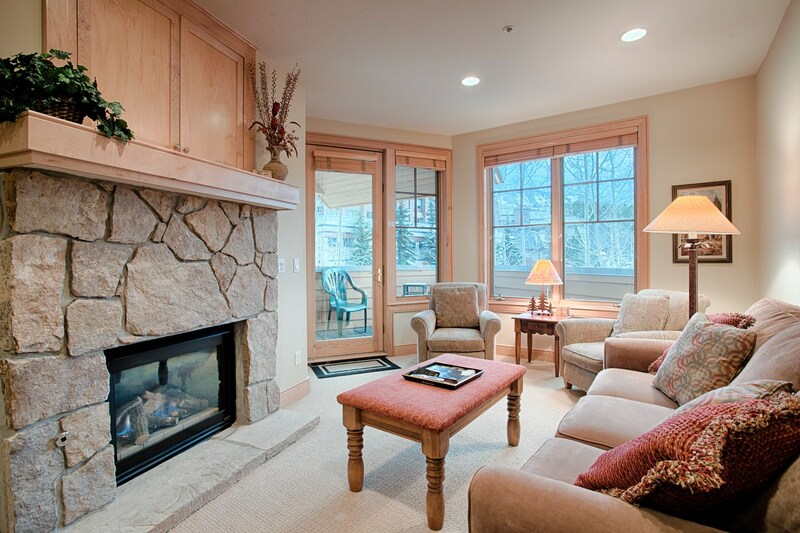 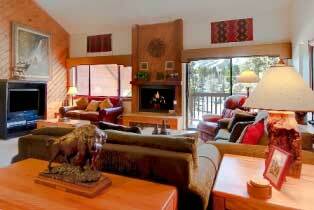 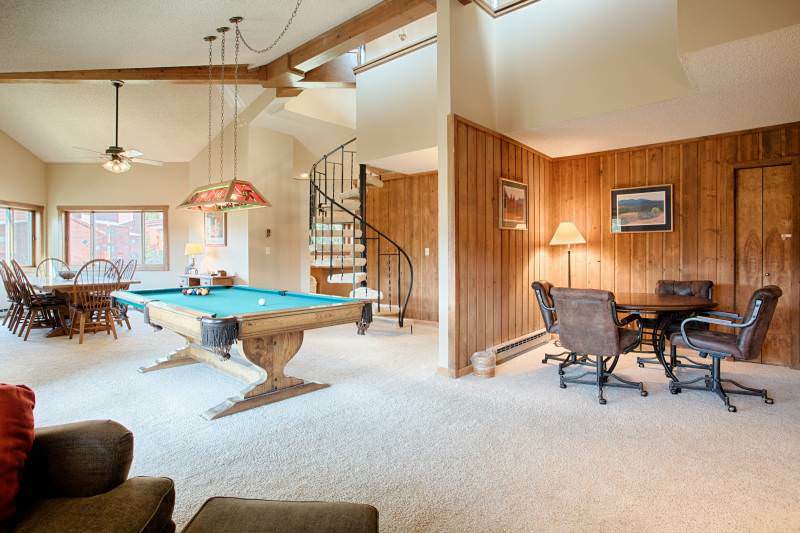 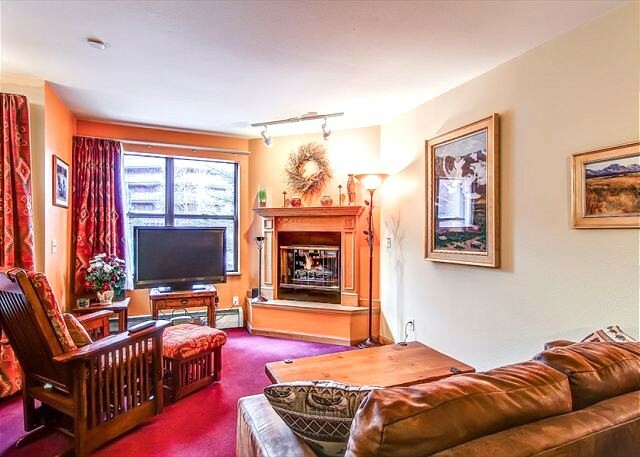 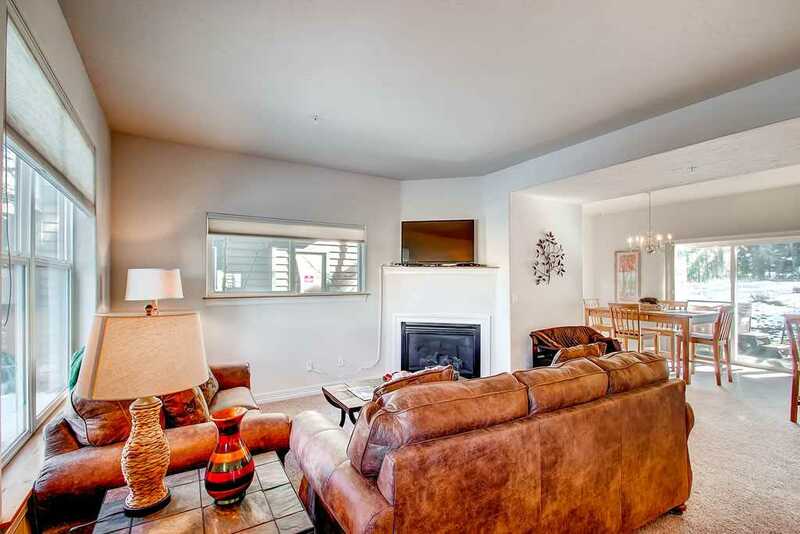 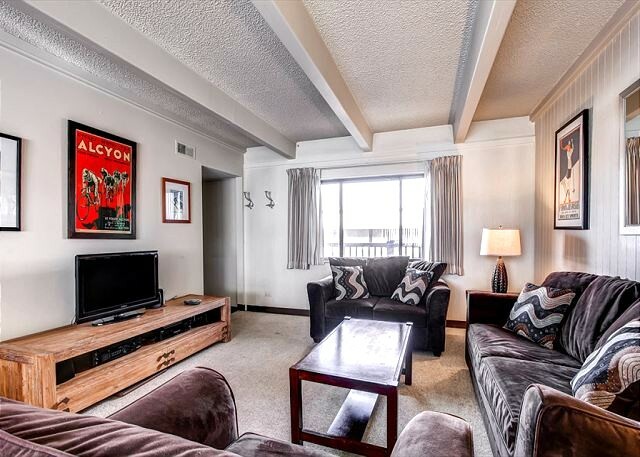 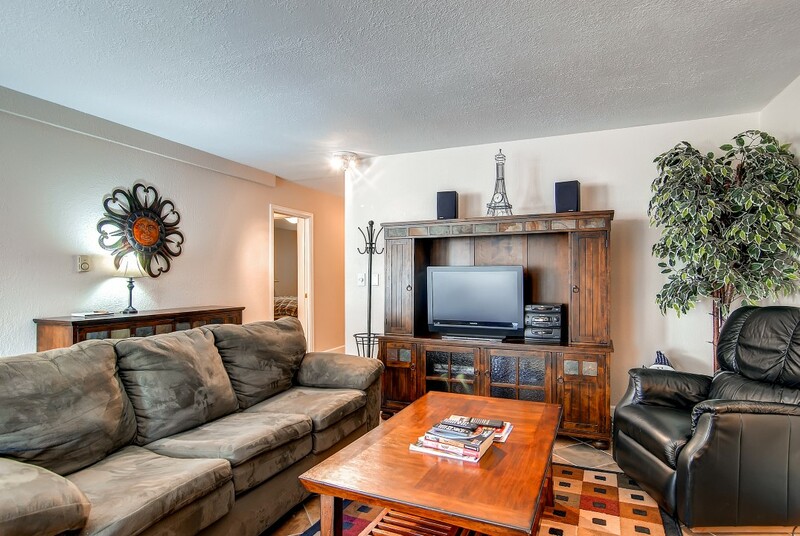 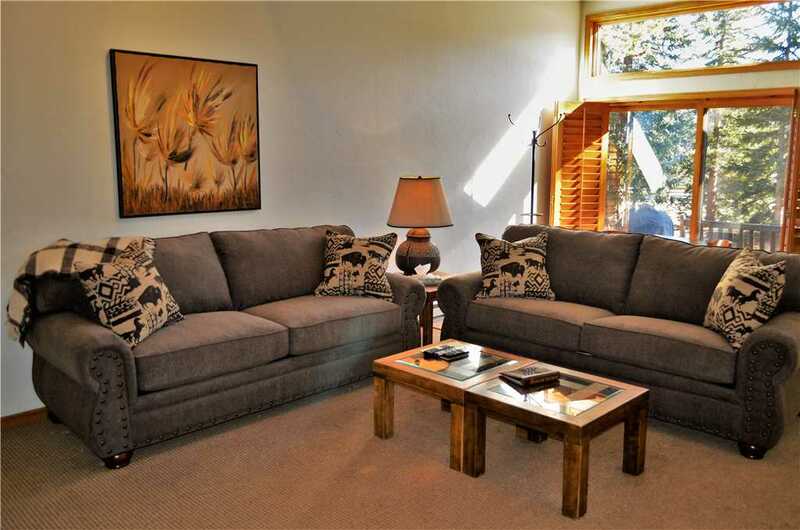 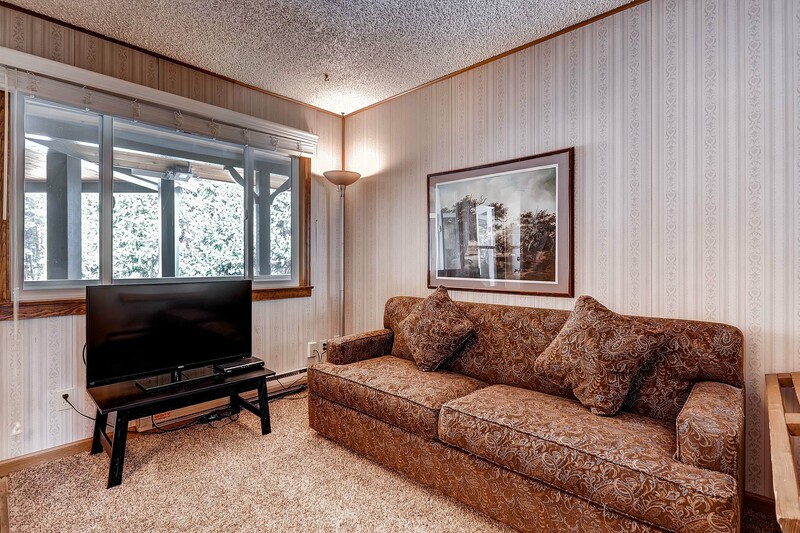 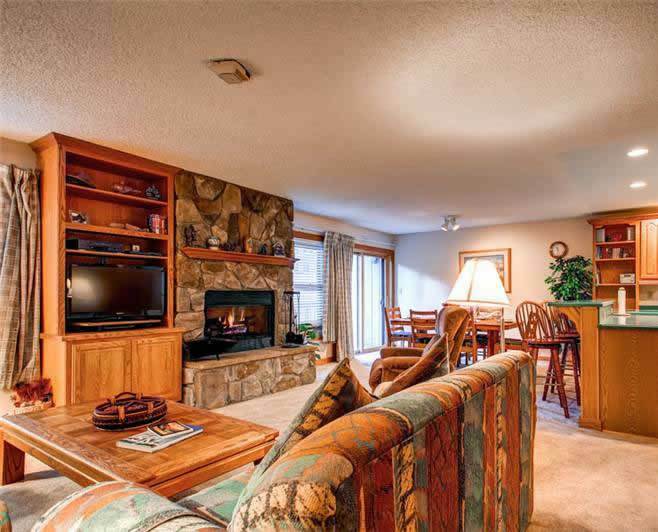 The living room is sure to provide the relaxation you deserve on vacation. 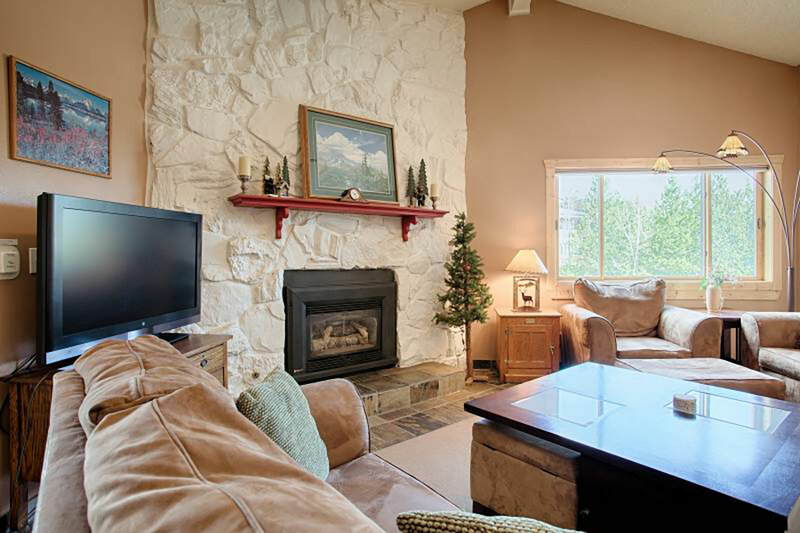 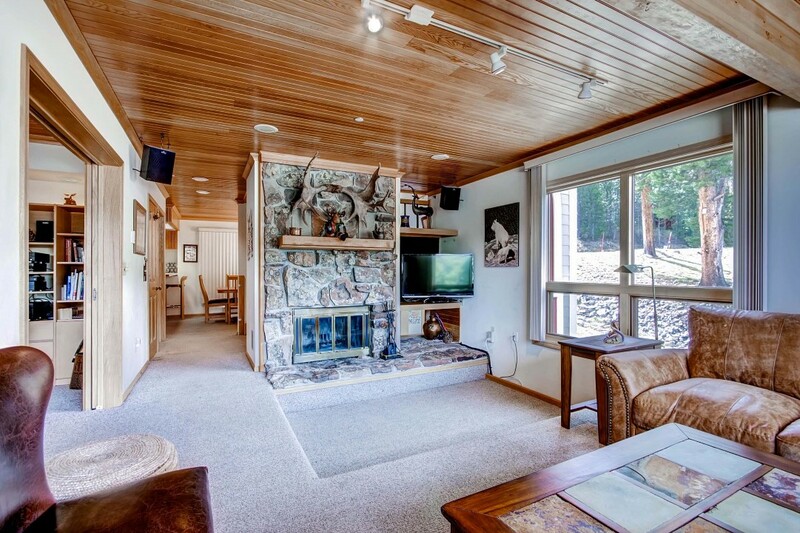 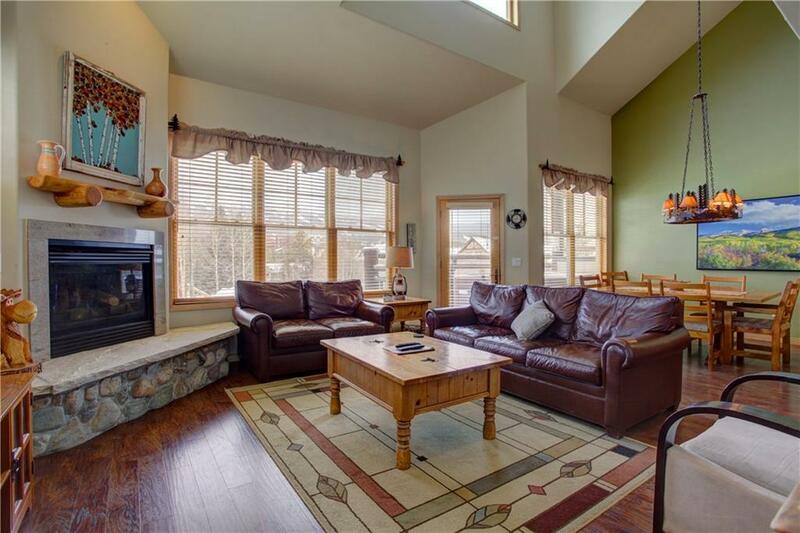 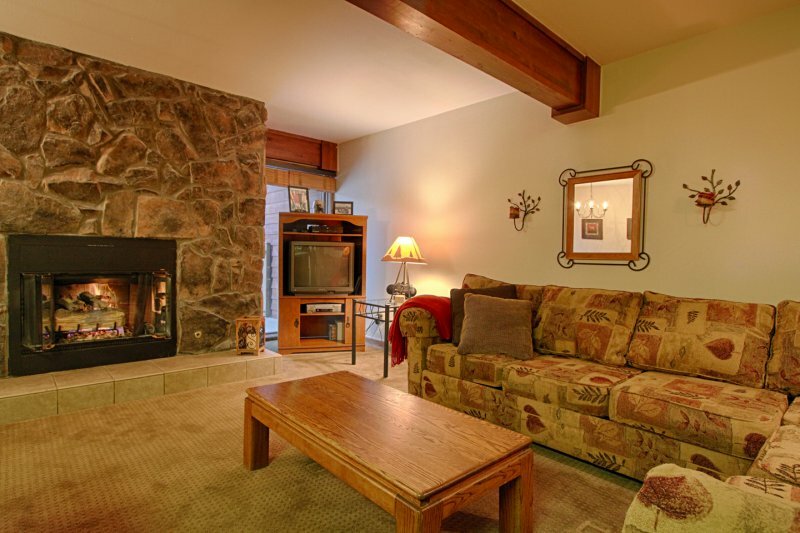 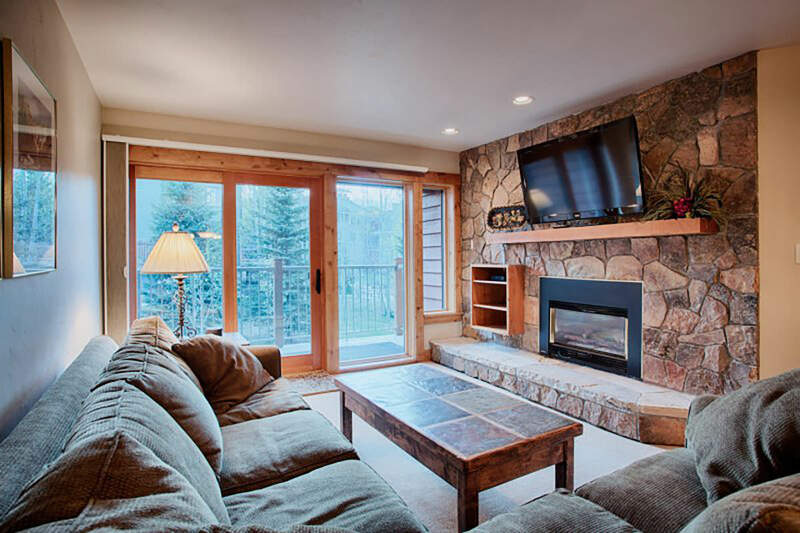 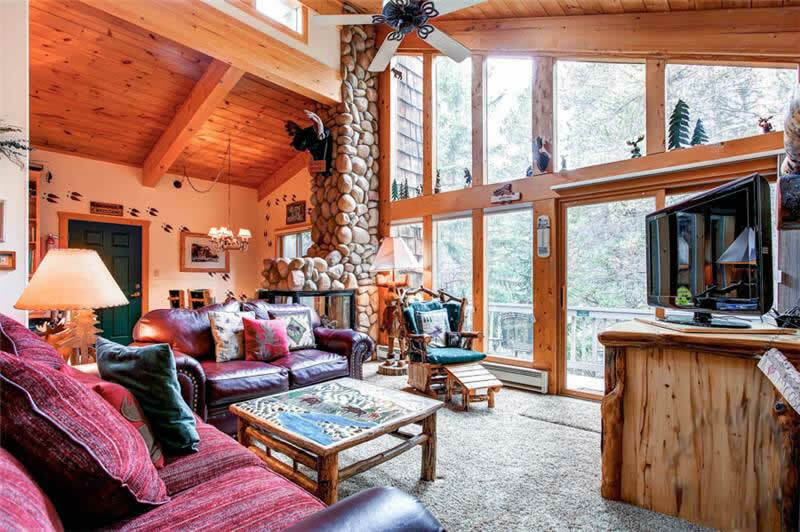 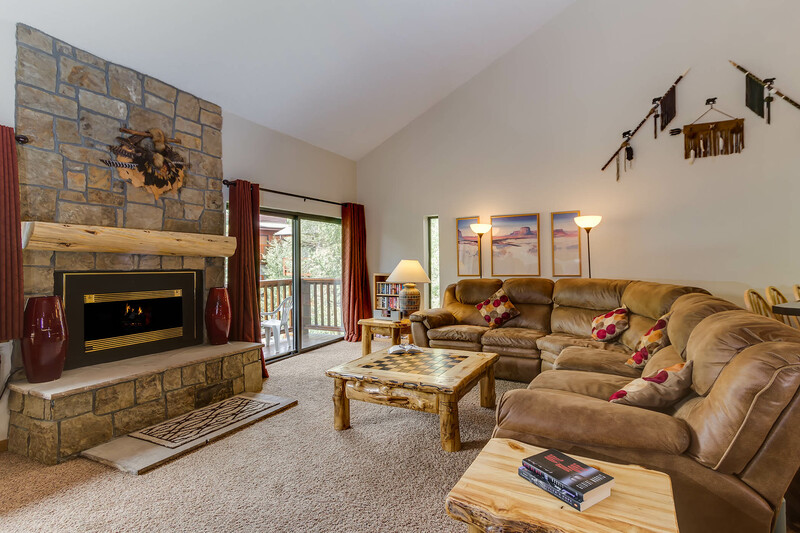 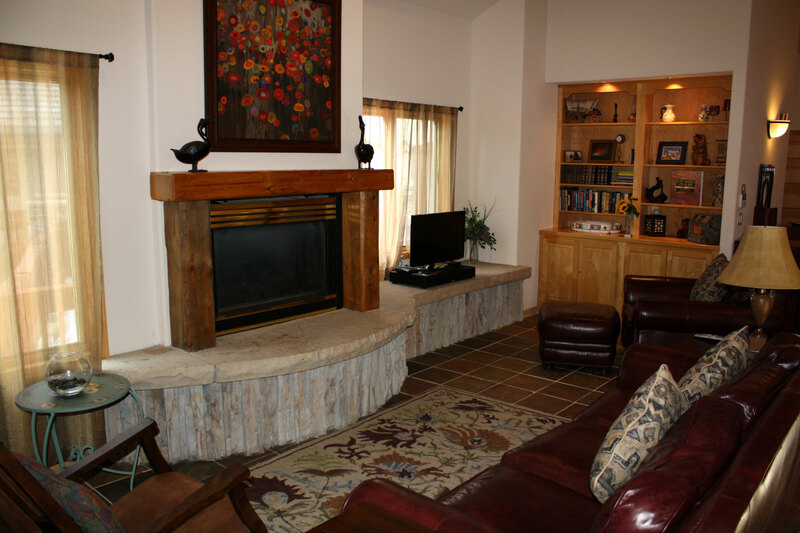 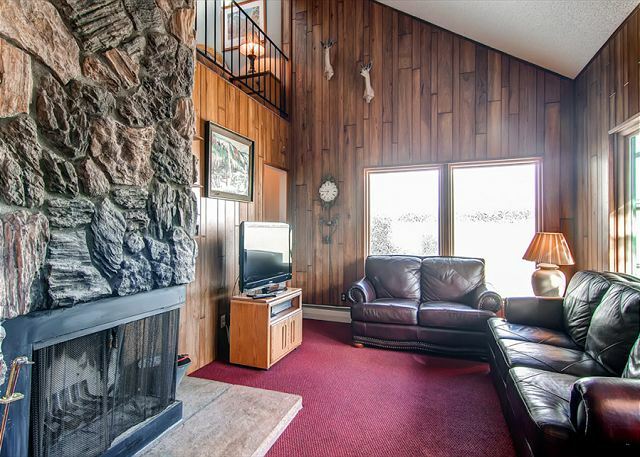 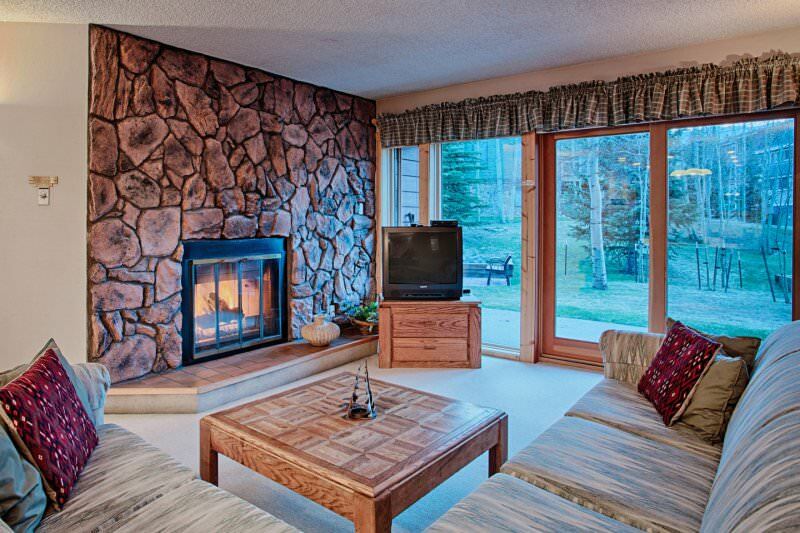 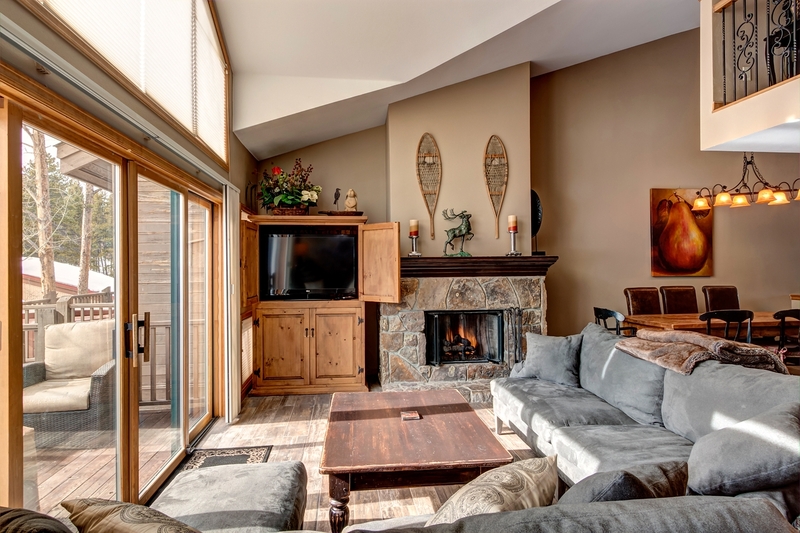 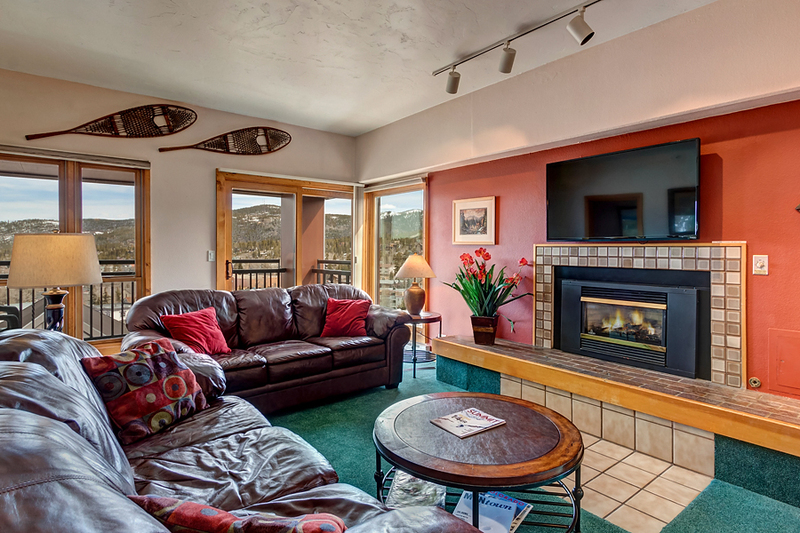 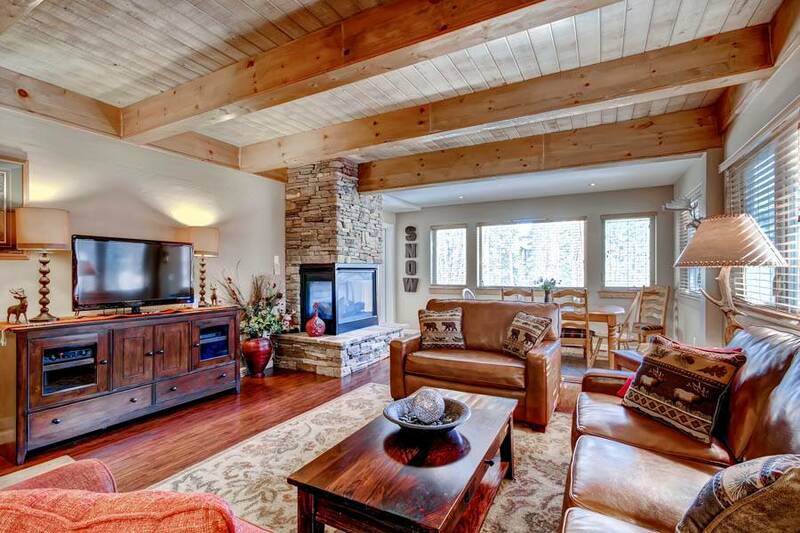 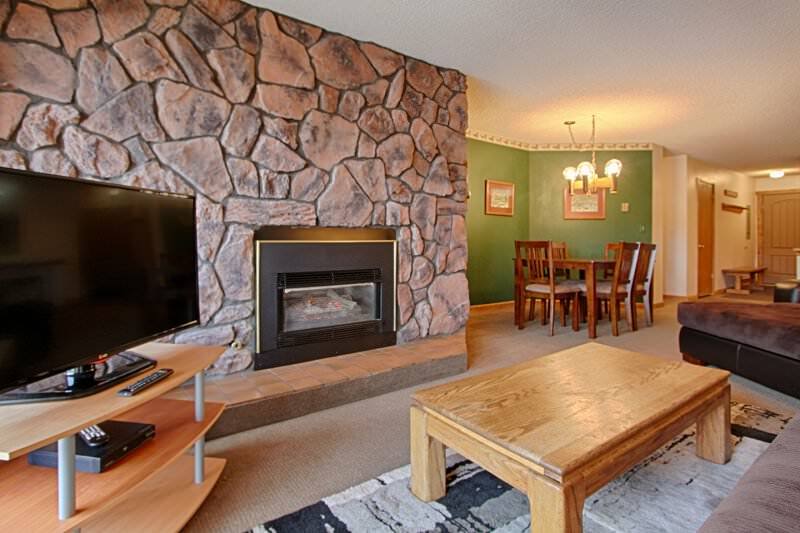 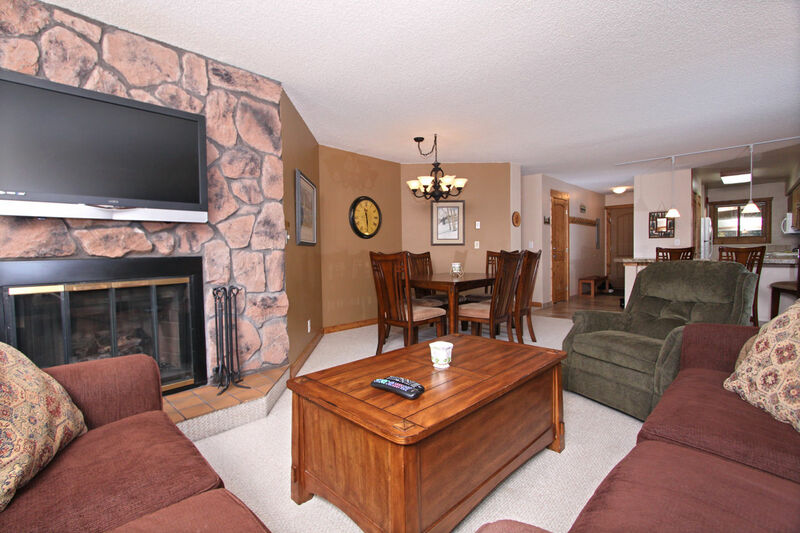 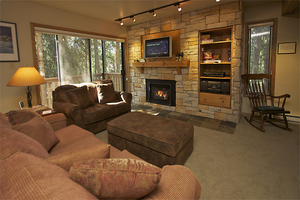 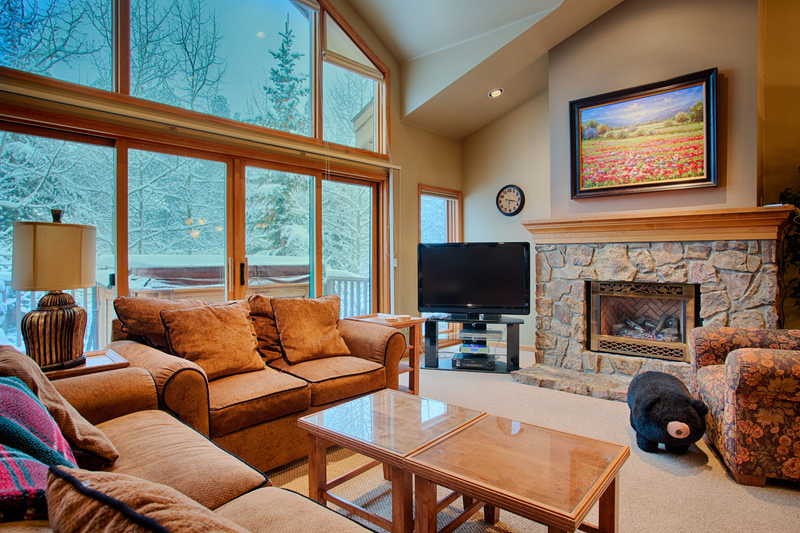 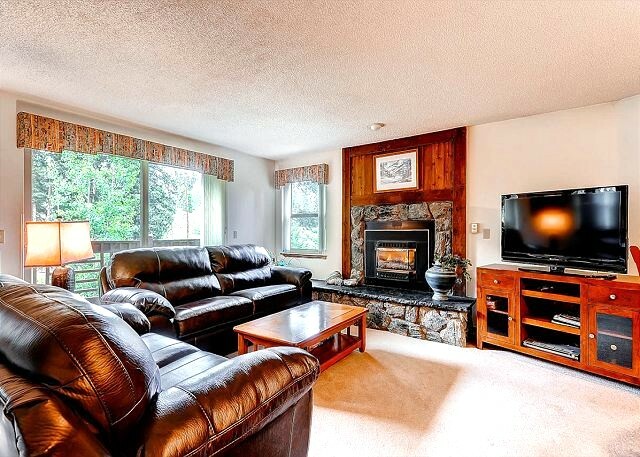 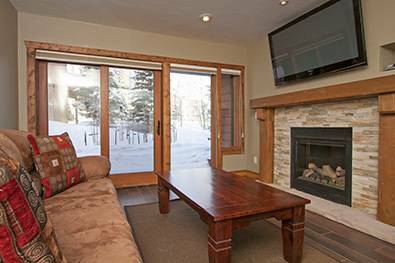 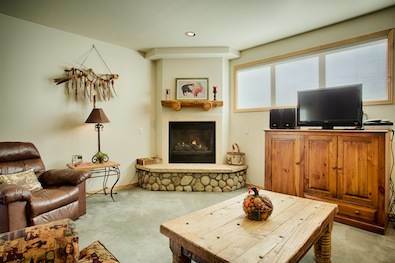 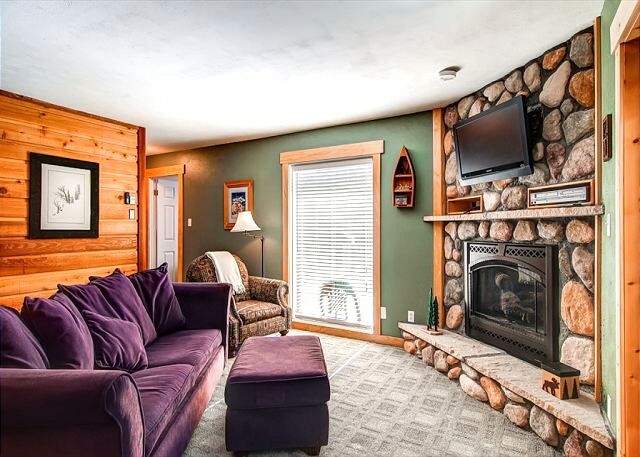 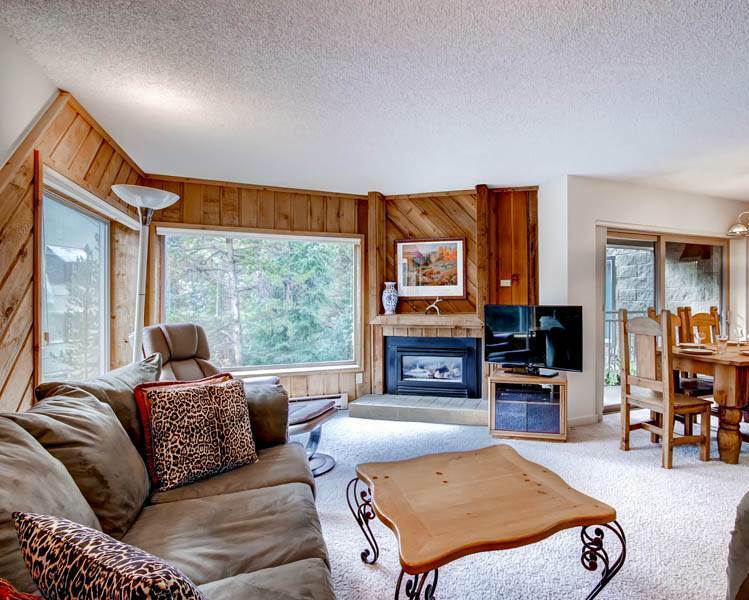 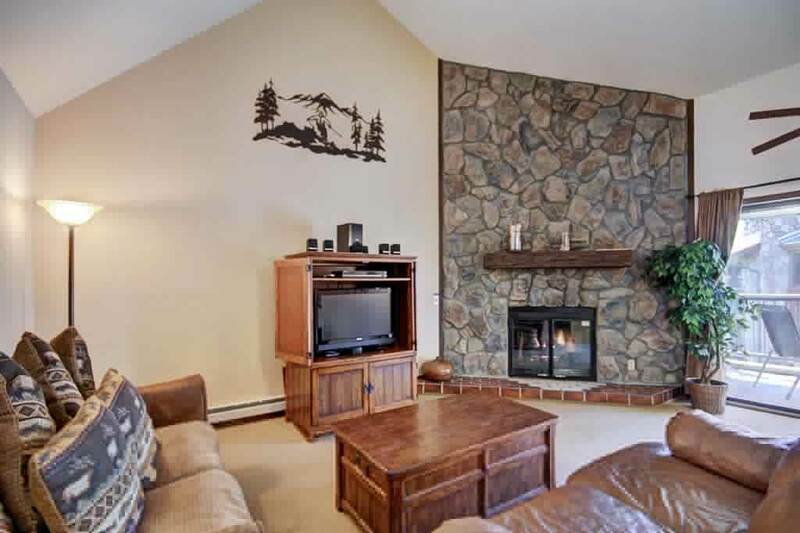 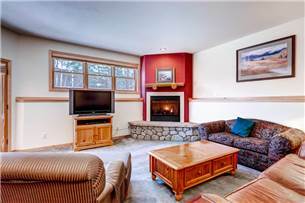 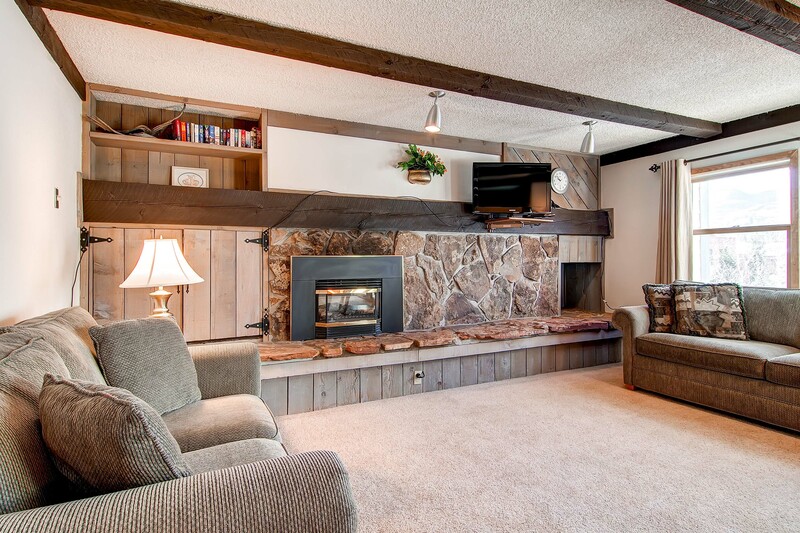 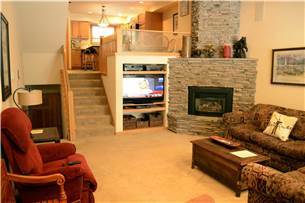 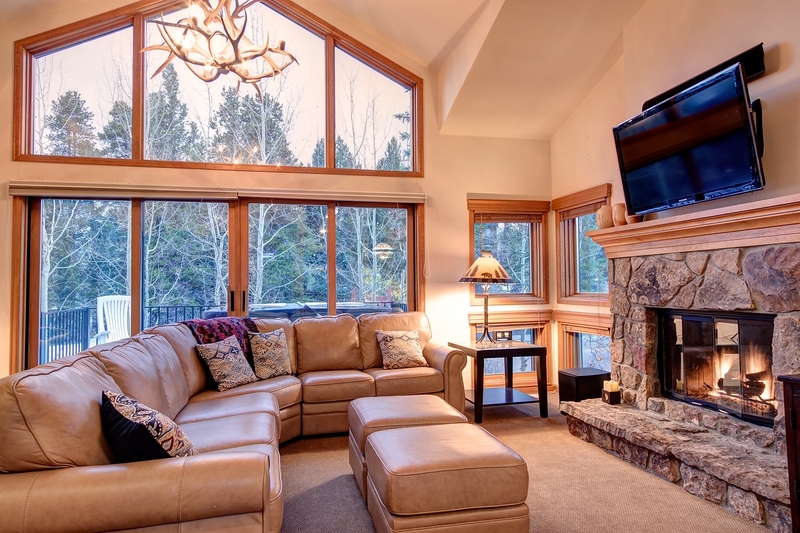 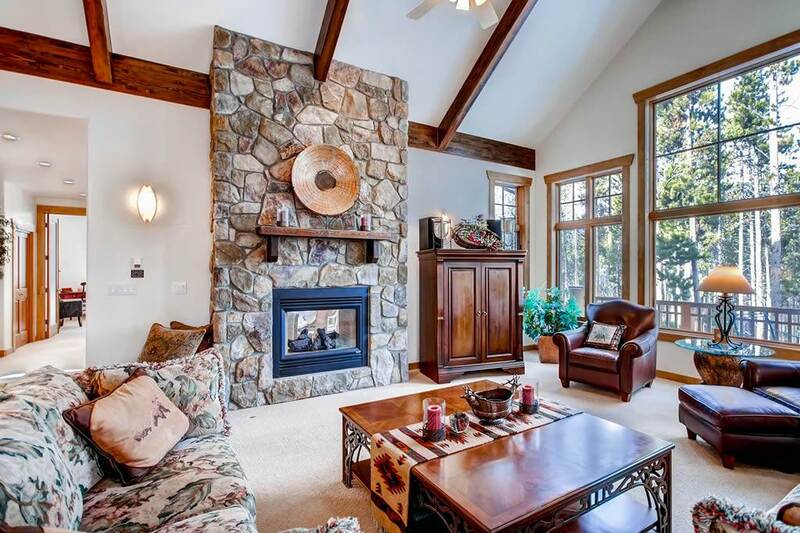 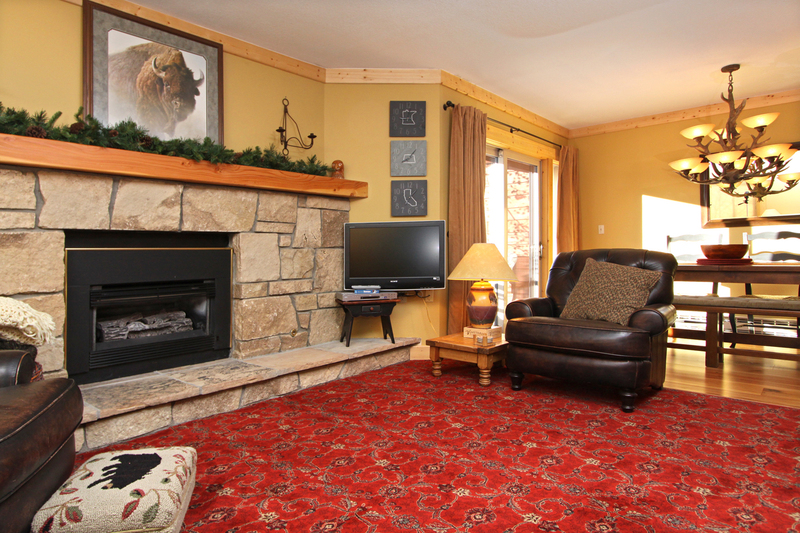 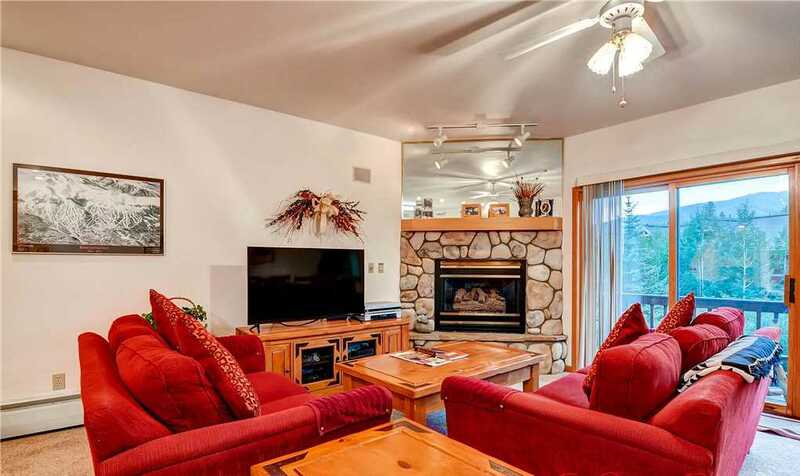 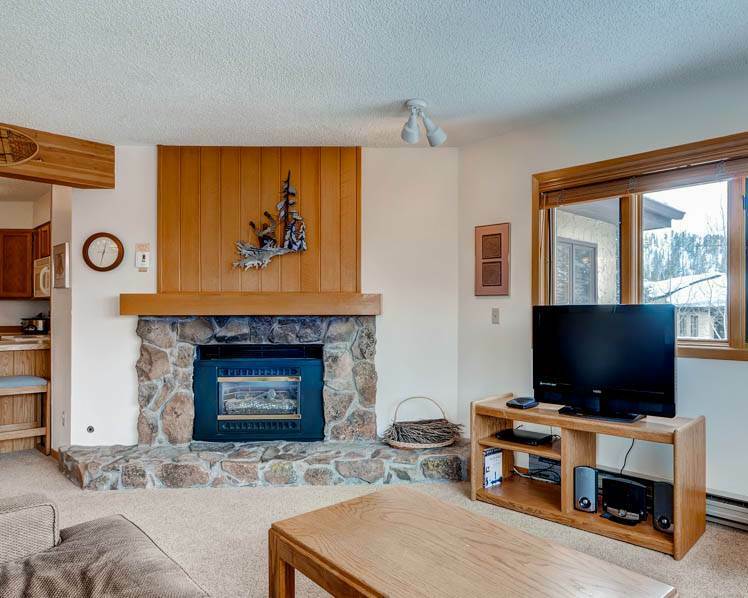 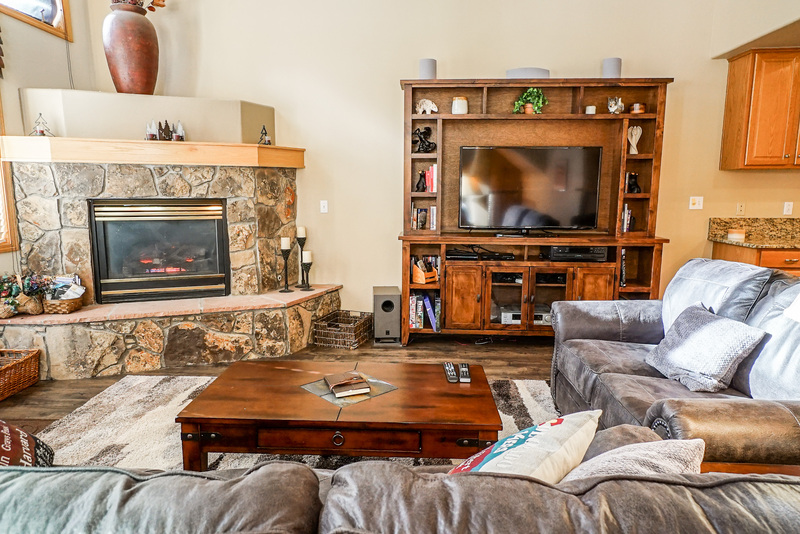 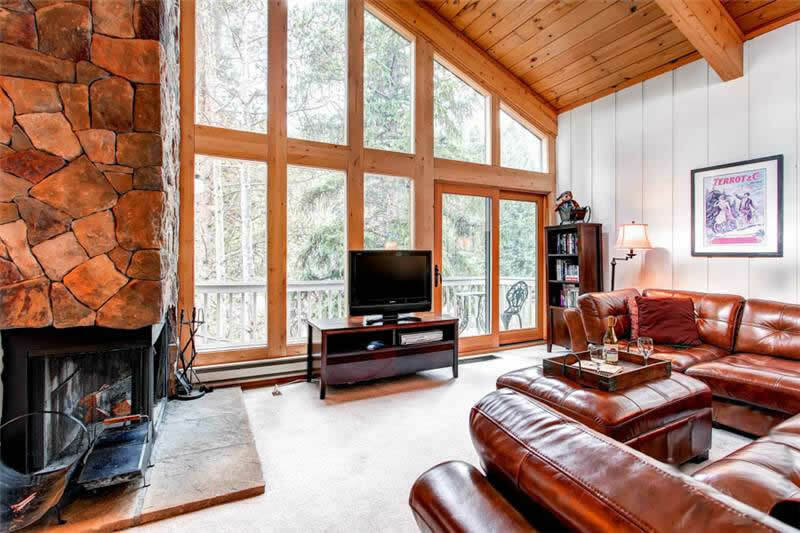 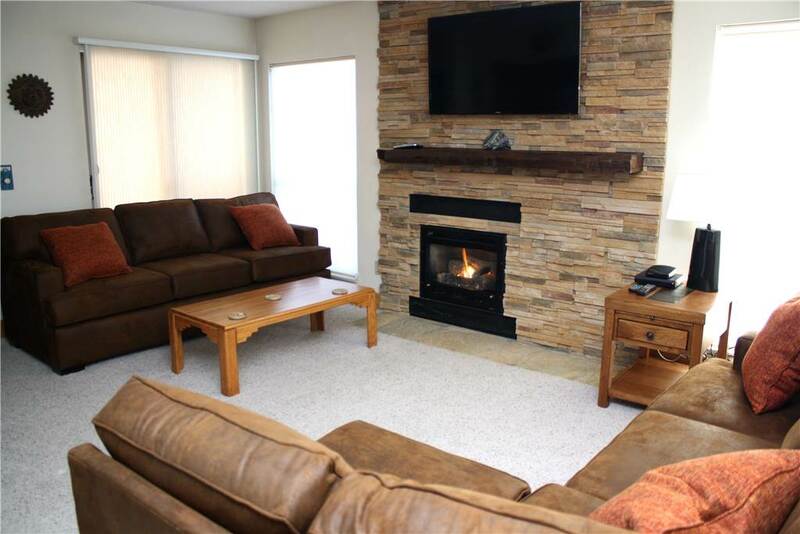 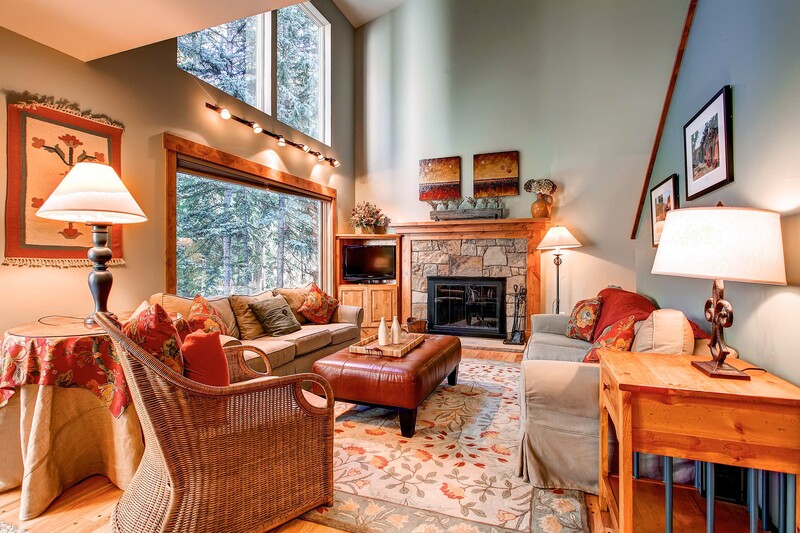 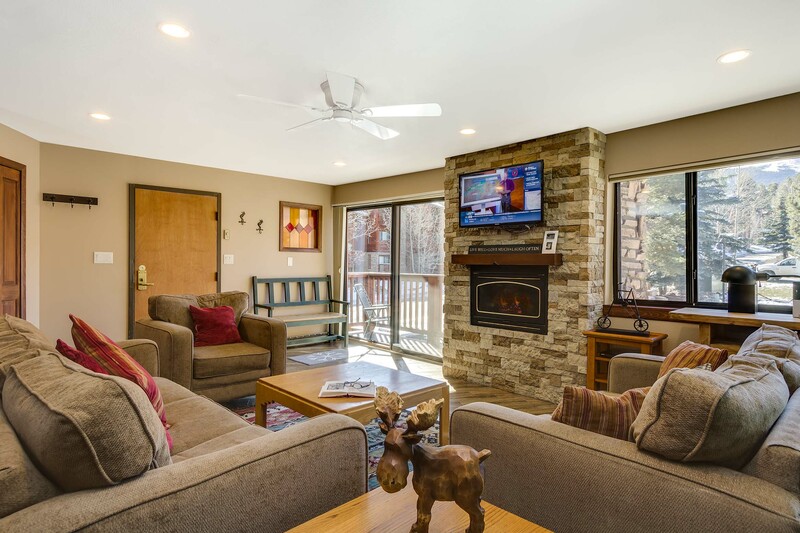 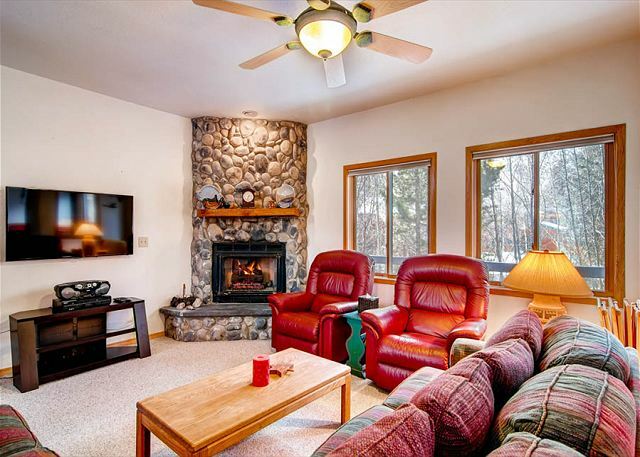 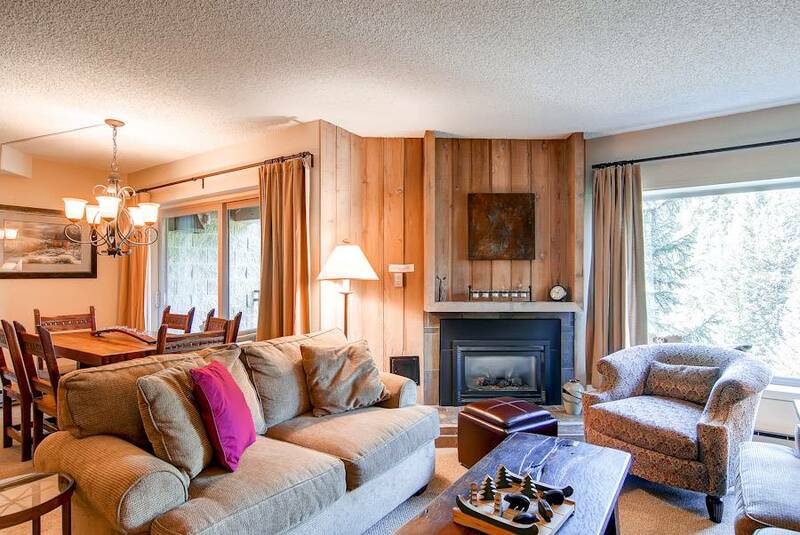 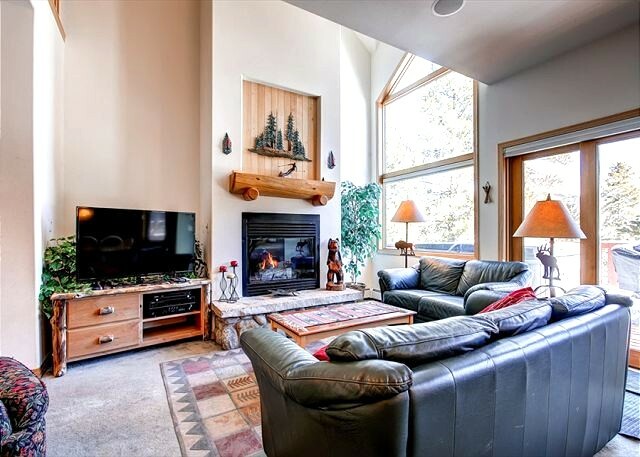 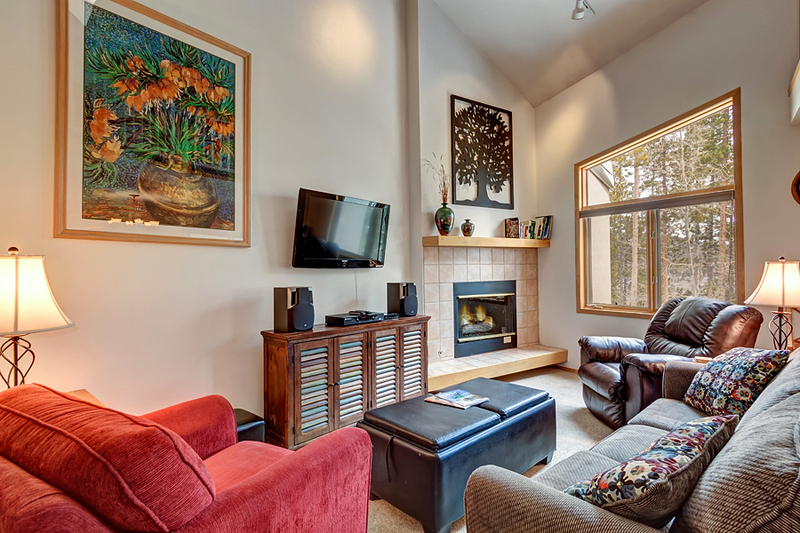 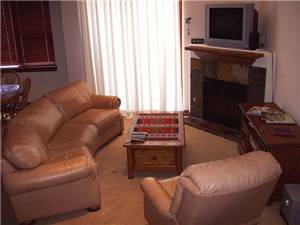 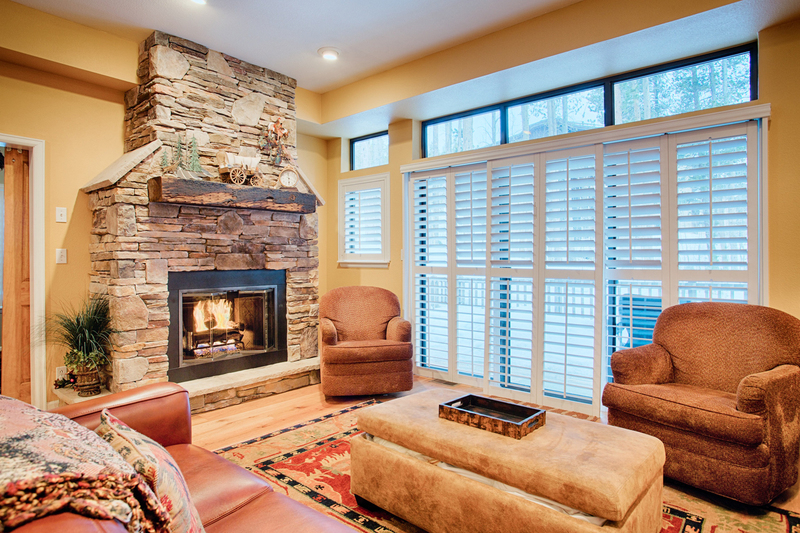 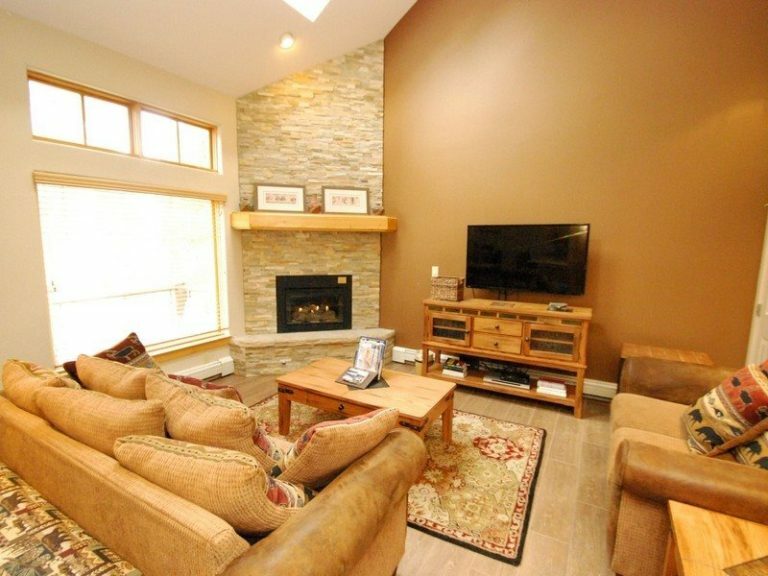 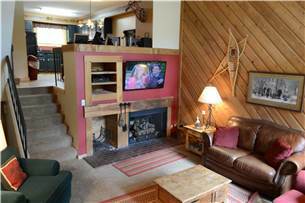 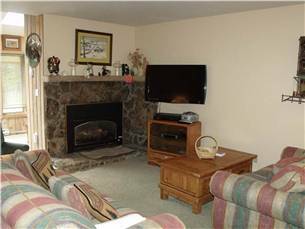 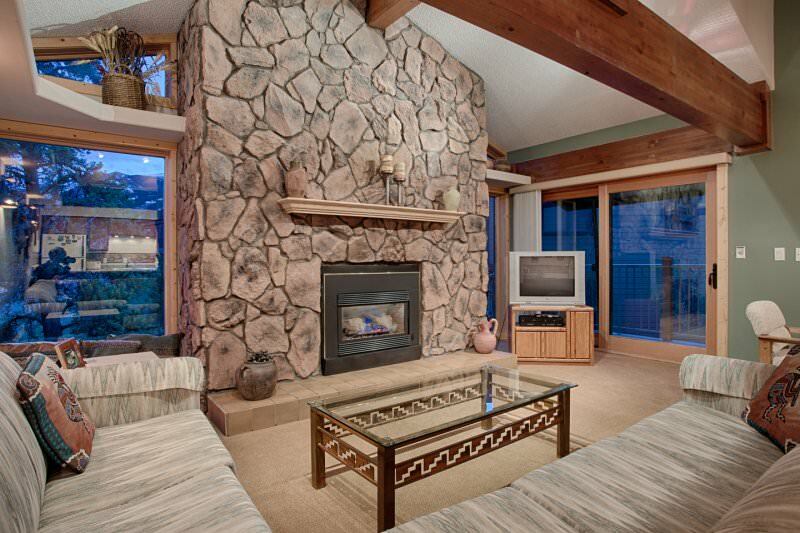 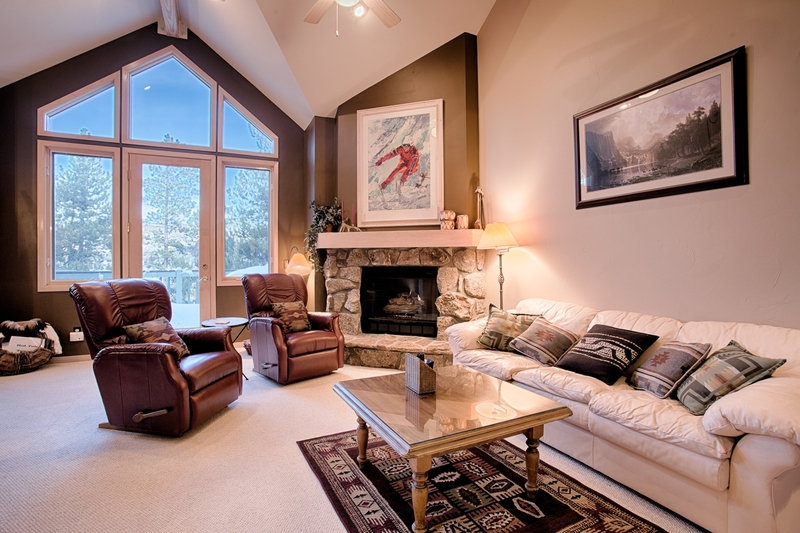 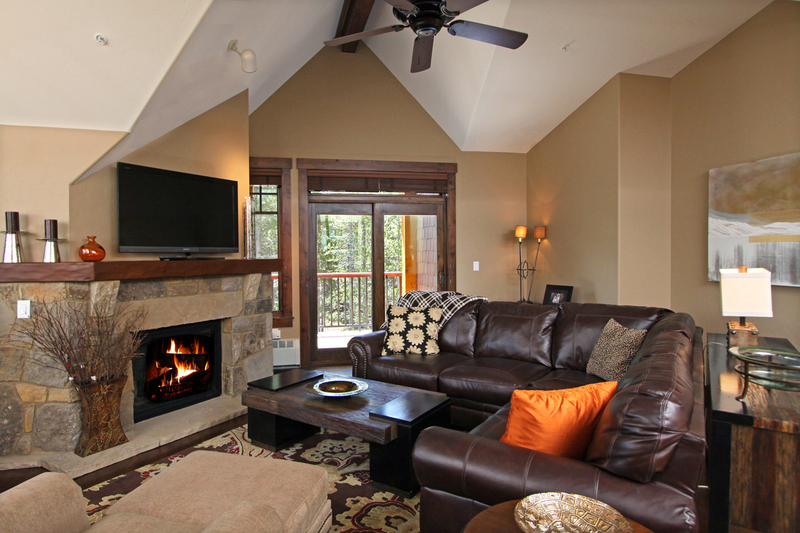 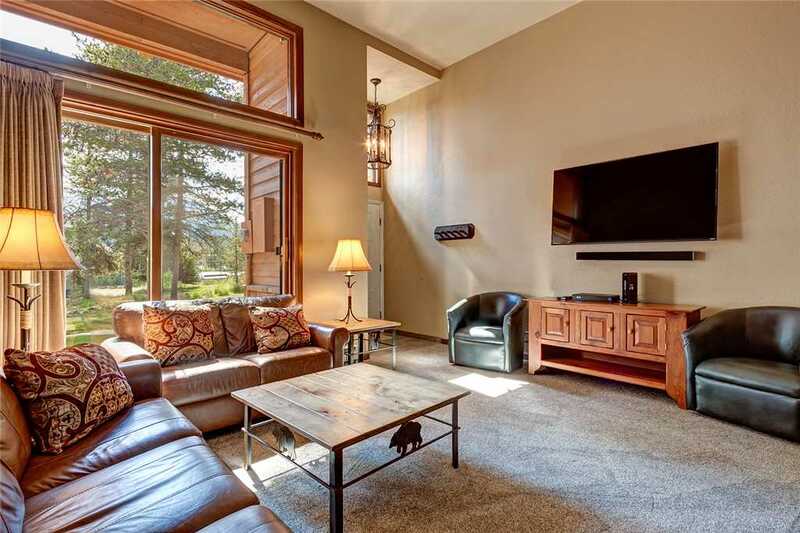 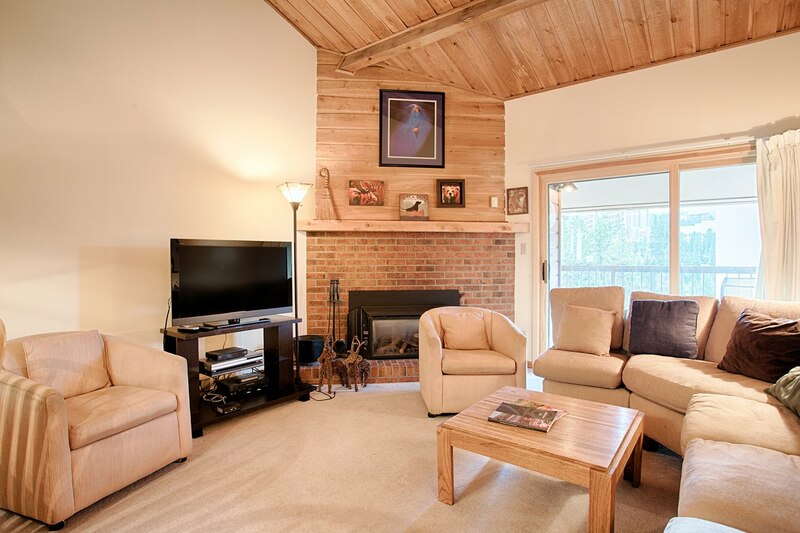 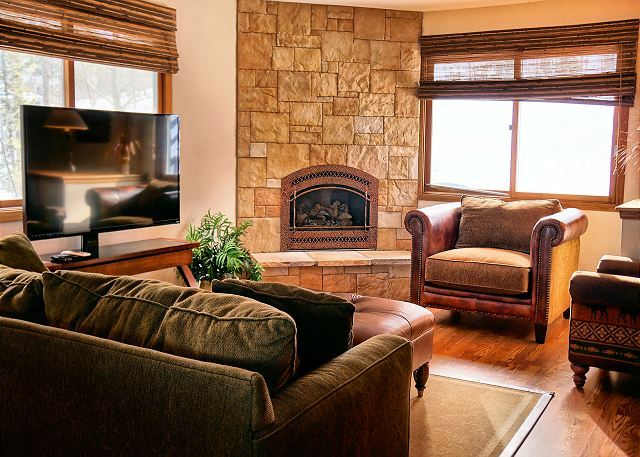 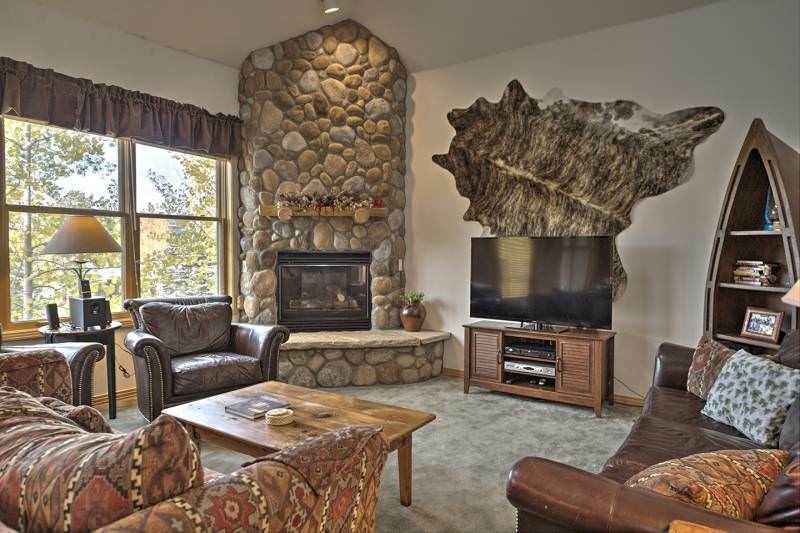 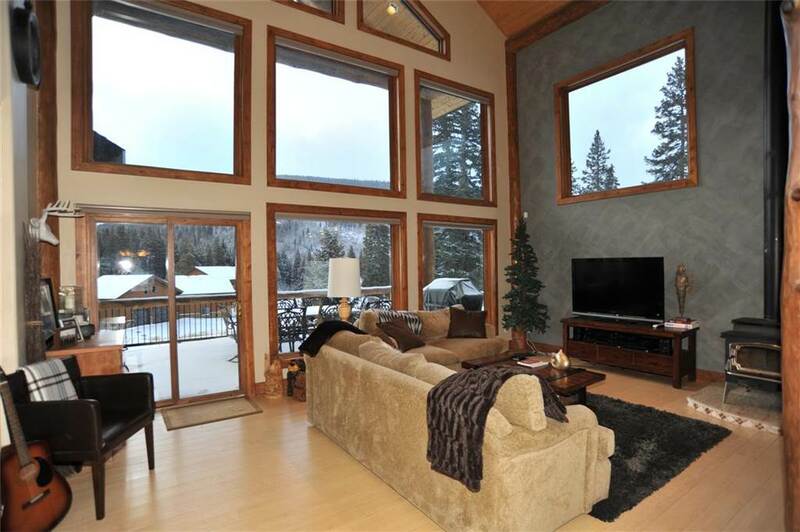 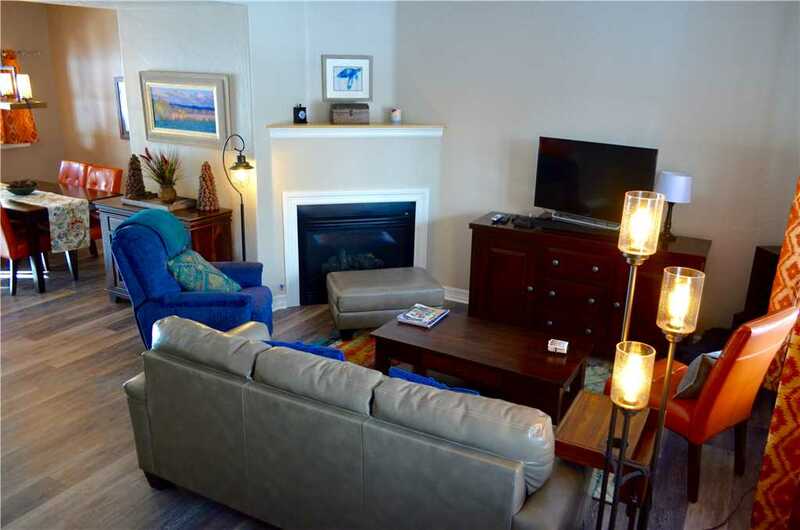 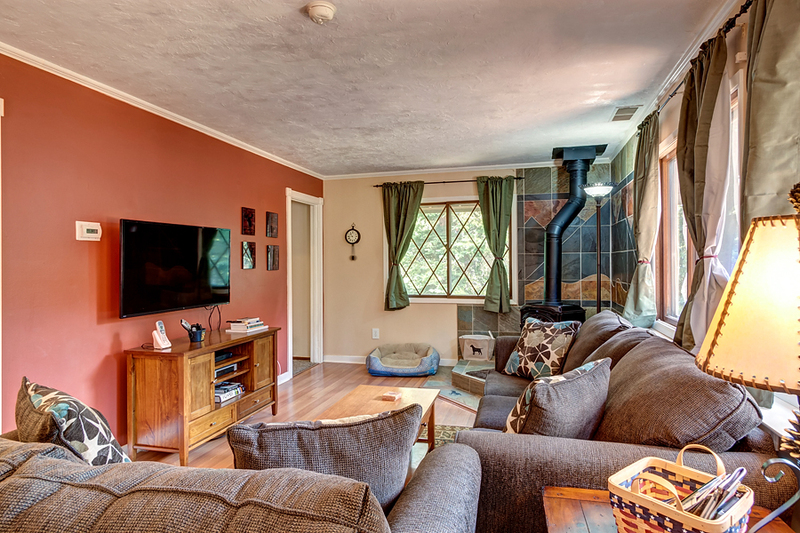 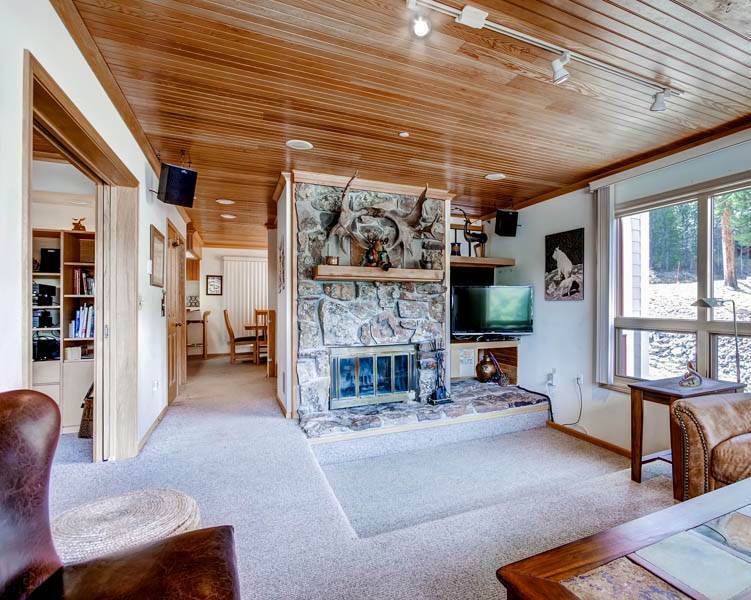 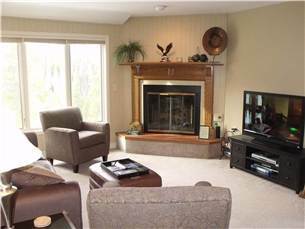 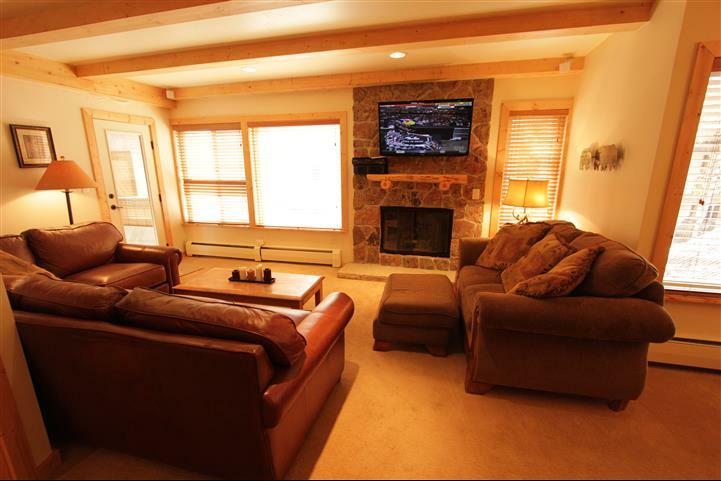 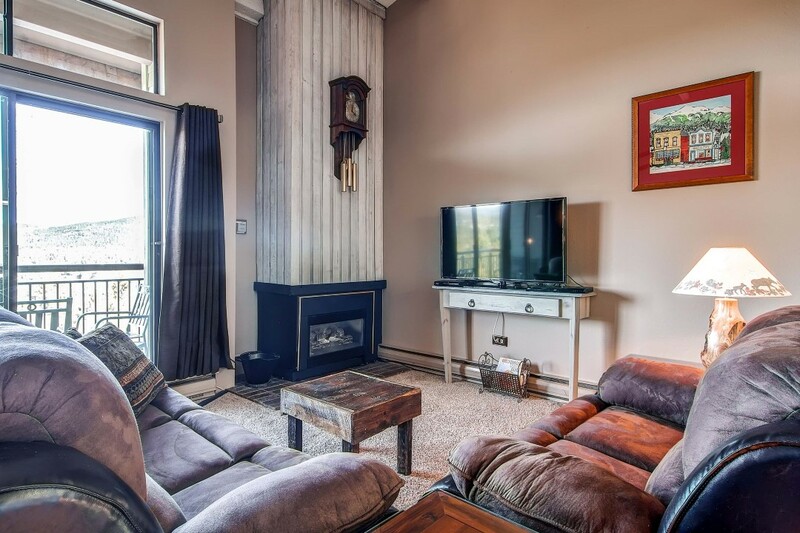 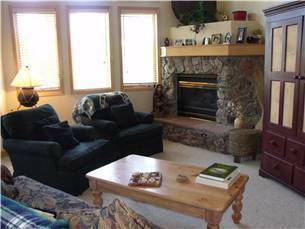 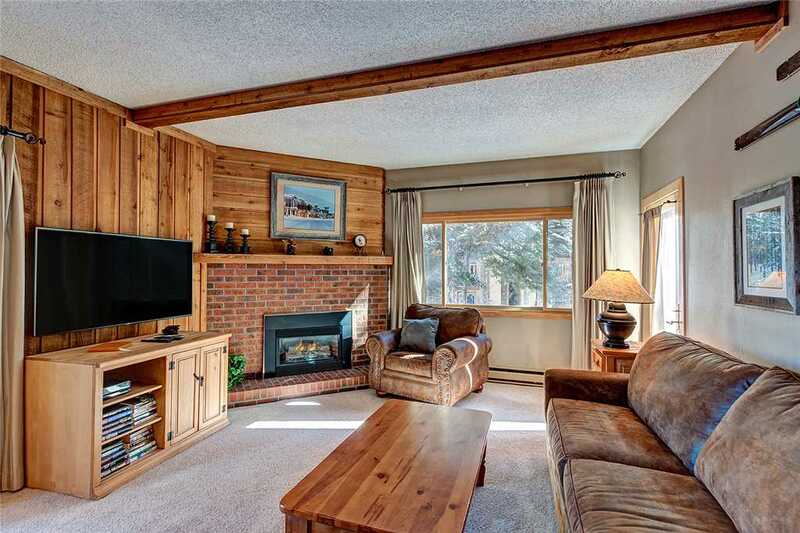 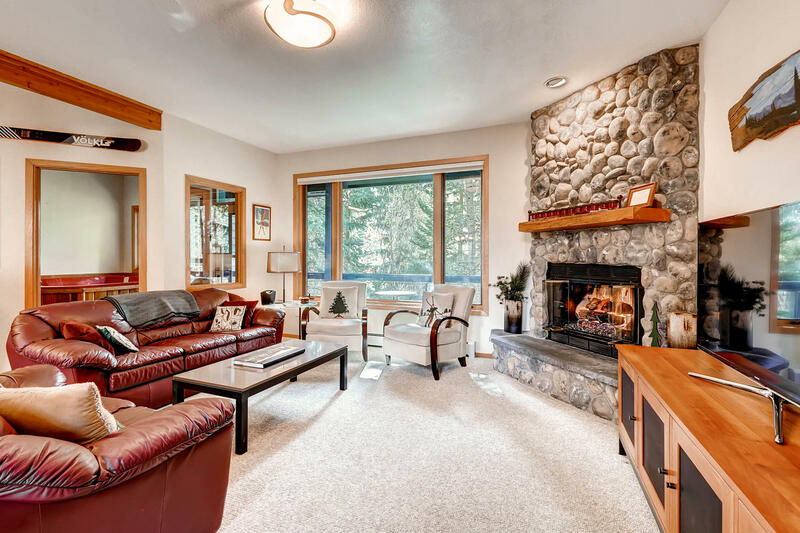 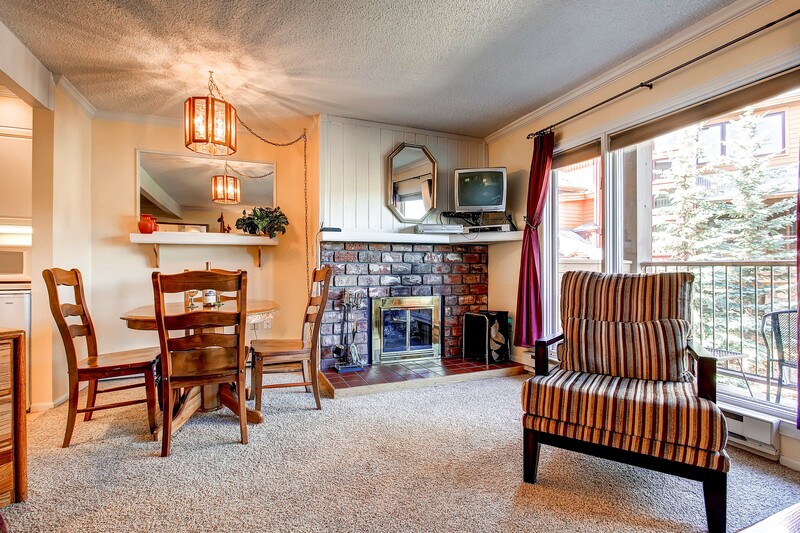 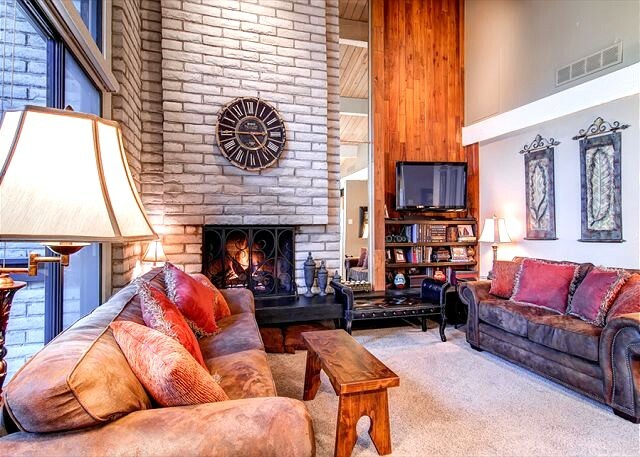 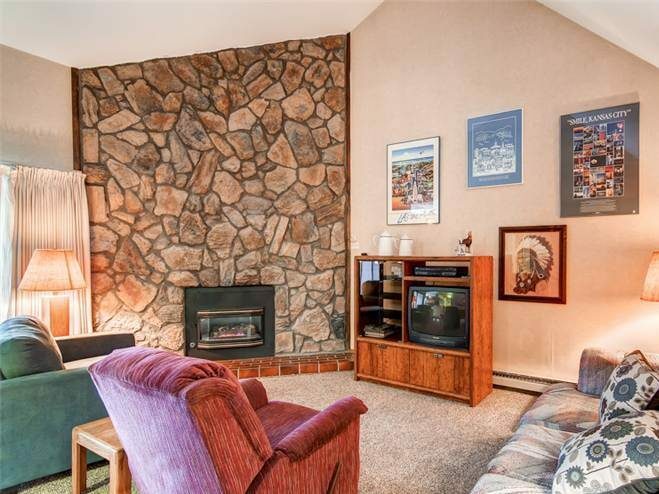 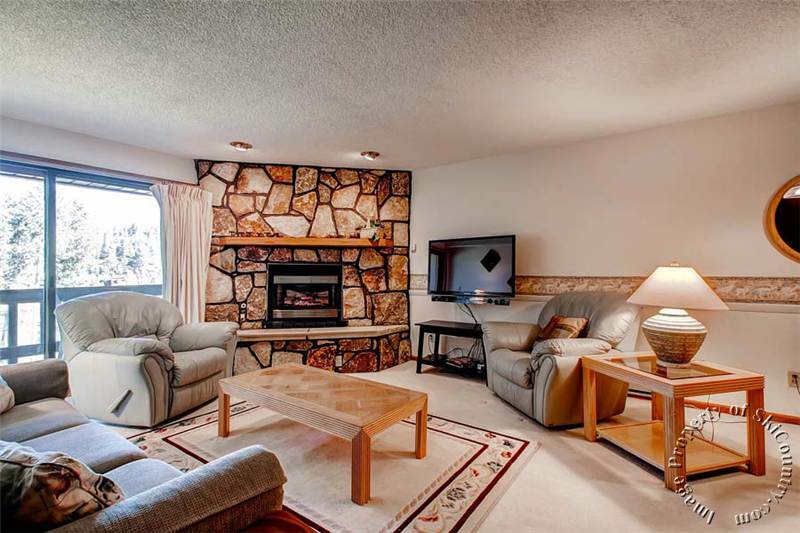 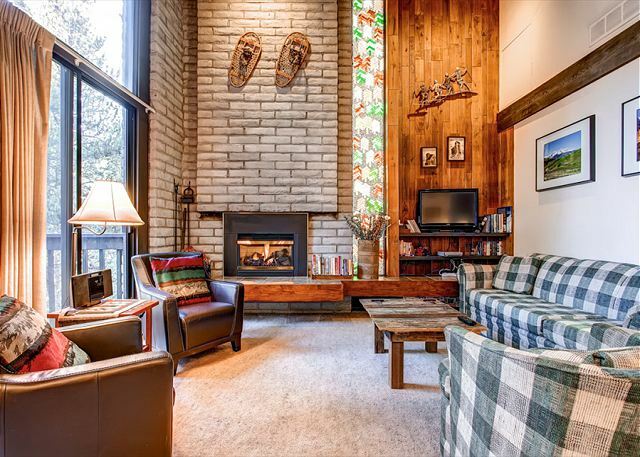 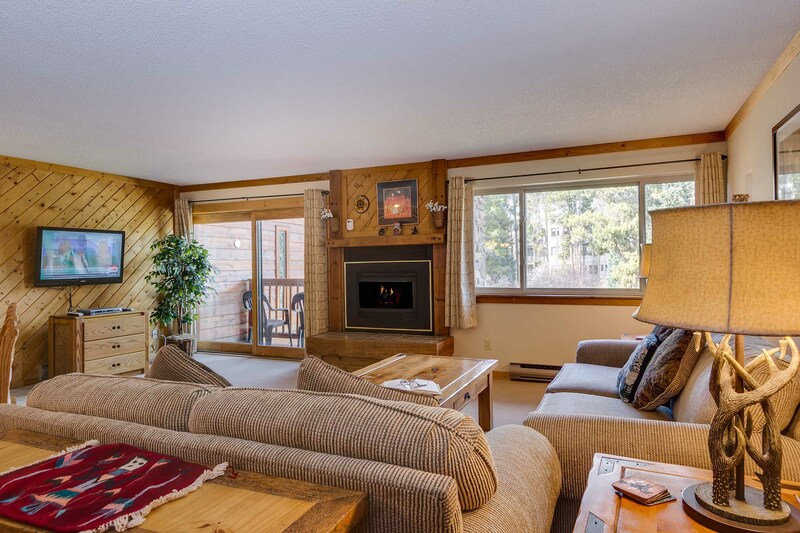 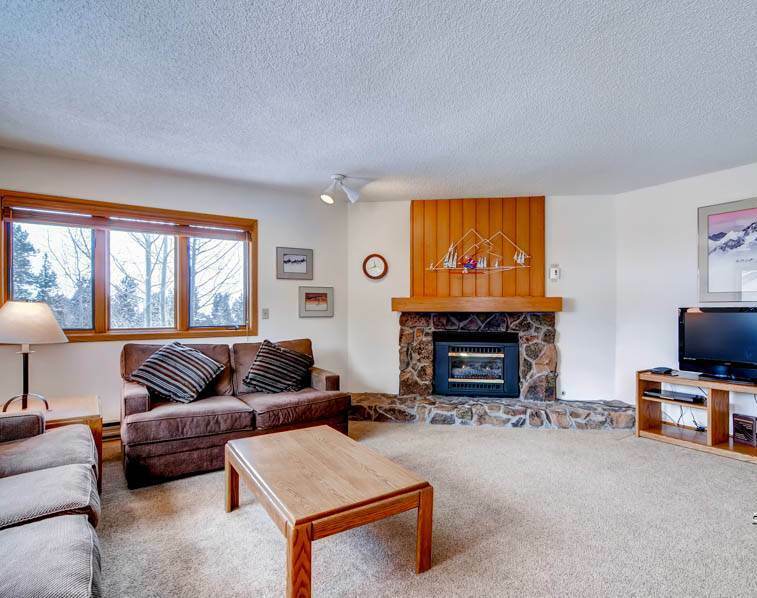 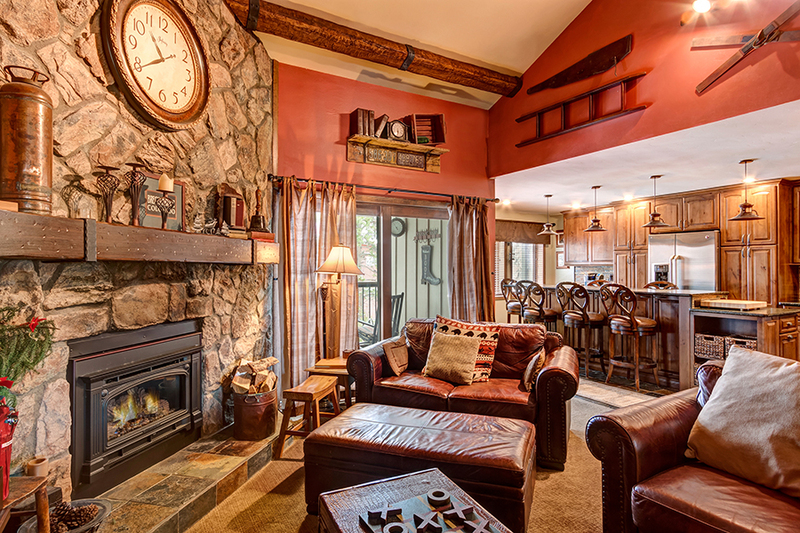 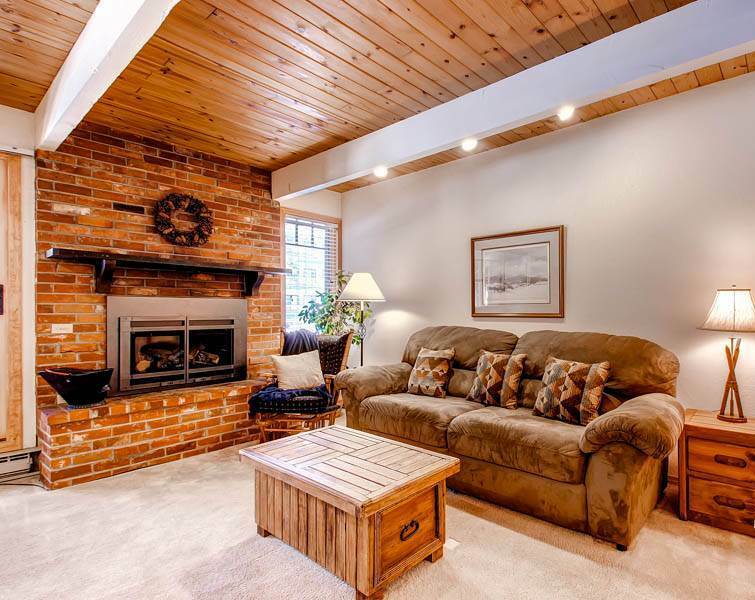 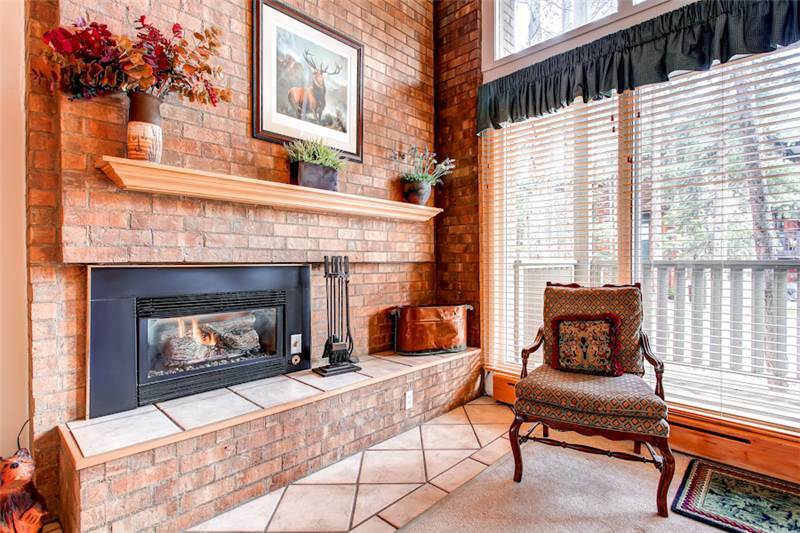 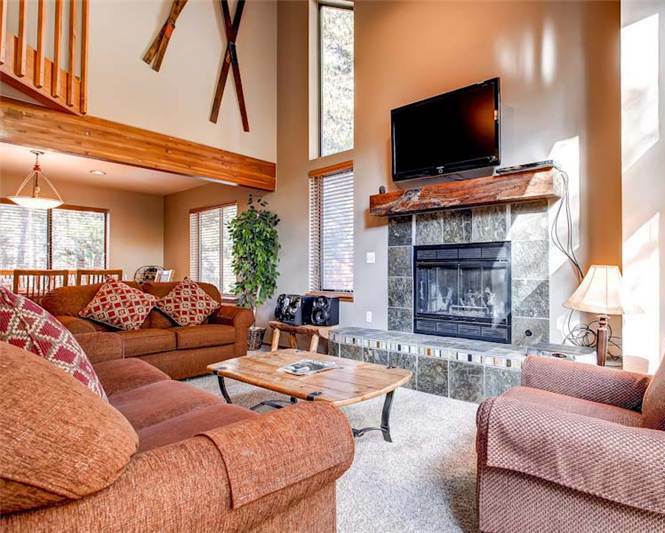 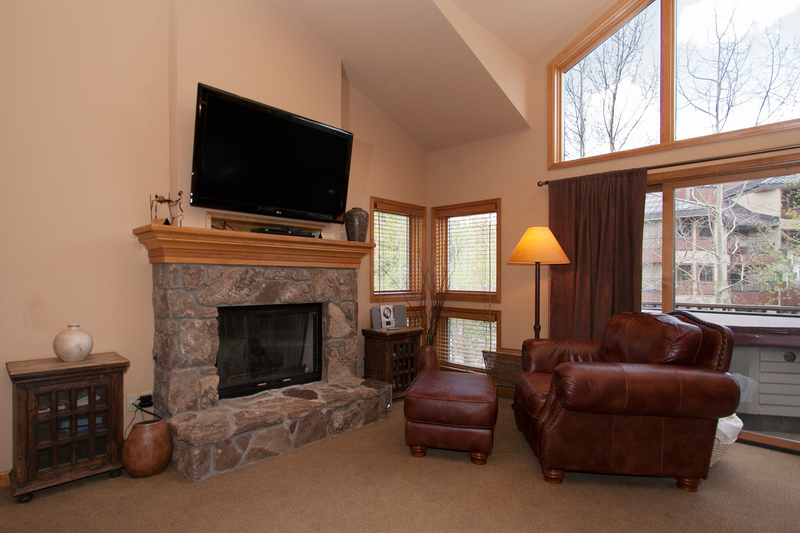 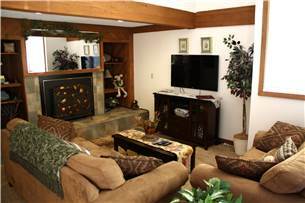 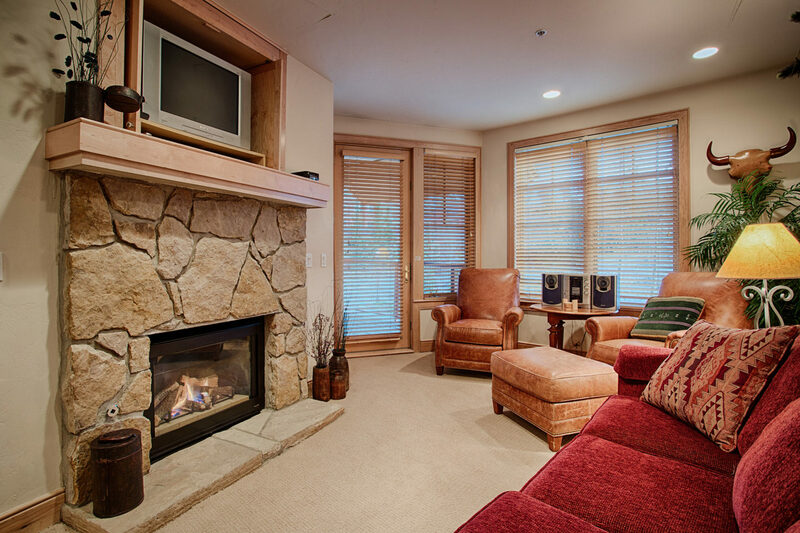 Whether watching a DVD movie, streaming your own Netflix from the 42″ Smart HD TV or reading your vacation book with a cup of hot cocoa, the warmth from the gas fireplace will make you feel right at home. 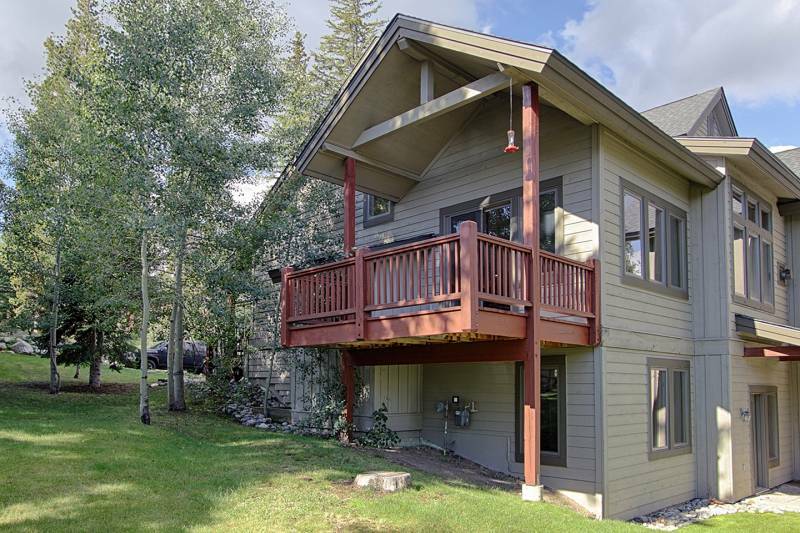 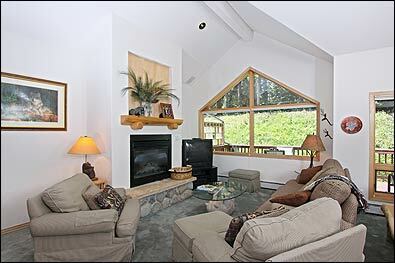 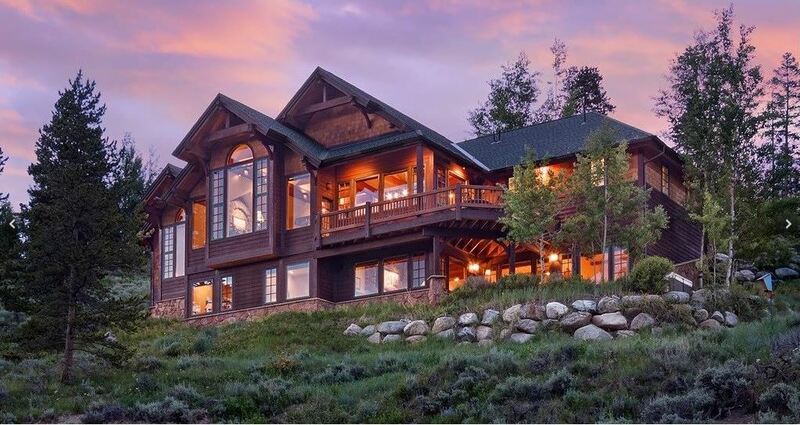 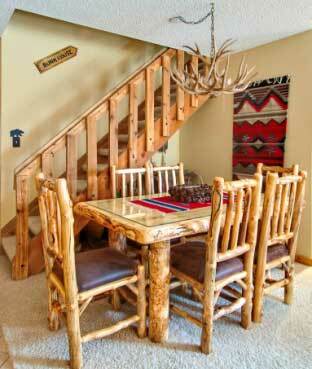 On the warm days and exquisite summer months, relax on your private deck and take in the fresh mountain air. 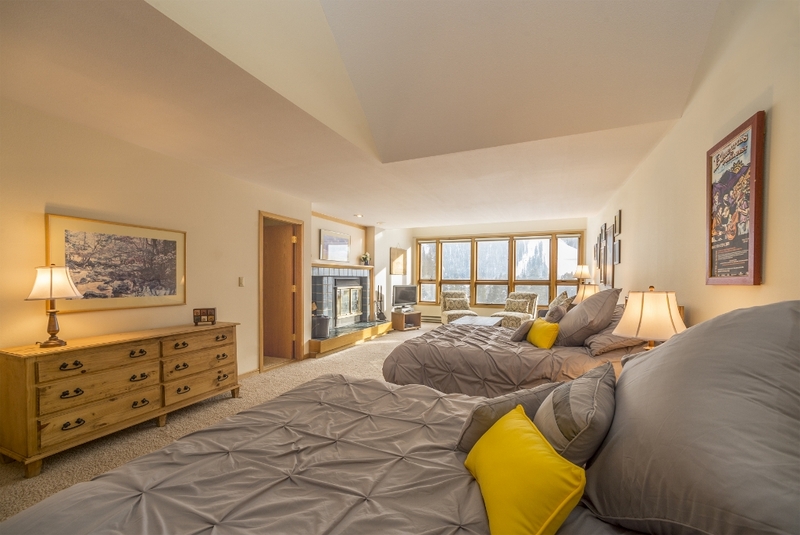 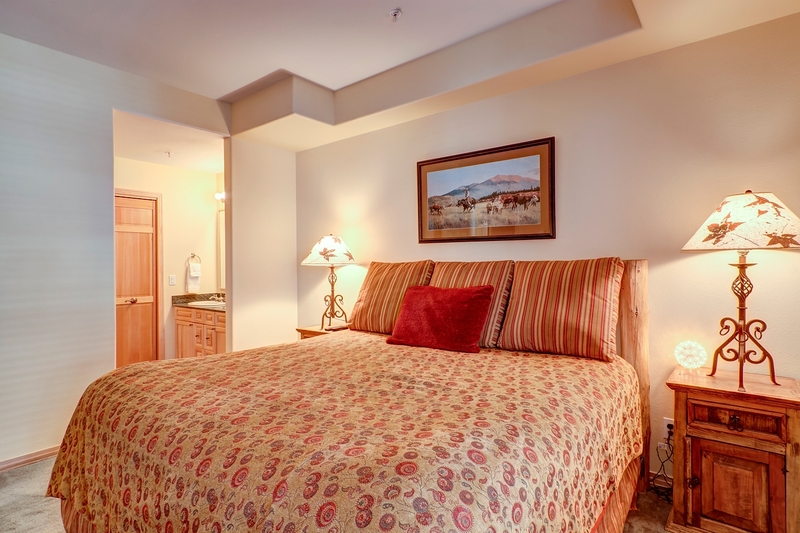 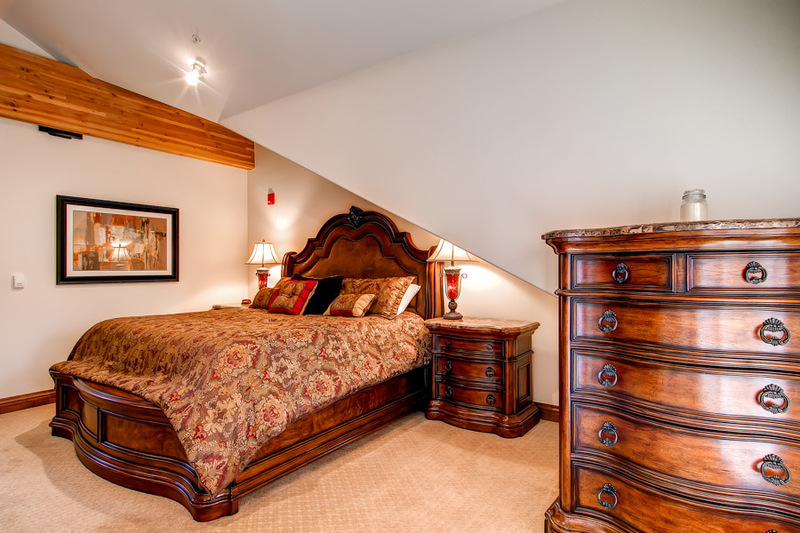 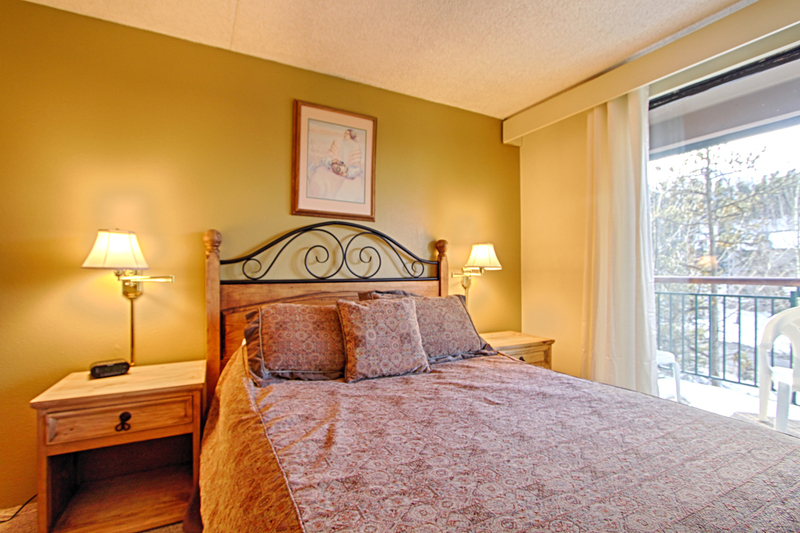 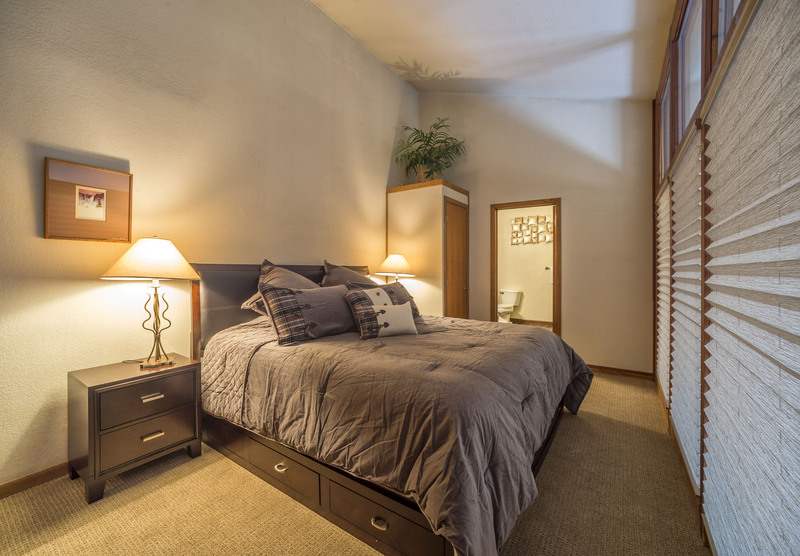 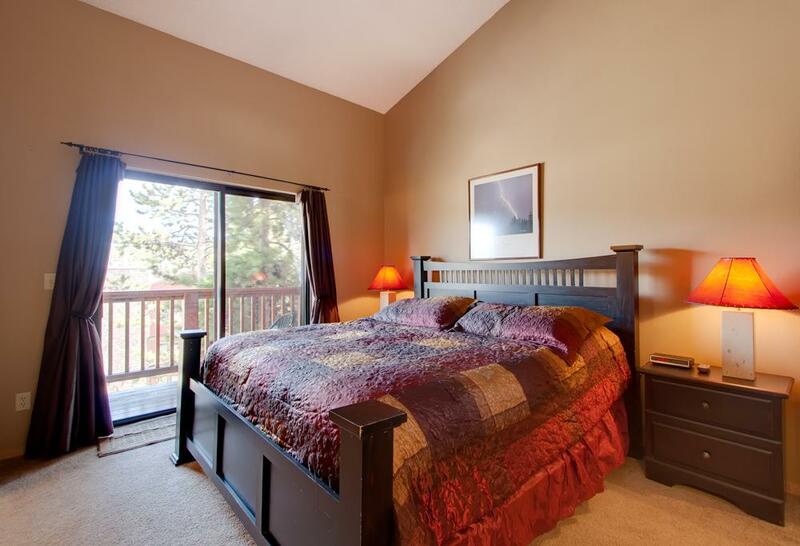 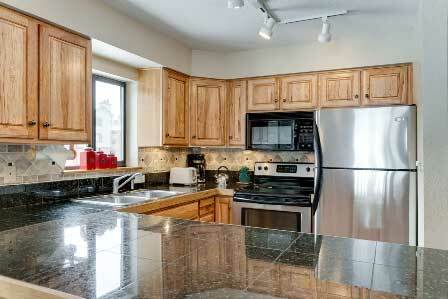 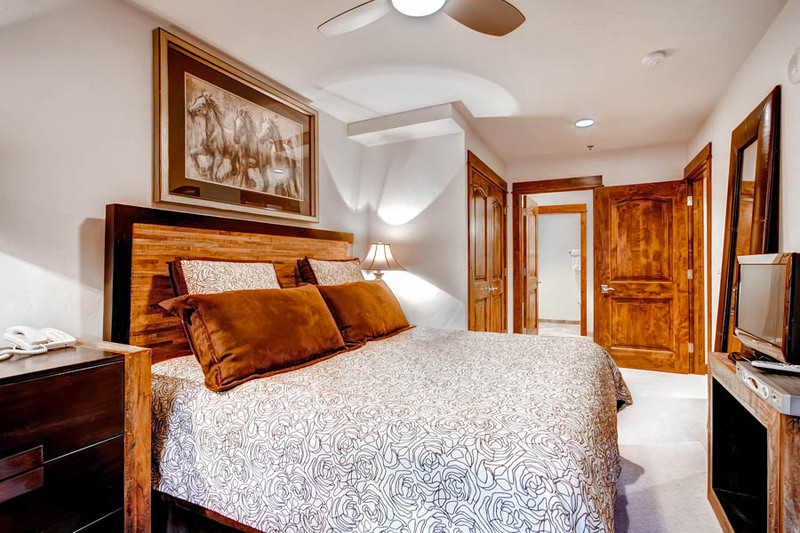 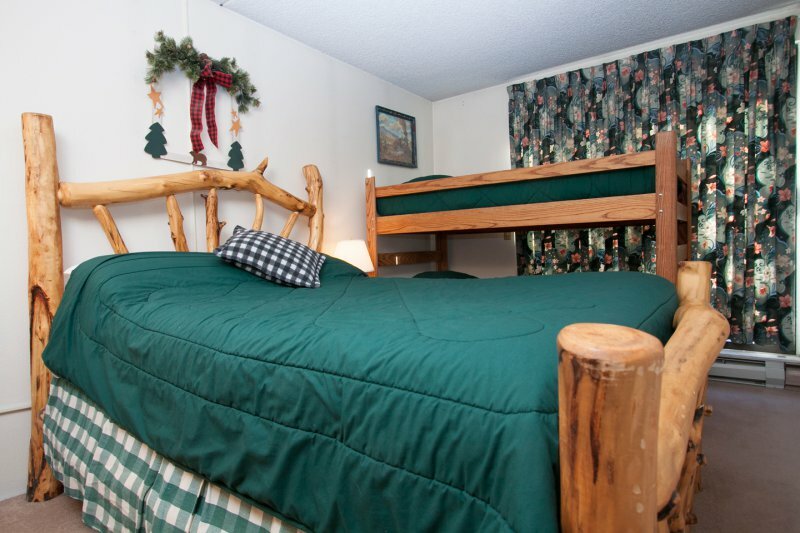 The bedroom offers a King bed encased in comfortable, luxurious bedding and access to the private deck for the unit. 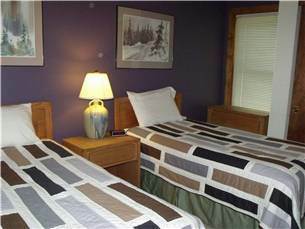 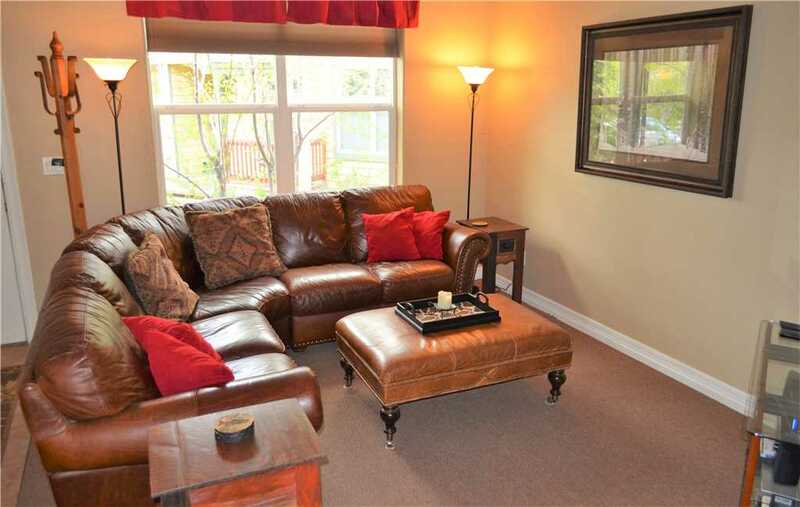 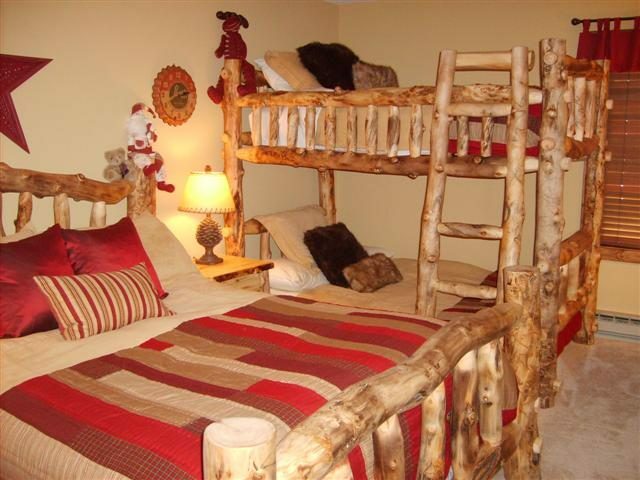 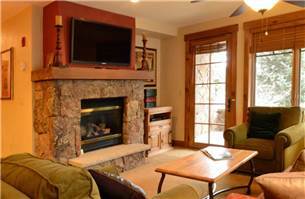 Between the bedroom and the queen sofa sleeper provided, the unit can accommodate four people. 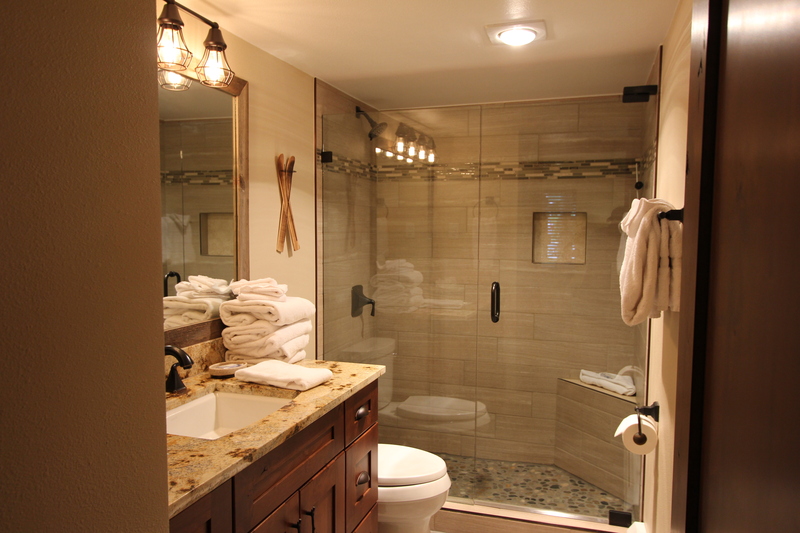 After a long day playing outdoors, enjoy a hot shower or relaxing bath. 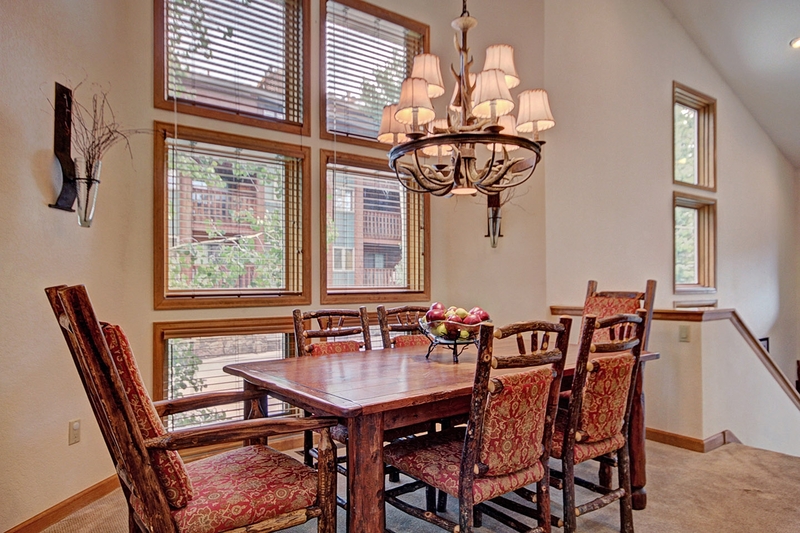 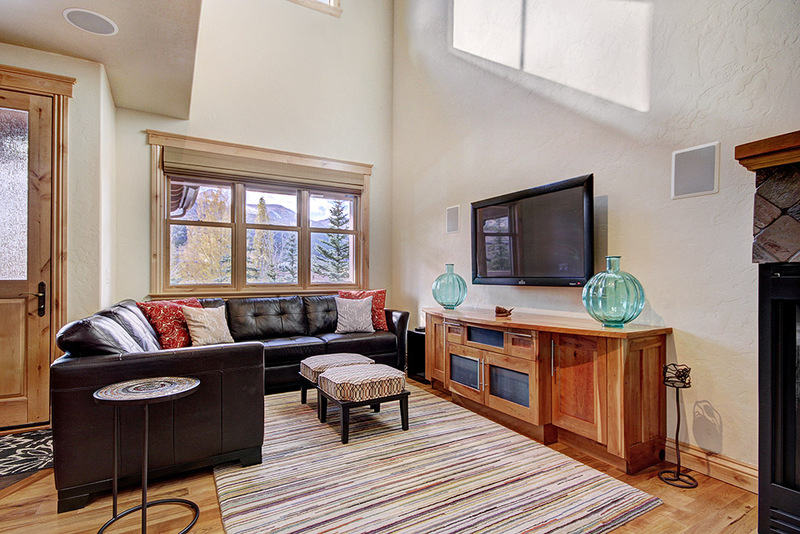 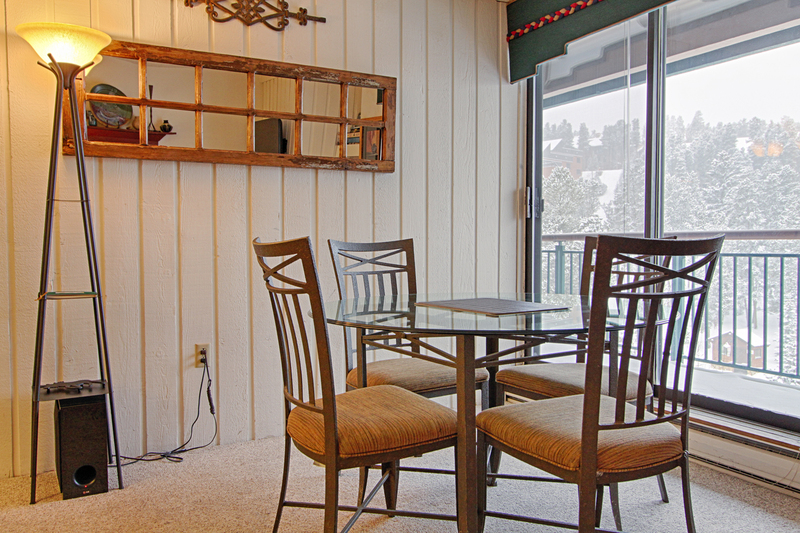 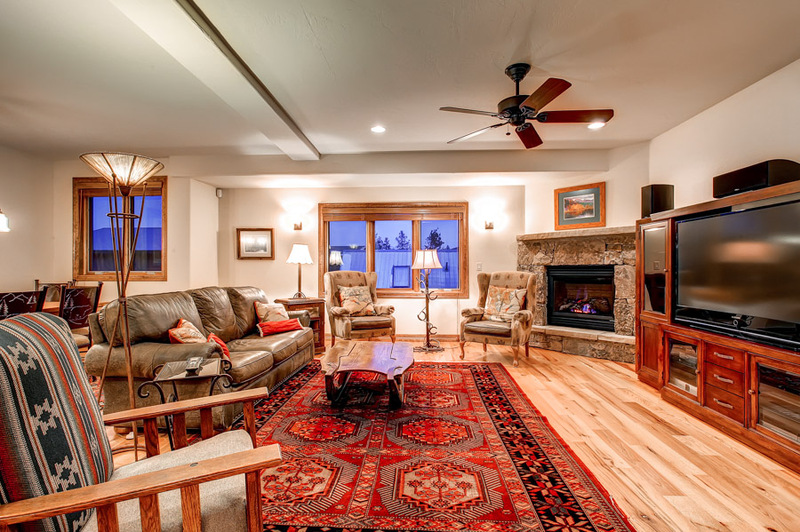 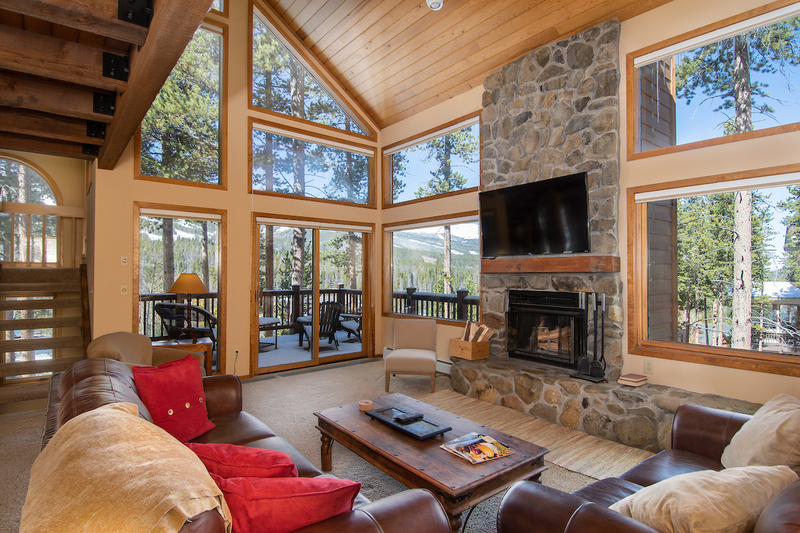 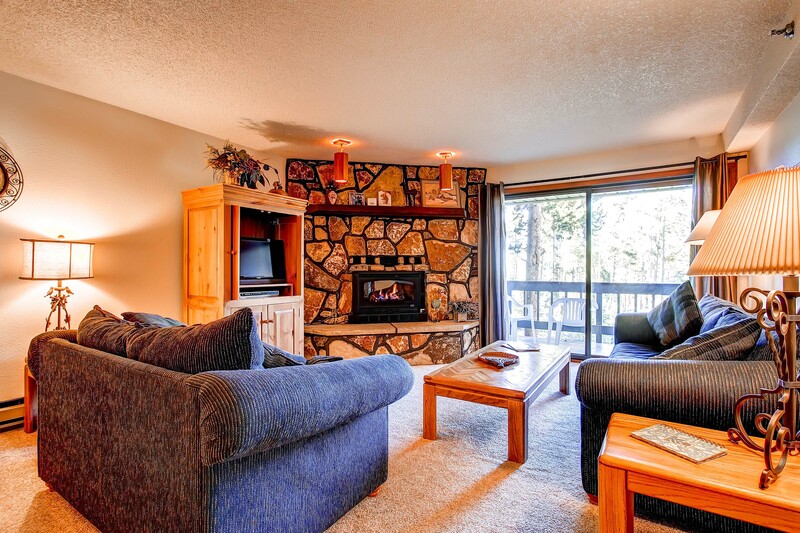 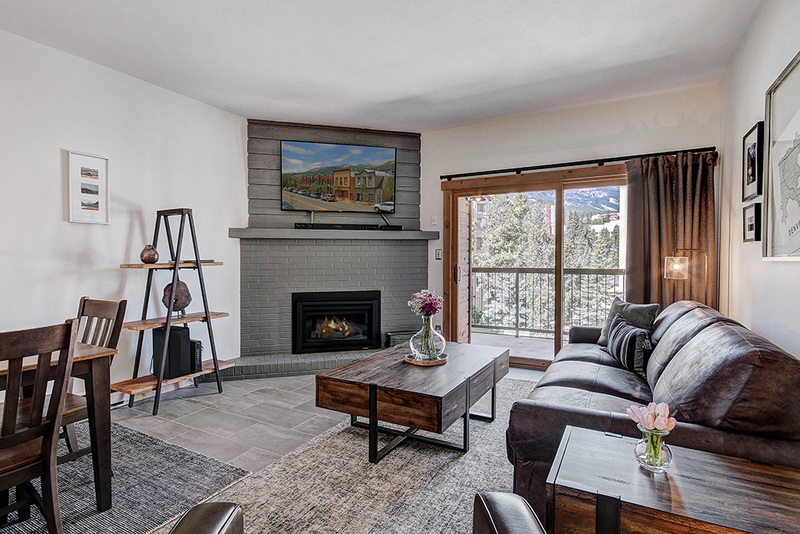 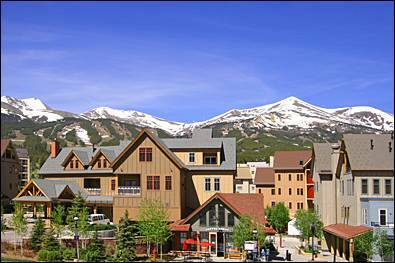 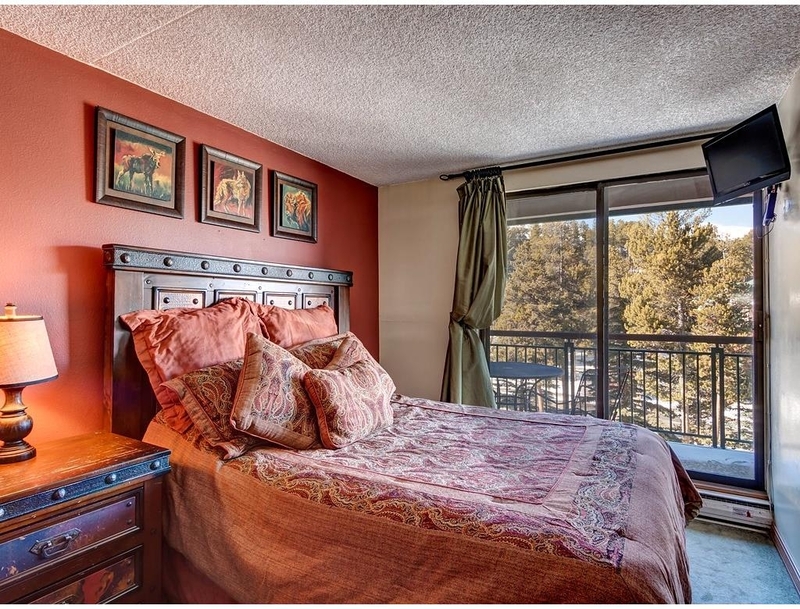 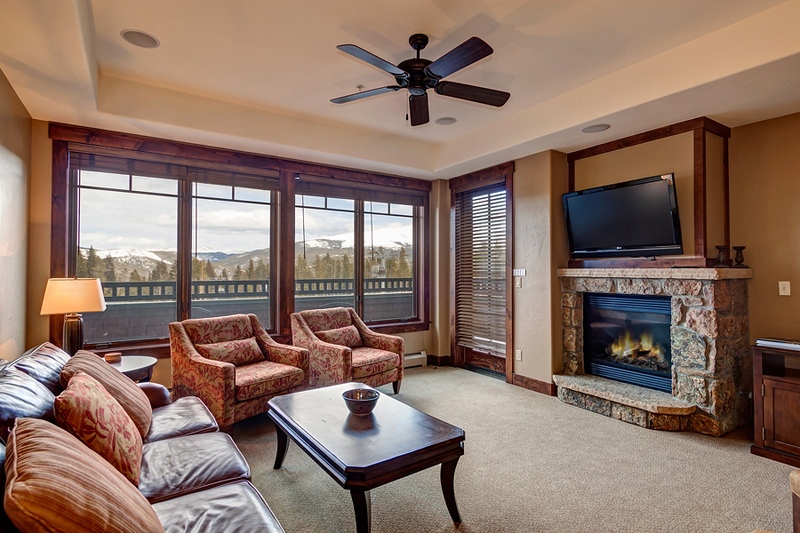 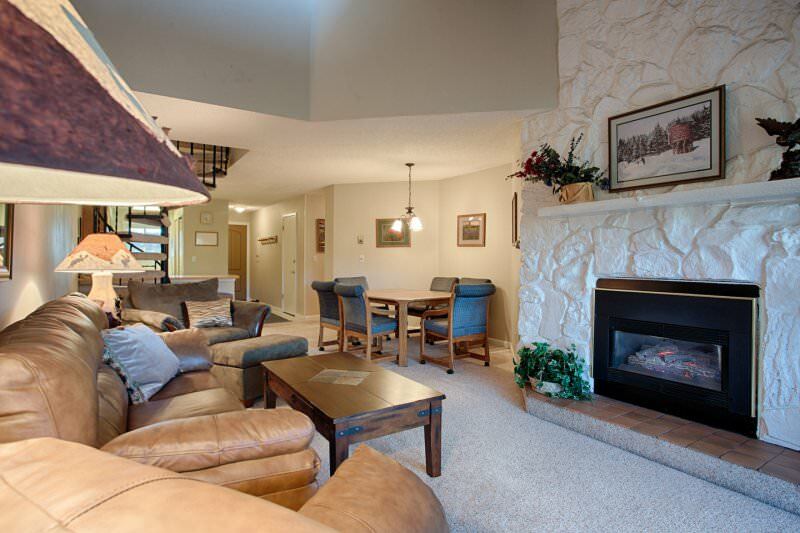 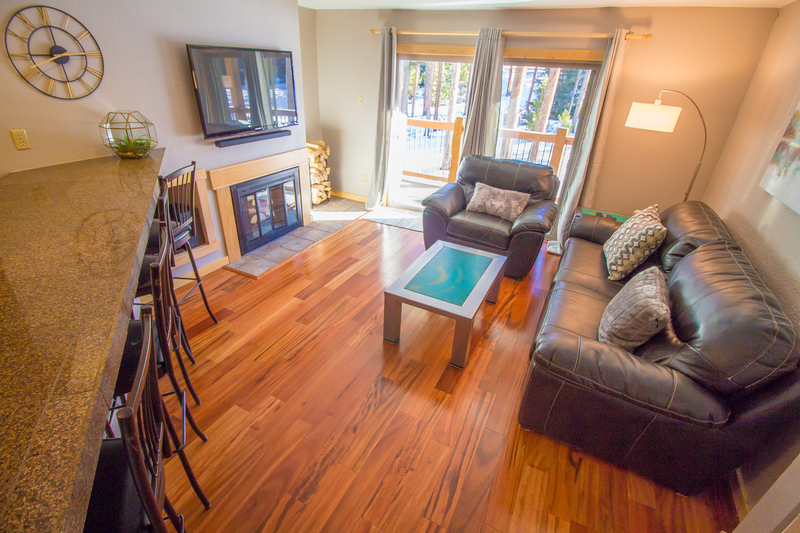 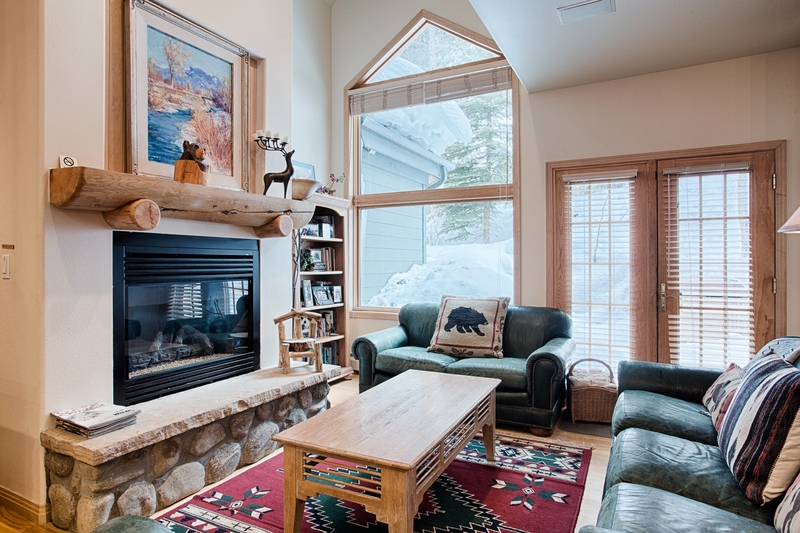 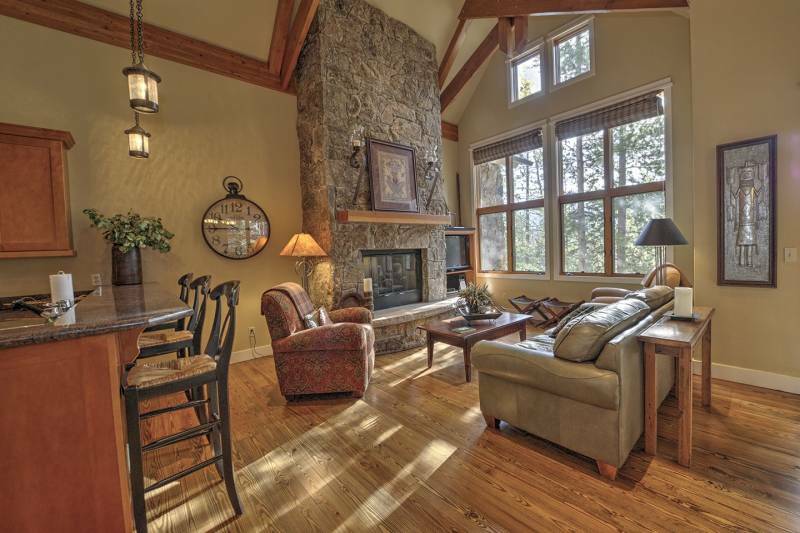 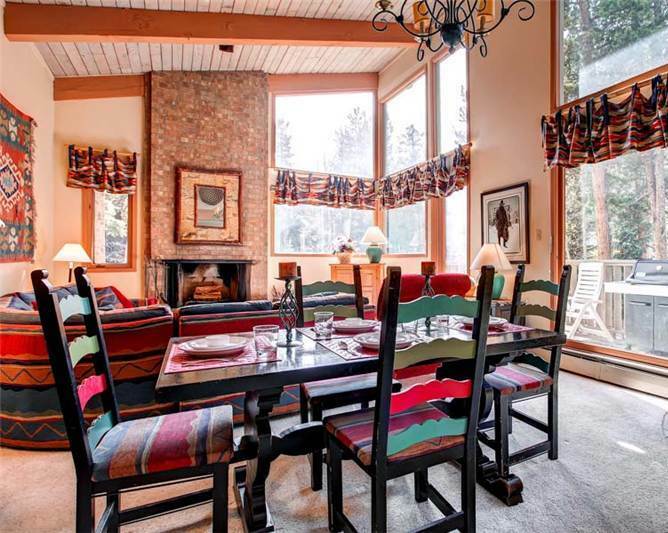 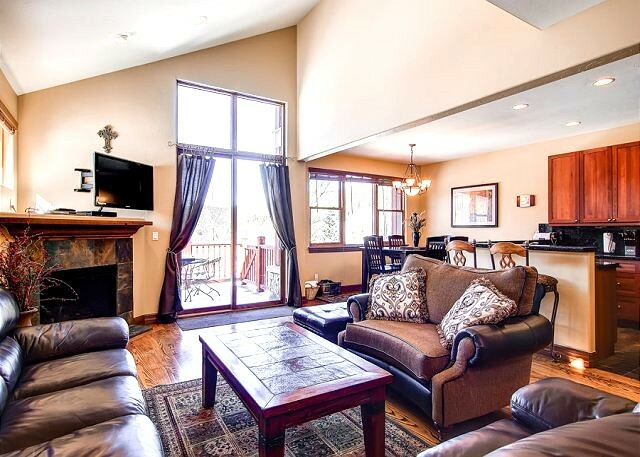 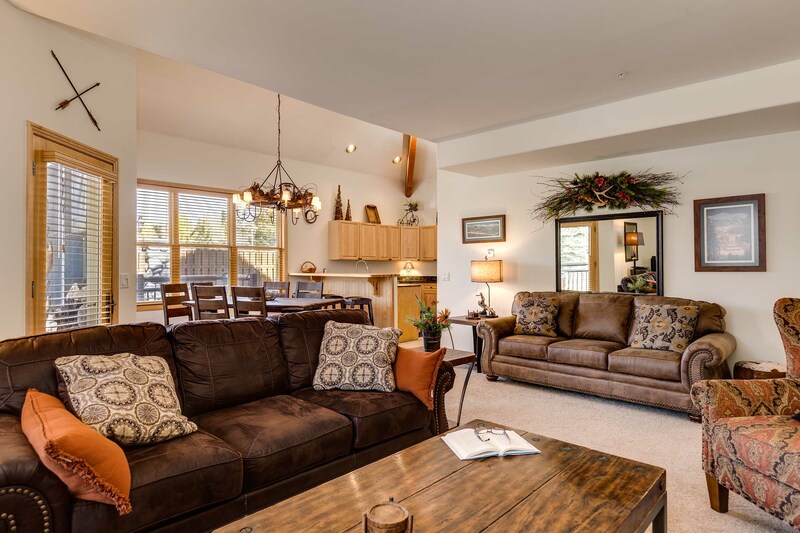 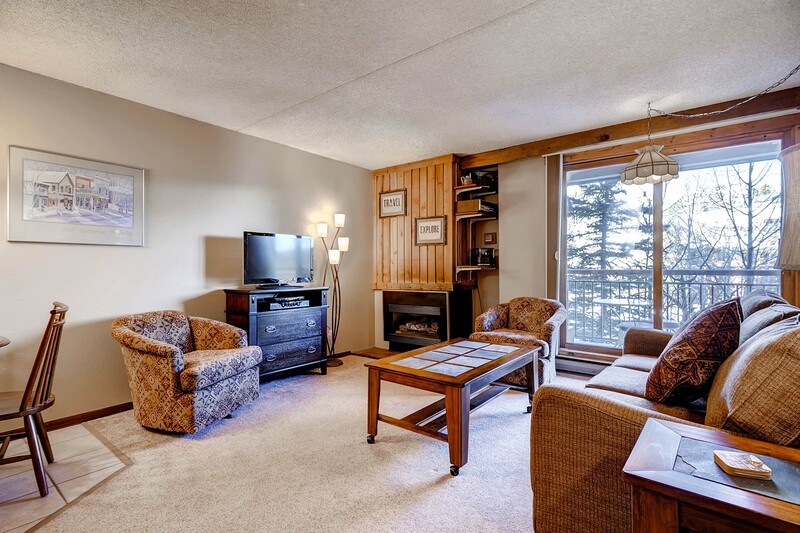 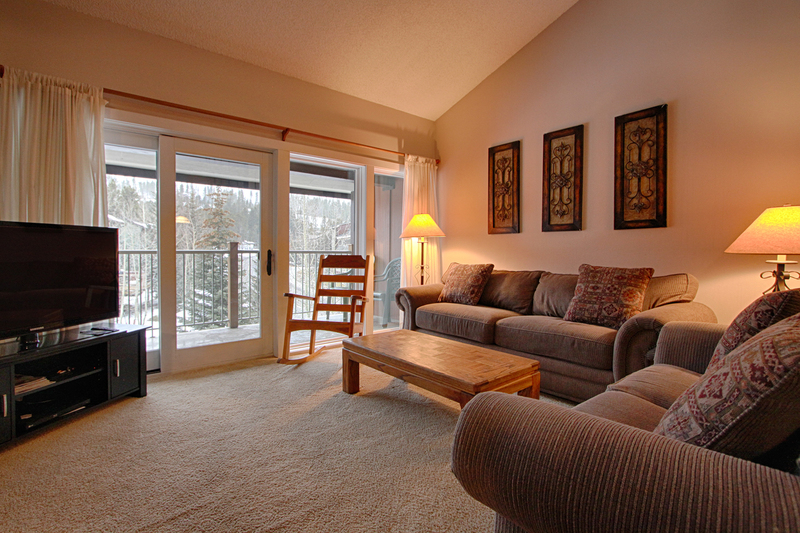 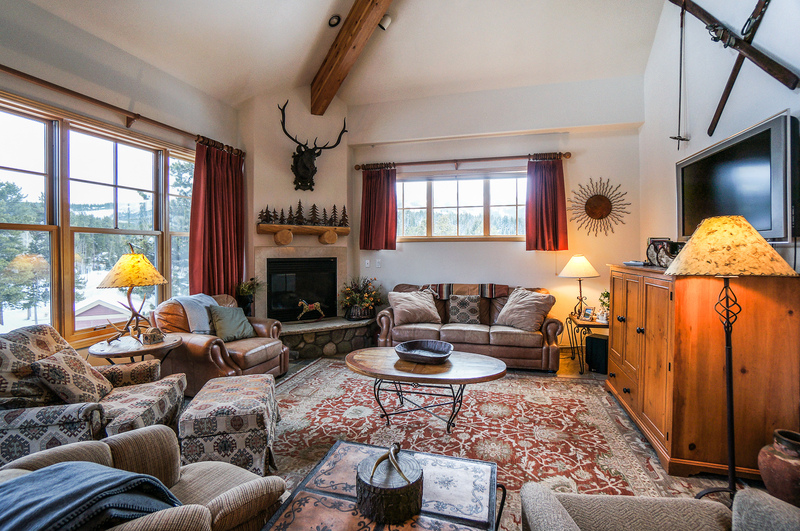 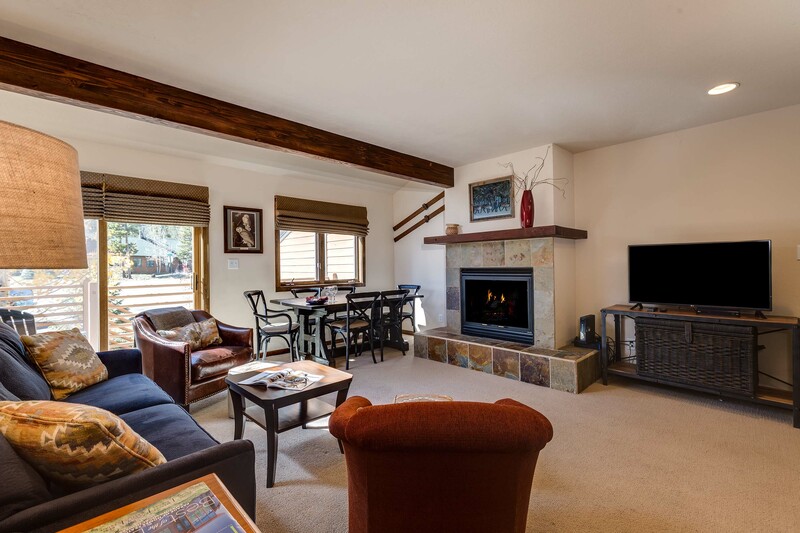 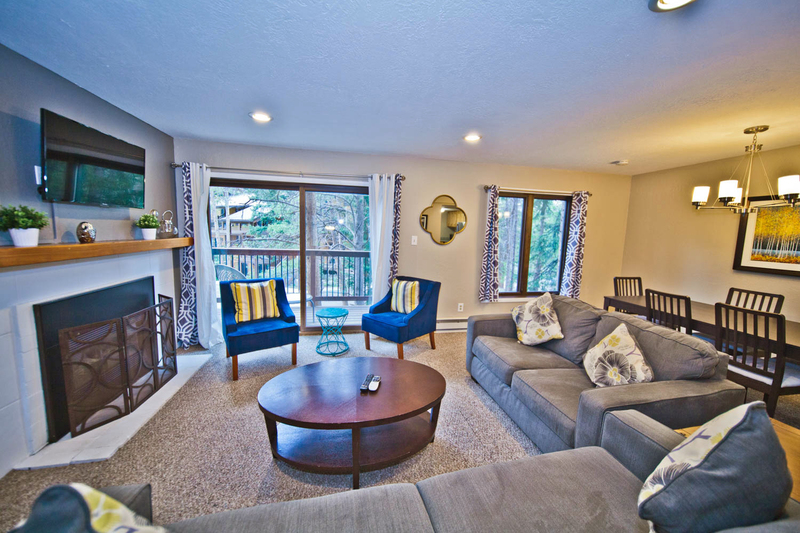 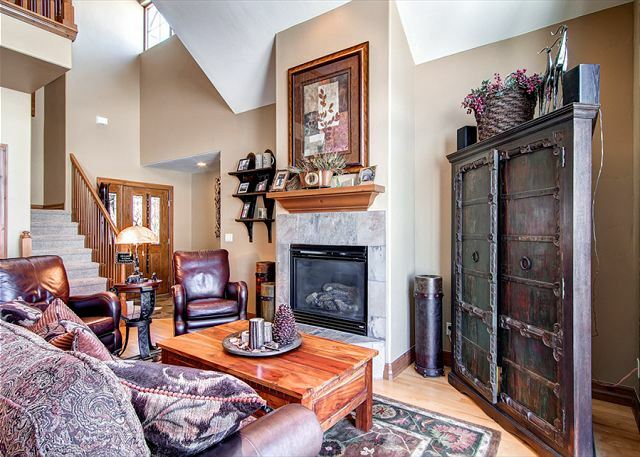 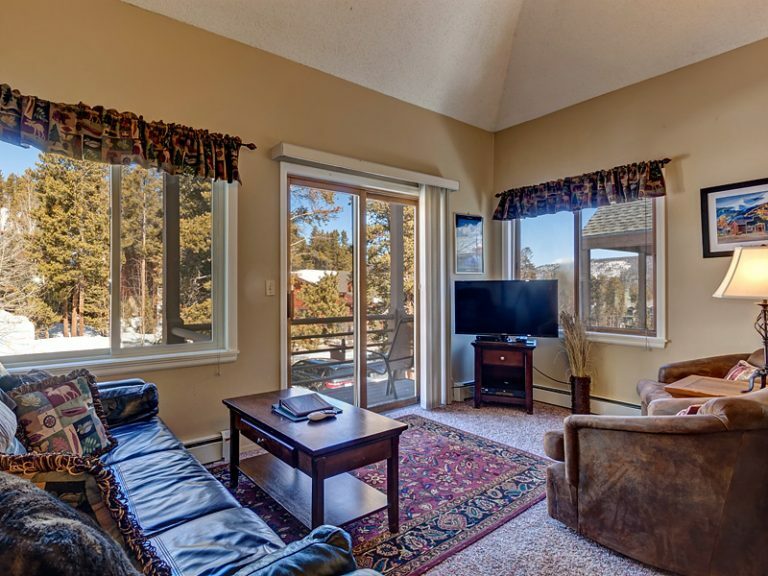 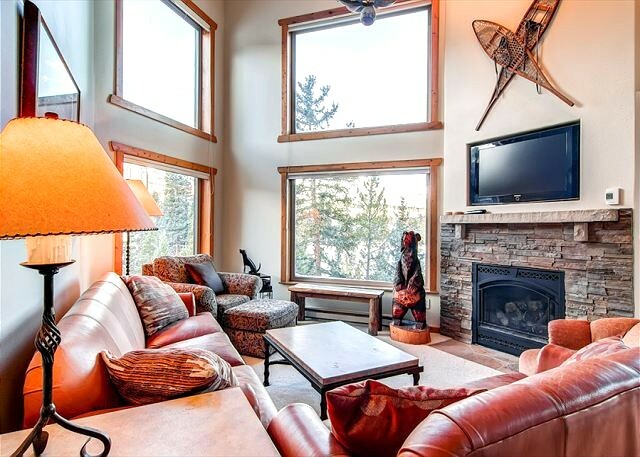 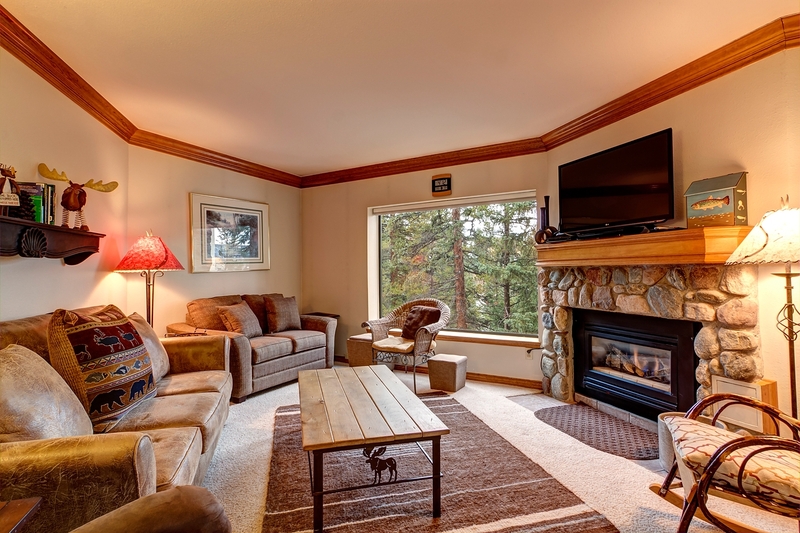 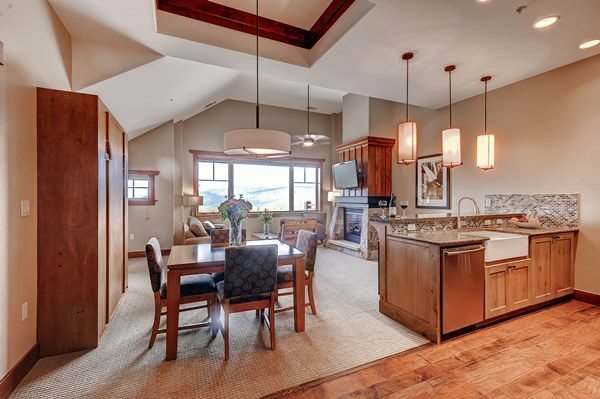 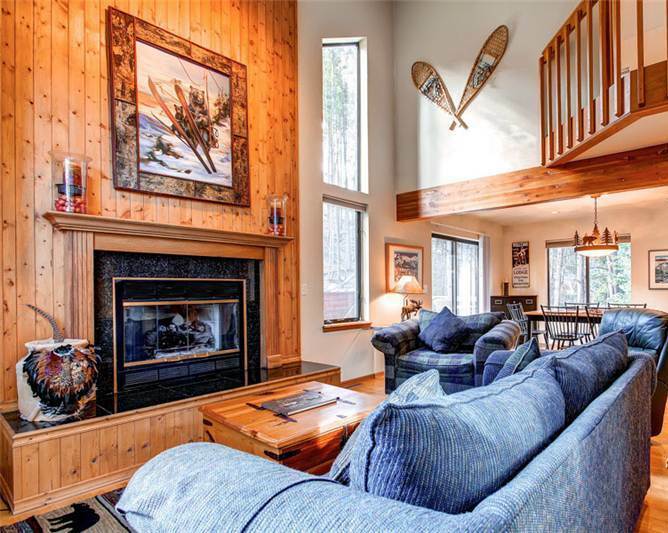 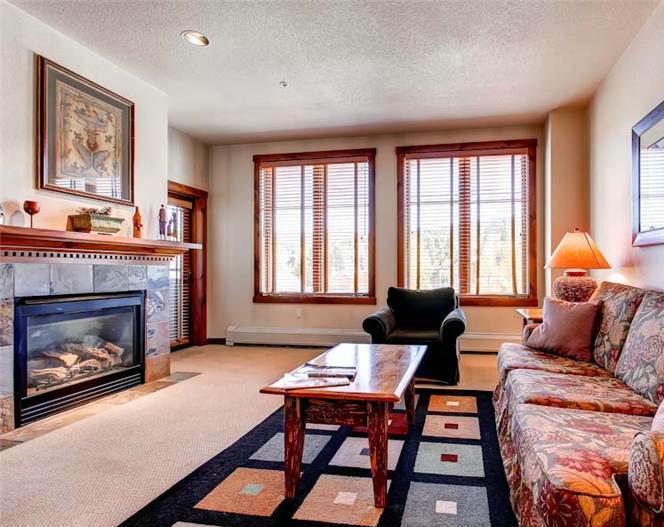 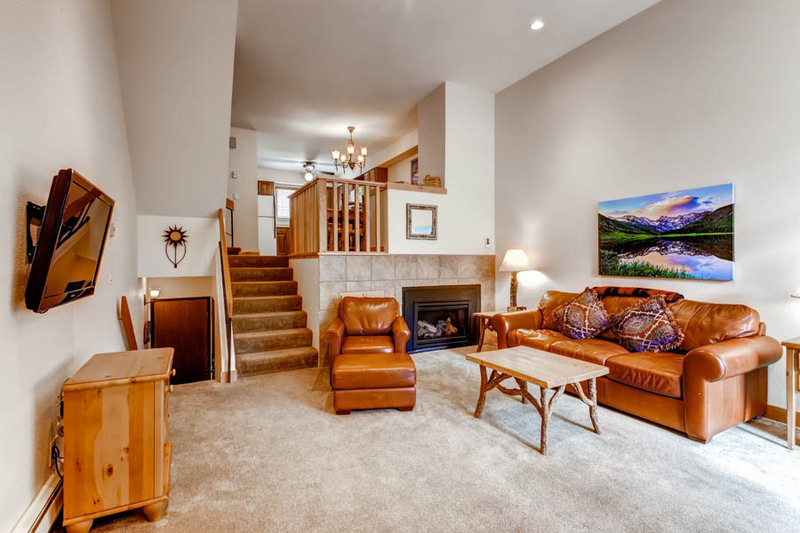 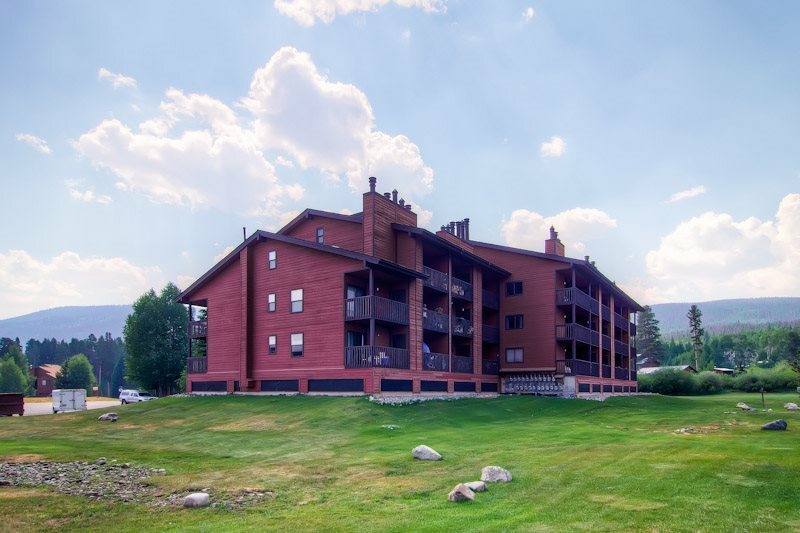 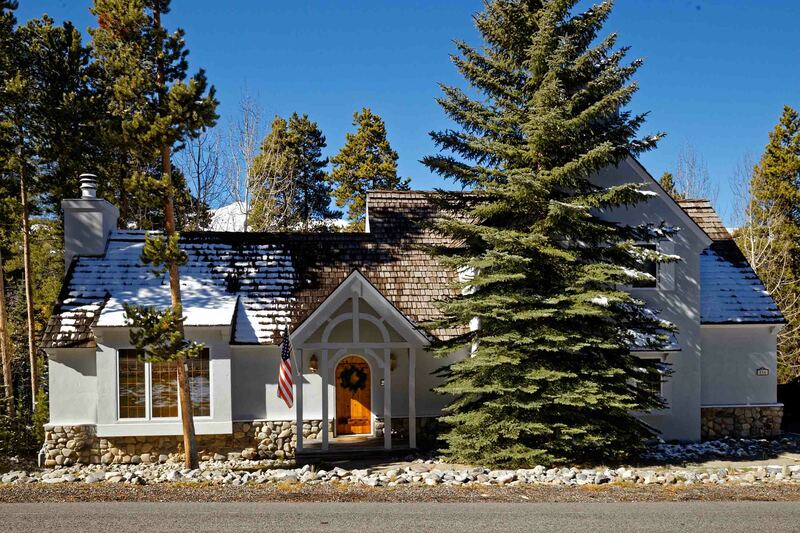 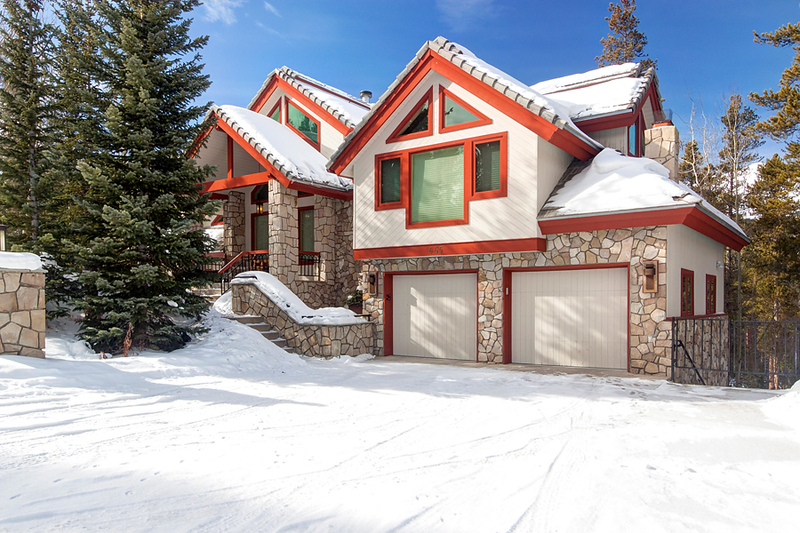 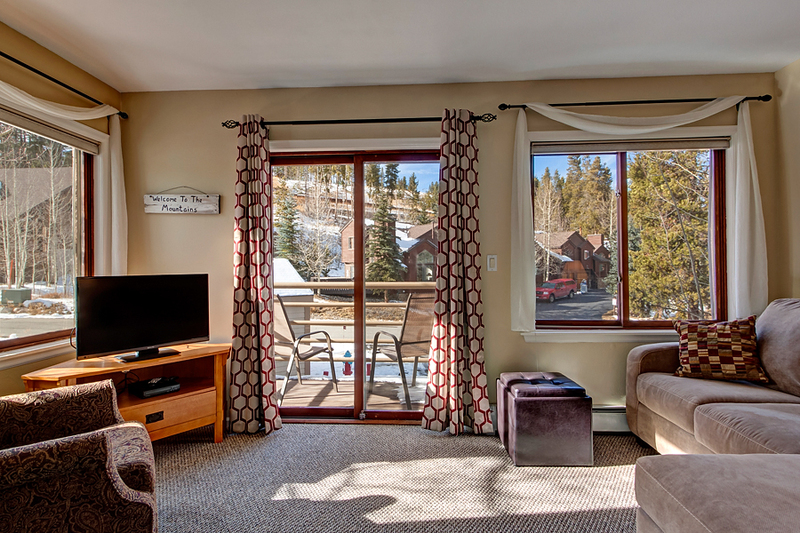 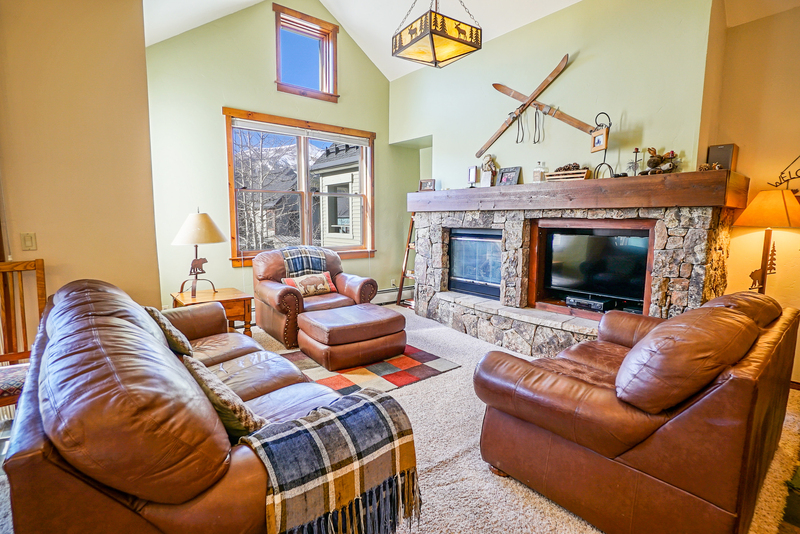 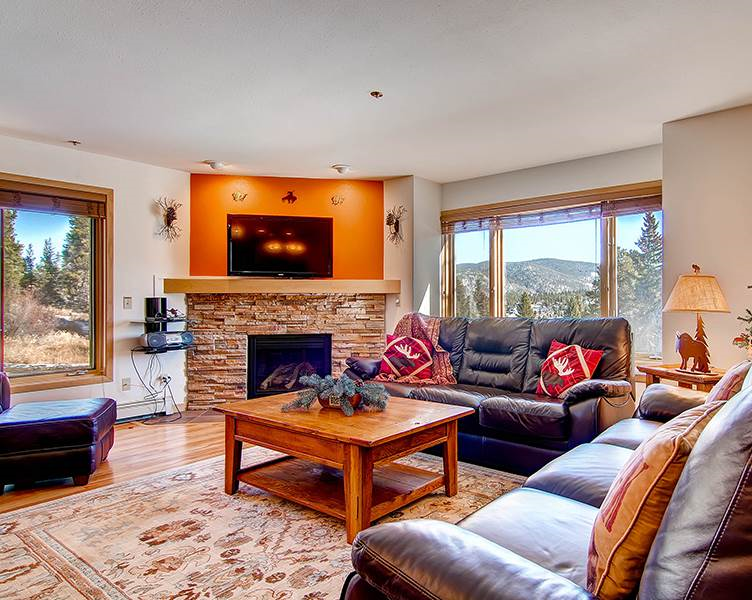 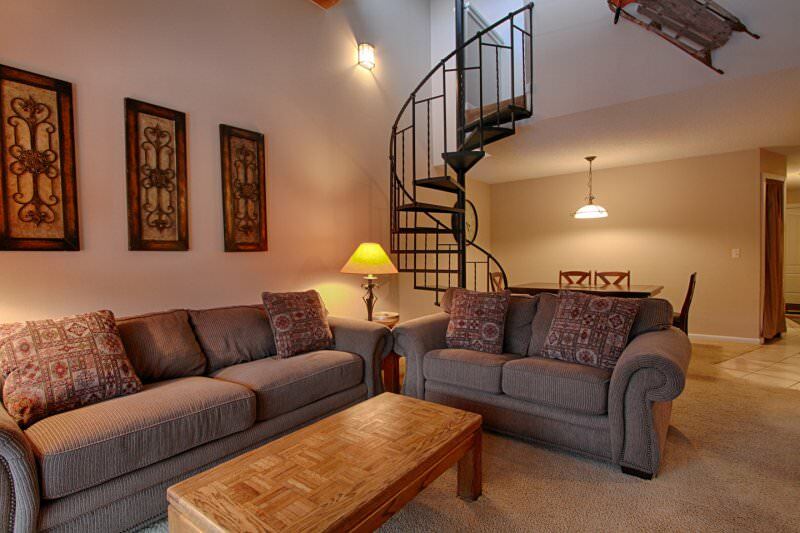 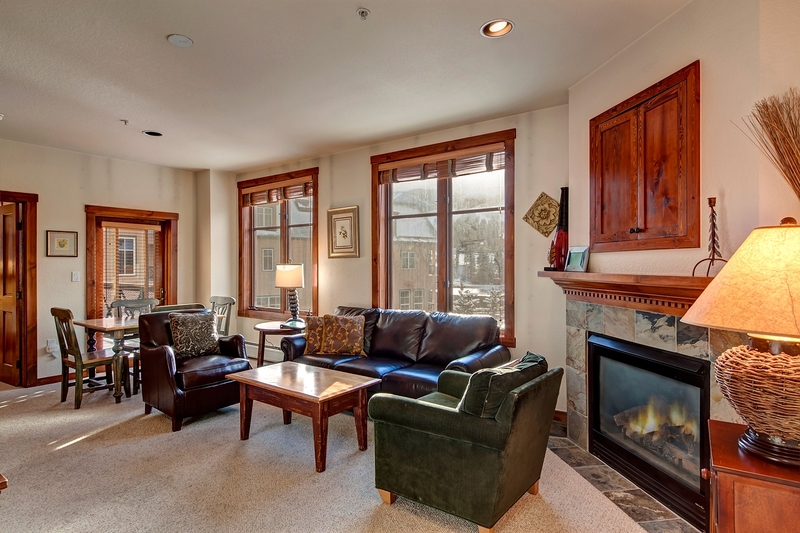 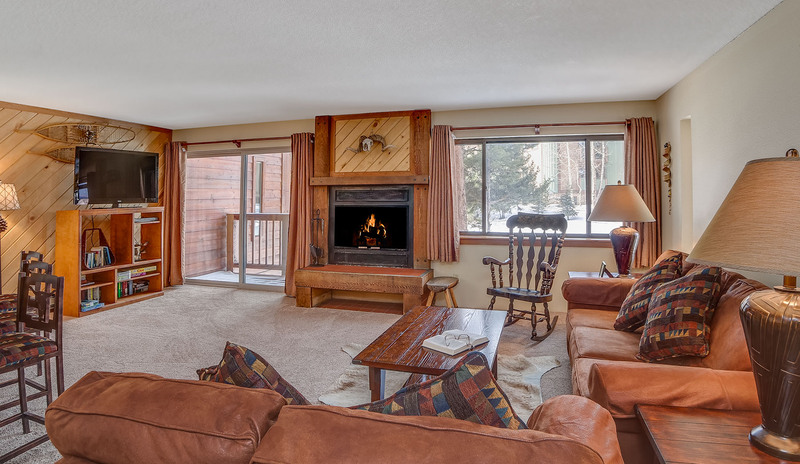 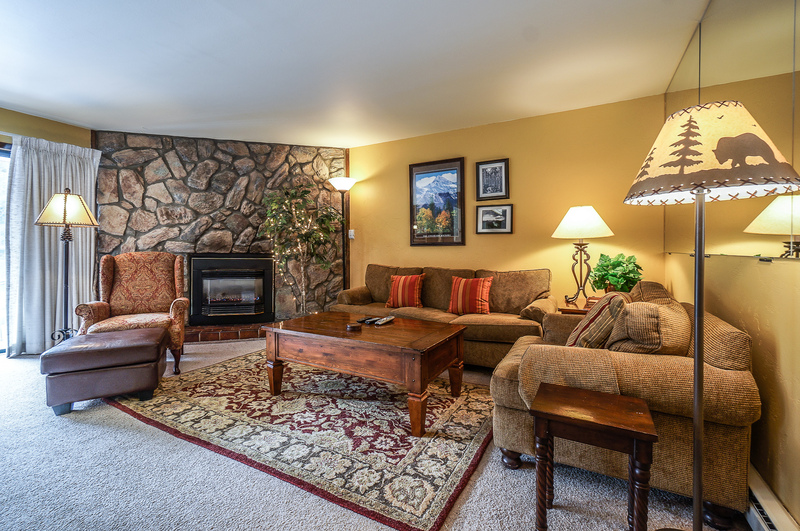 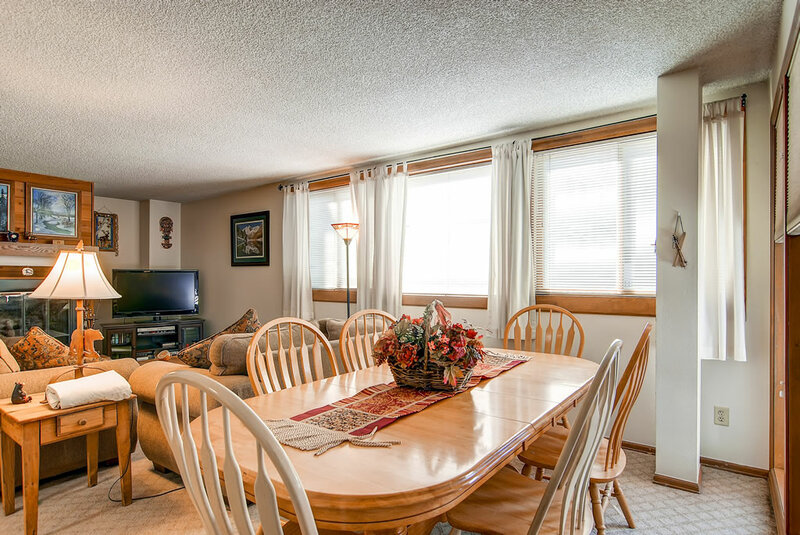 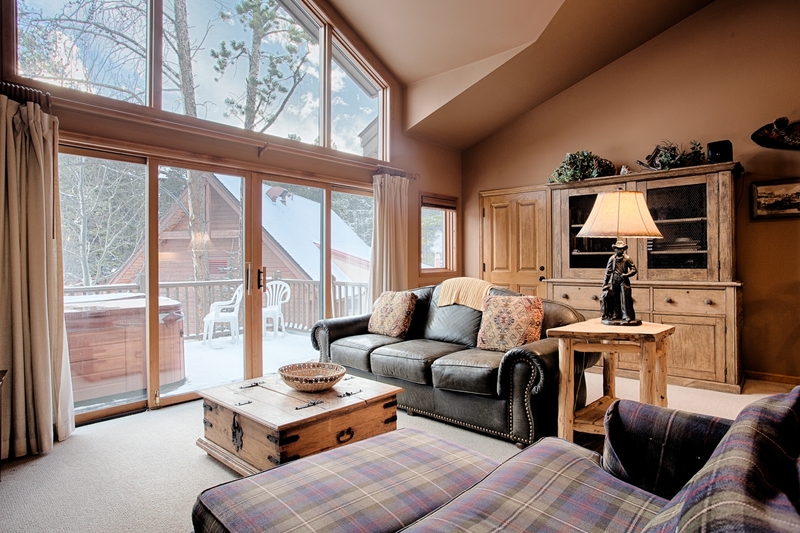 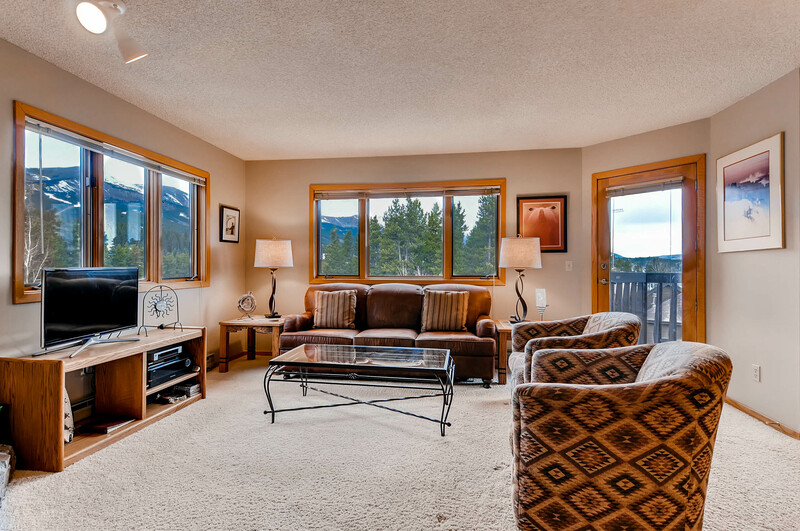 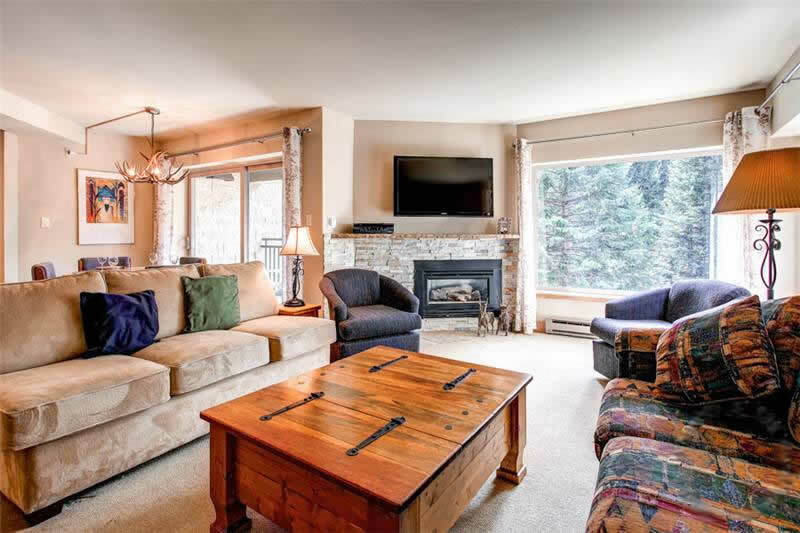 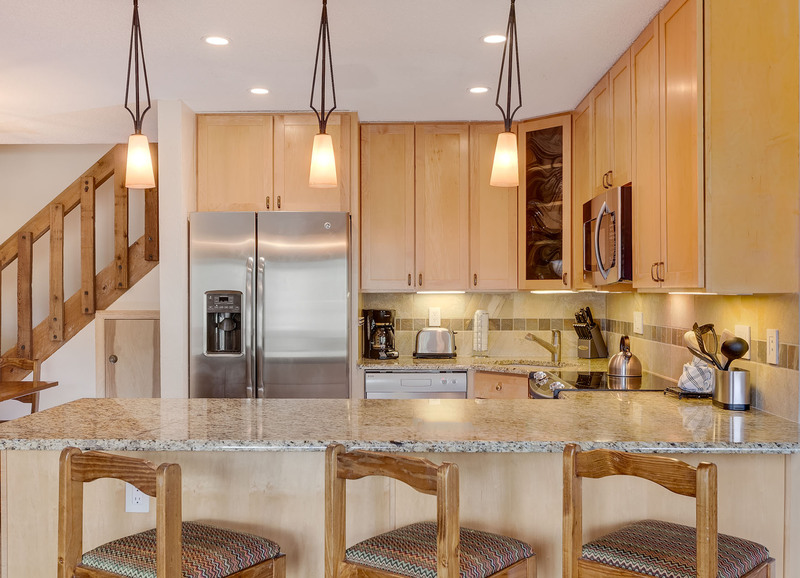 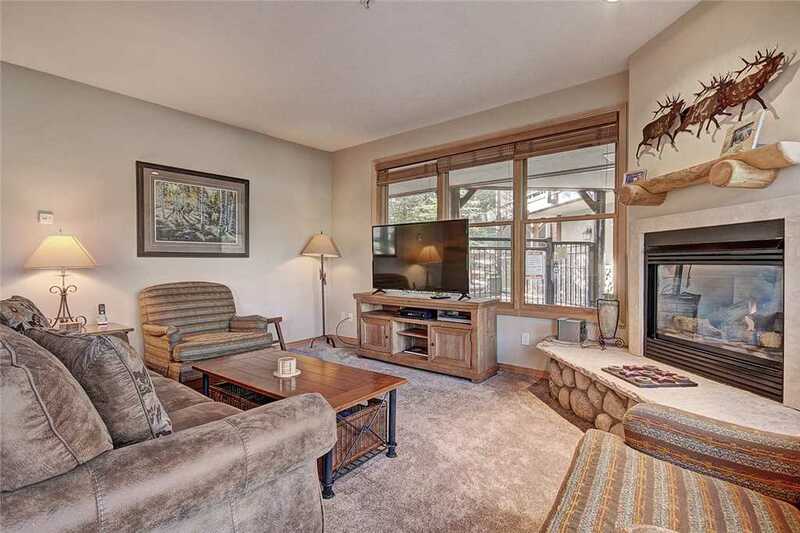 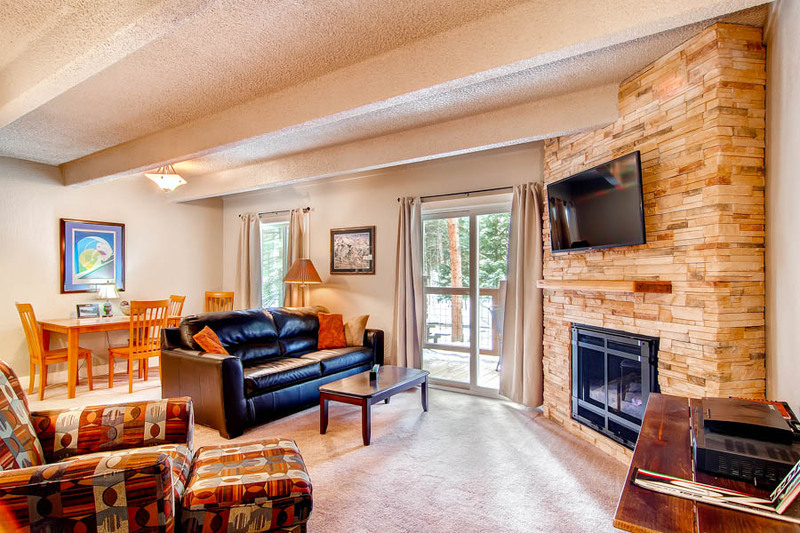 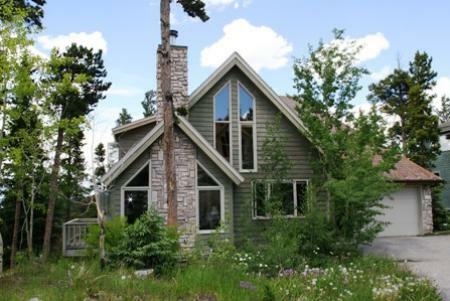 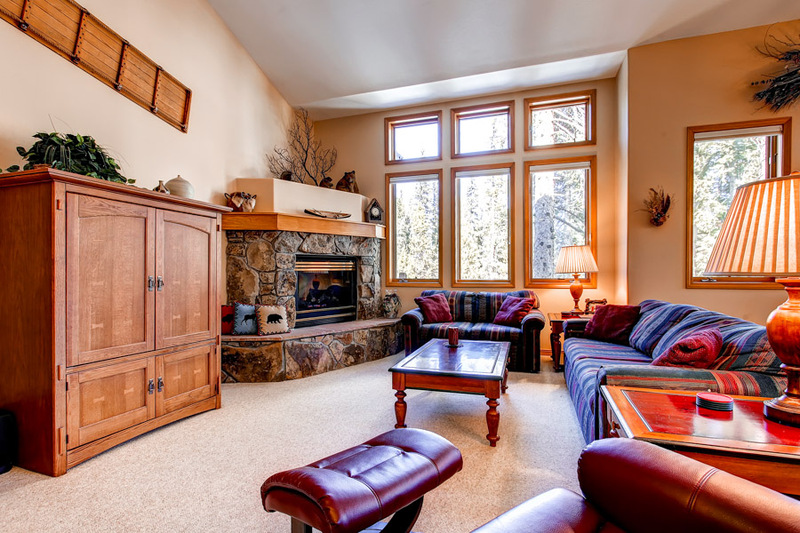 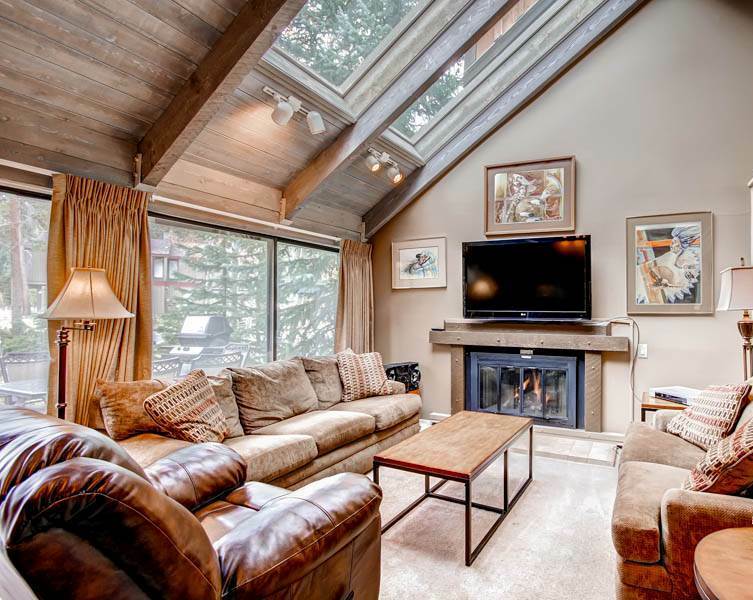 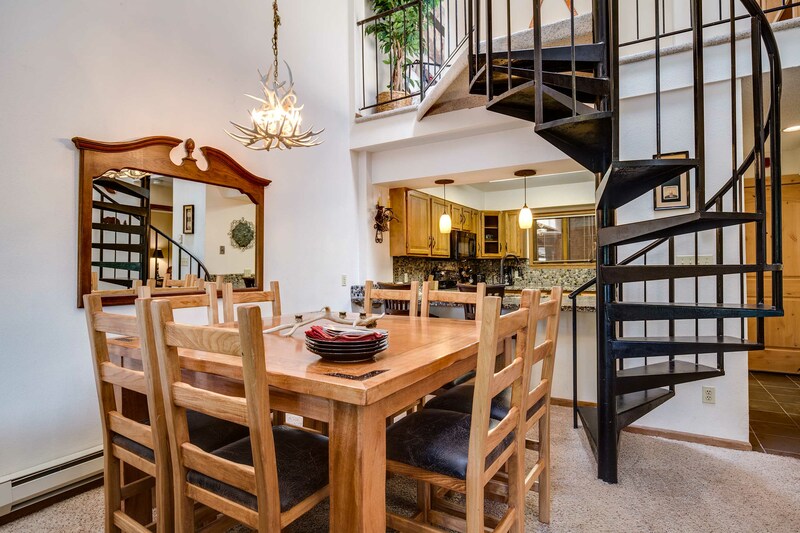 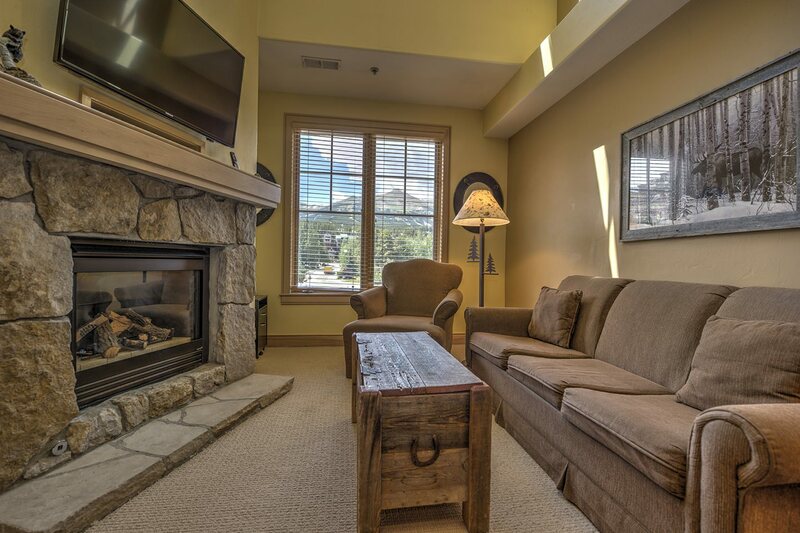 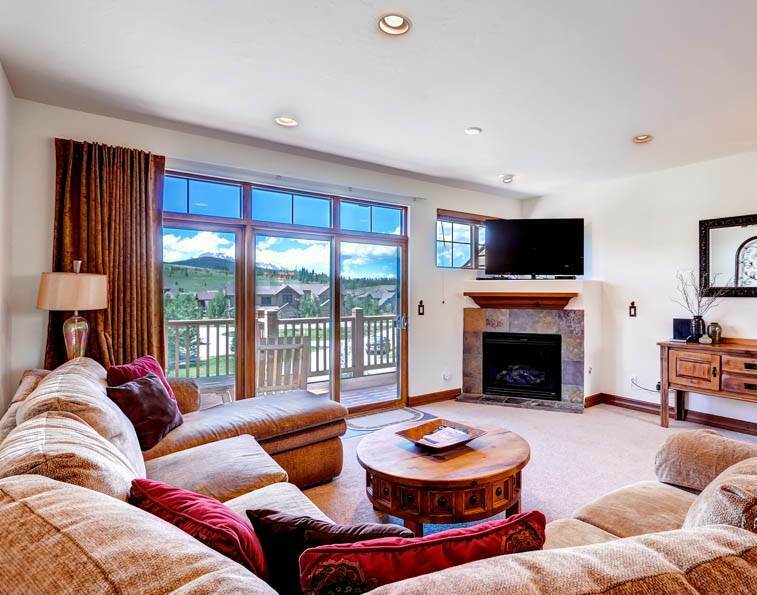 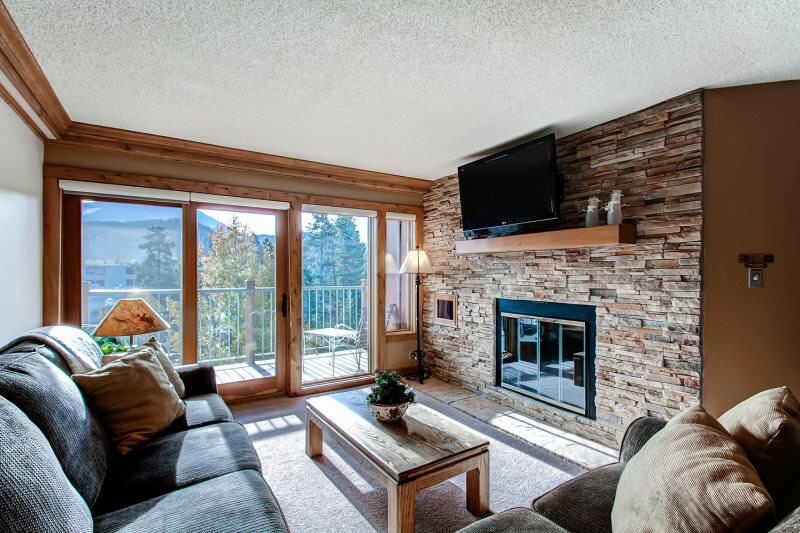 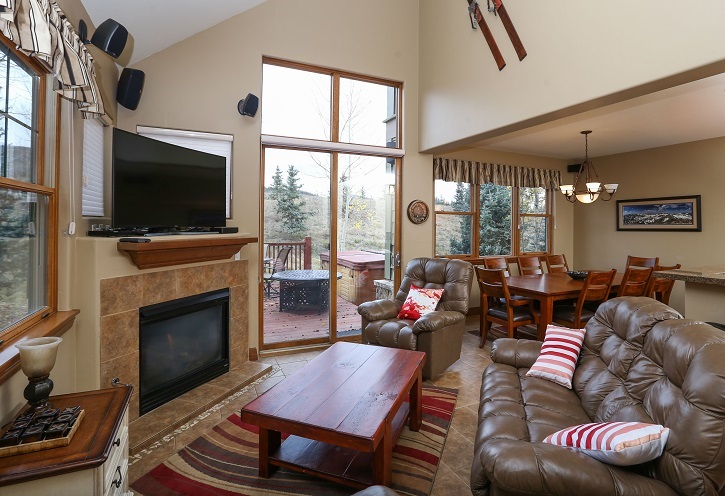 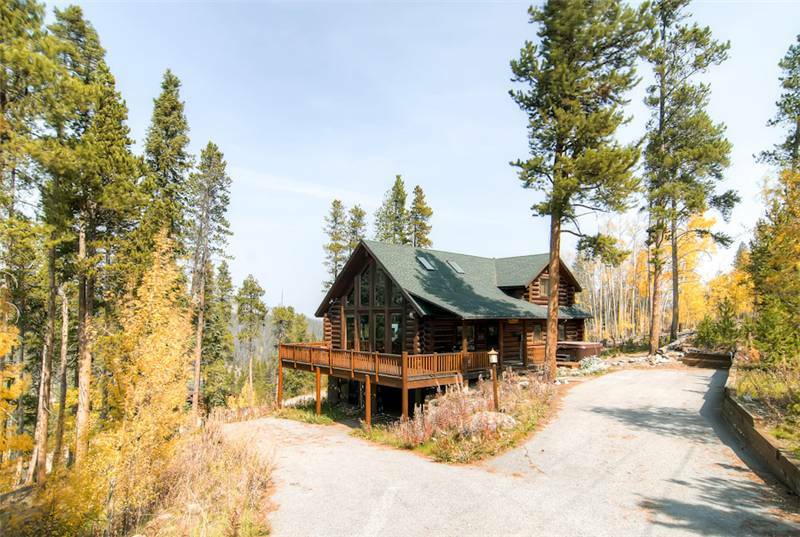 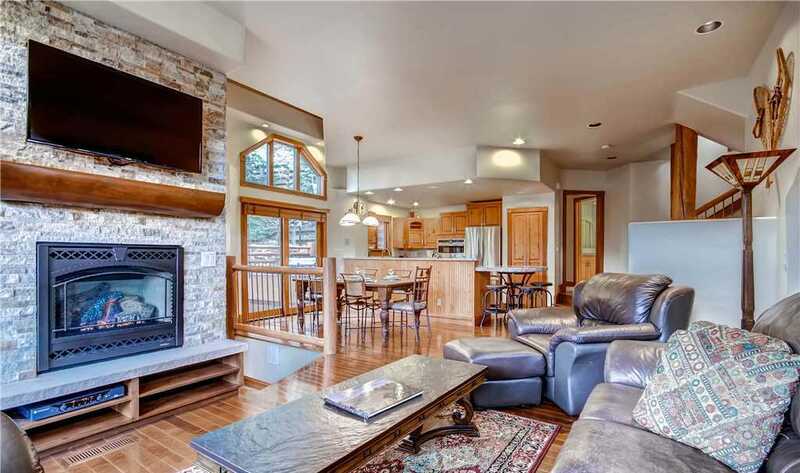 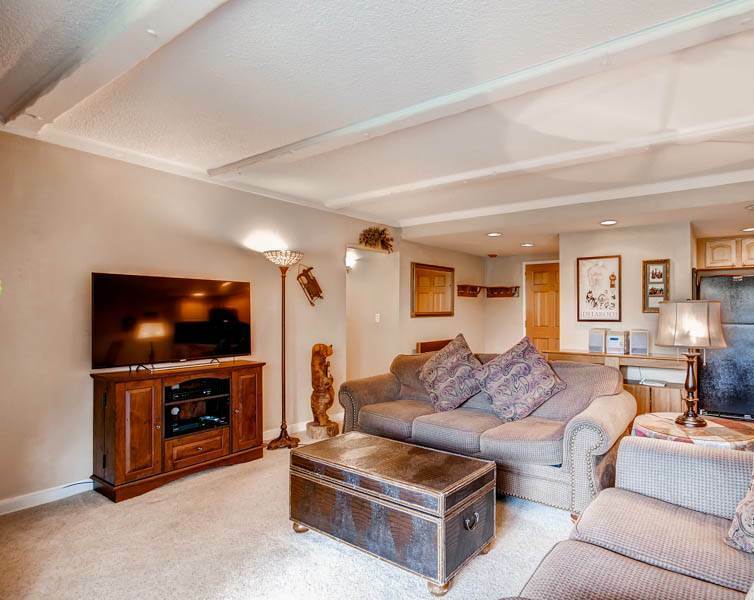 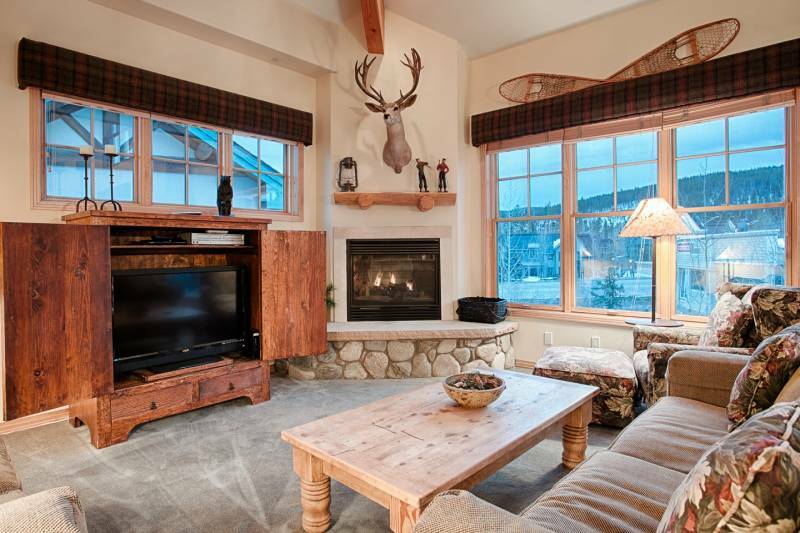 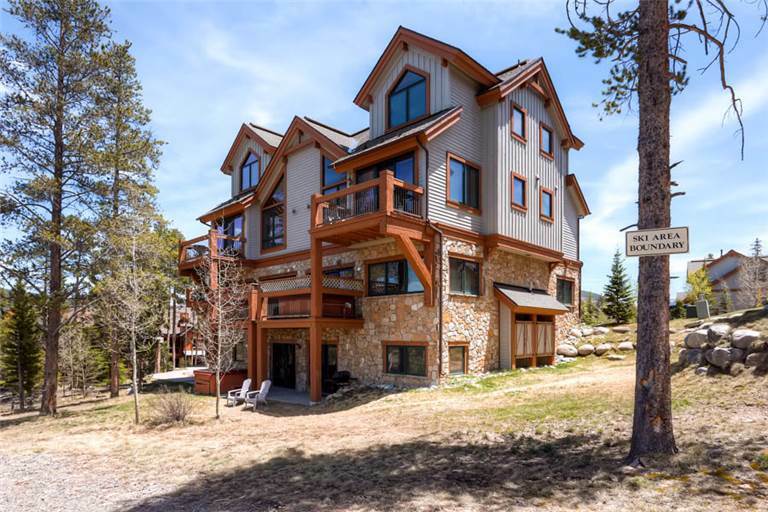 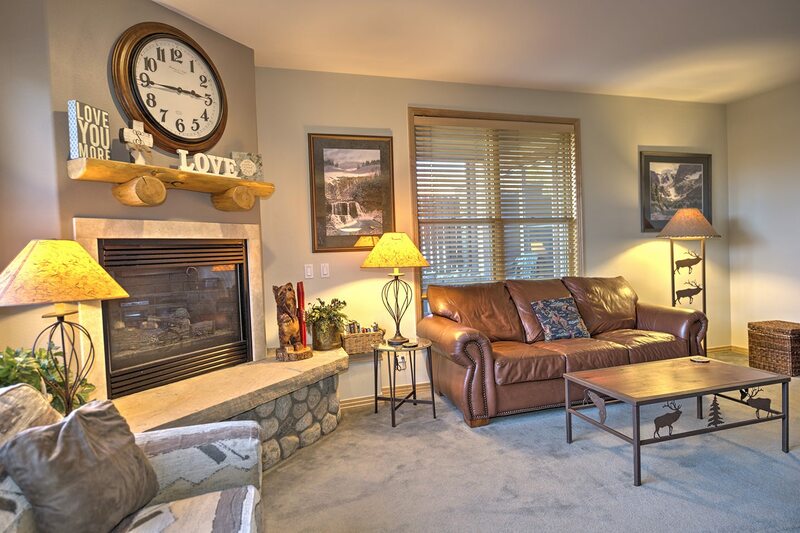 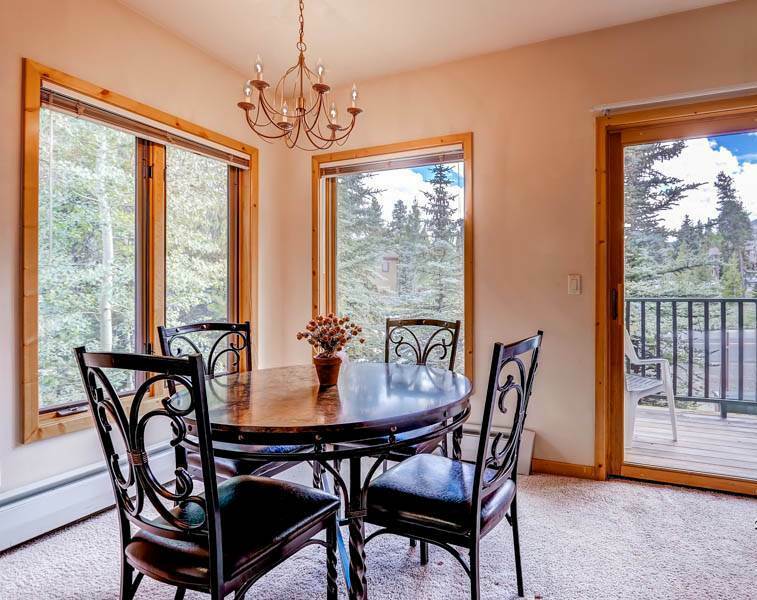 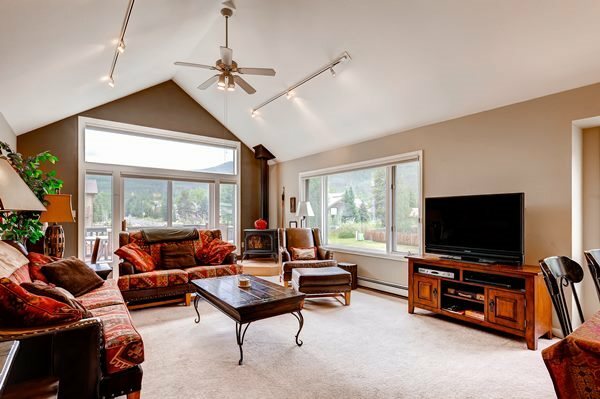 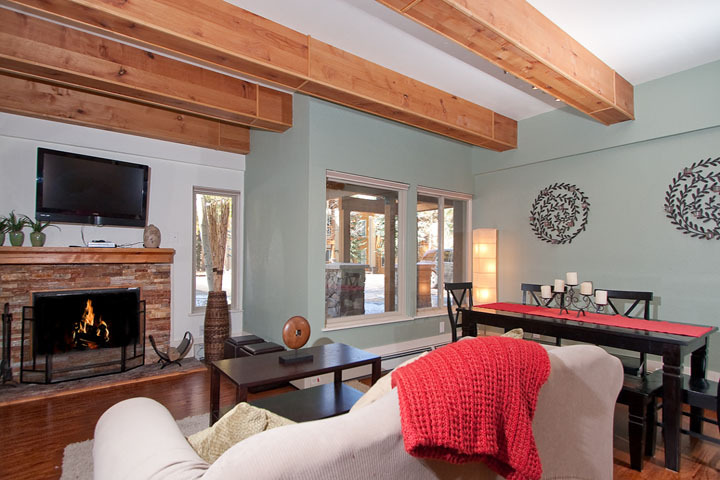 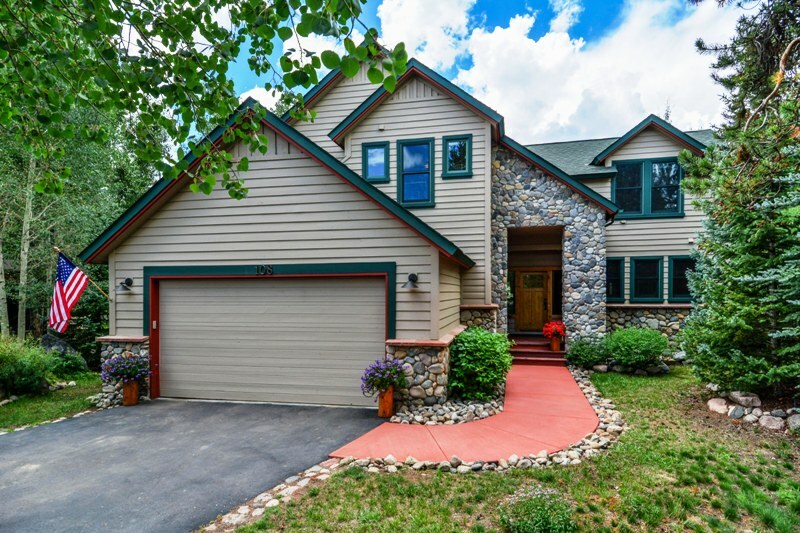 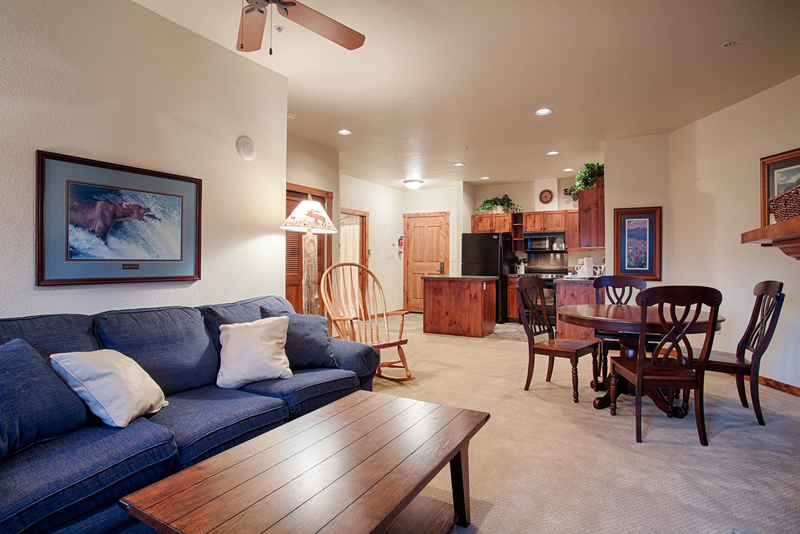 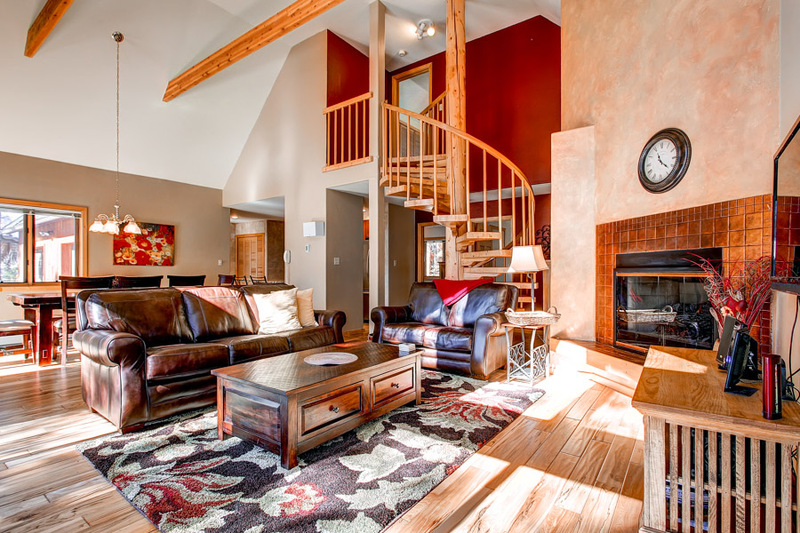 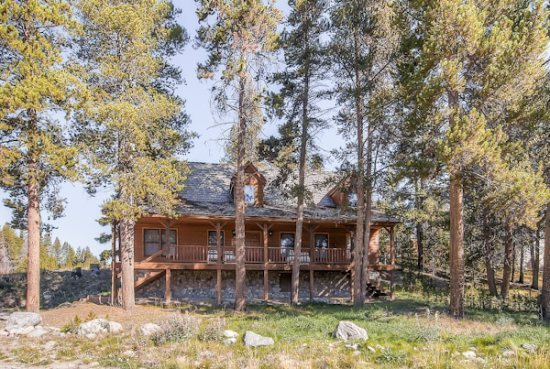 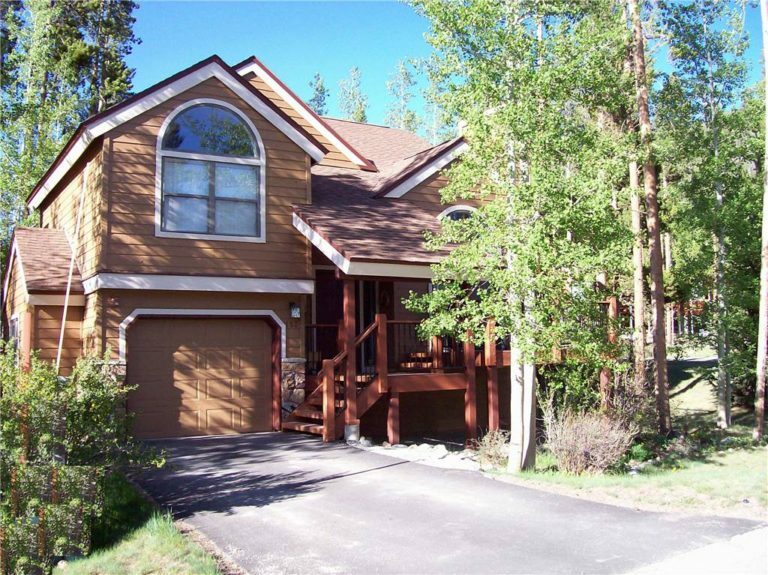 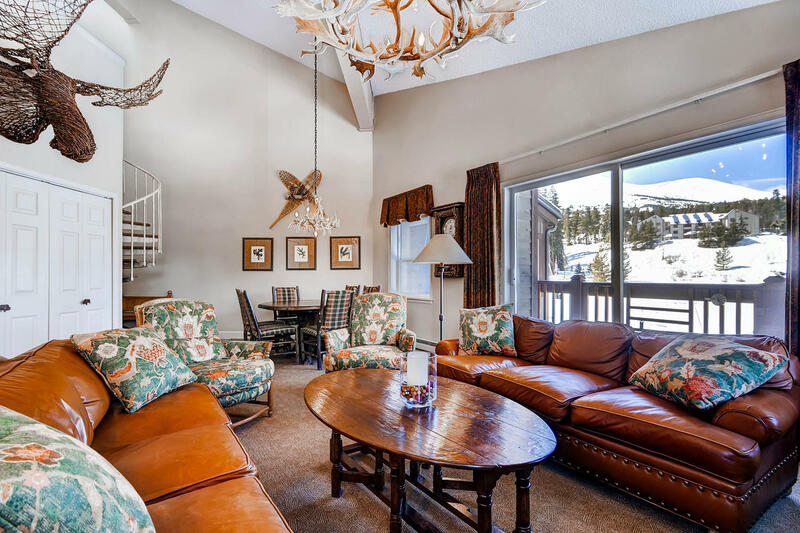 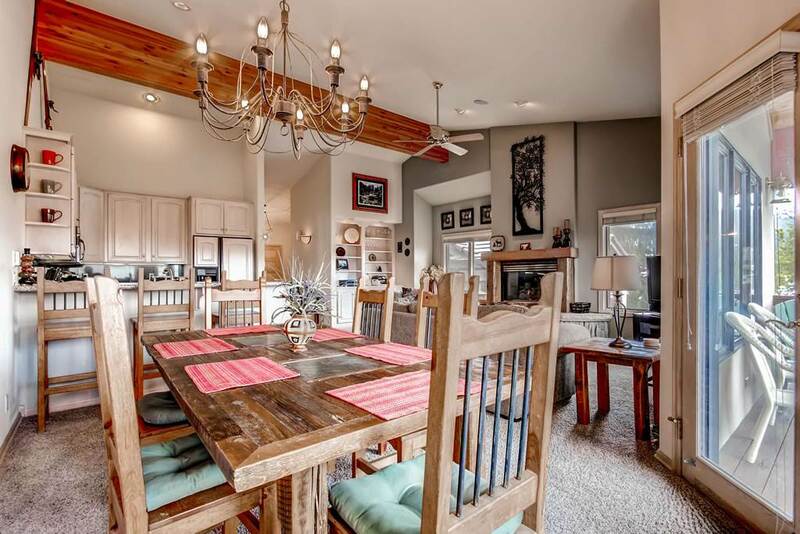 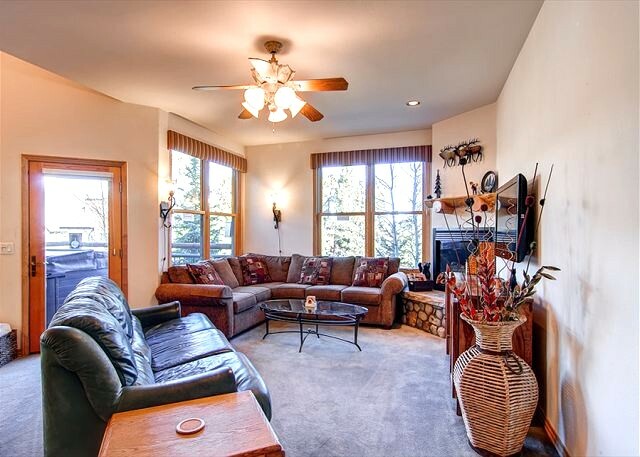 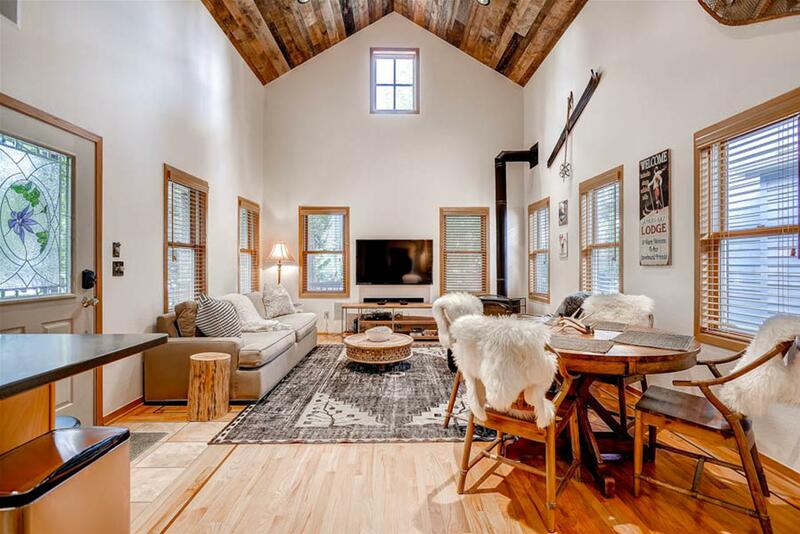 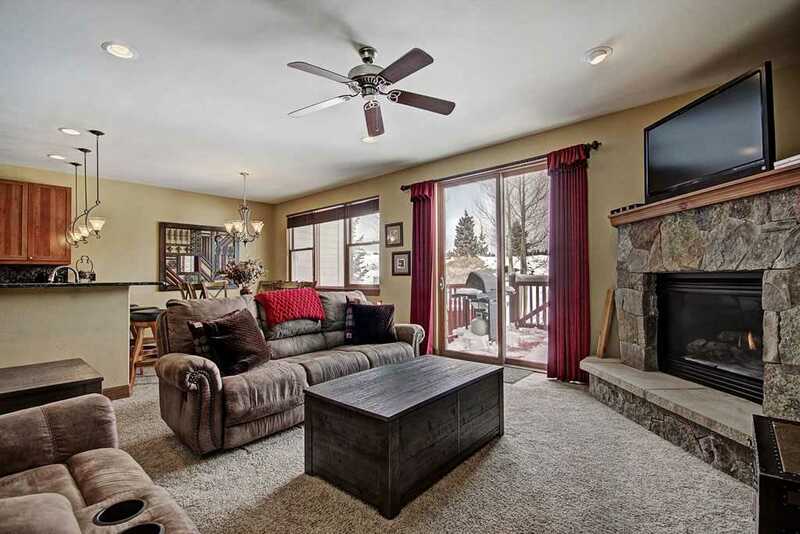 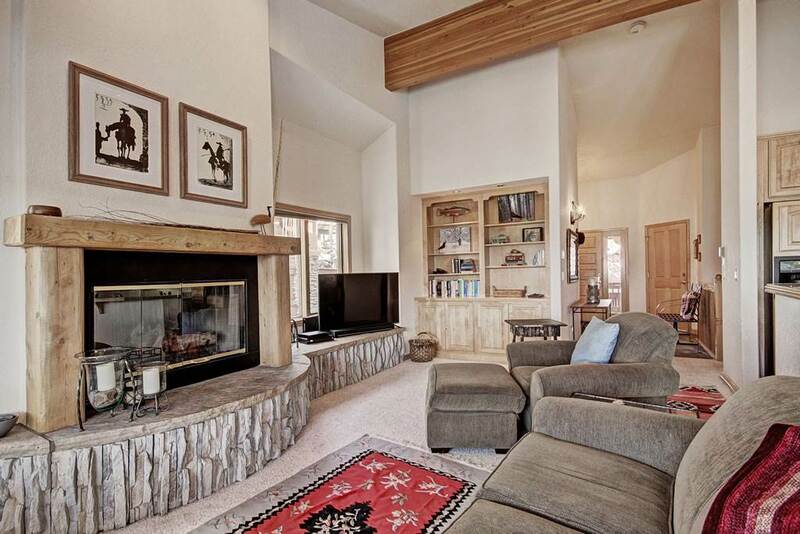 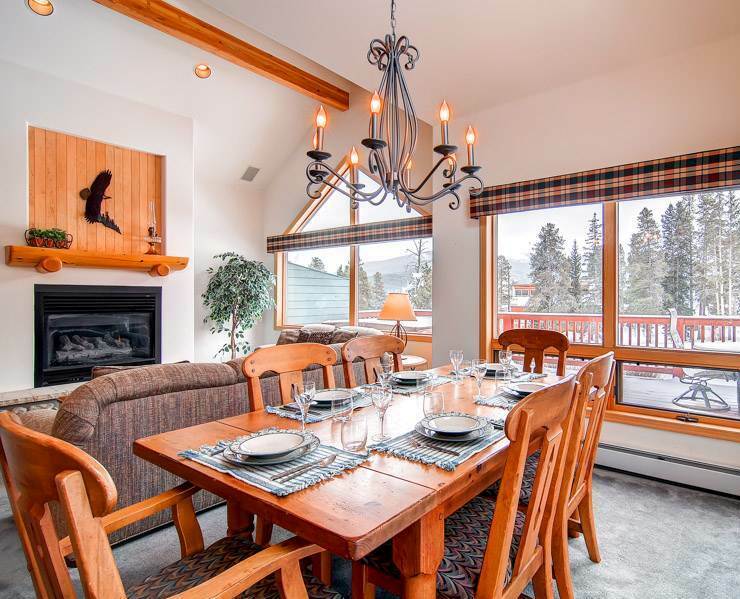 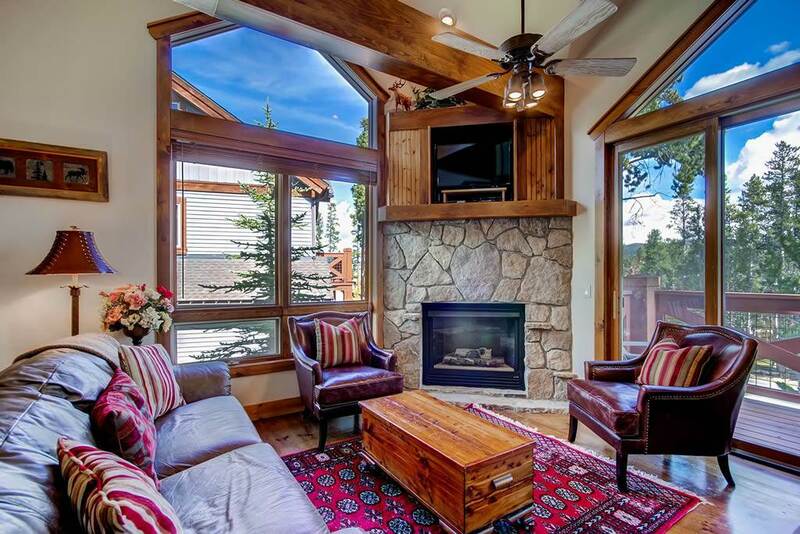 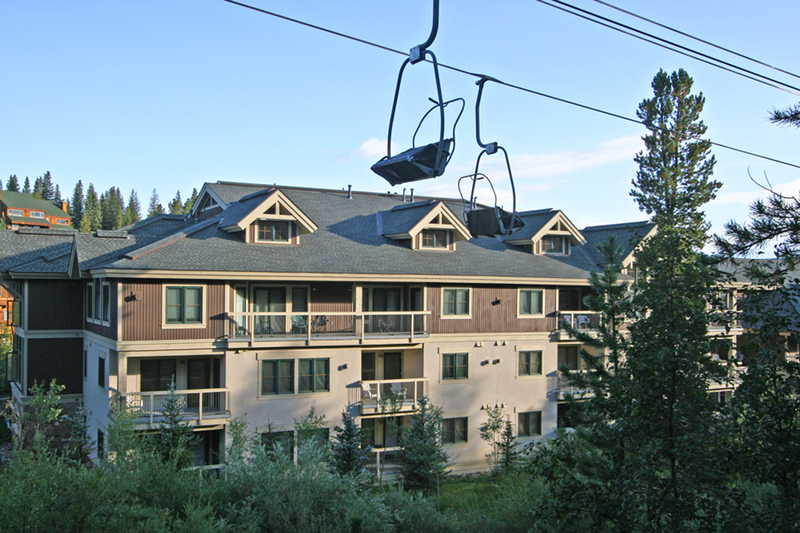 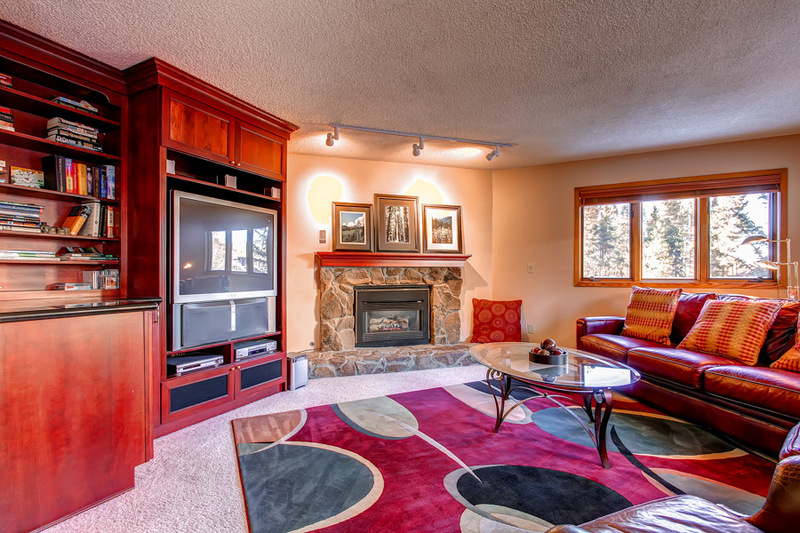 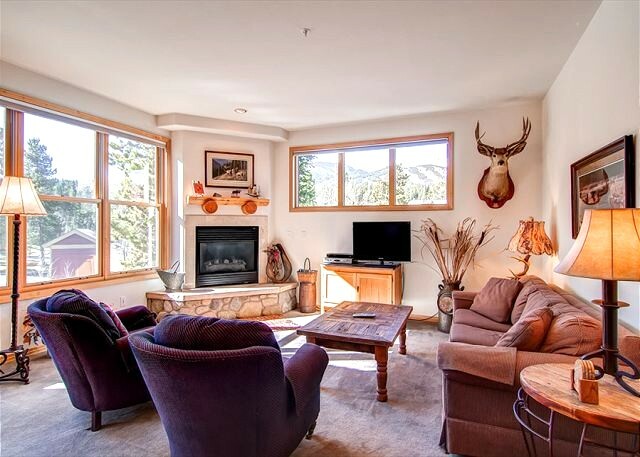 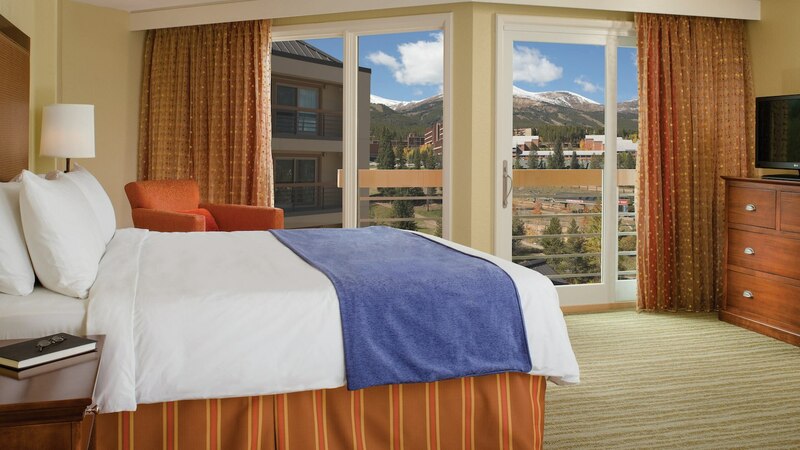 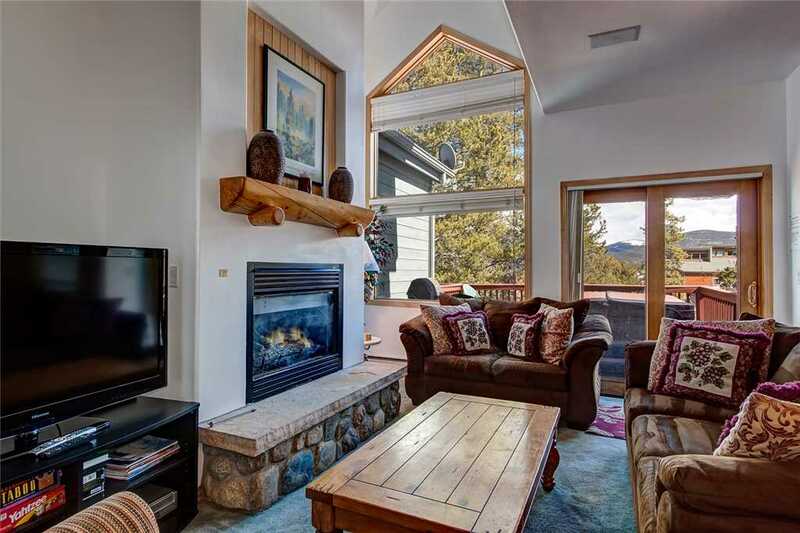 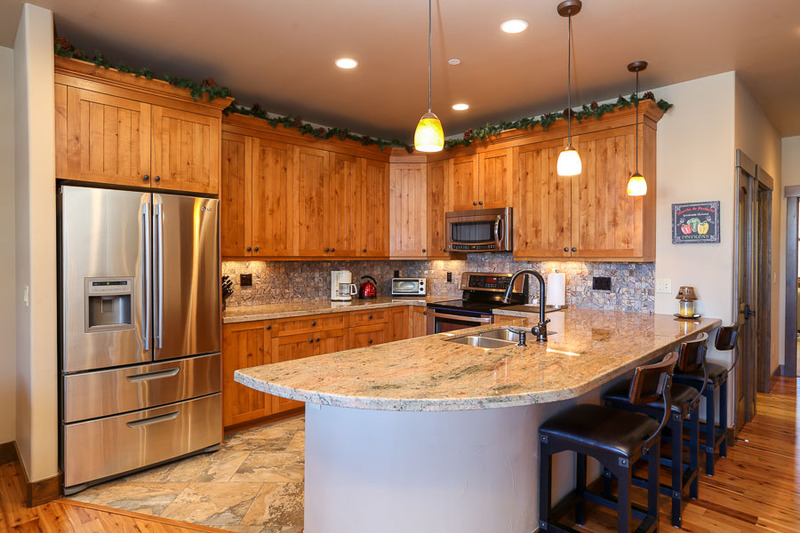 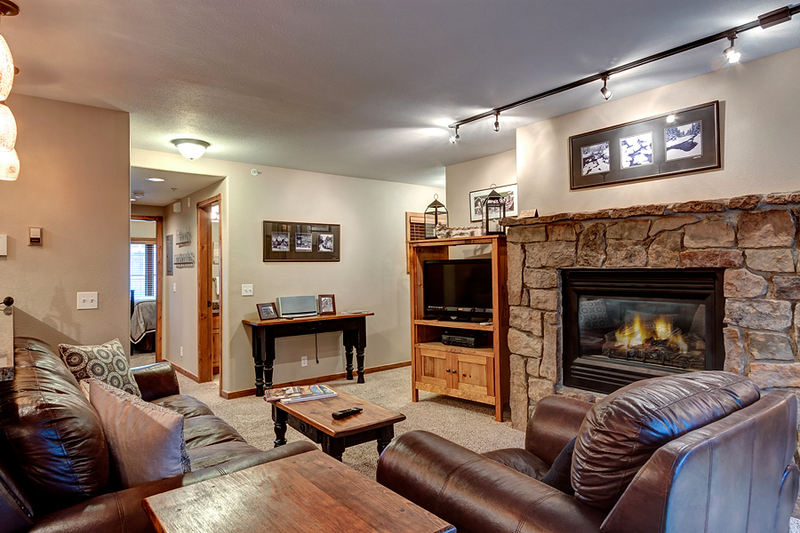 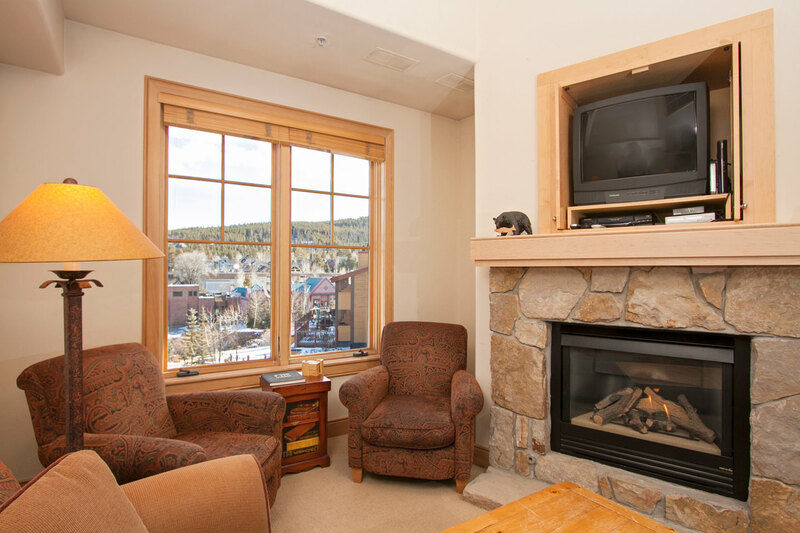 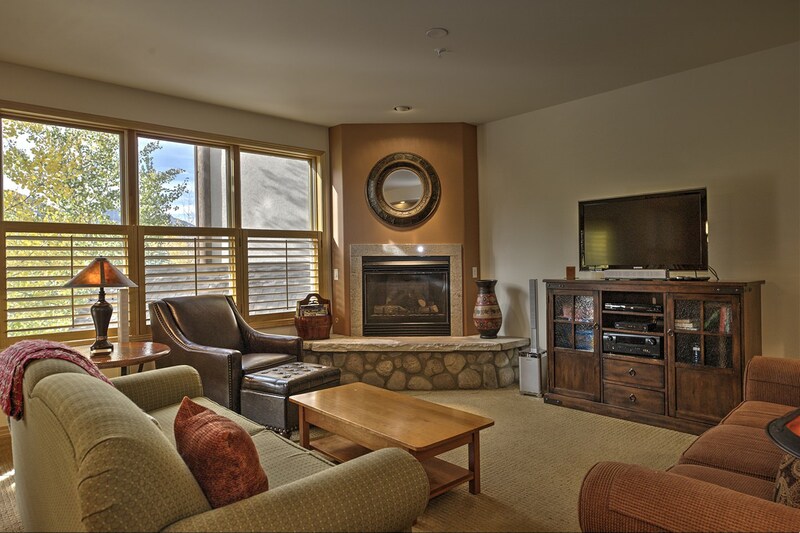 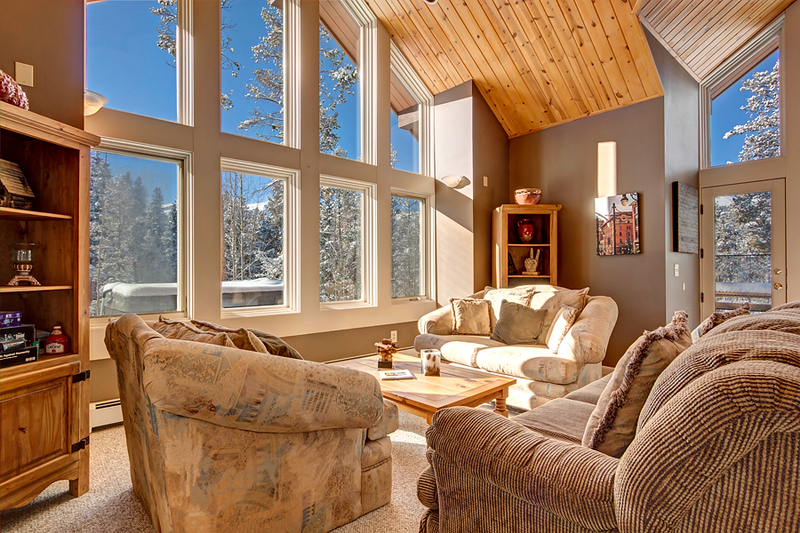 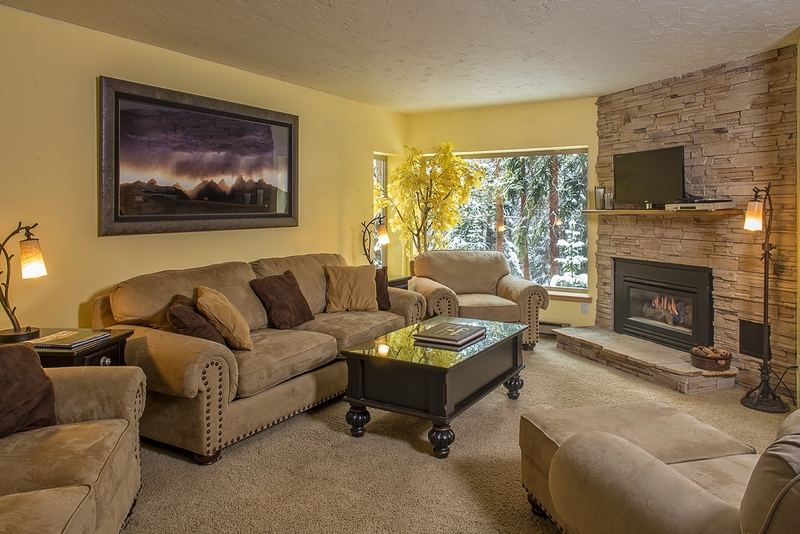 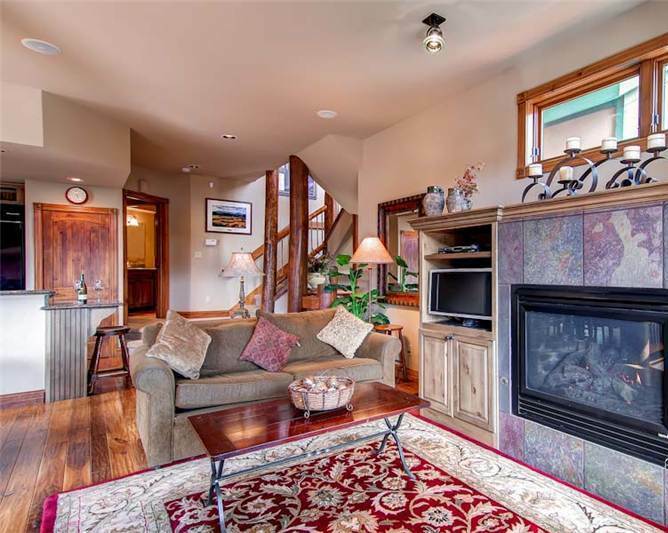 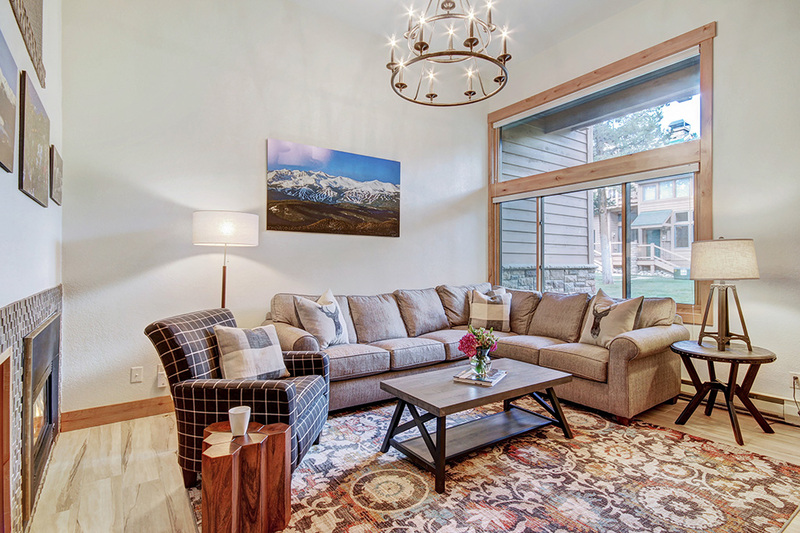 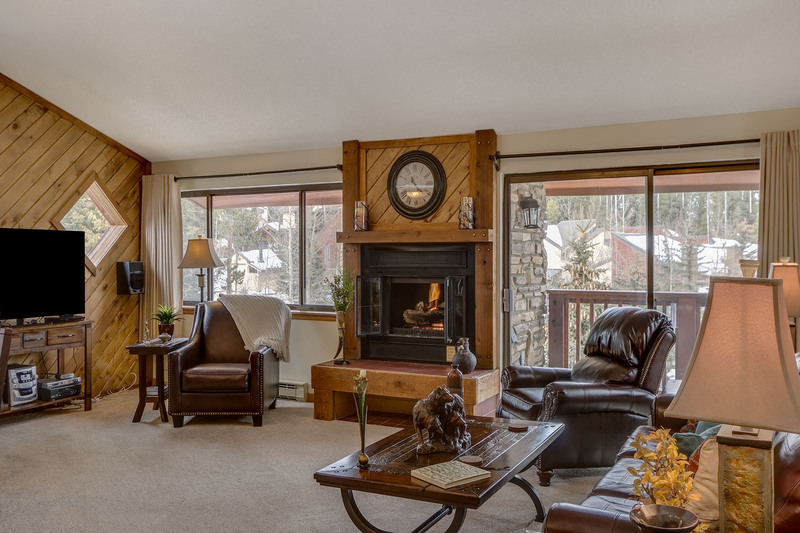 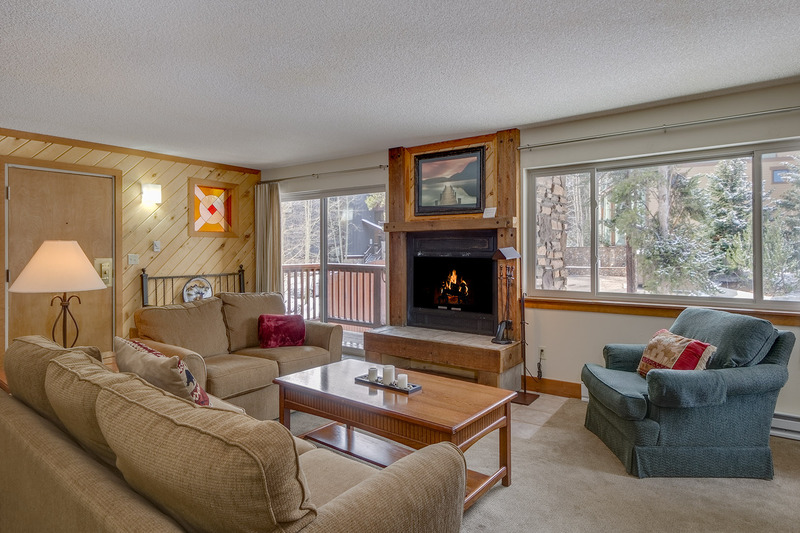 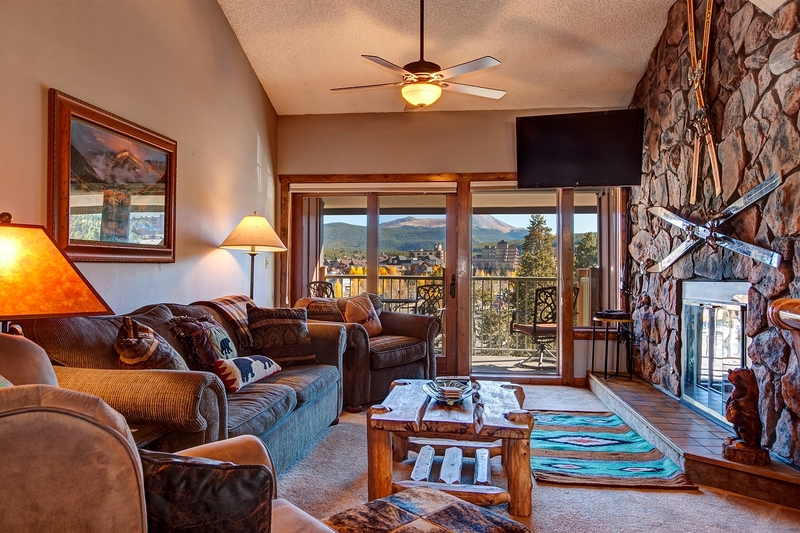 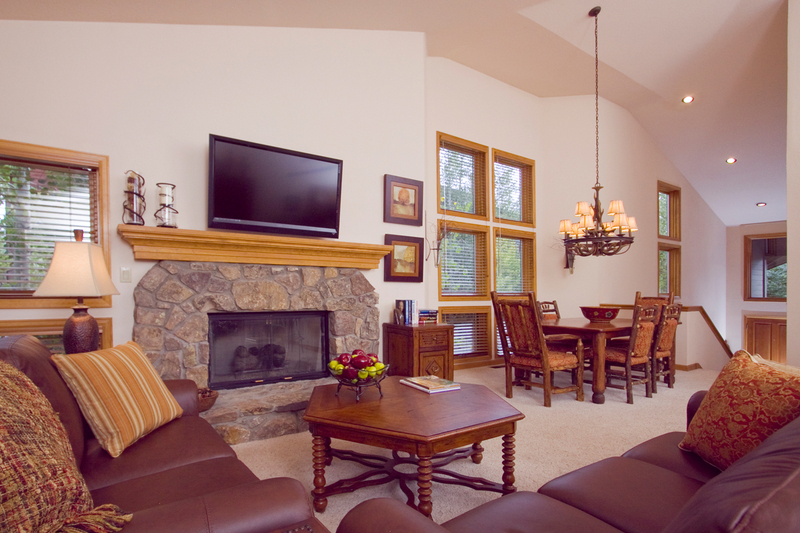 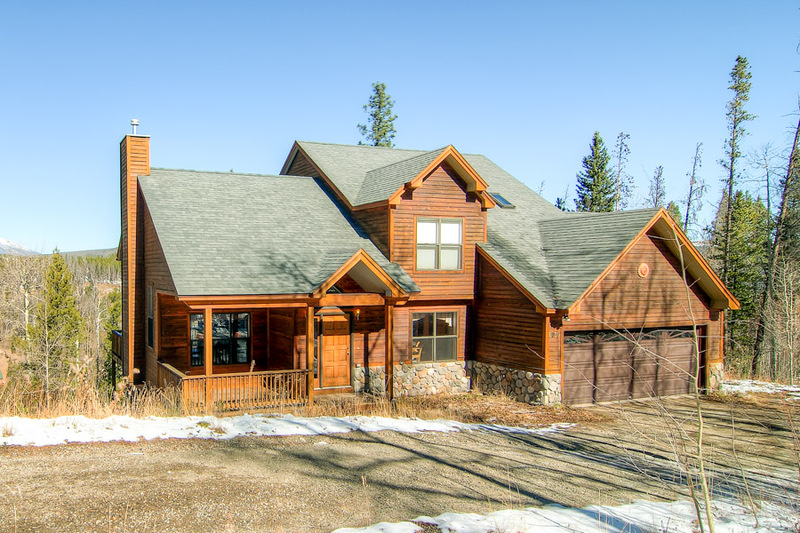 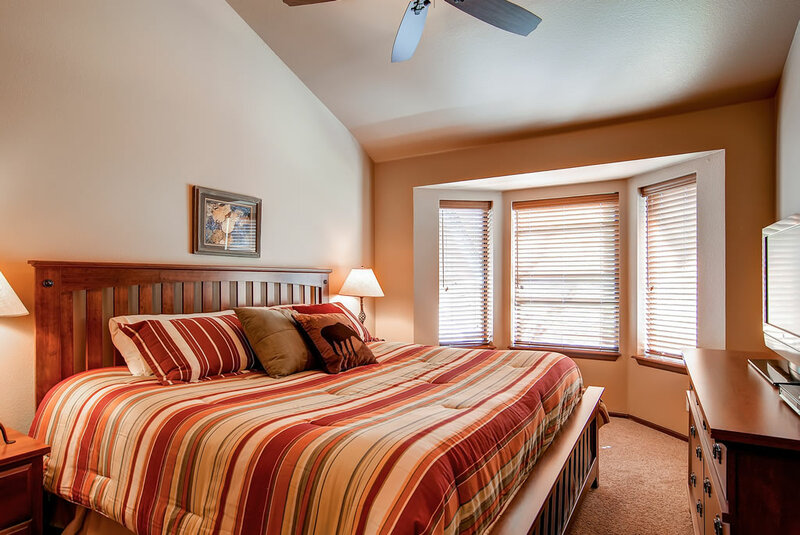 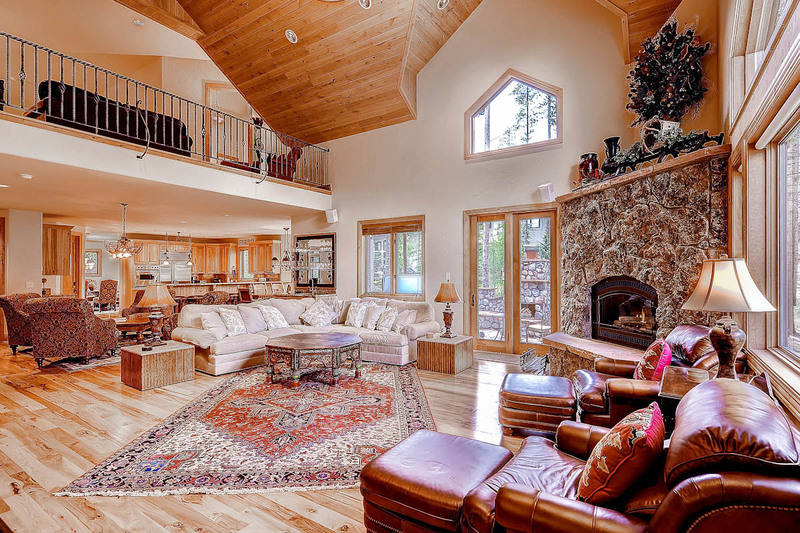 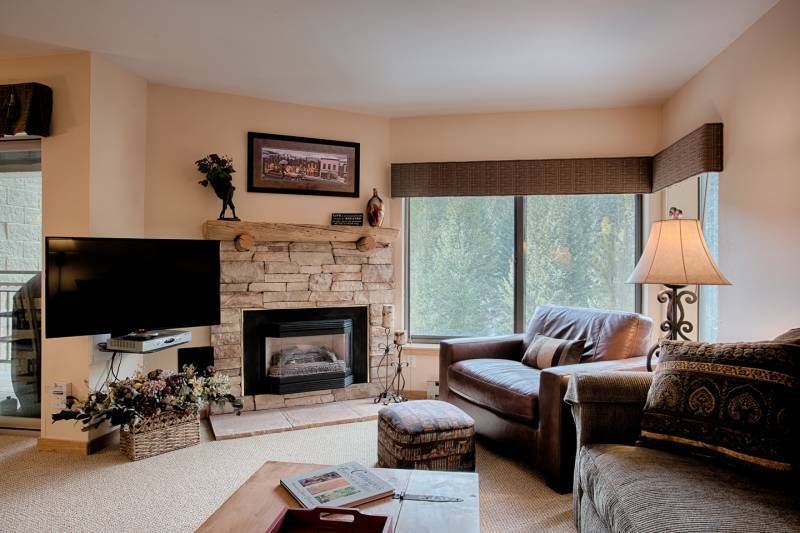 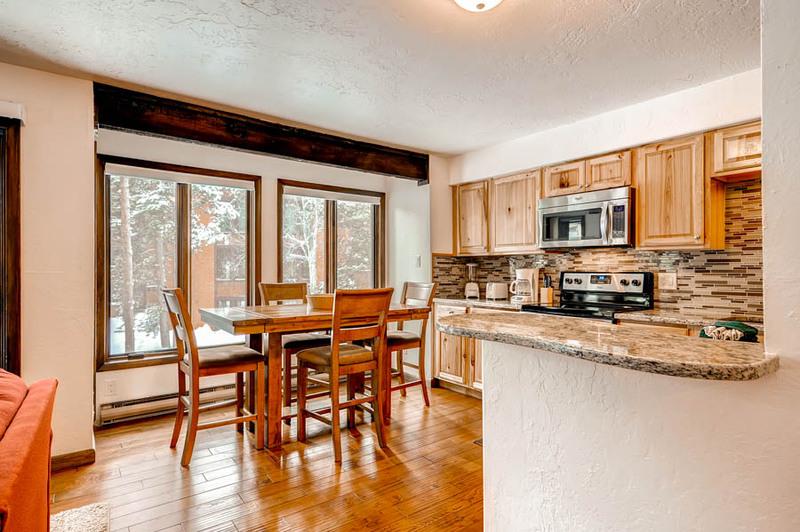 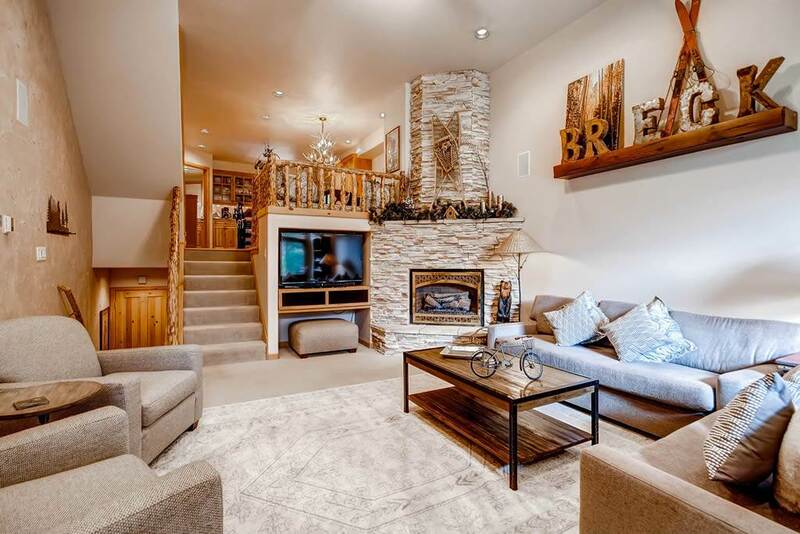 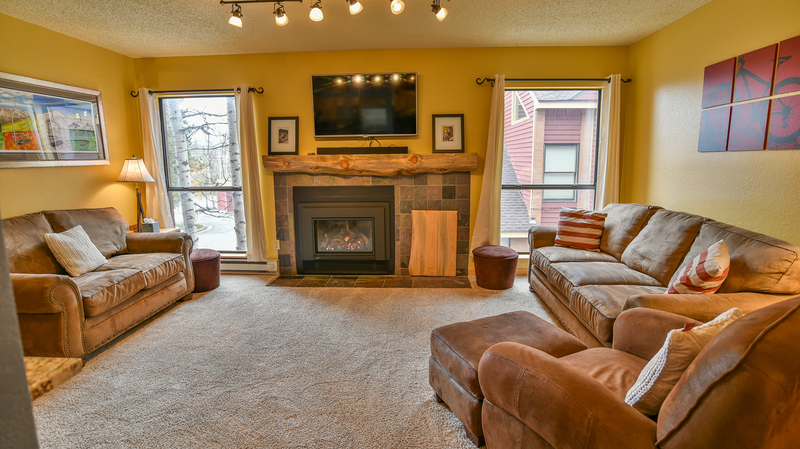 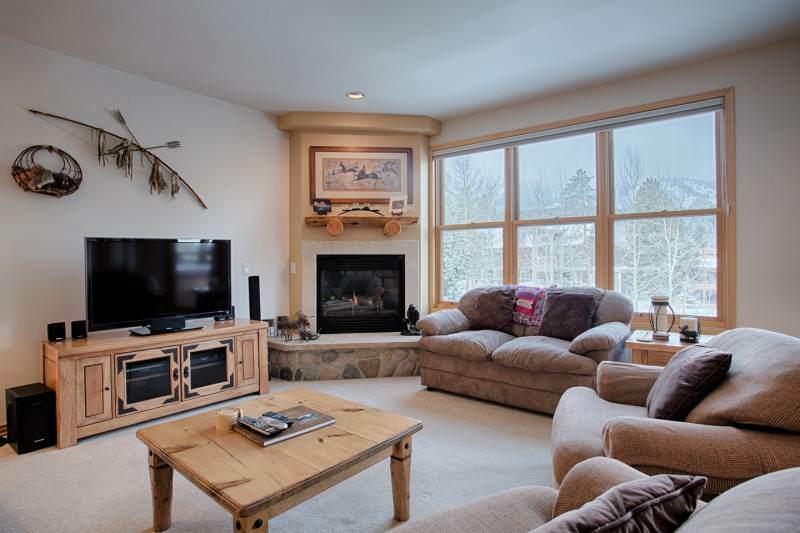 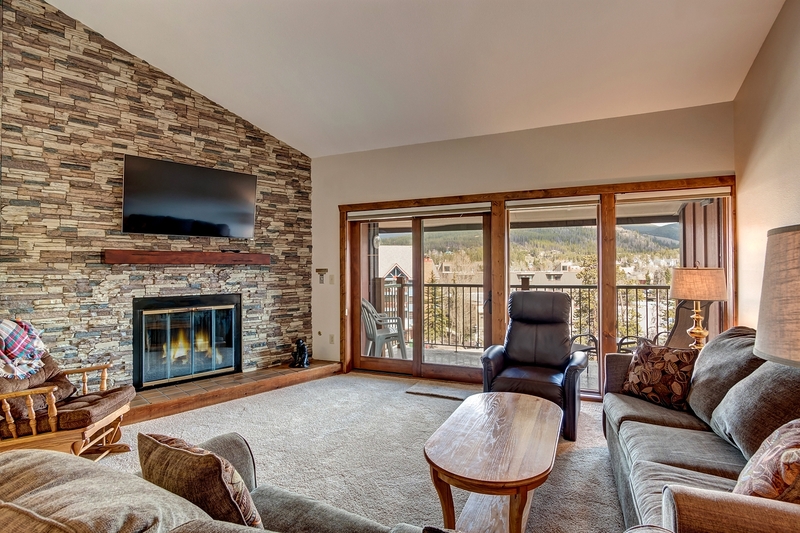 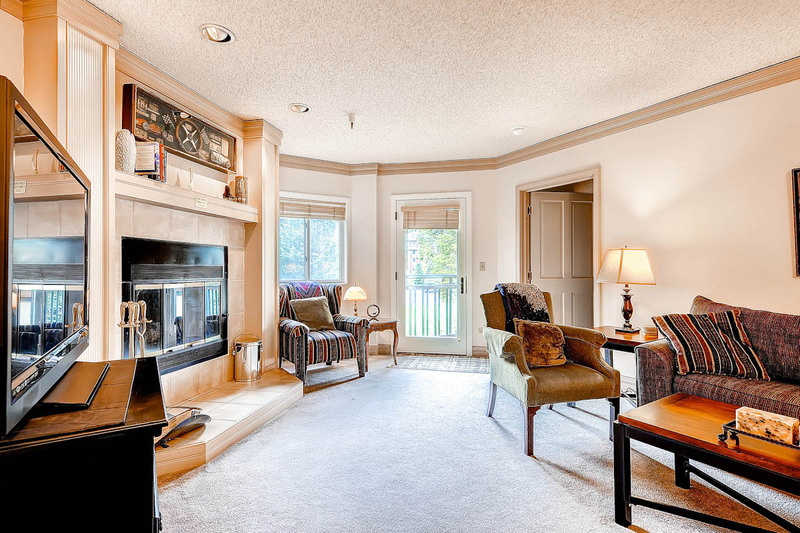 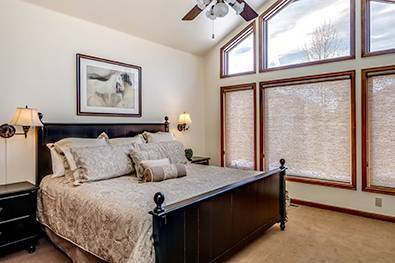 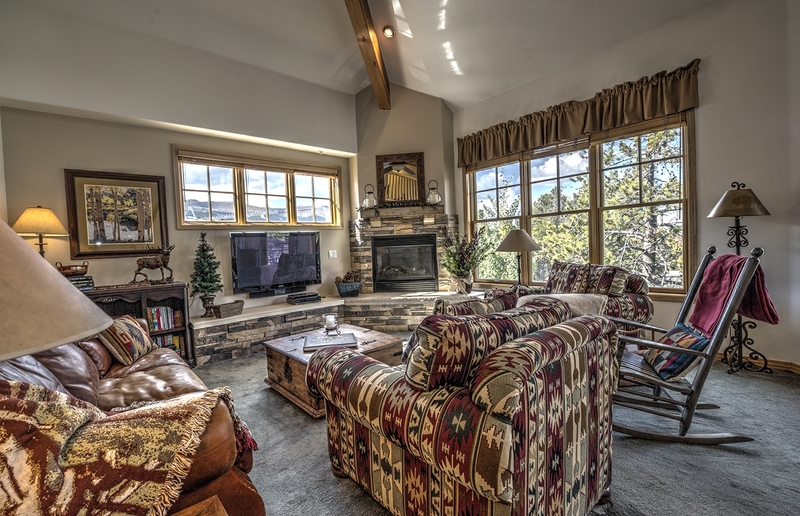 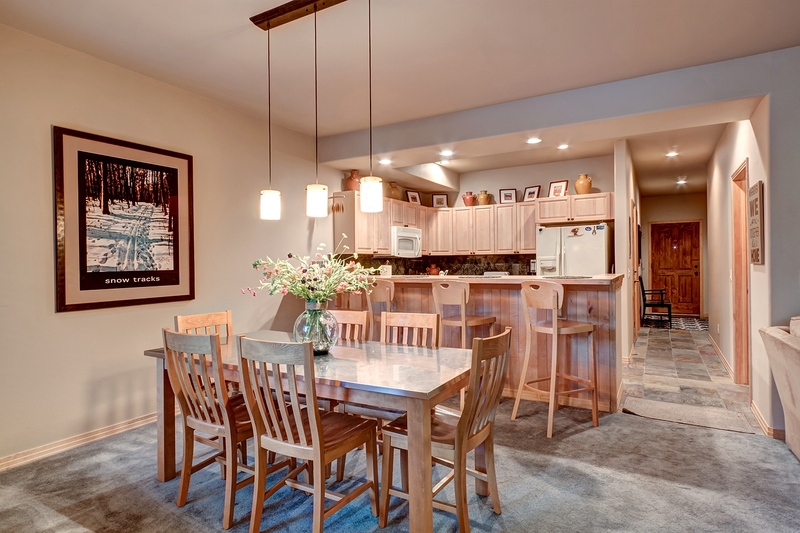 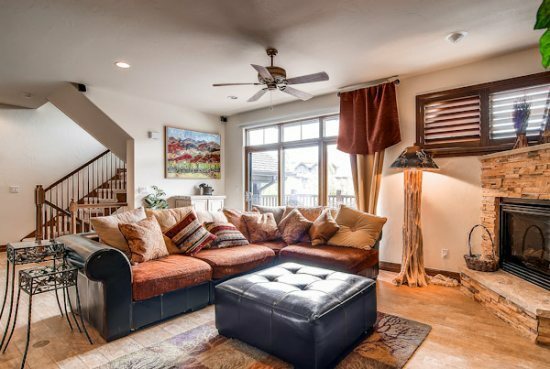 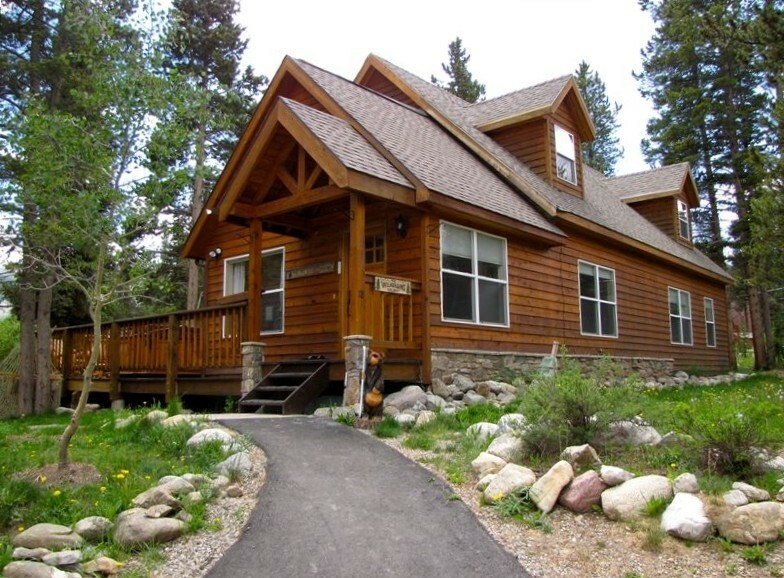 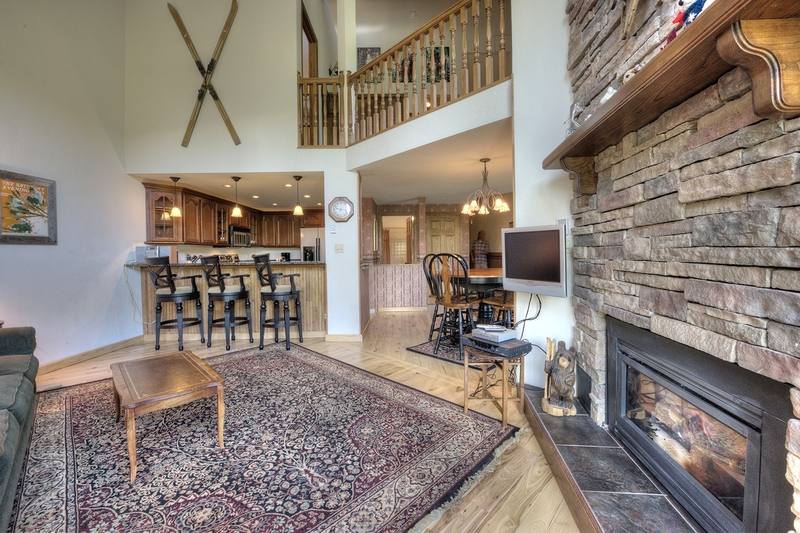 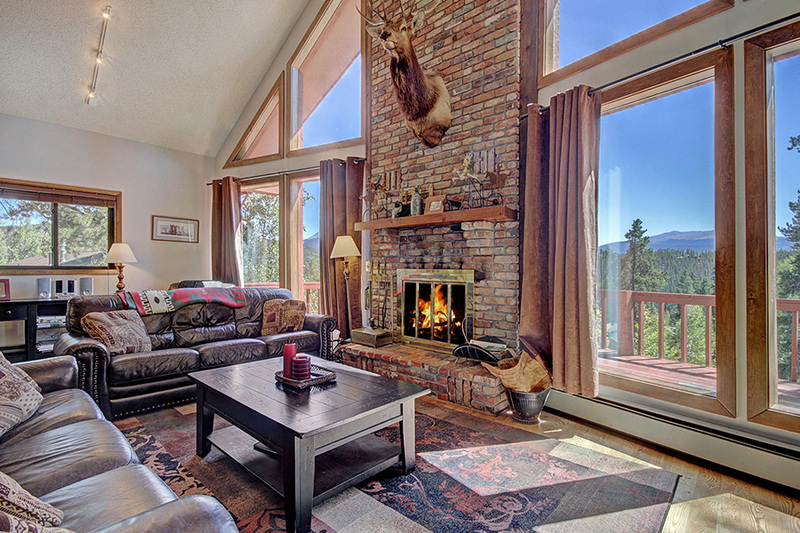 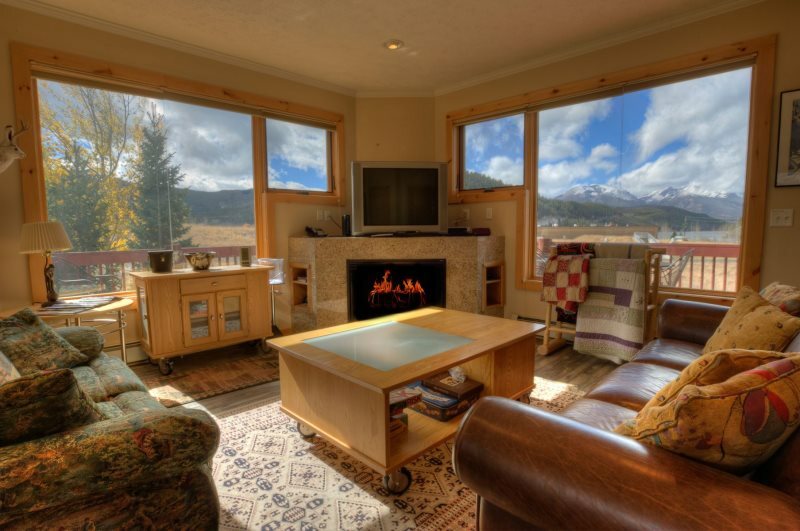 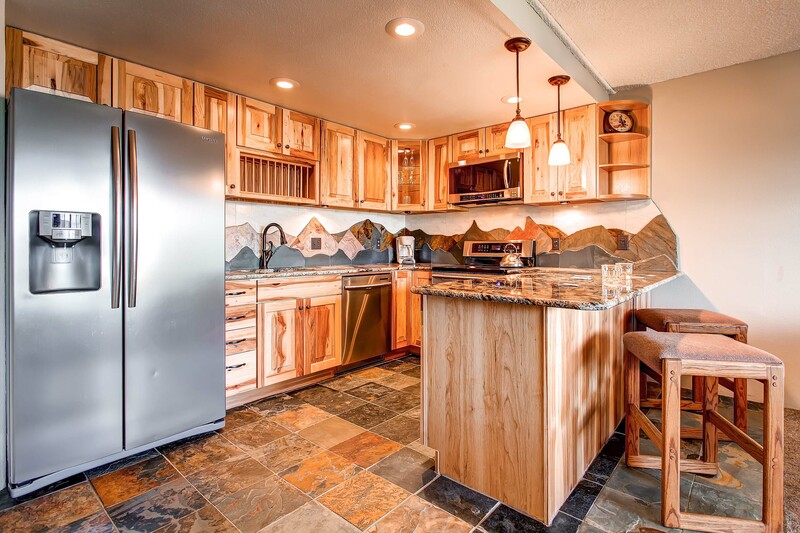 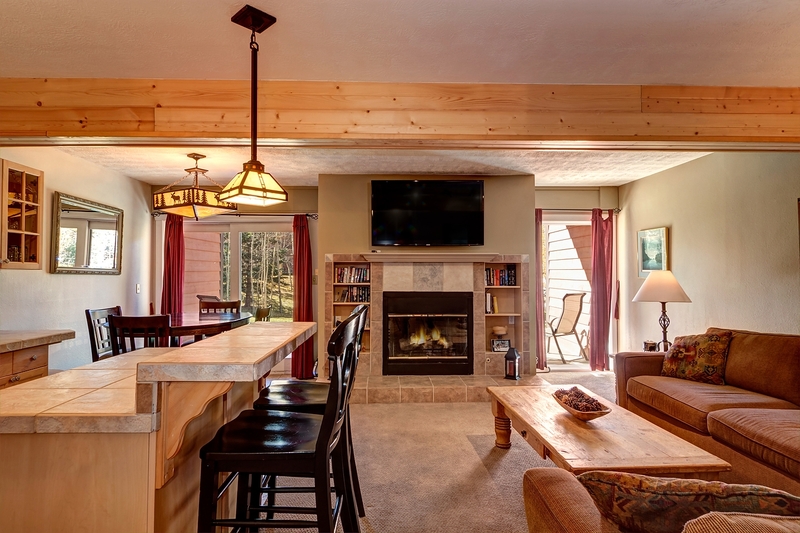 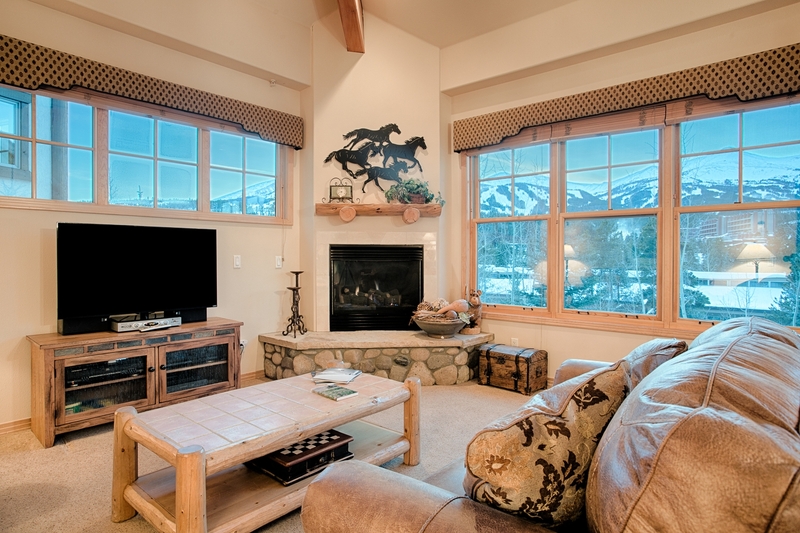 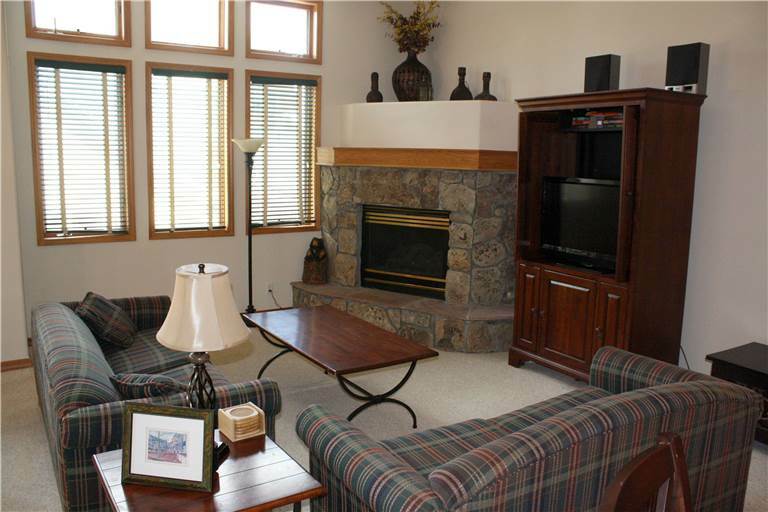 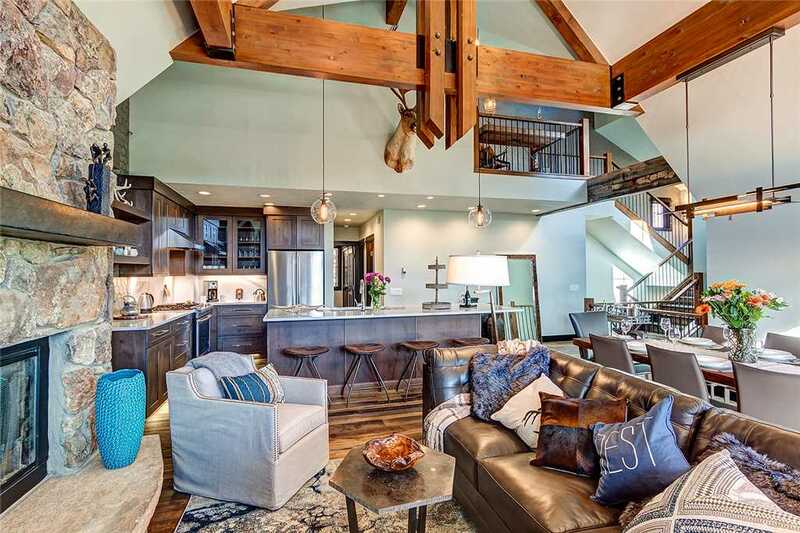 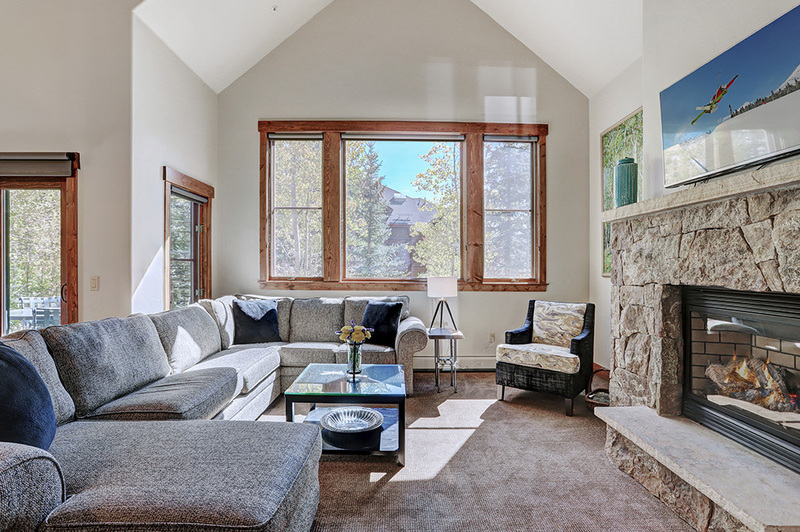 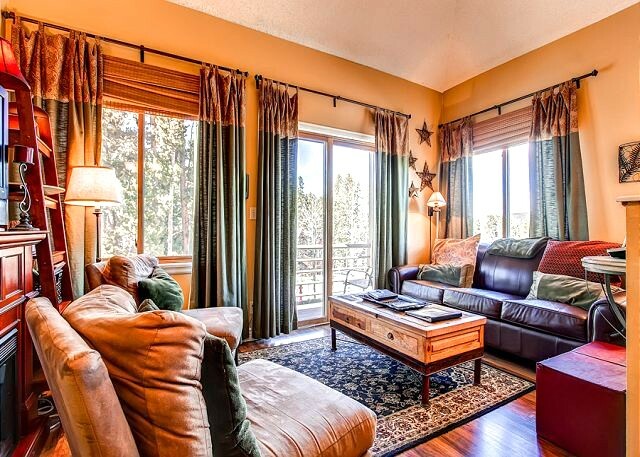 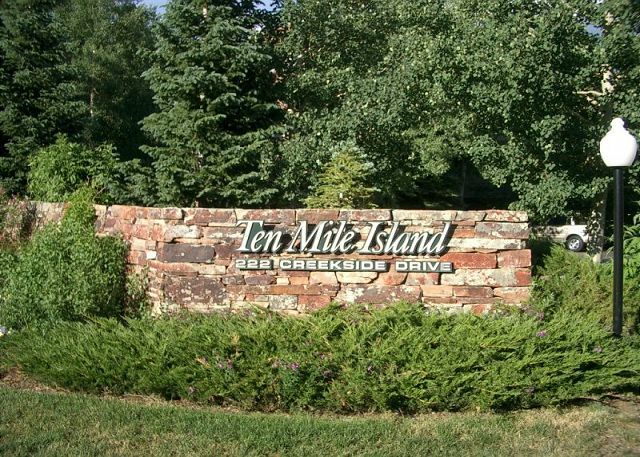 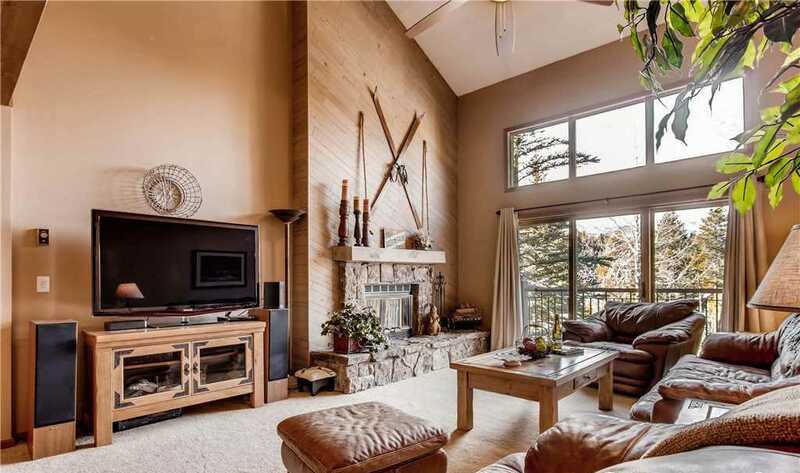 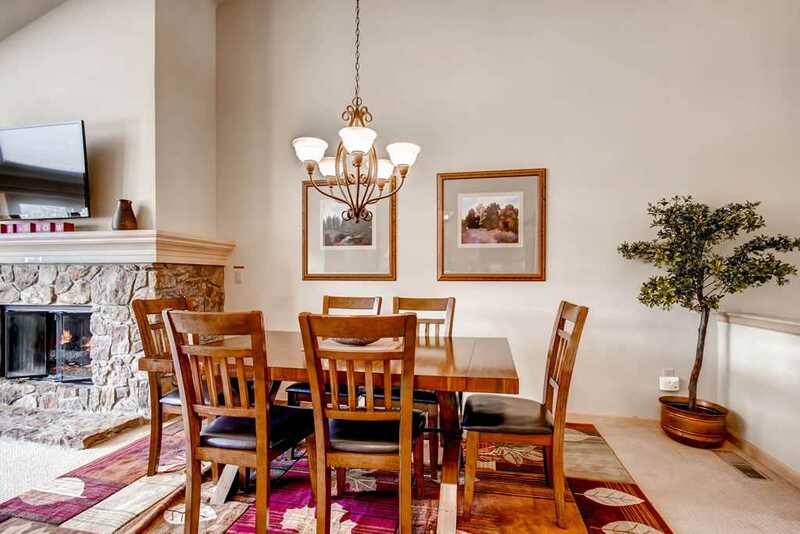 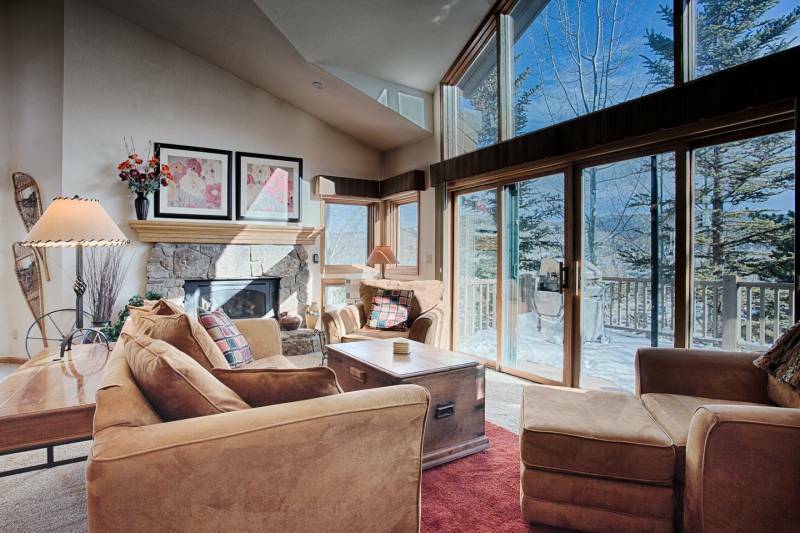 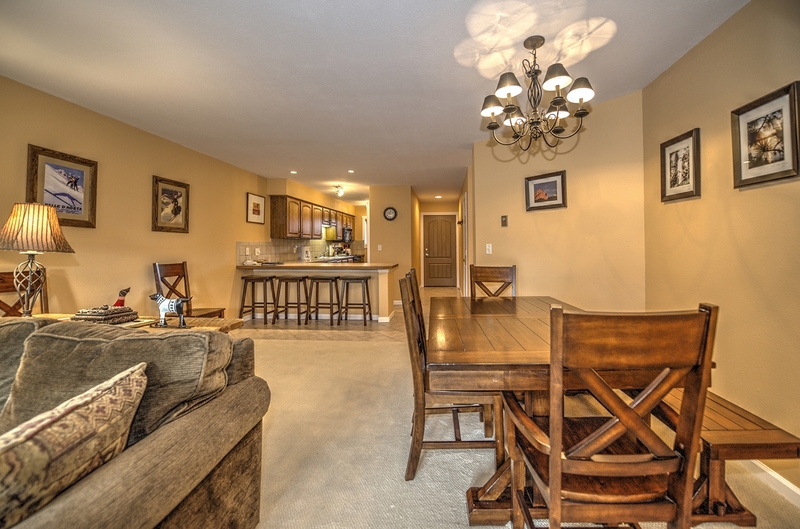 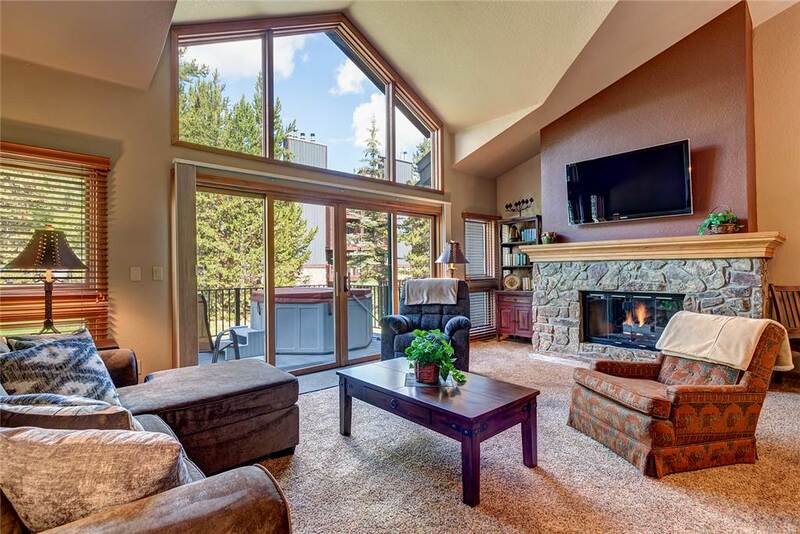 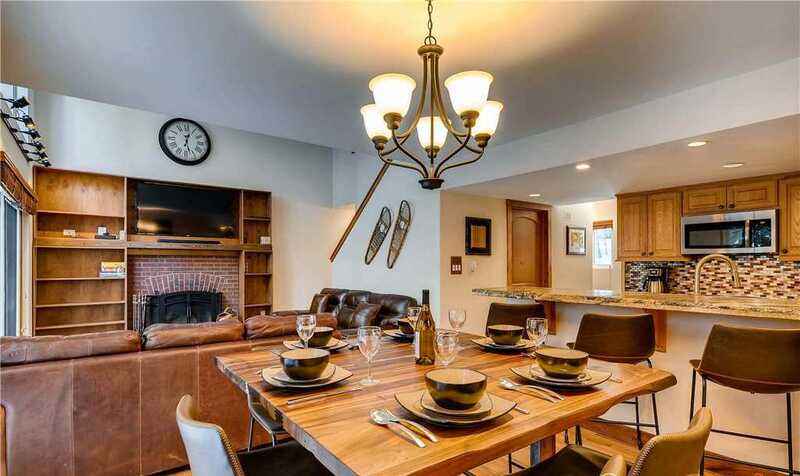 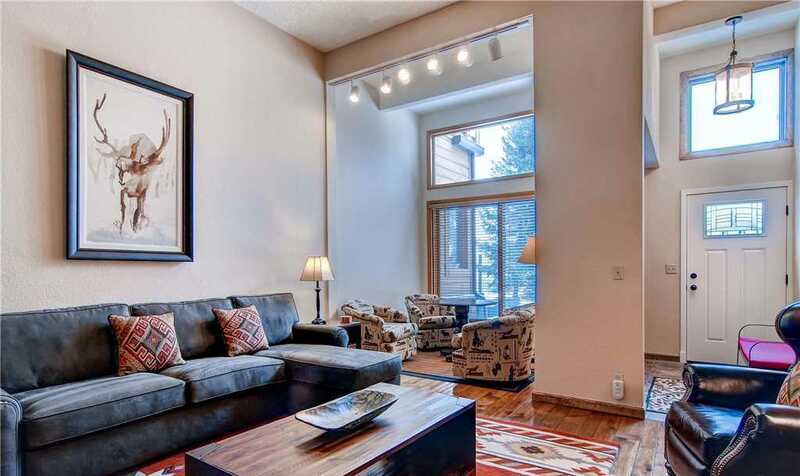 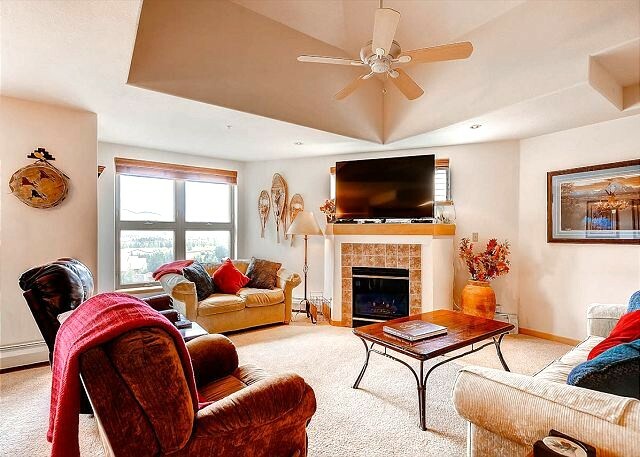 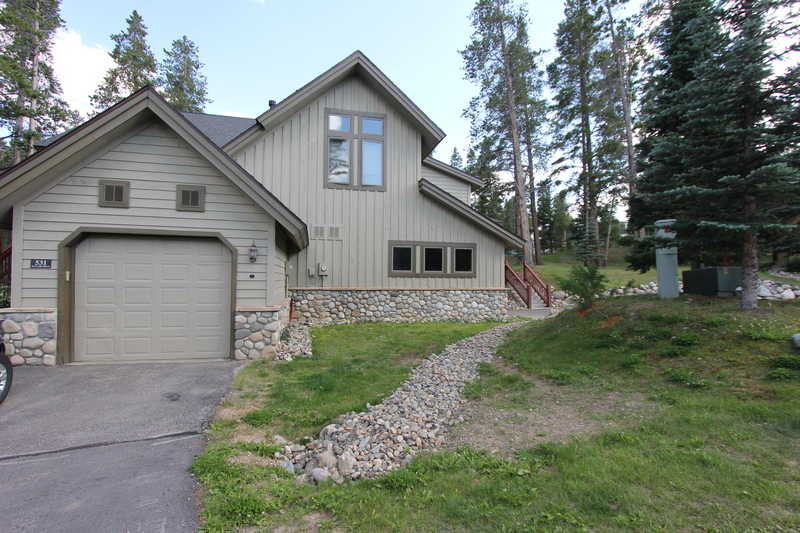 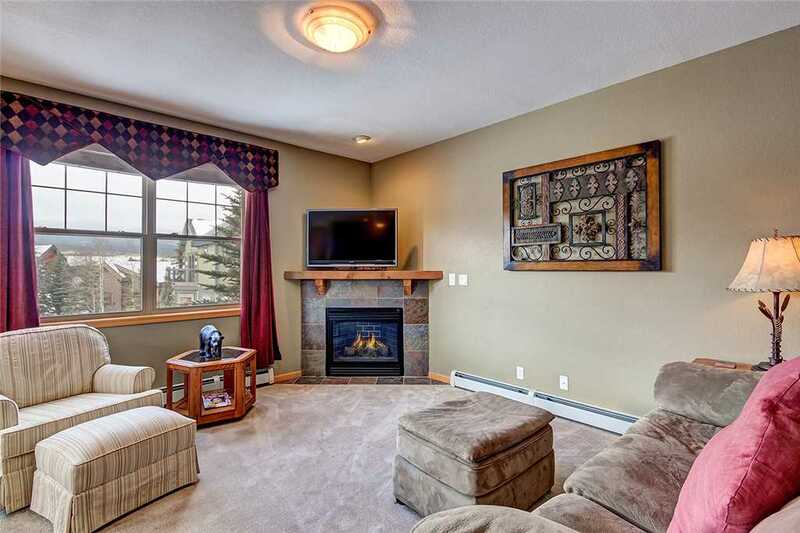 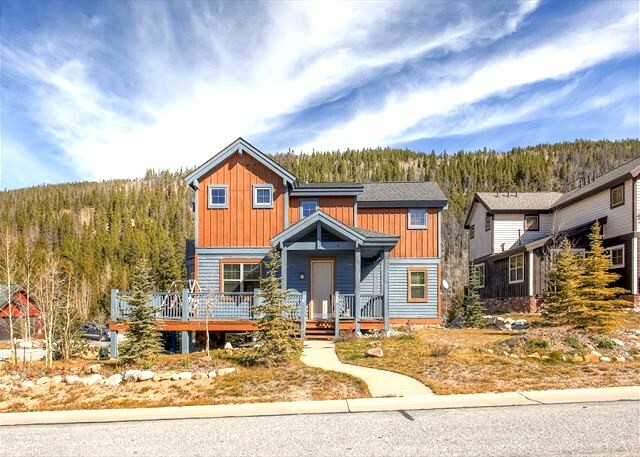 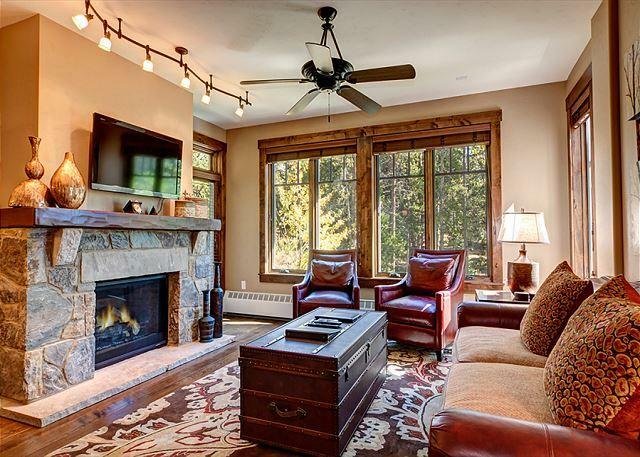 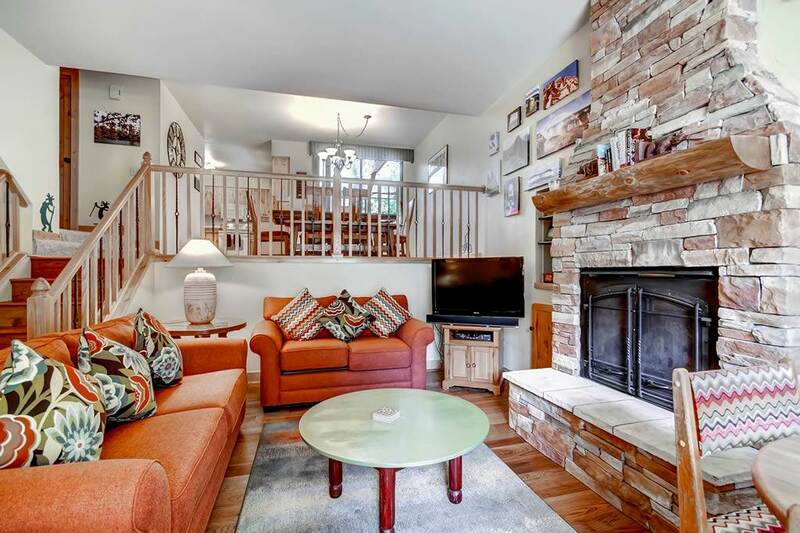 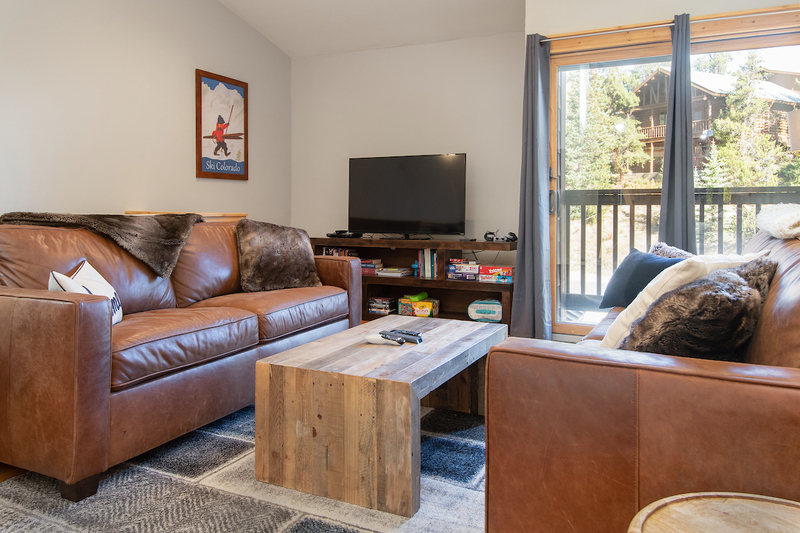 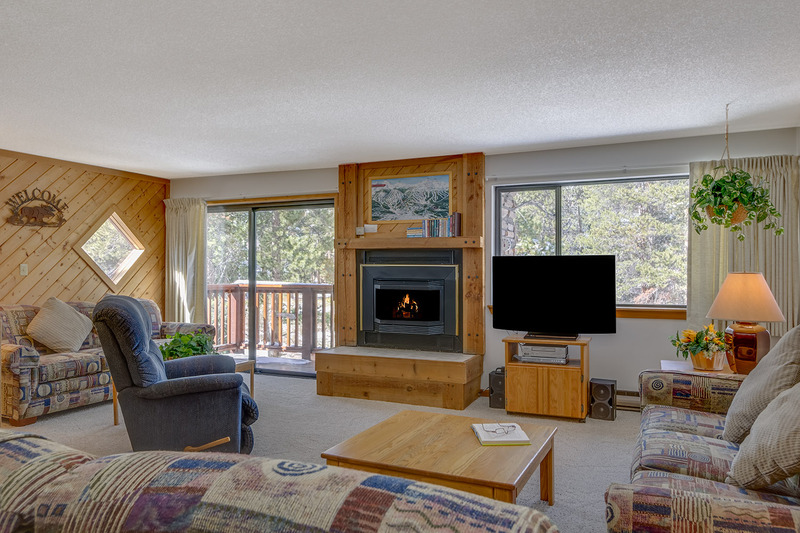 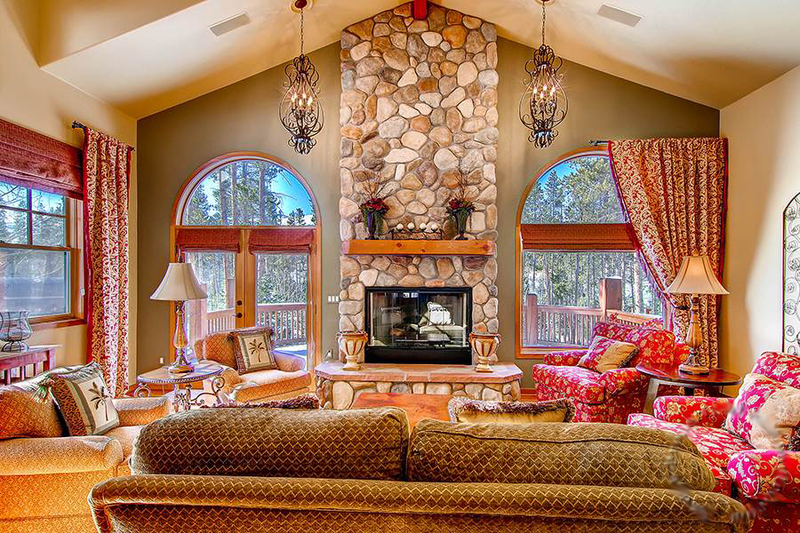 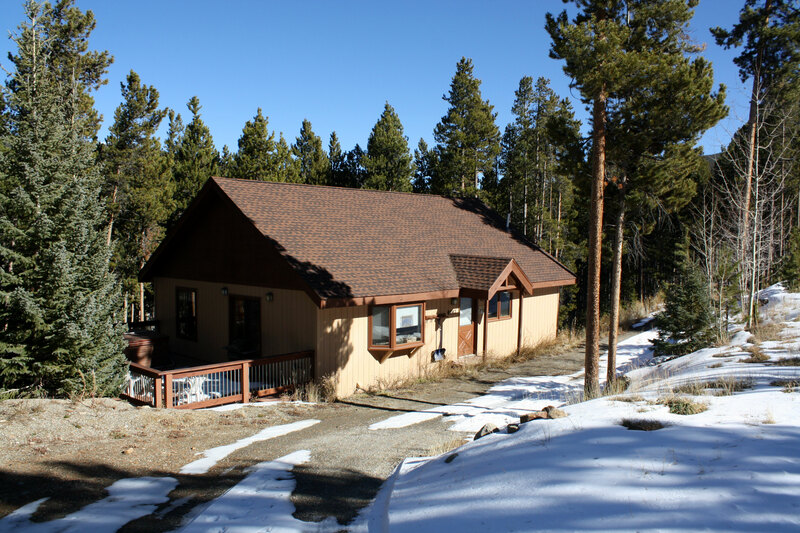 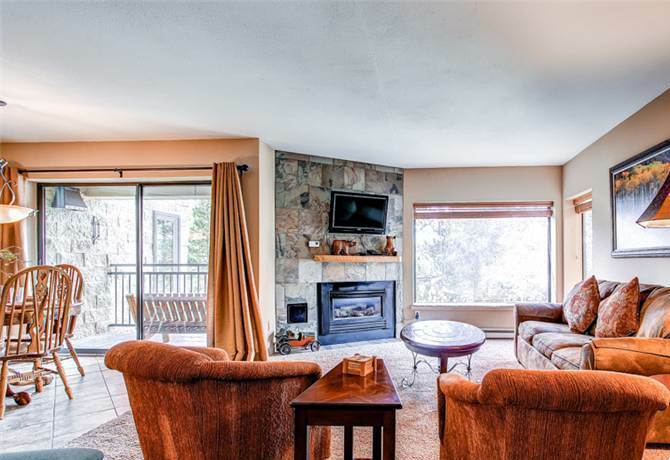 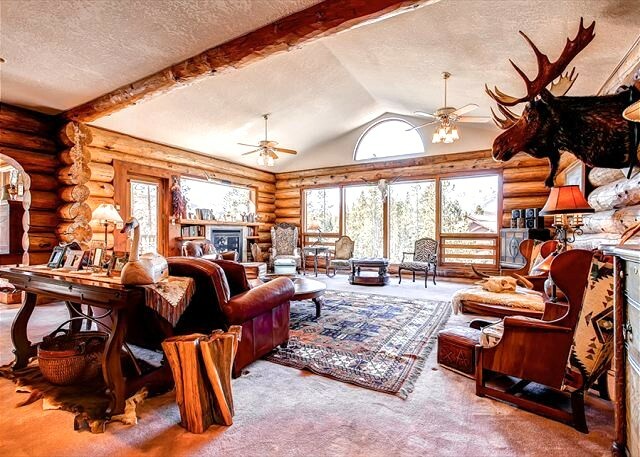 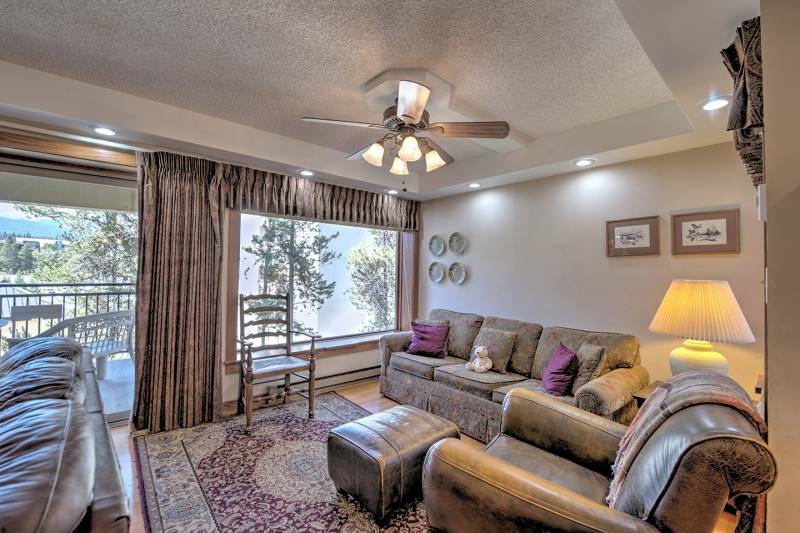 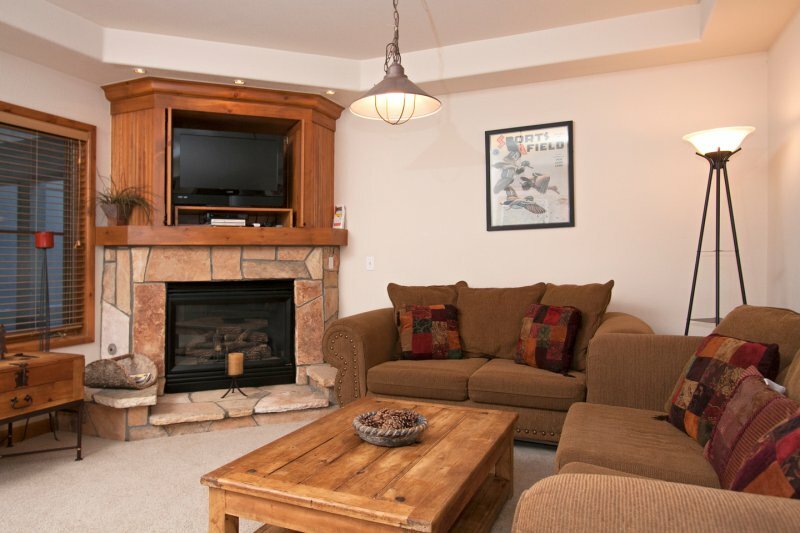 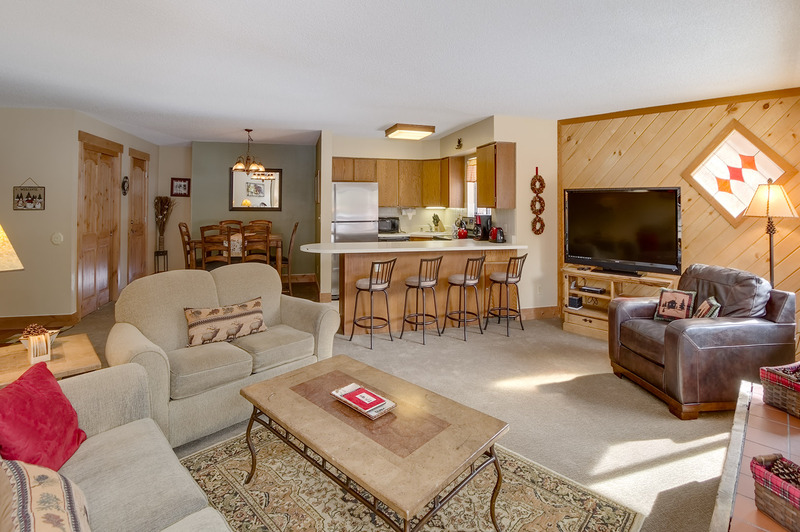 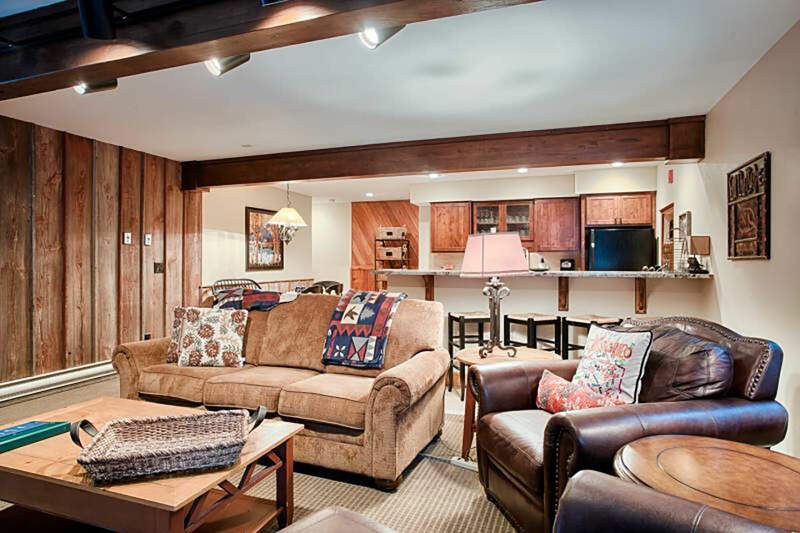 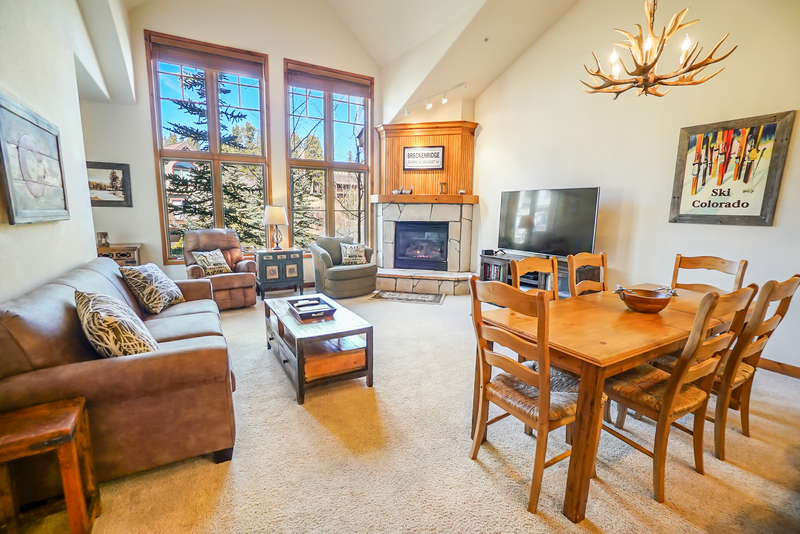 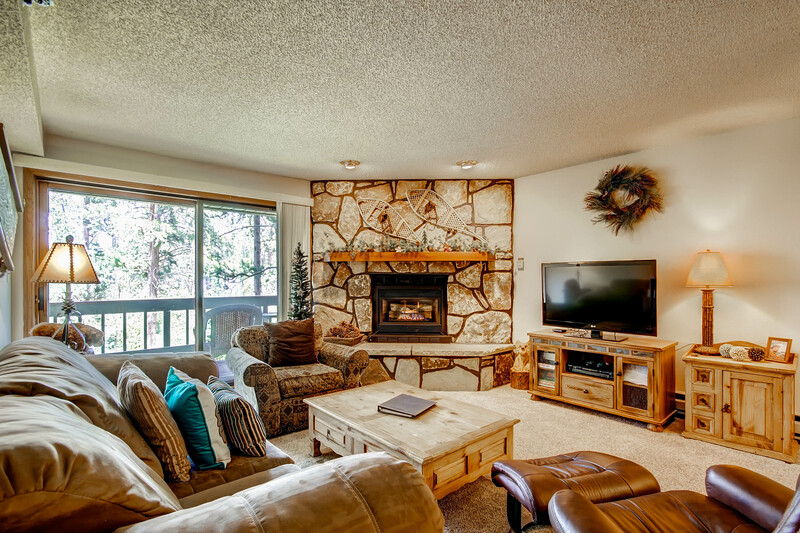 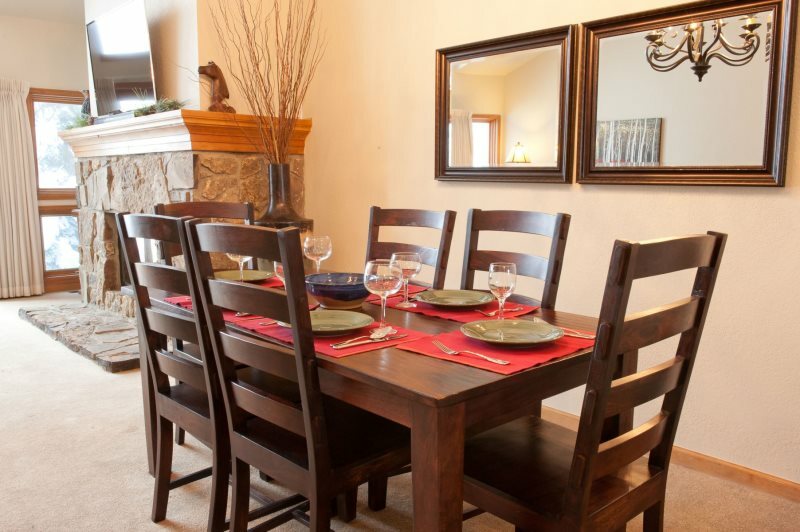 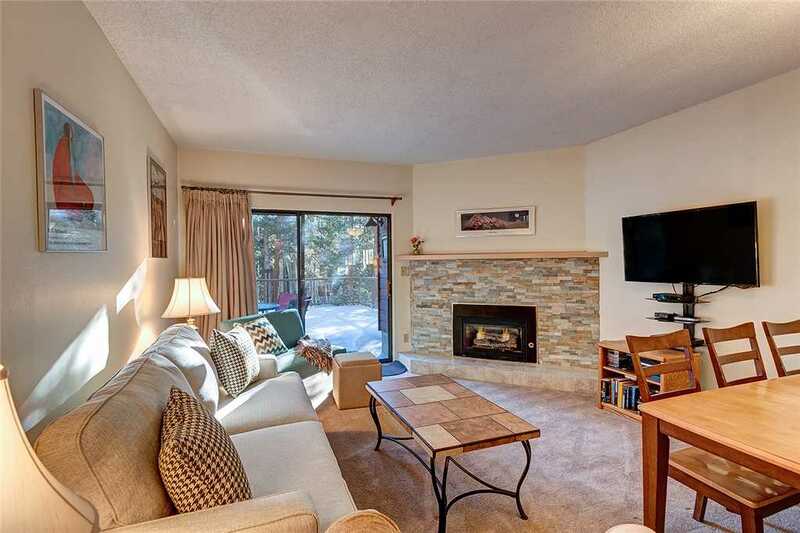 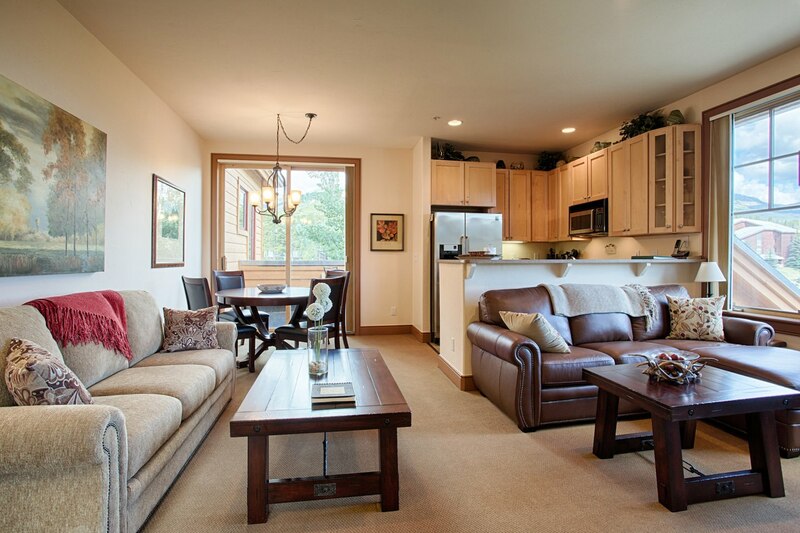 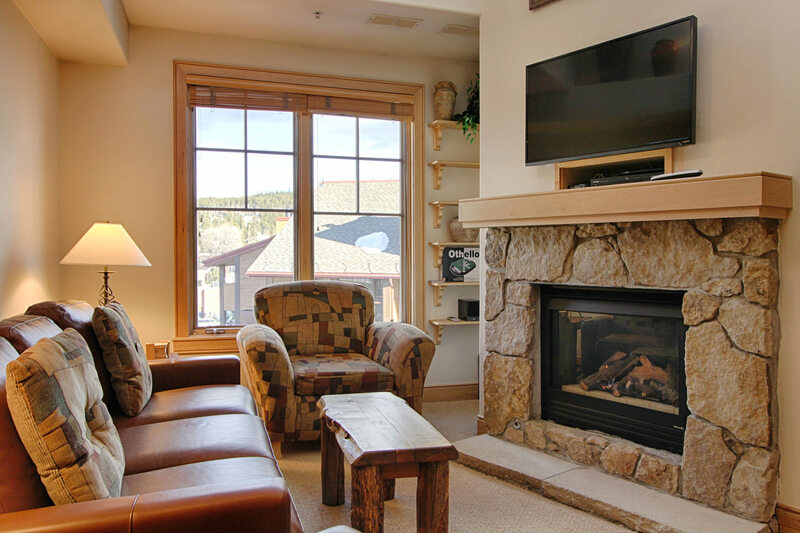 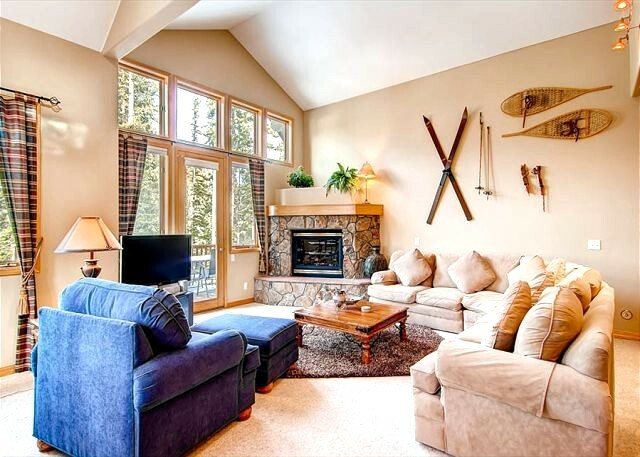 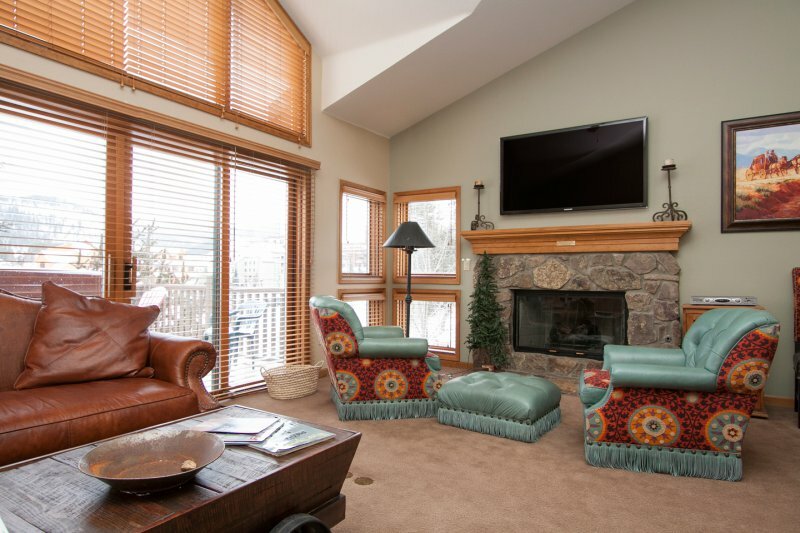 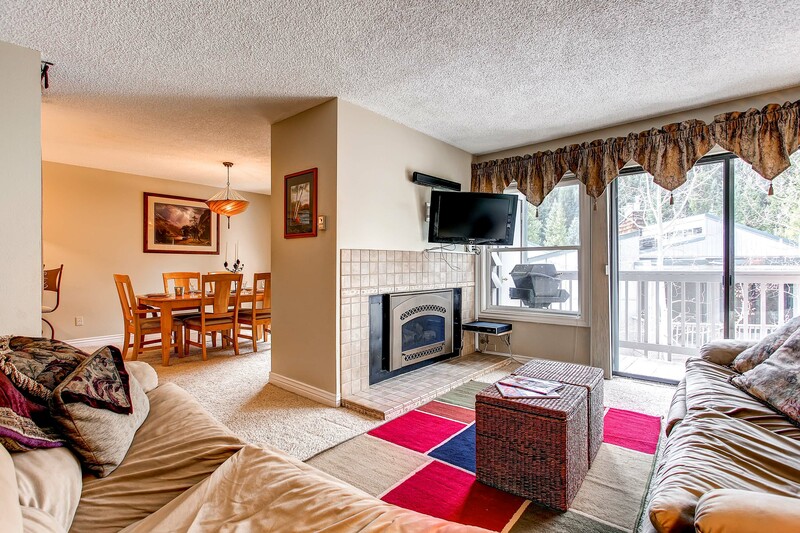 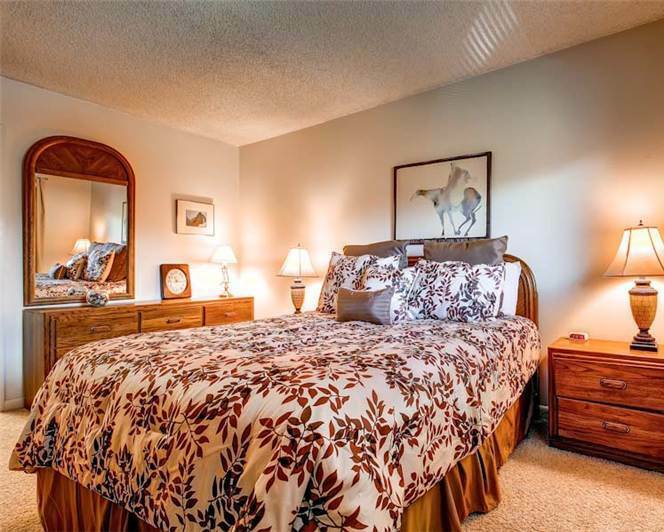 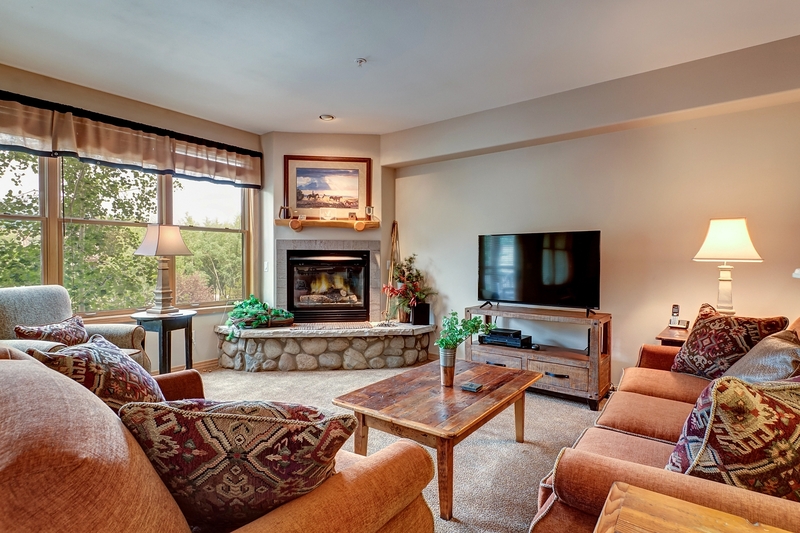 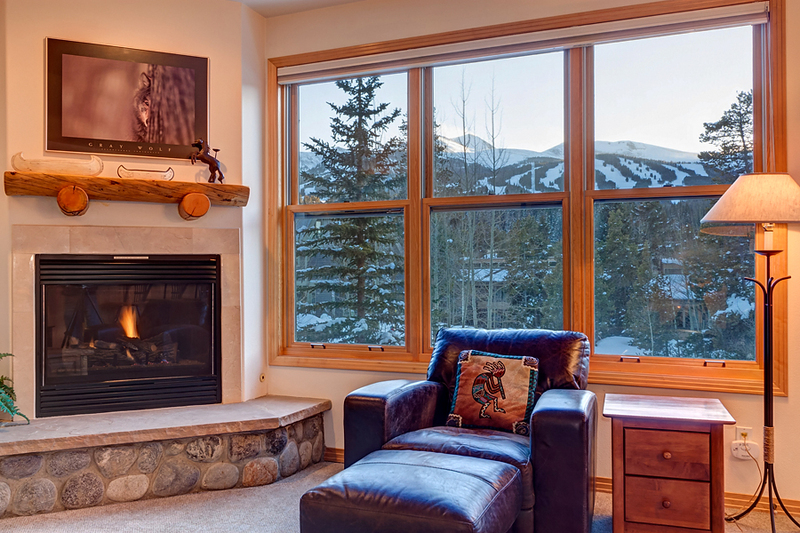 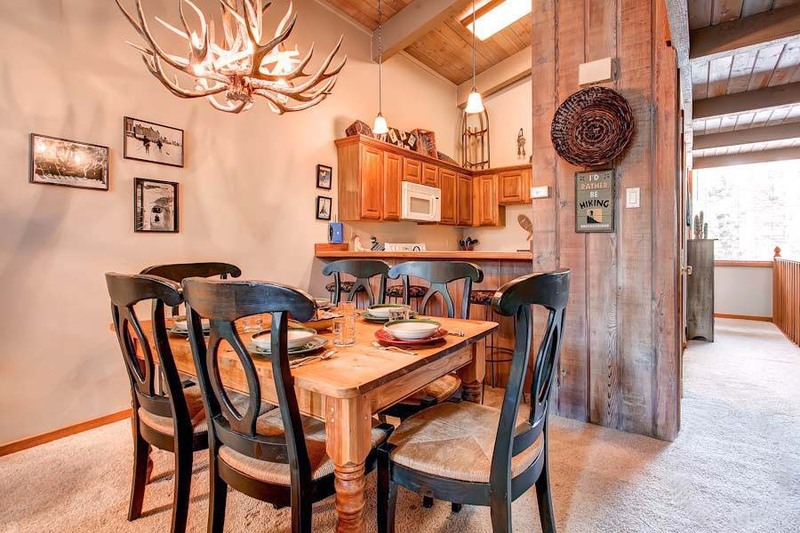 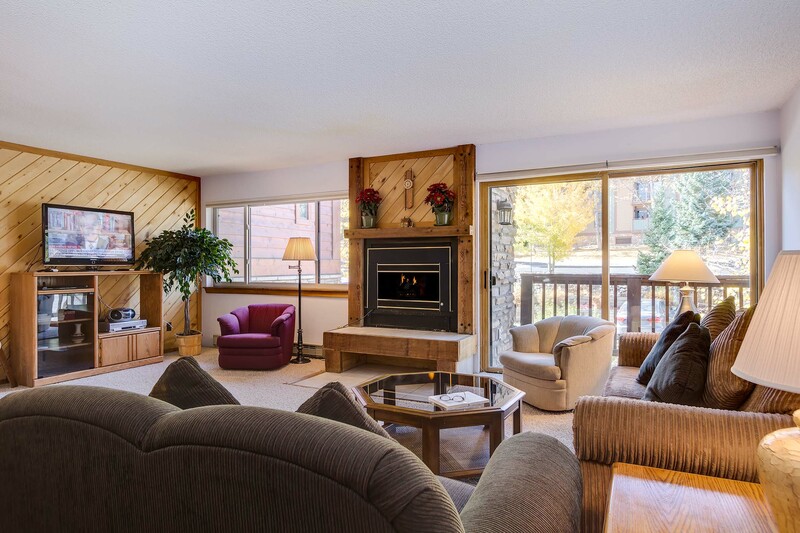 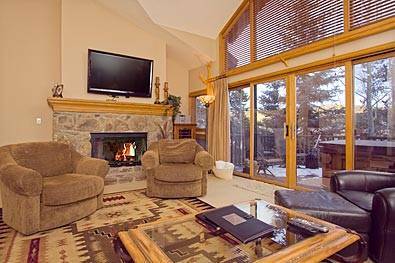 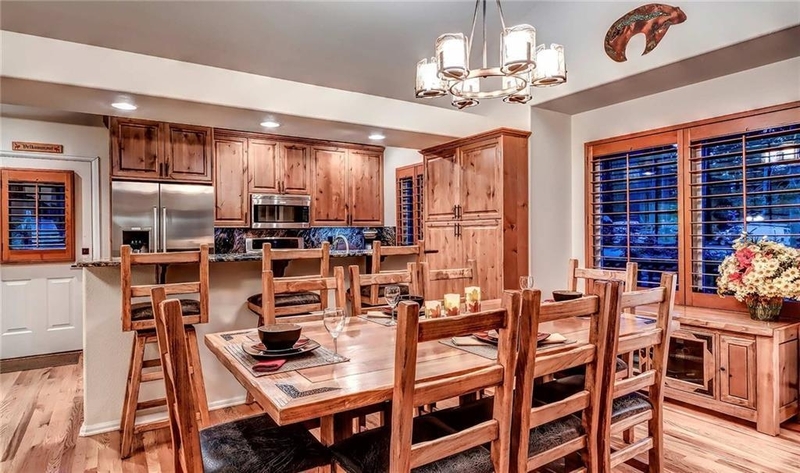 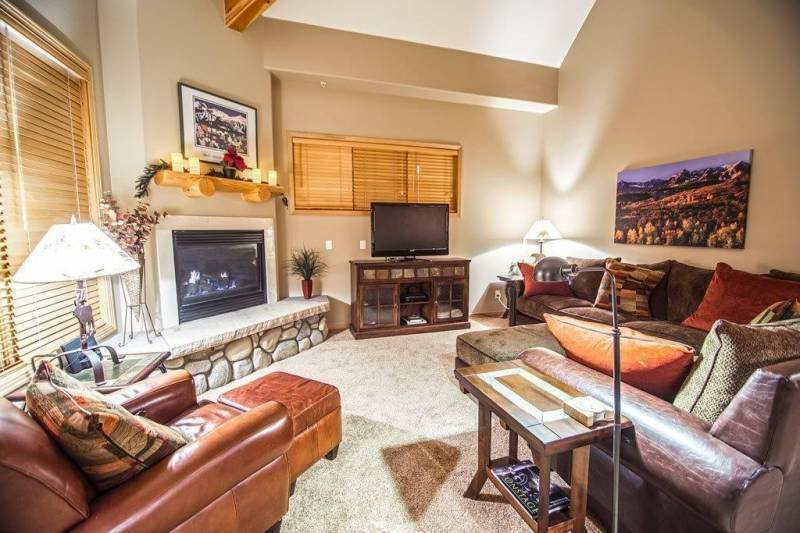 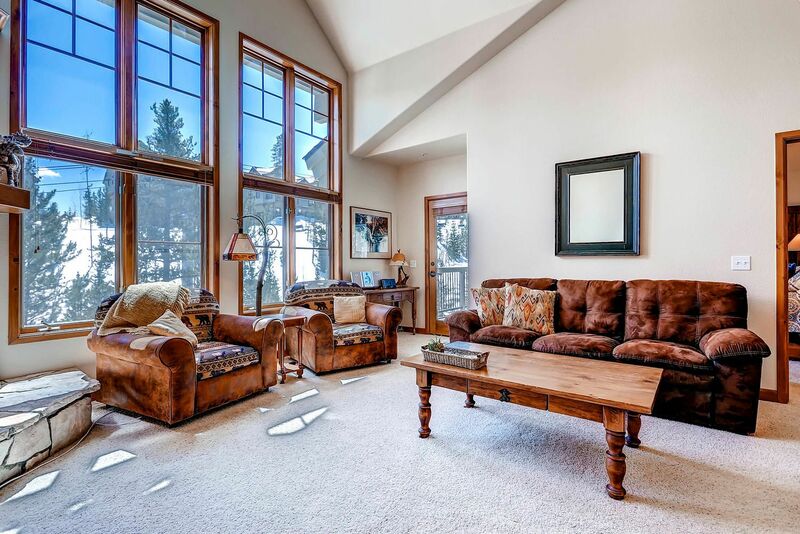 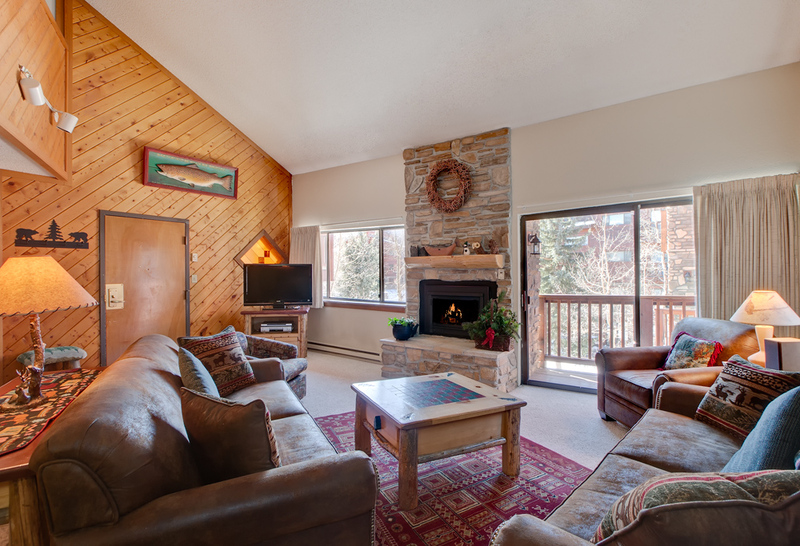 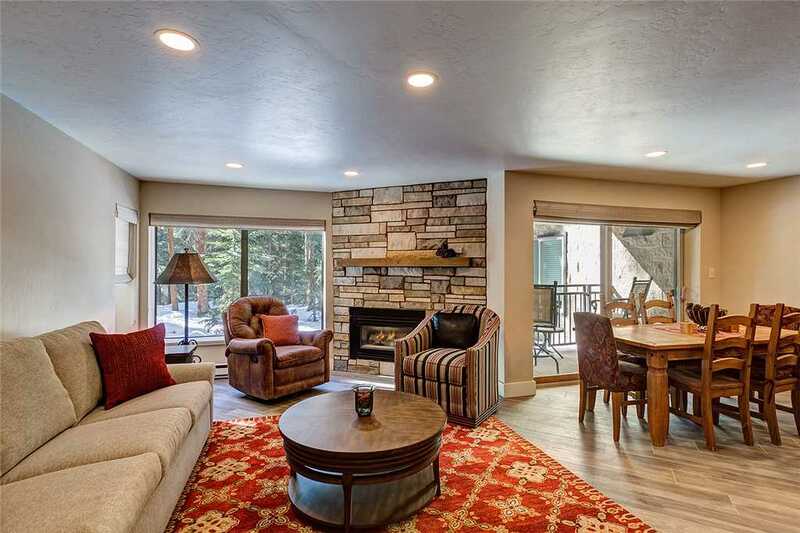 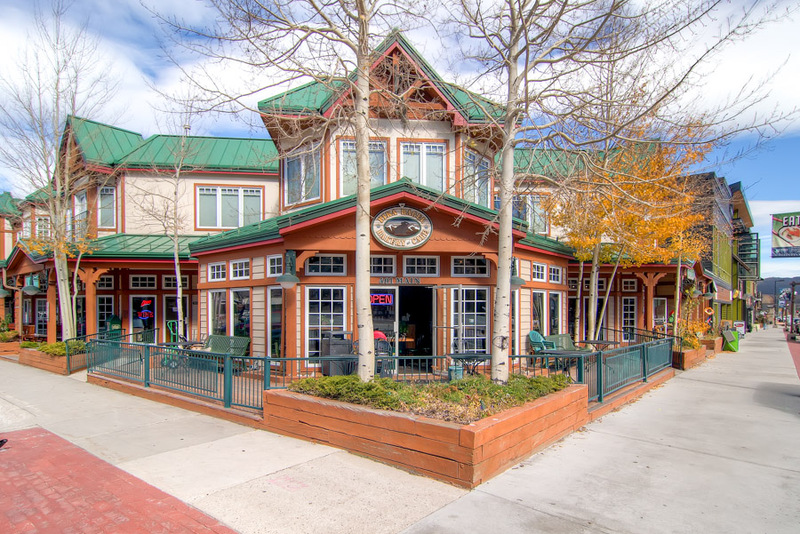 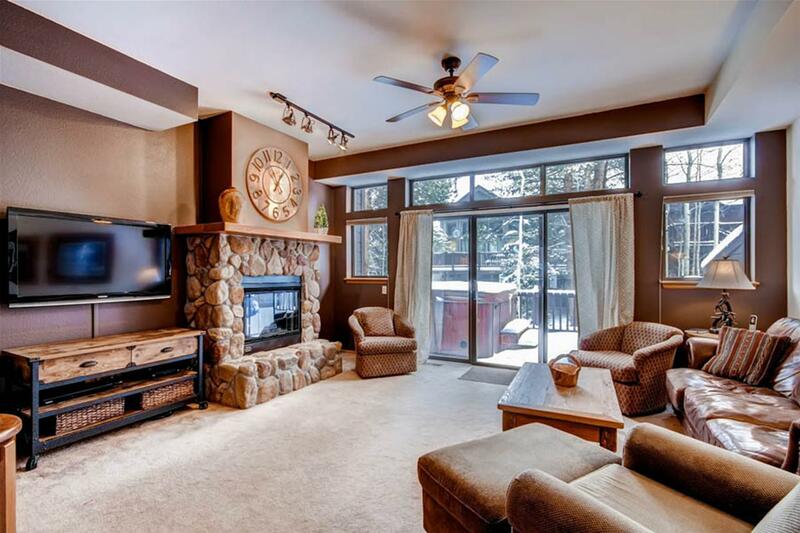 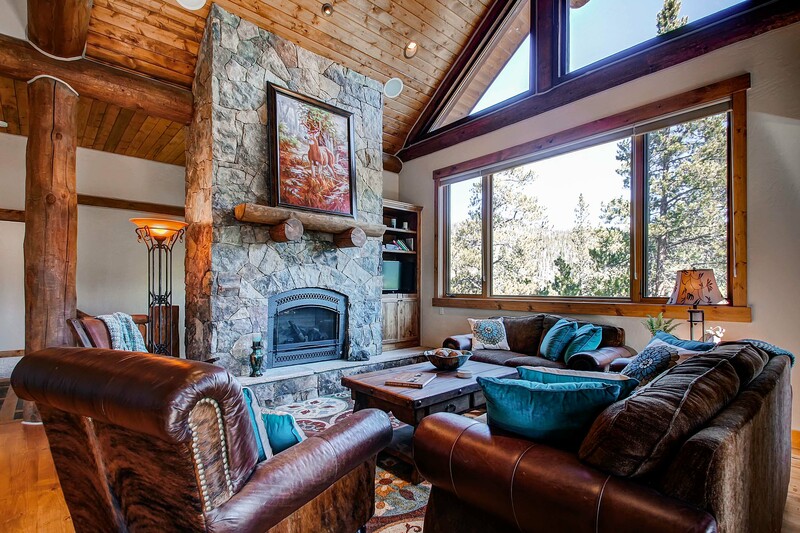 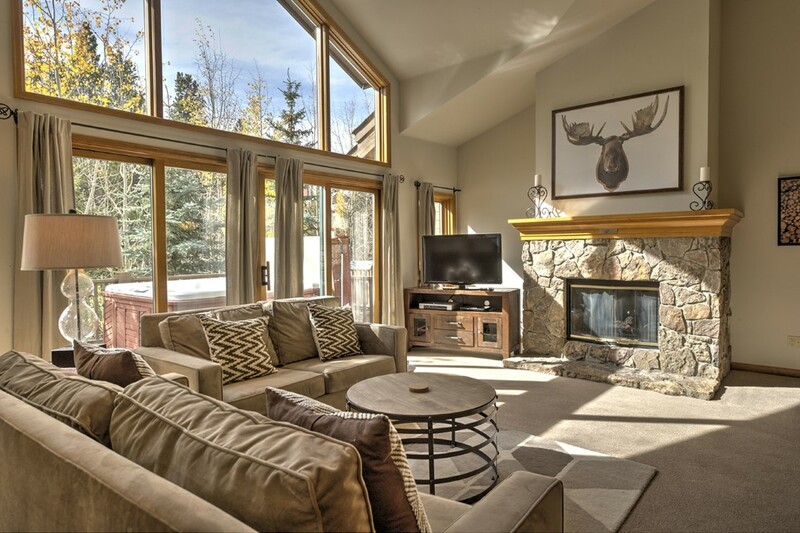 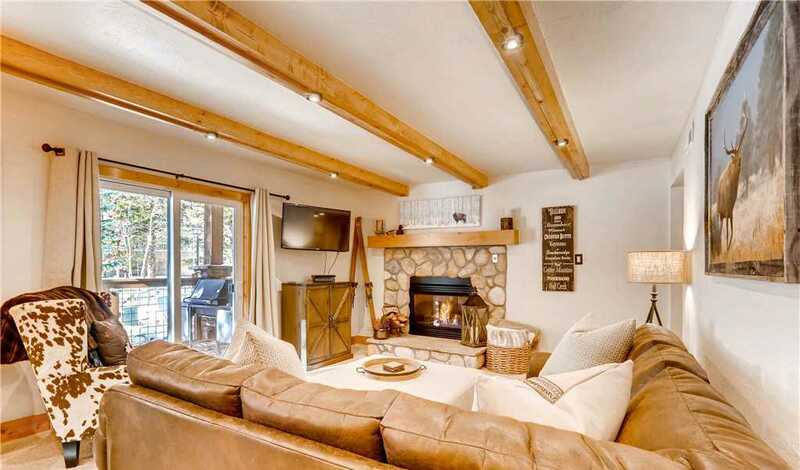 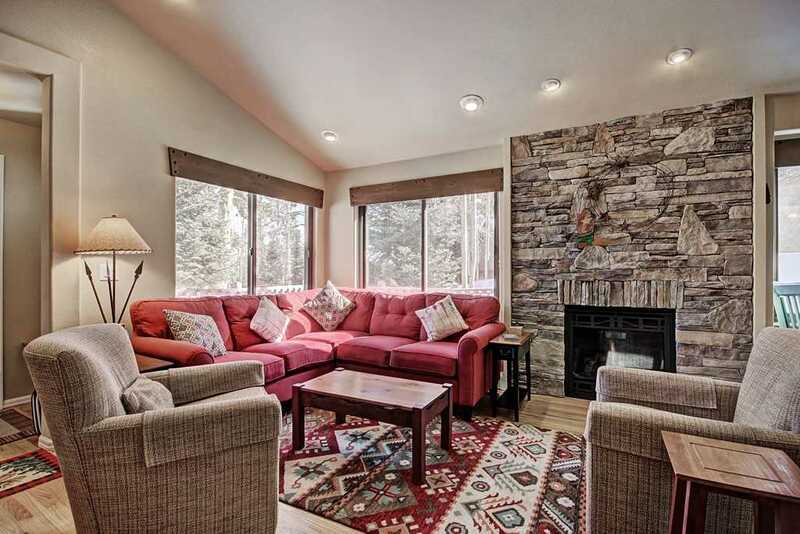 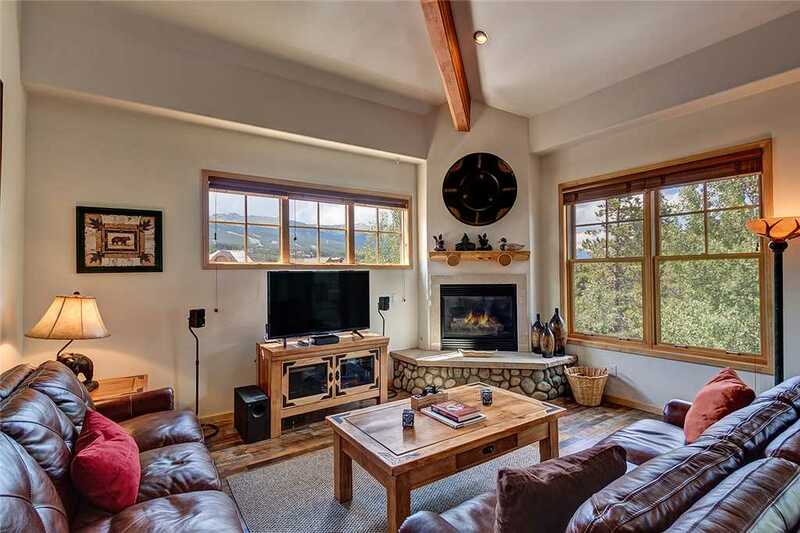 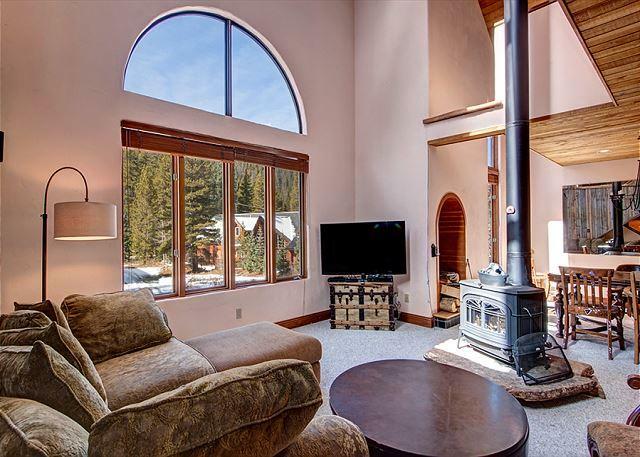 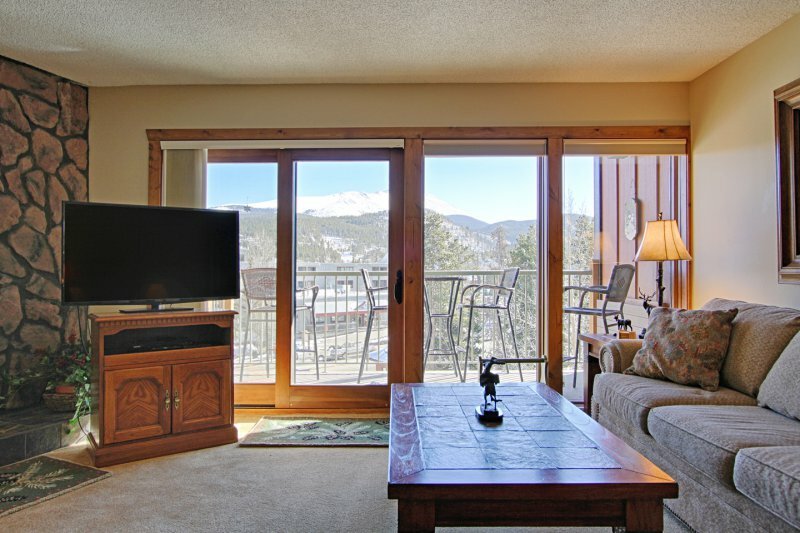 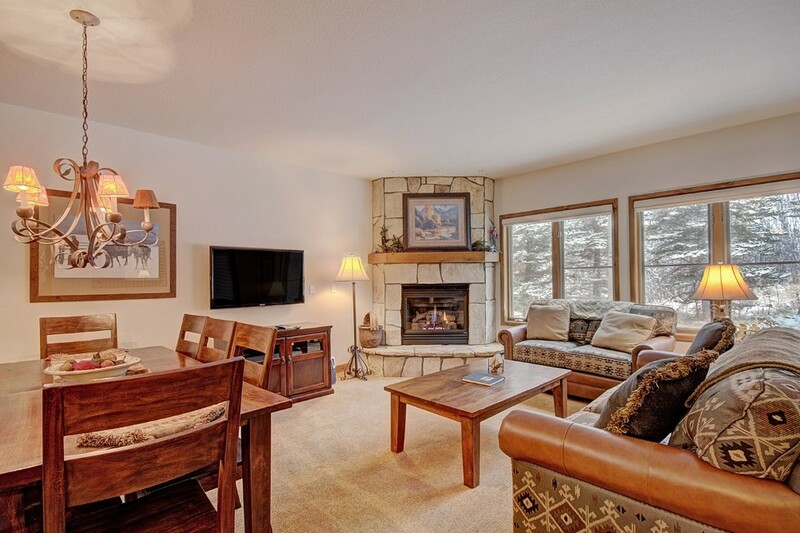 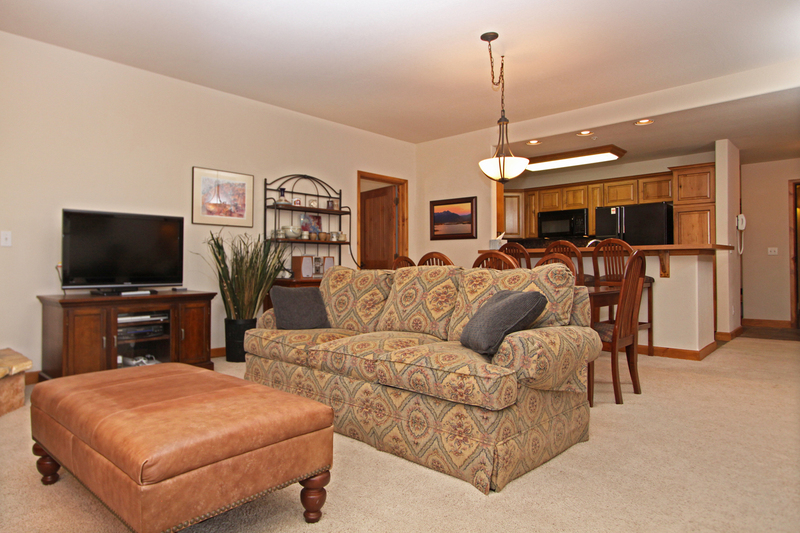 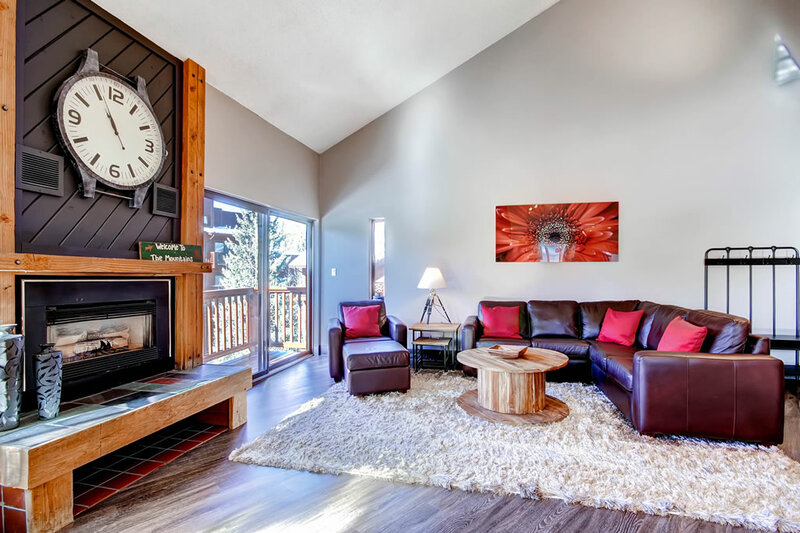 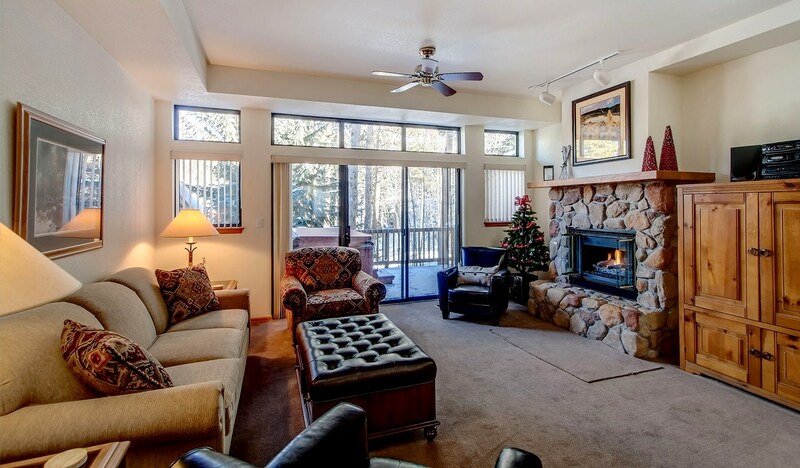 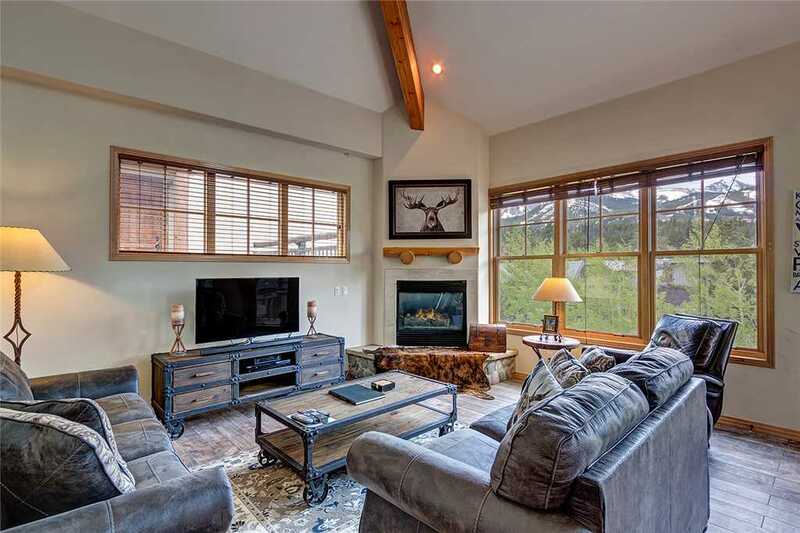 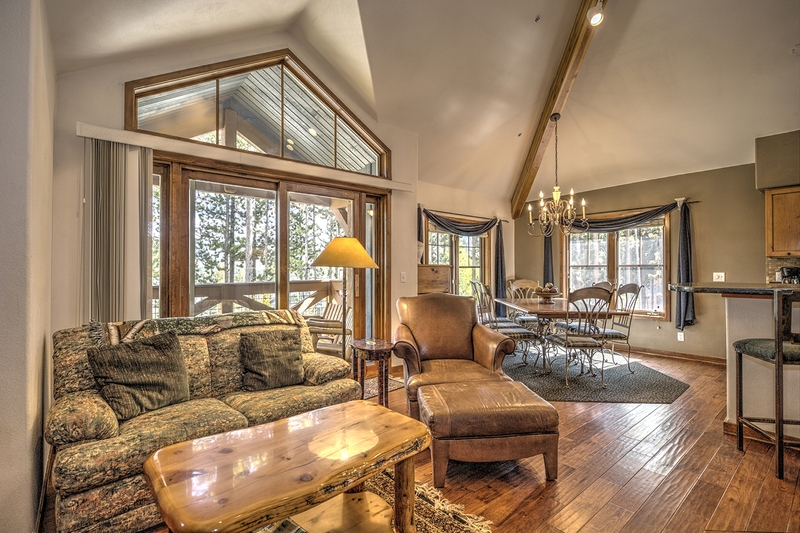 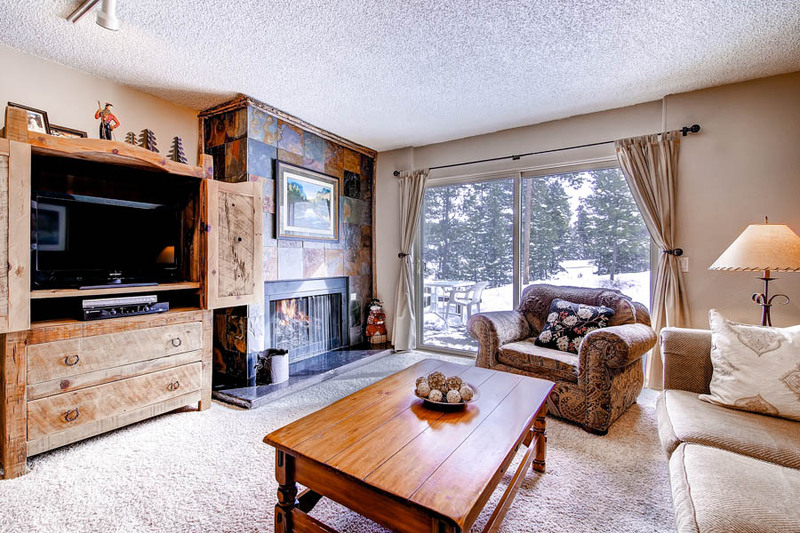 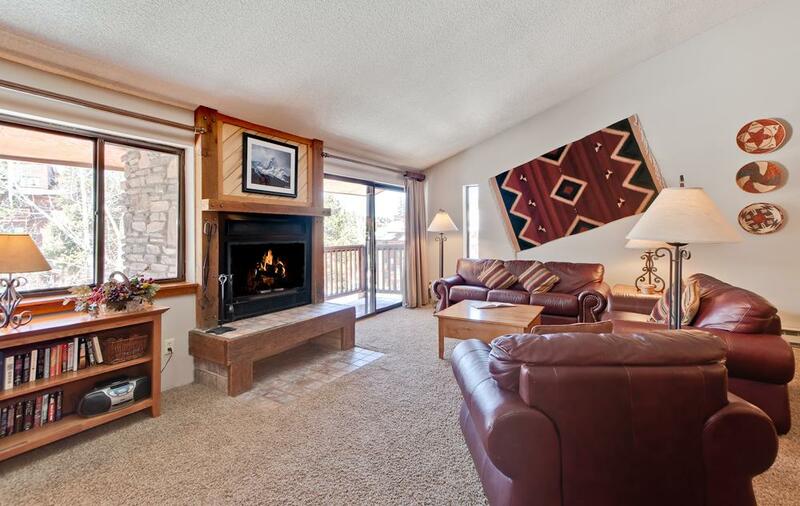 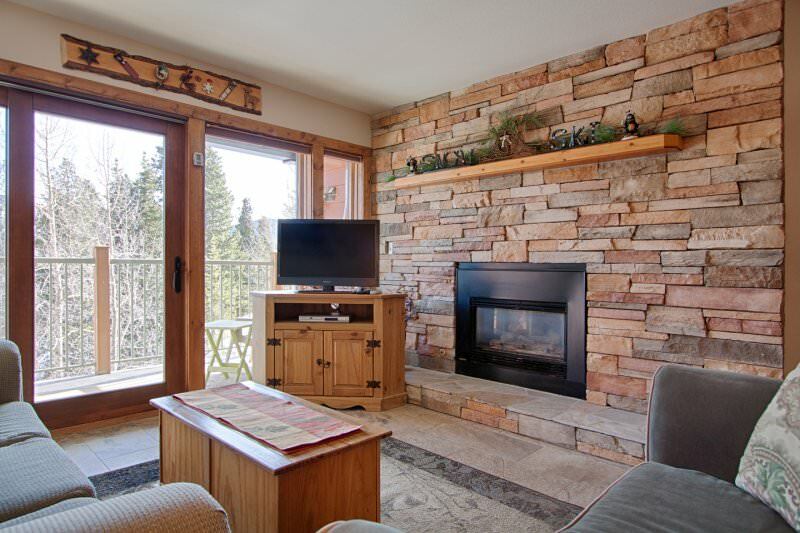 The Trails End condominiums offer more than just a supreme location, steps from the peak 9 base, and within walking distance to town, steps to dining, shopping and all that Breckenridge has to offer. 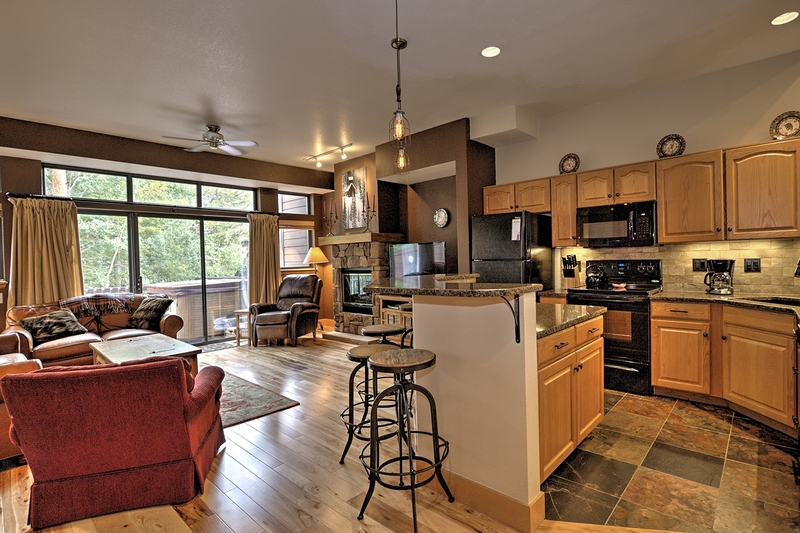 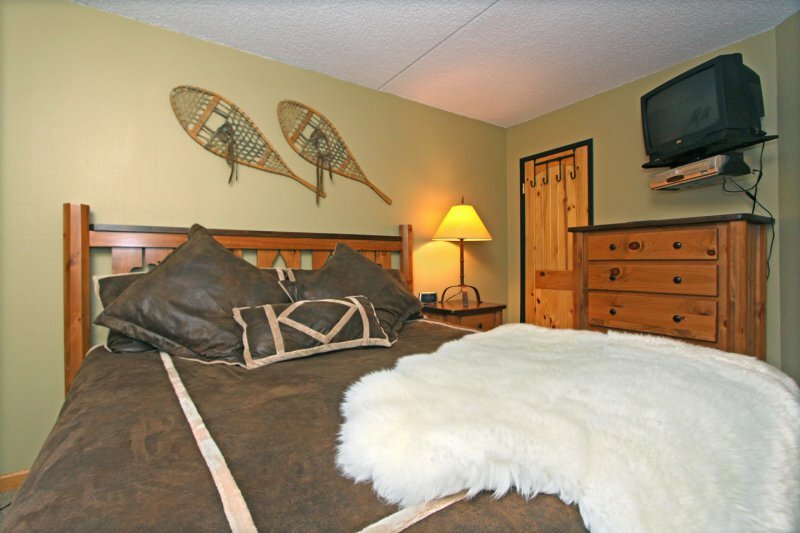 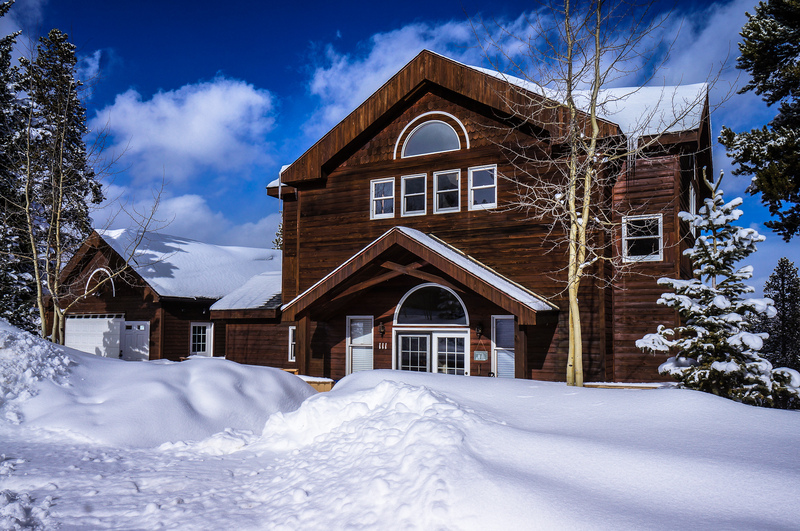 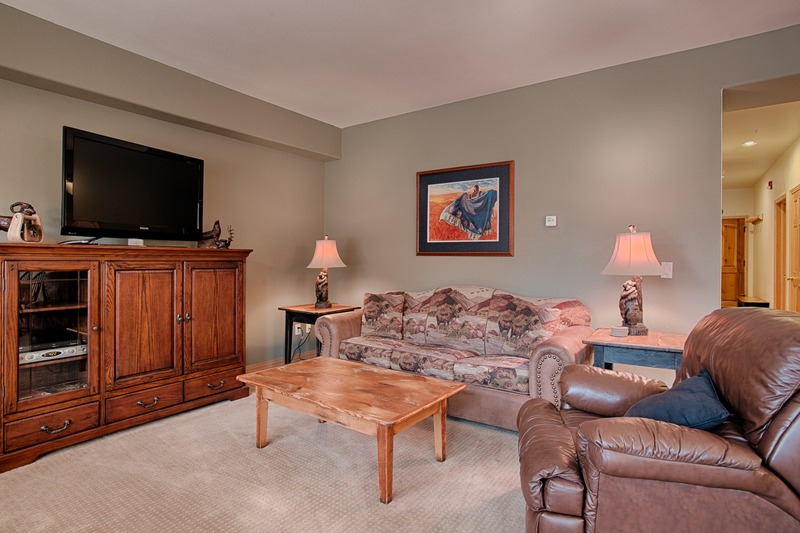 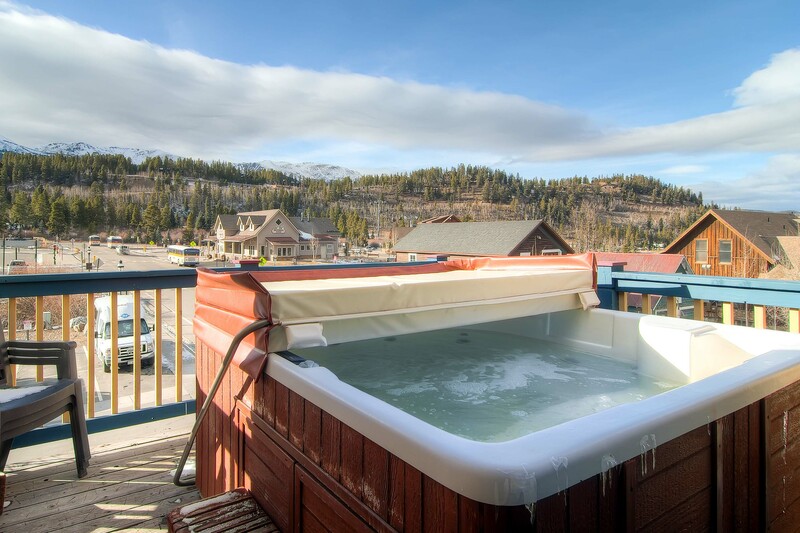 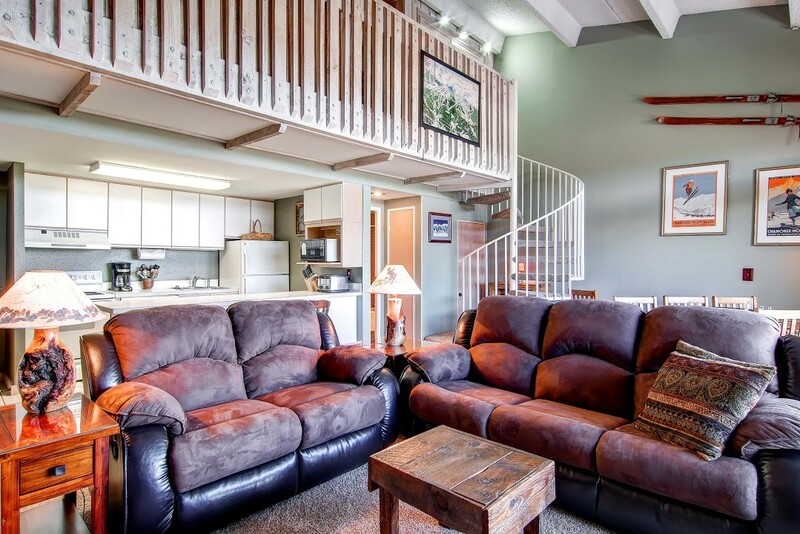 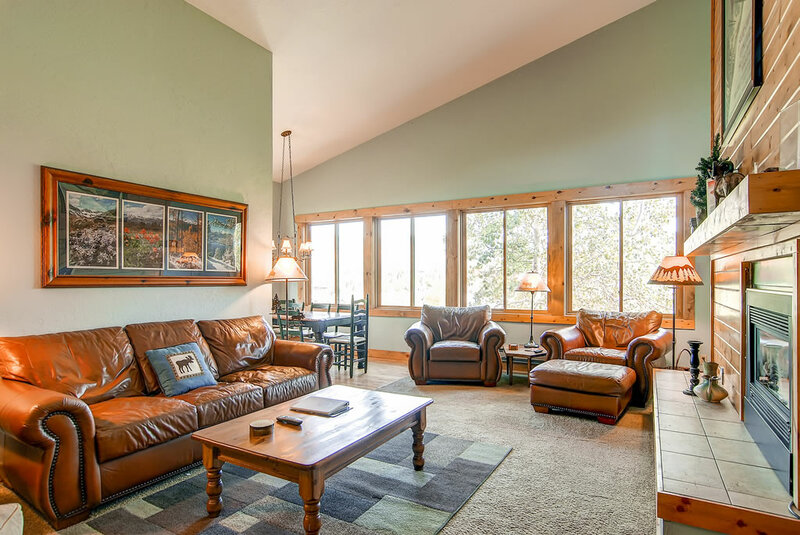 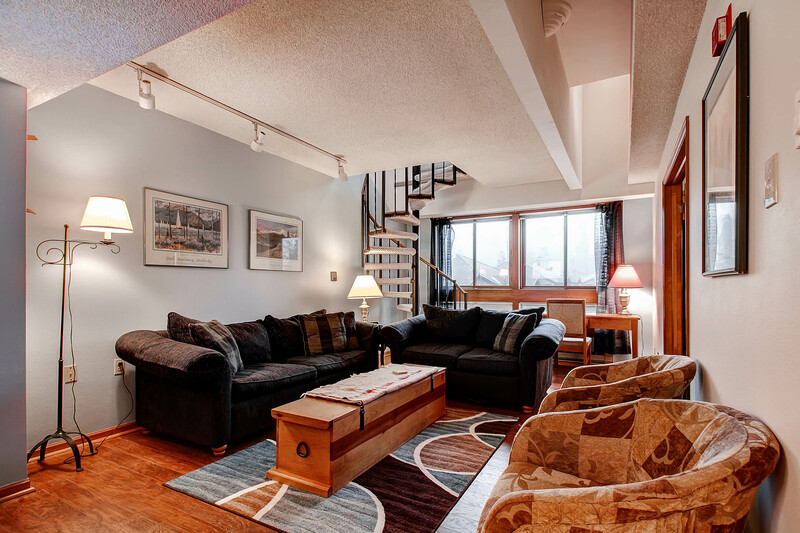 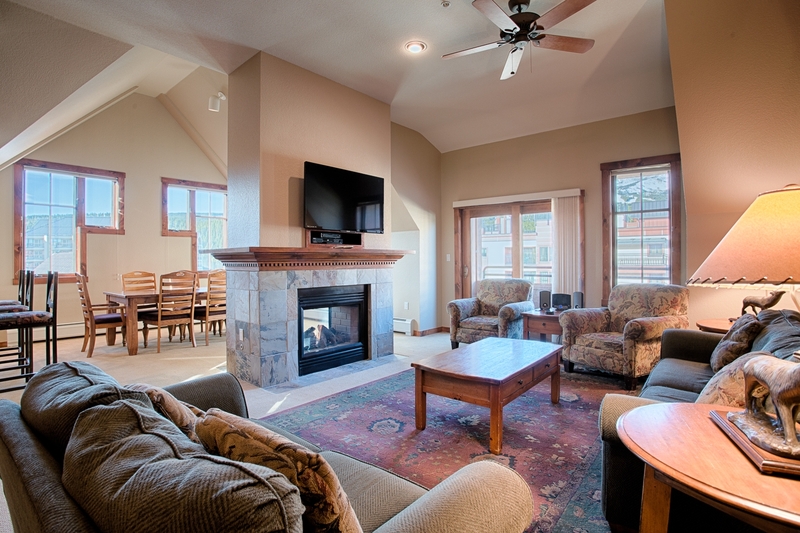 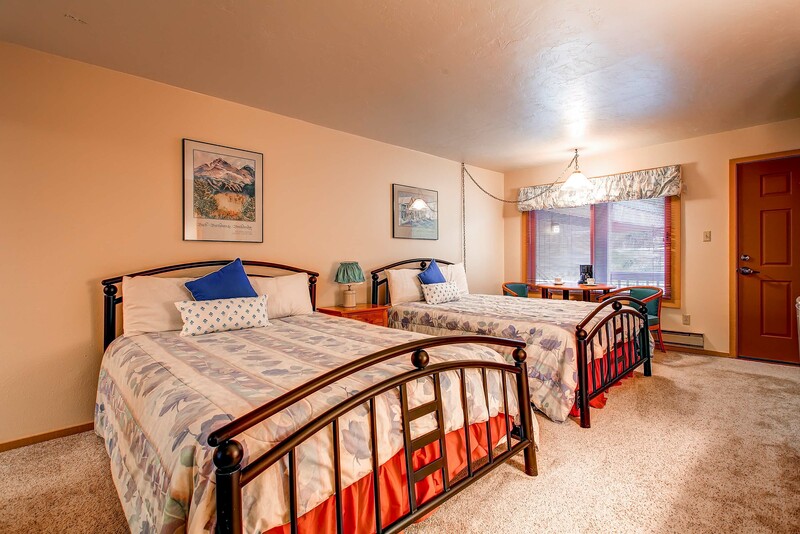 There are other amenities offered by the trails end complex building such as free Wi-Fi, indoor and outdoor hot tubs, a sauna, elevator access to all six floors, on-site laundry facilities and ground floor ski storage. 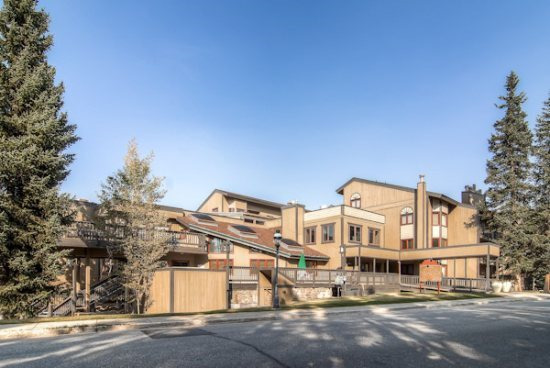 Guests can also enjoy seasonal access to the nearby upper village pool complex with an indoor and outdoor heated pool, changing rooms, indoor and outdoor hot tubs and a relaxing sun tanning area.